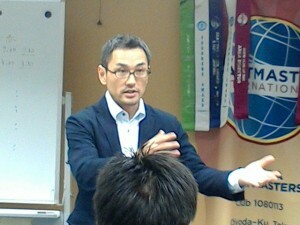 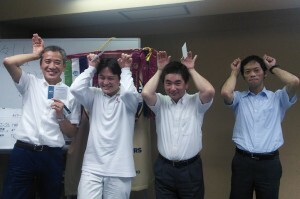 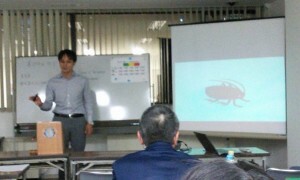 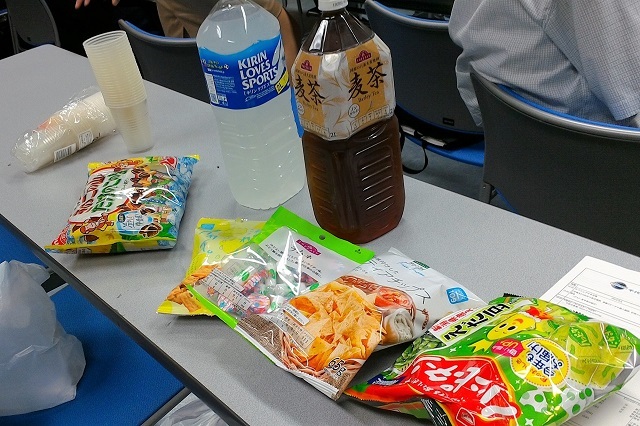 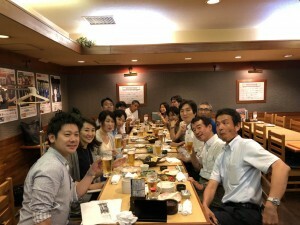 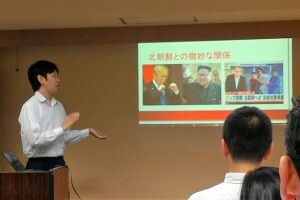 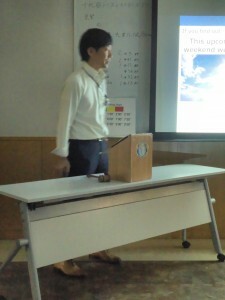 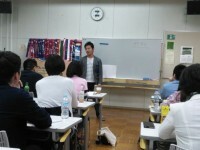 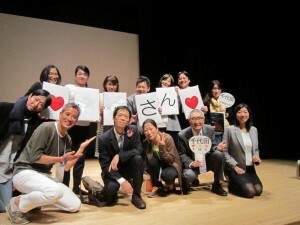 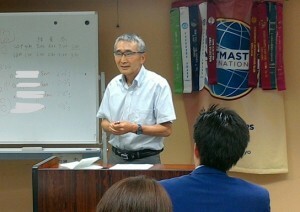 On June 21, “marvelous” meeting was hold. First speaker spoke memories of mountain climbing in South Korea. 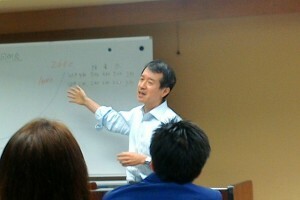 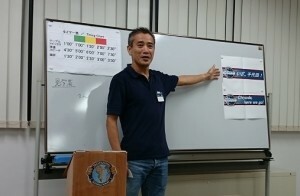 Thorough the experience, he learned leadership and made friendship of Korean hiker. Second speaker told effects of microplastic to our bodies and wild animals. Which do you choose, convenience of Safety? Third speaker told his way from starting TMC. 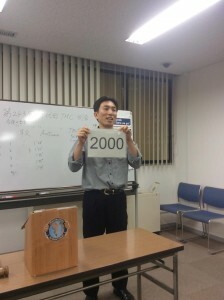 He won a competition and became a father of a daughter during that period. 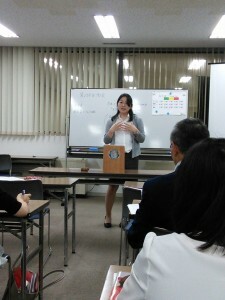 Forth speaker spoke her experience. She had been chosen to represent of our club. 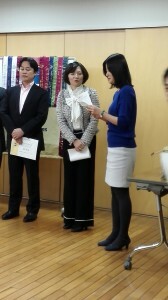 In older to her efforts and club member’s support, she got 2st place in area contest. 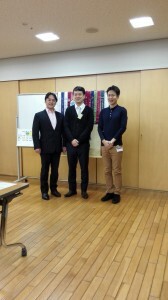 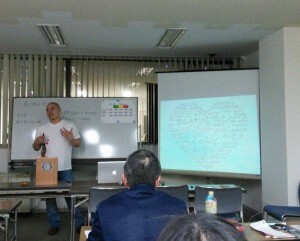 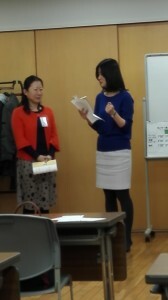 Evaluators commented speaker’s marvelous points and improvements. 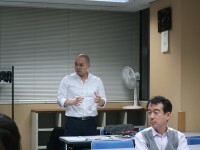 General evaluator told assessment of this meeting. Today’s best speaker and best evaluator. 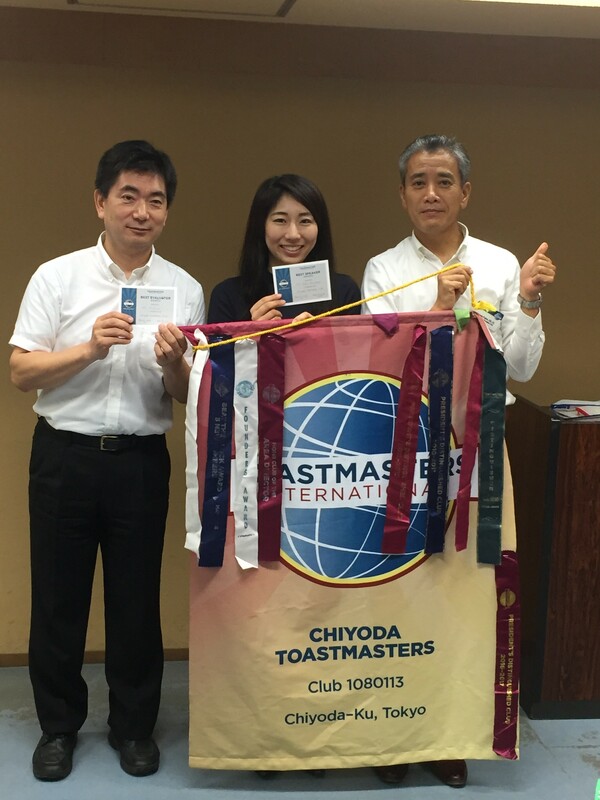 Two members achieved CC manual! 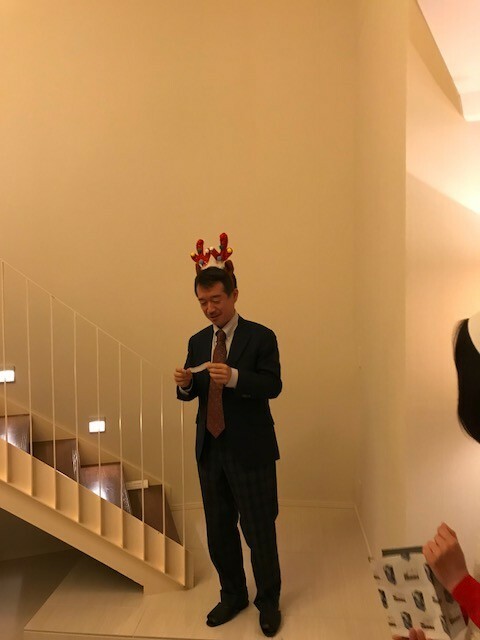 Our president, Thank you for Marvelous support for one year! 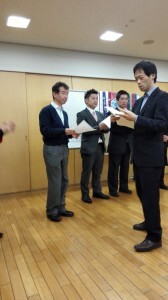 We are anticipating their future activities. 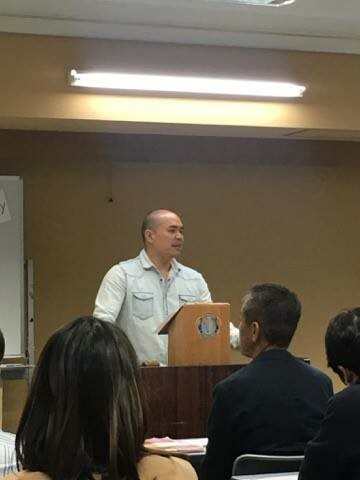 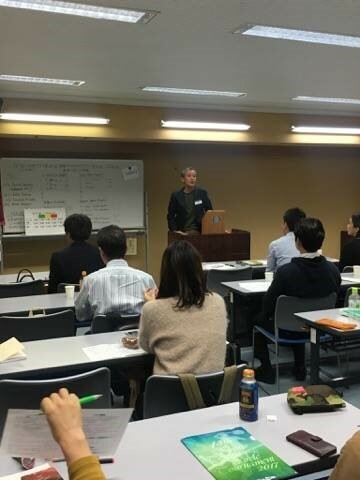 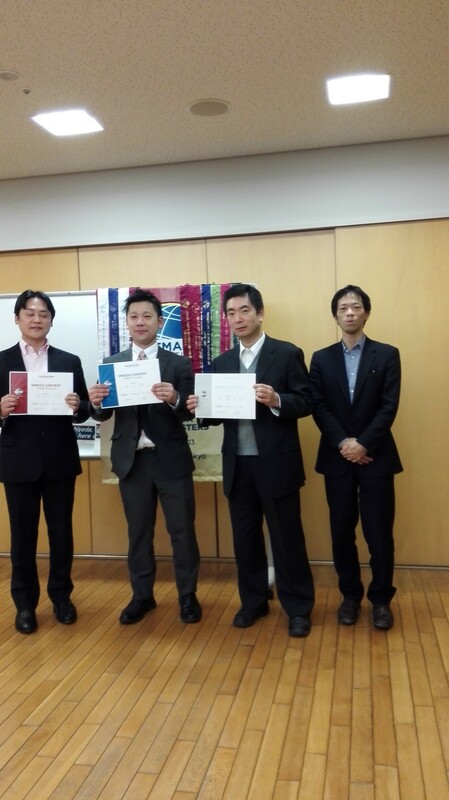 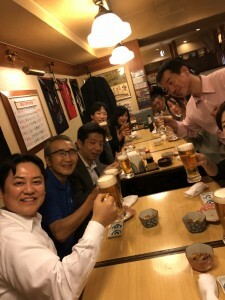 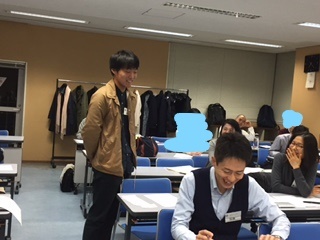 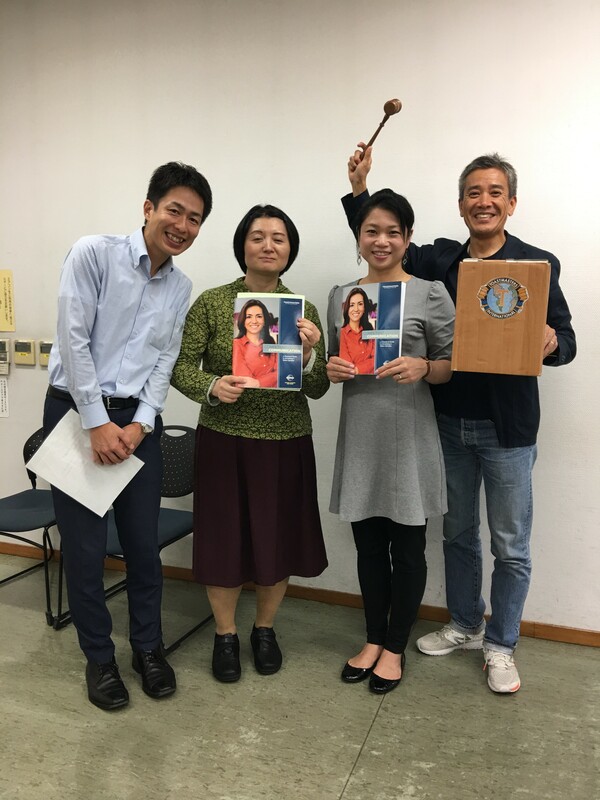 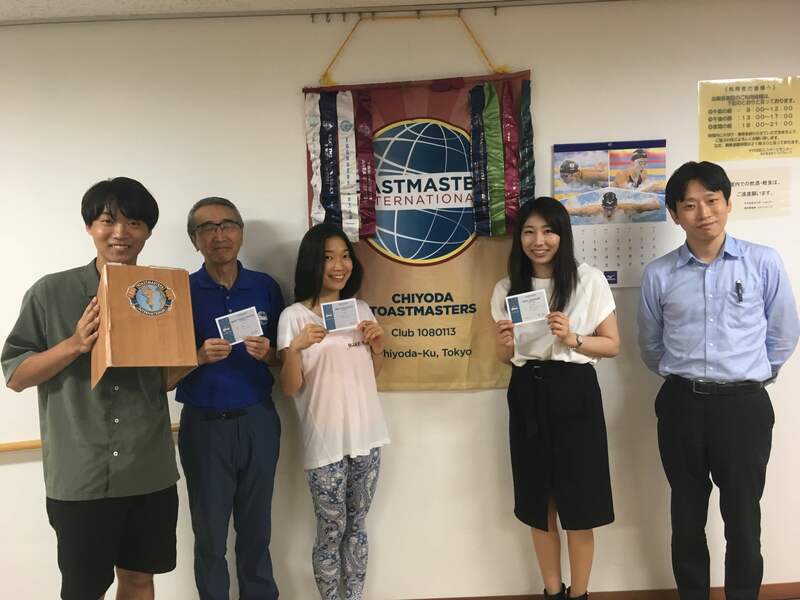 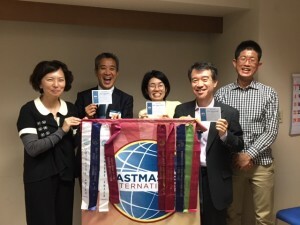 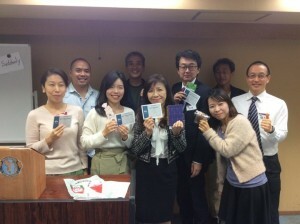 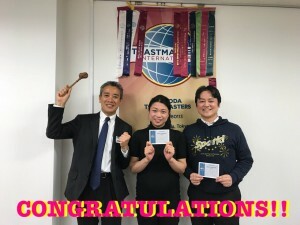 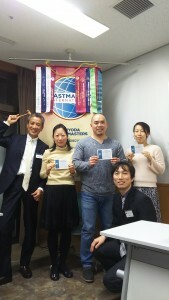 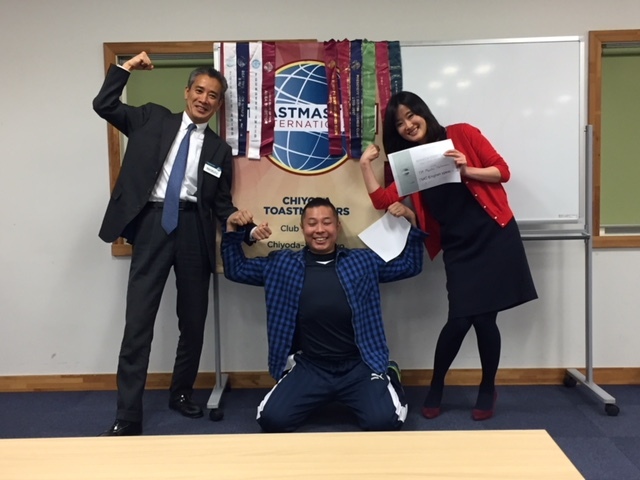 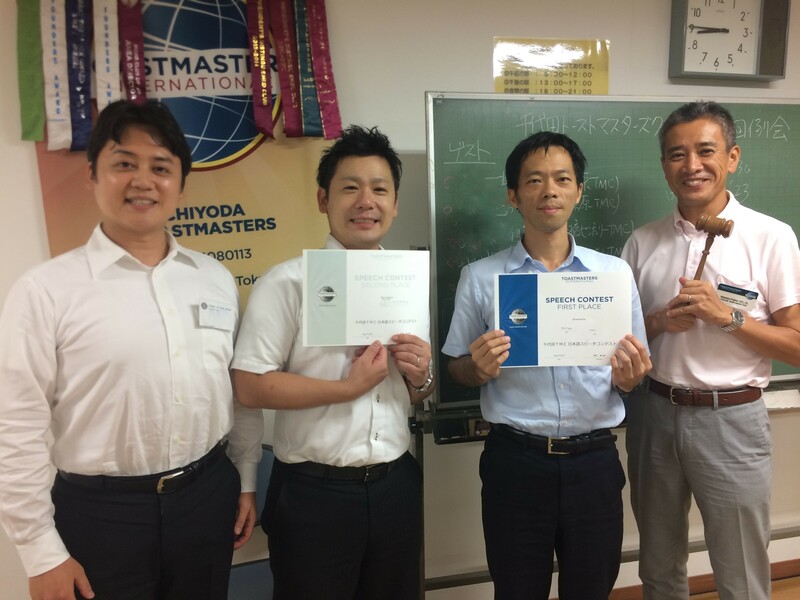 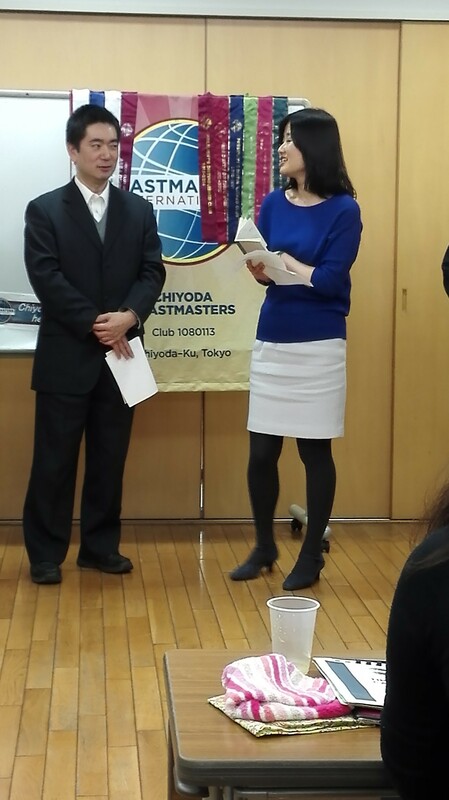 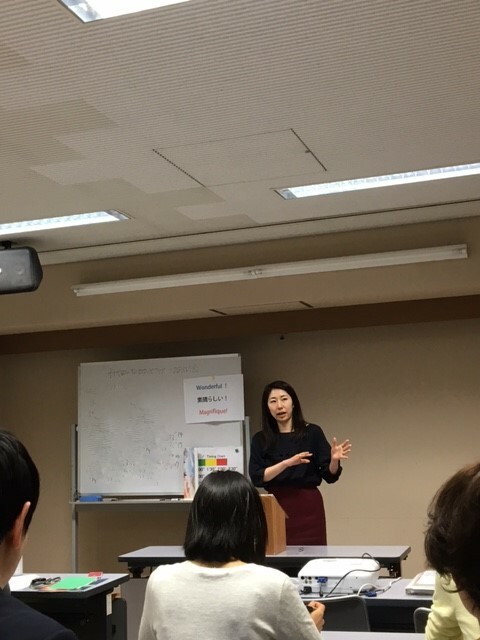 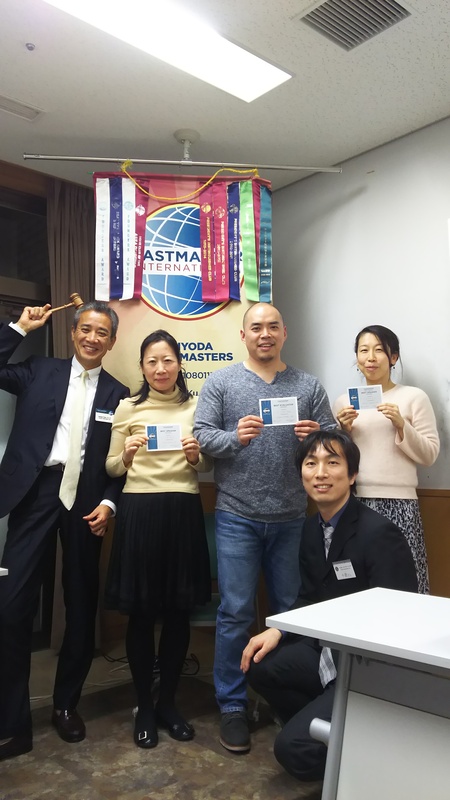 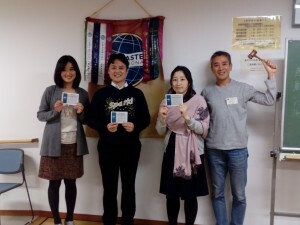 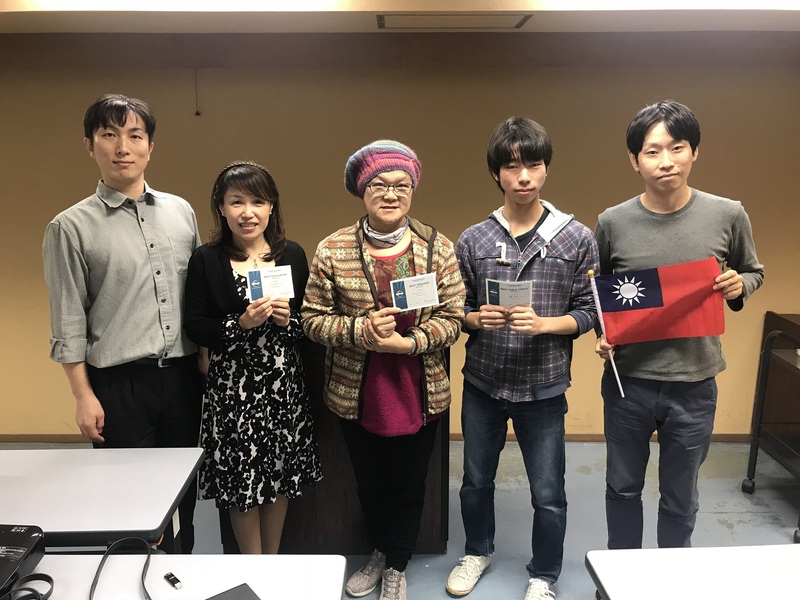 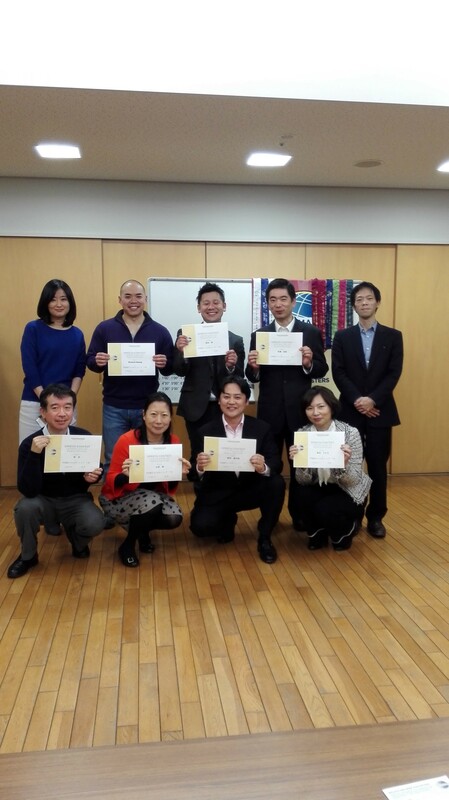 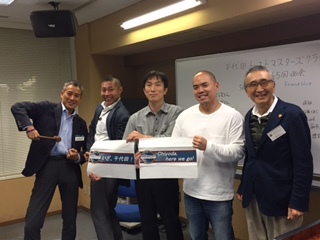 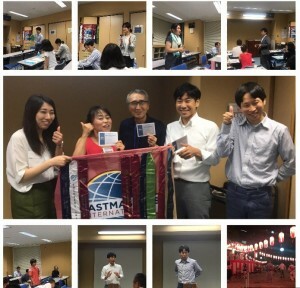 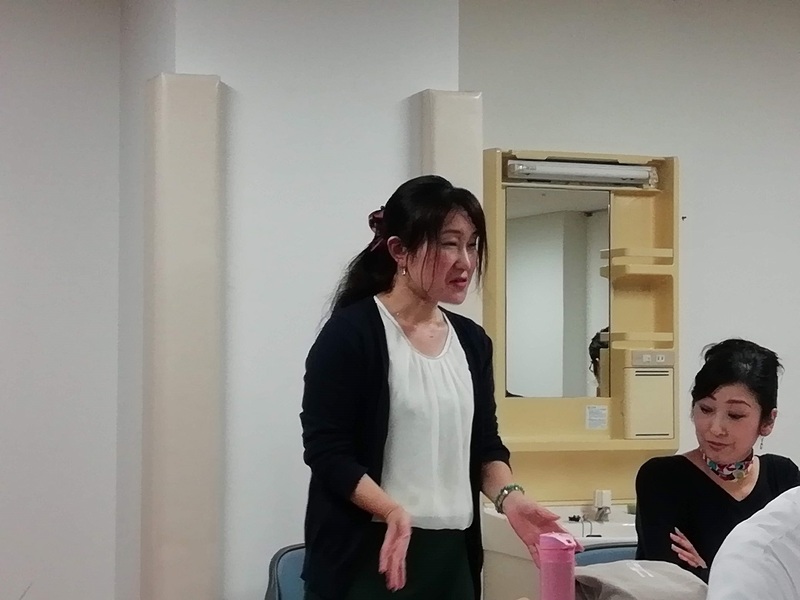 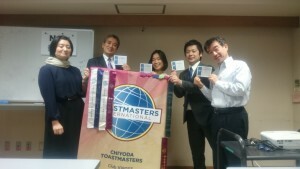 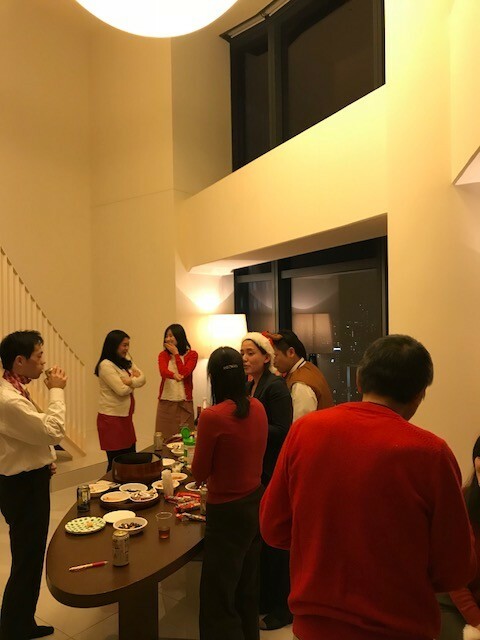 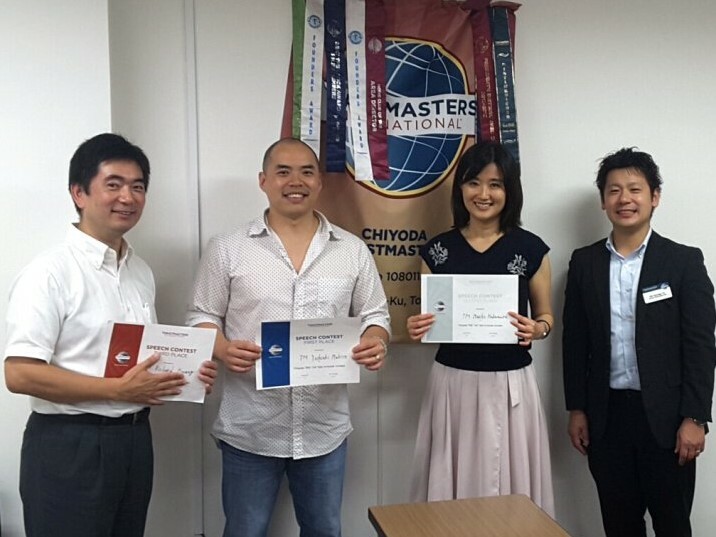 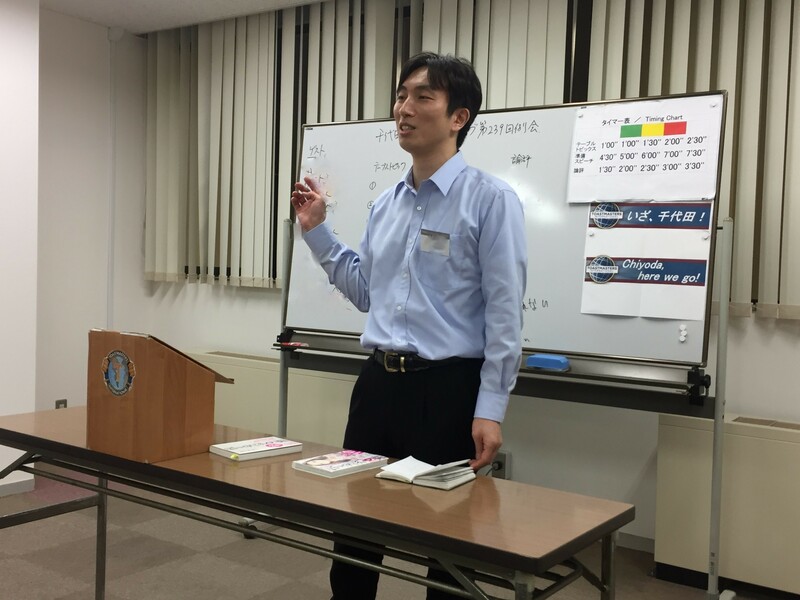 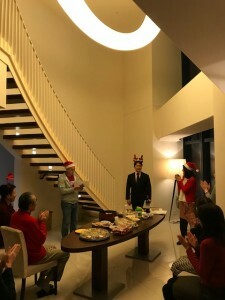 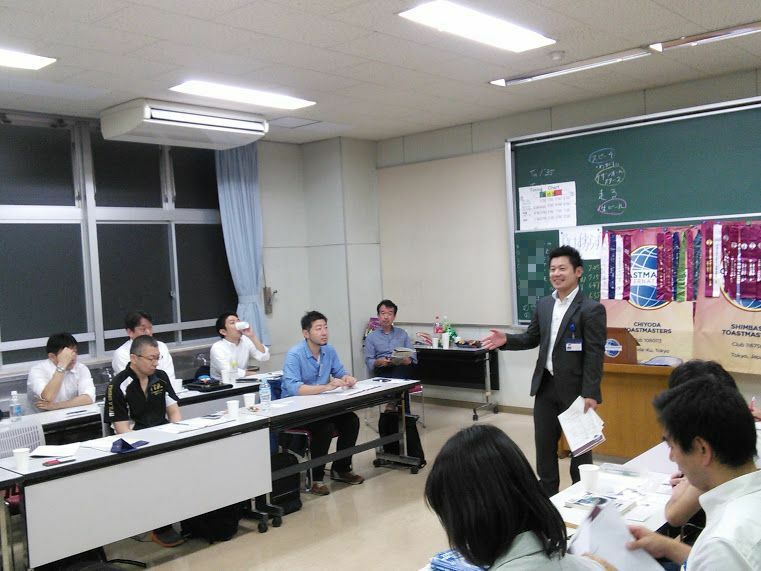 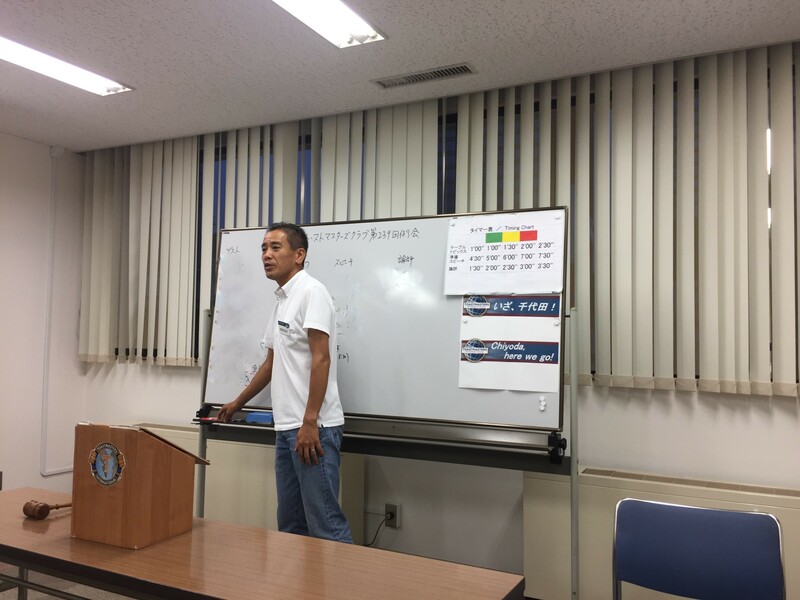 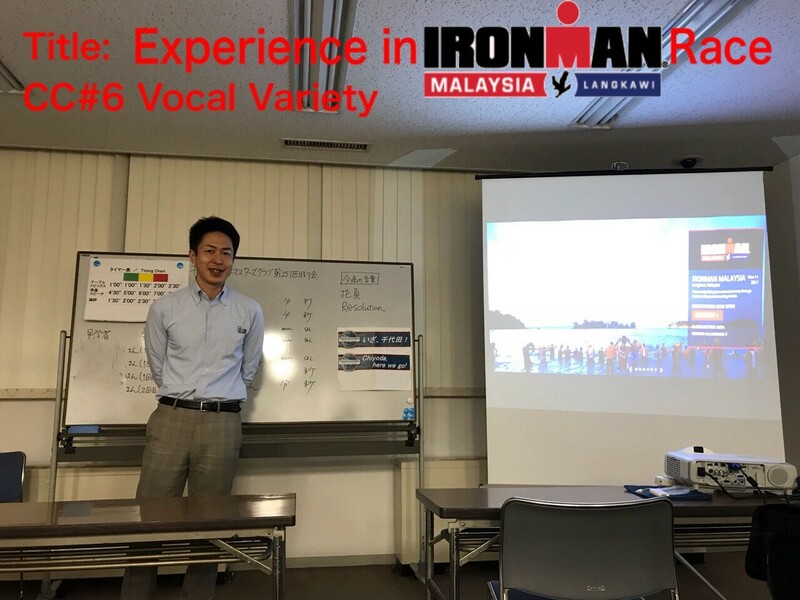 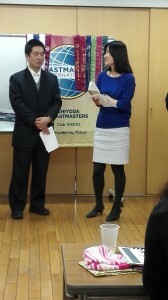 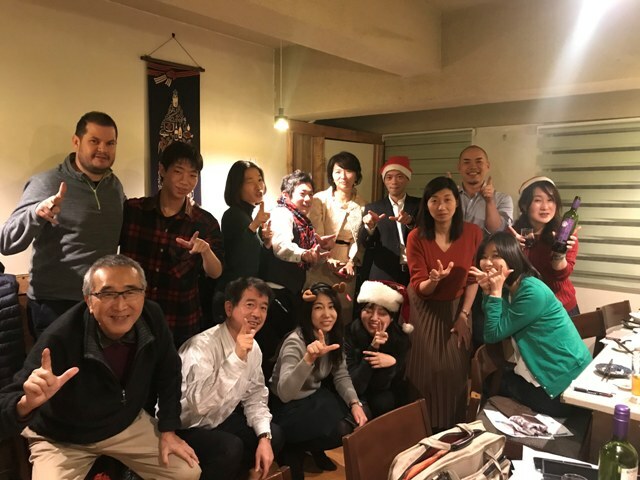 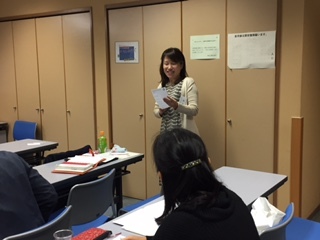 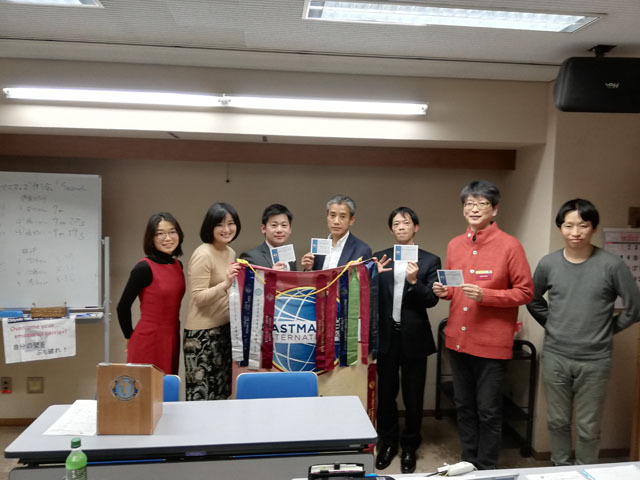 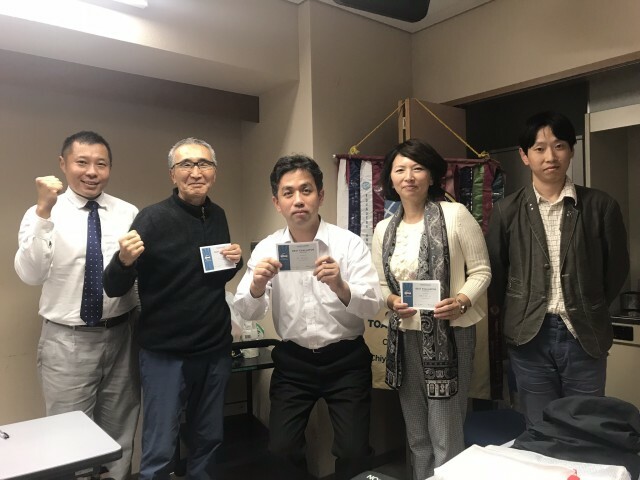 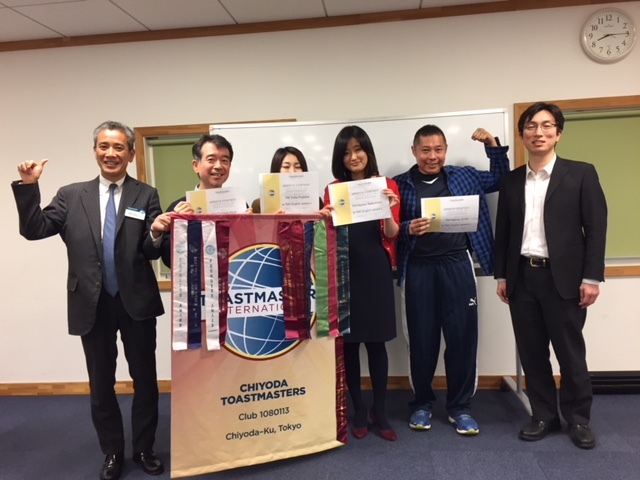 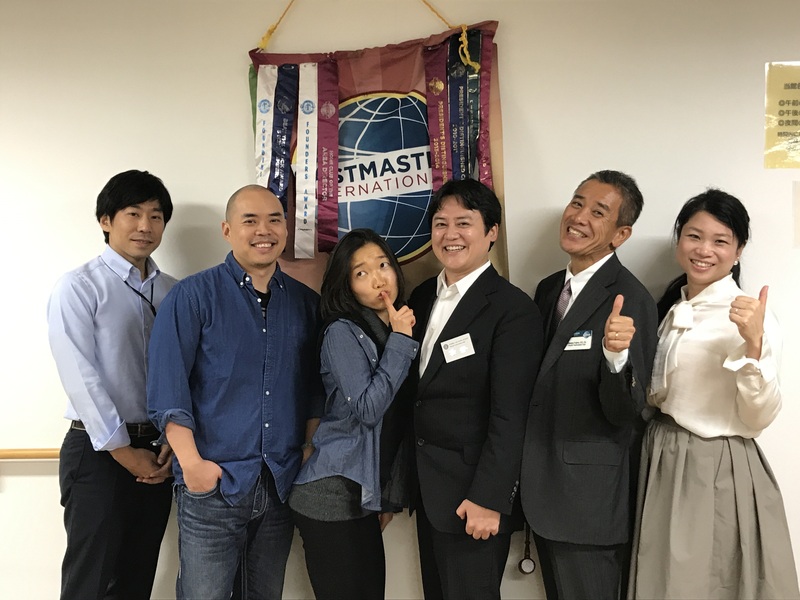 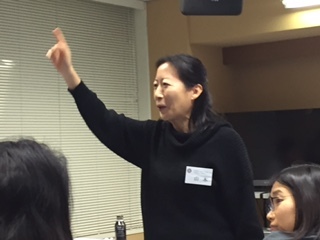 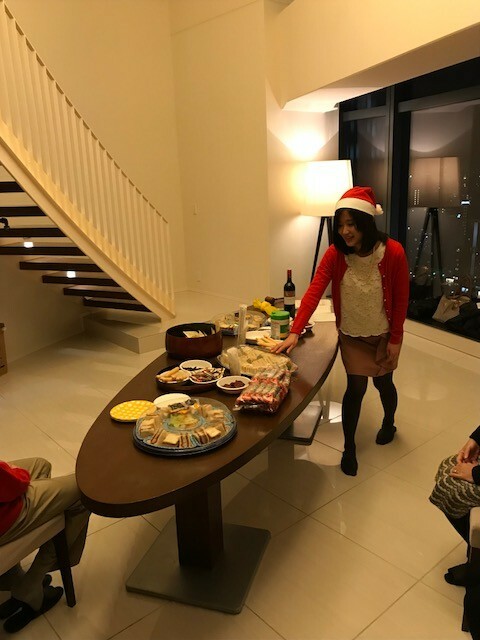 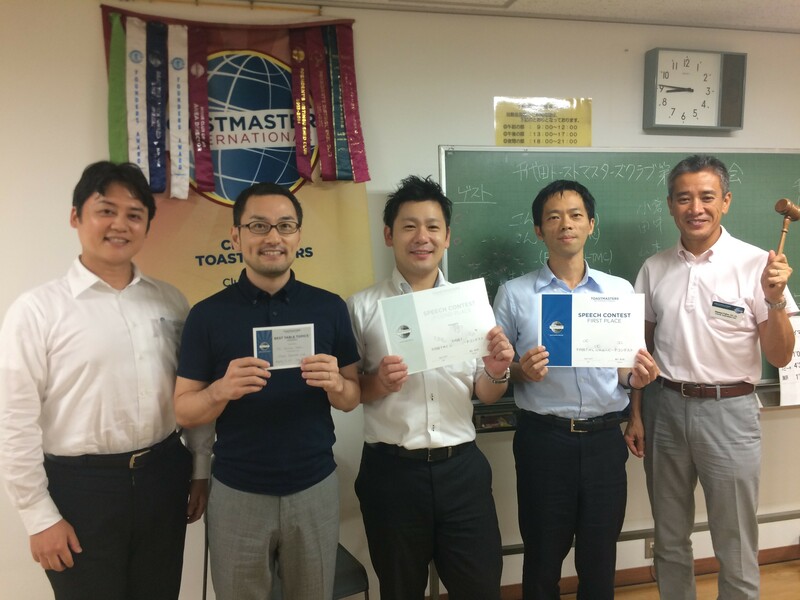 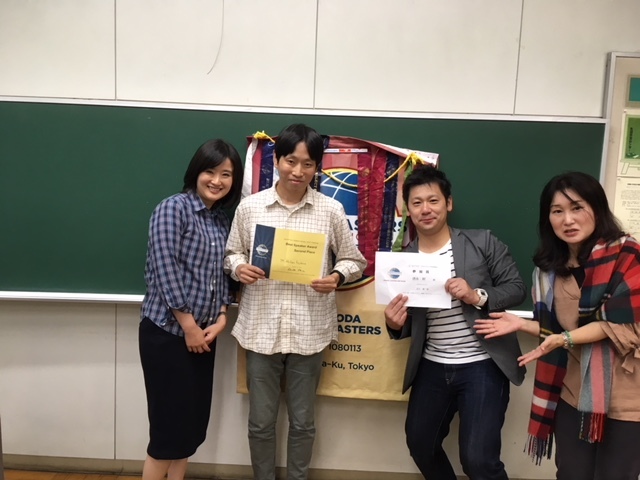 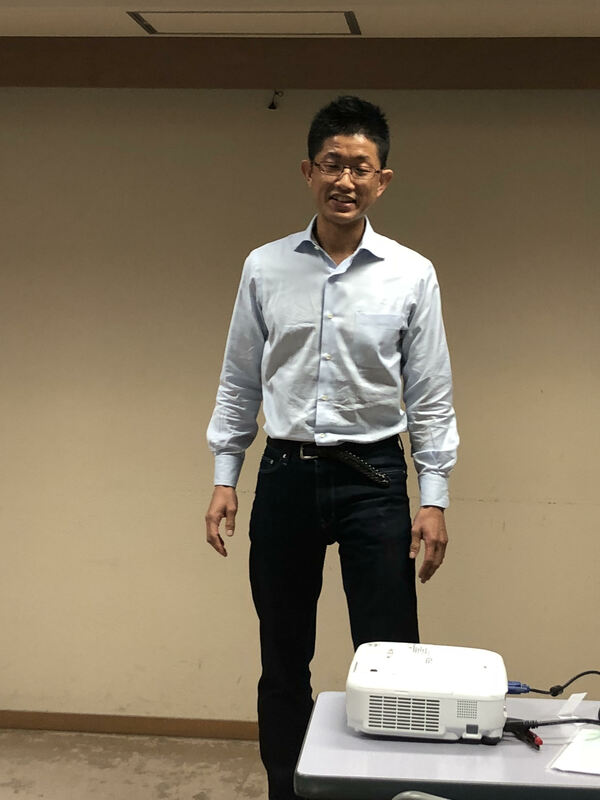 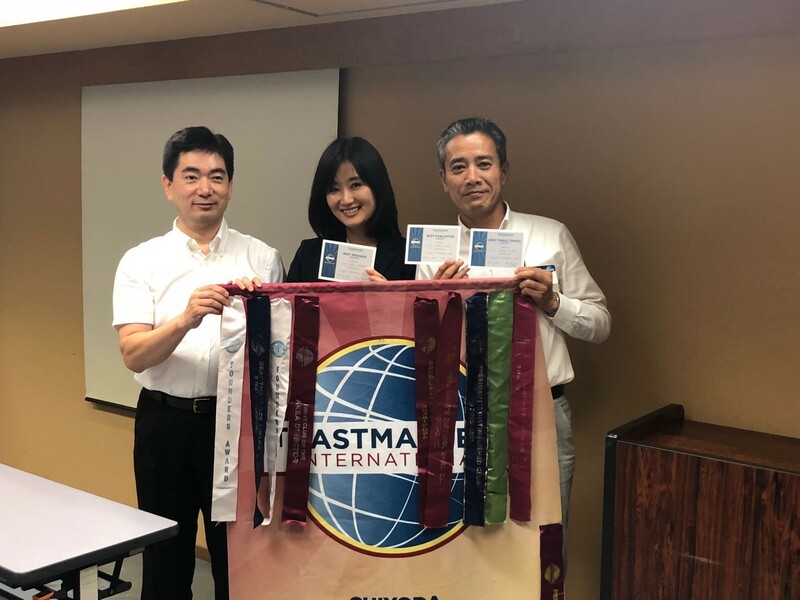 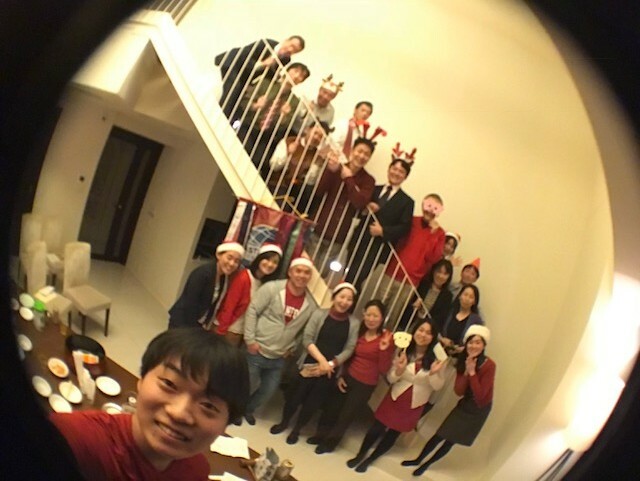 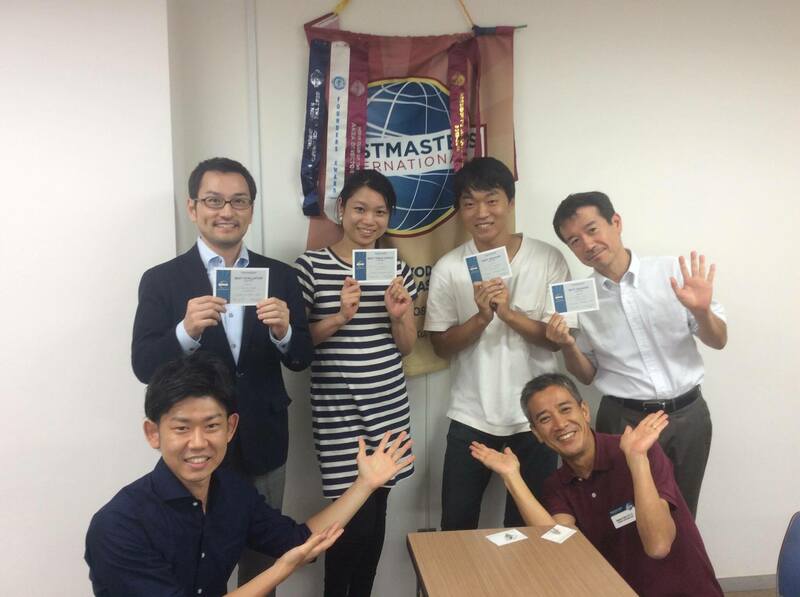 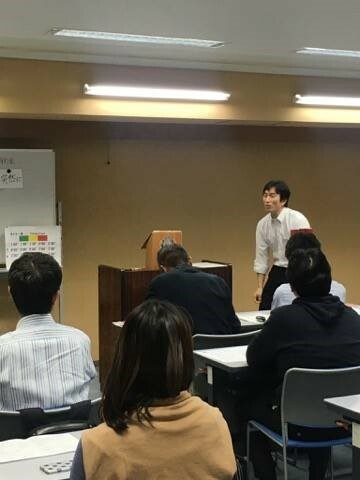 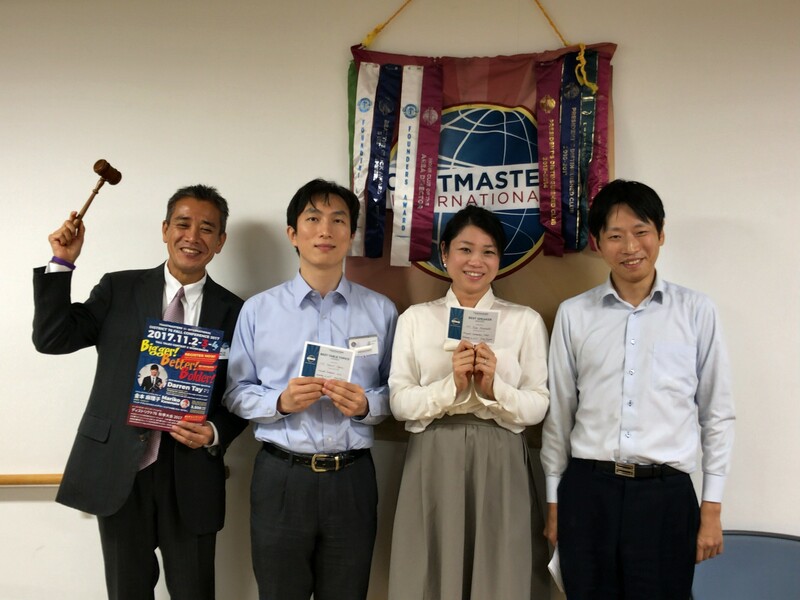 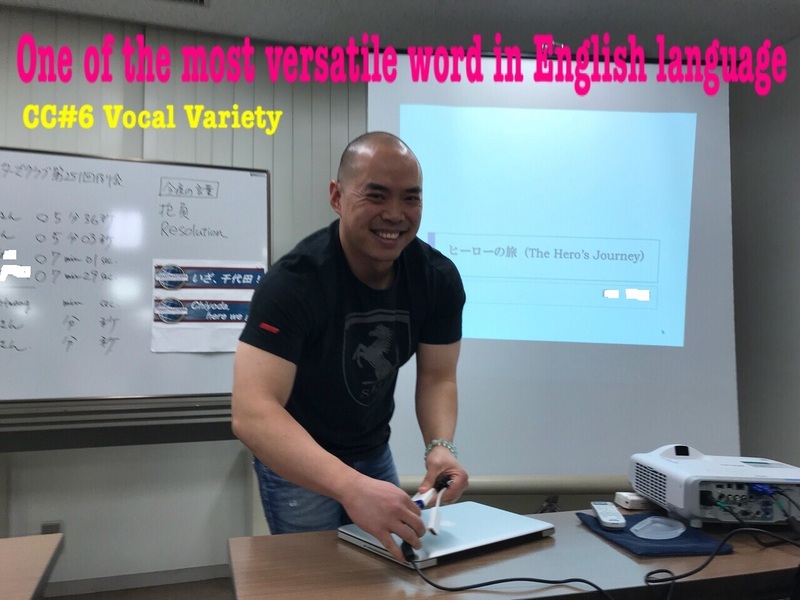 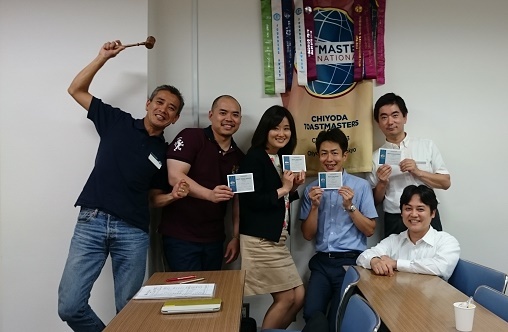 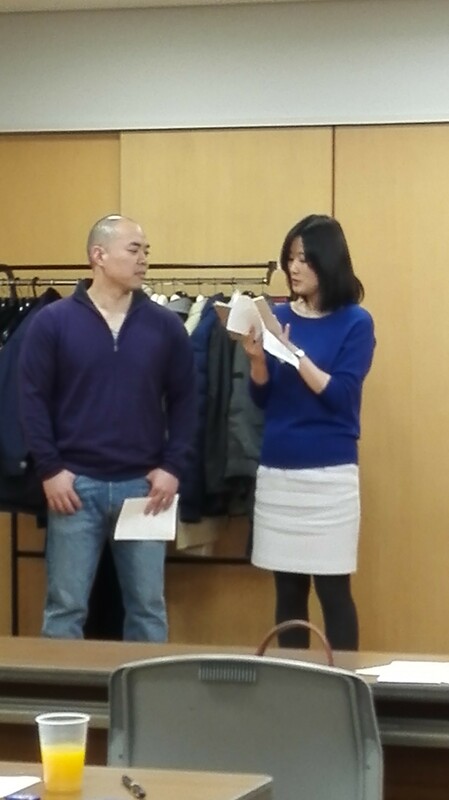 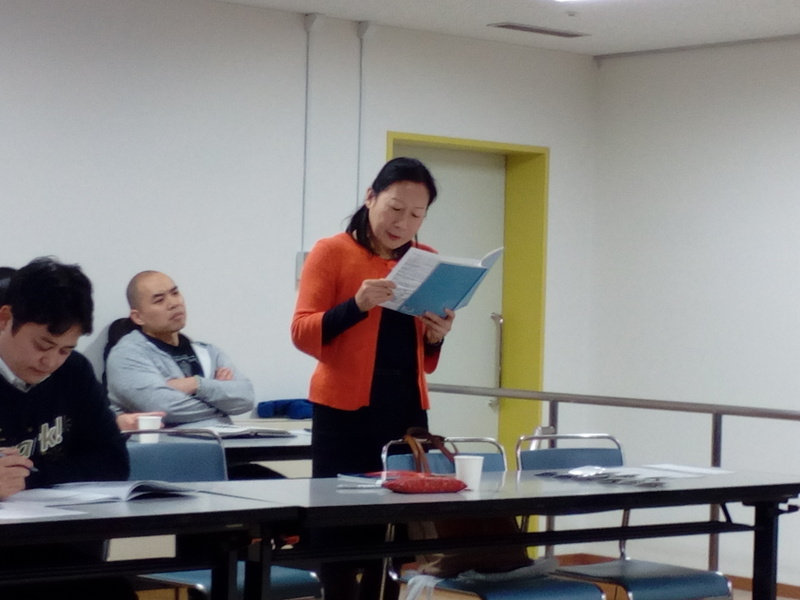 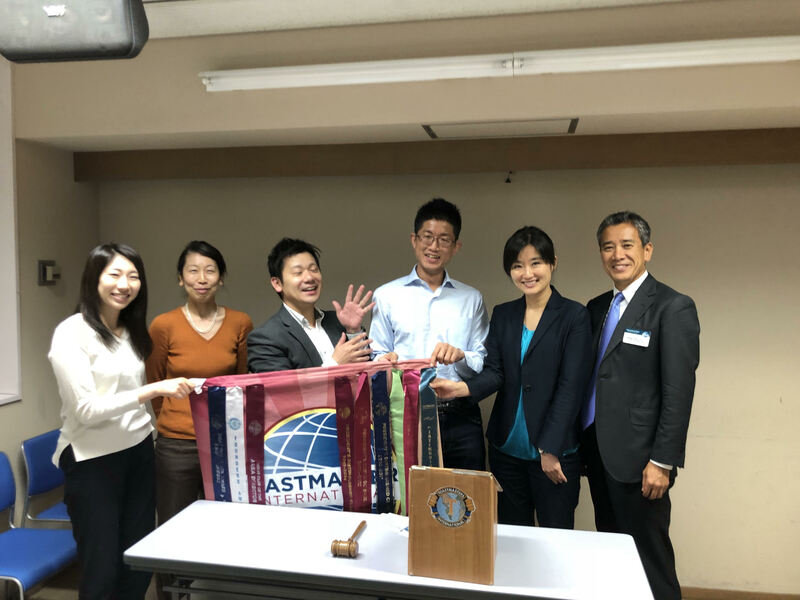 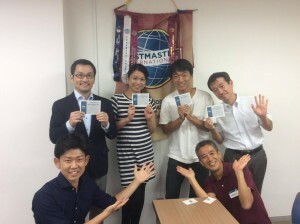 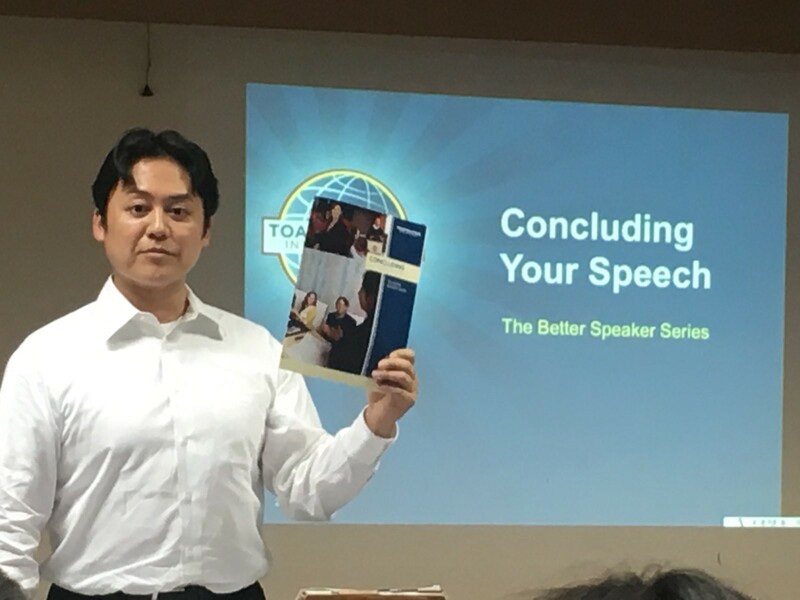 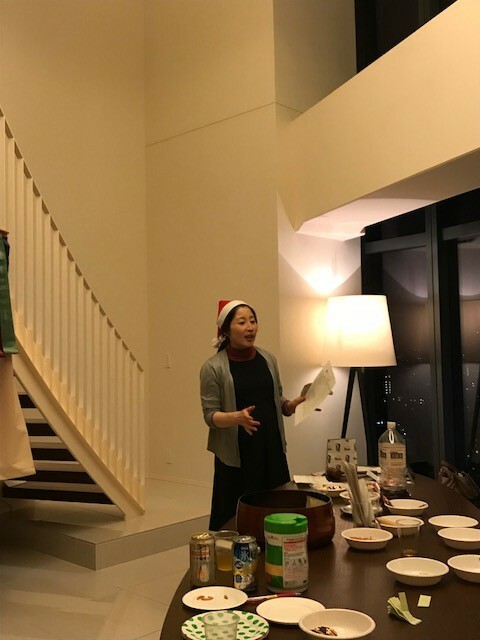 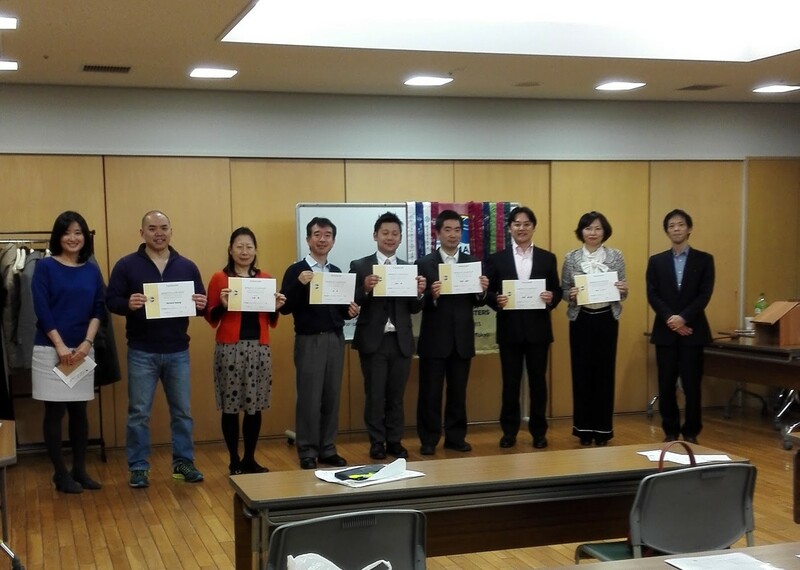 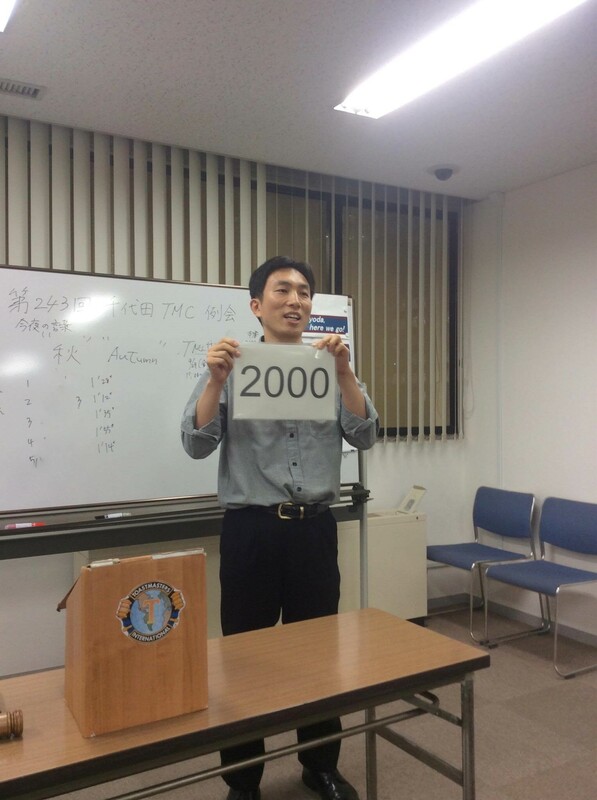 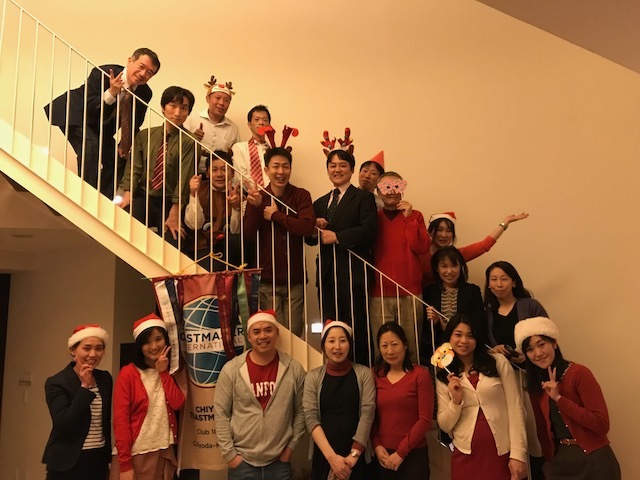 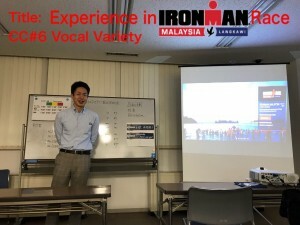 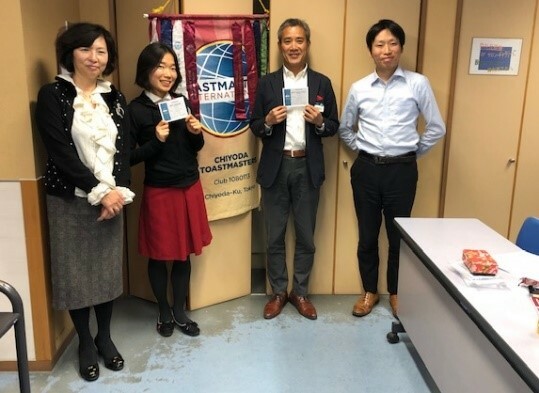 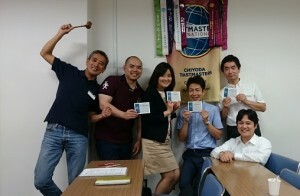 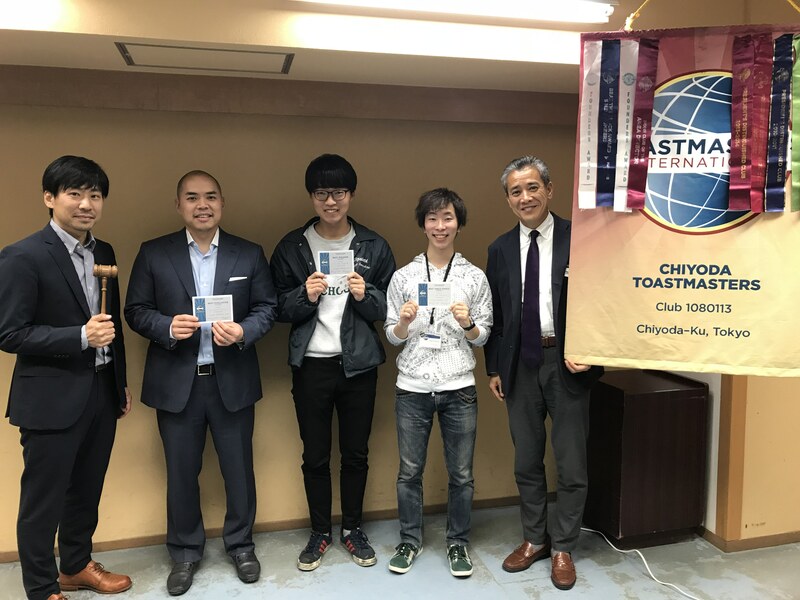 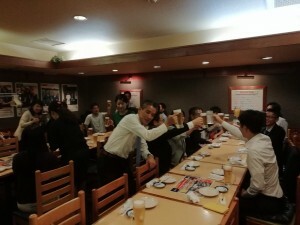 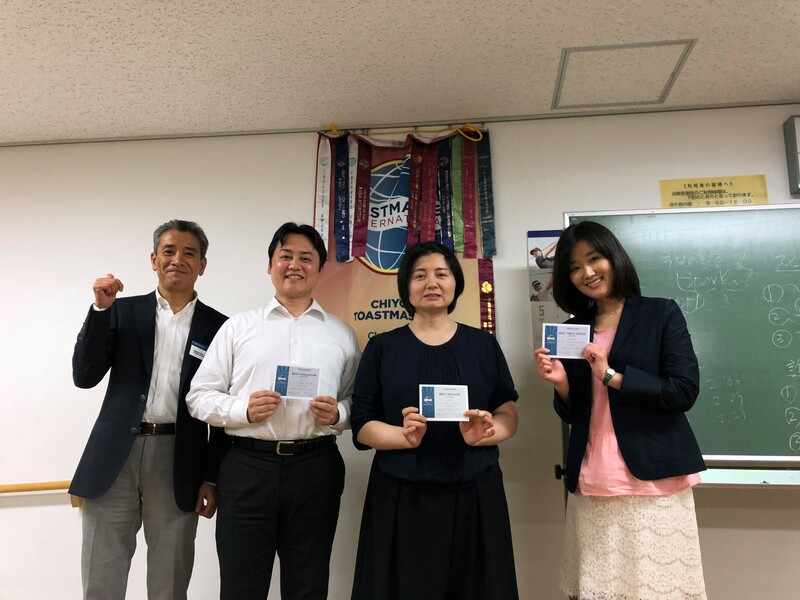 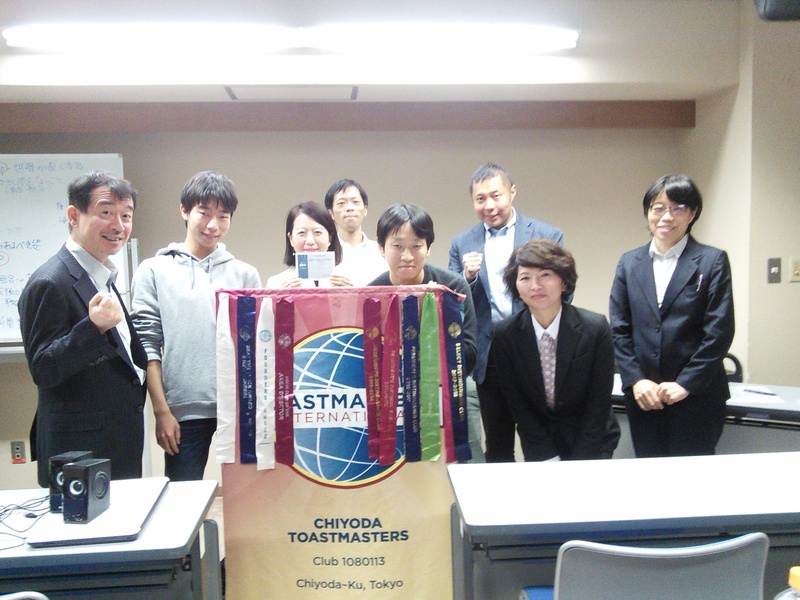 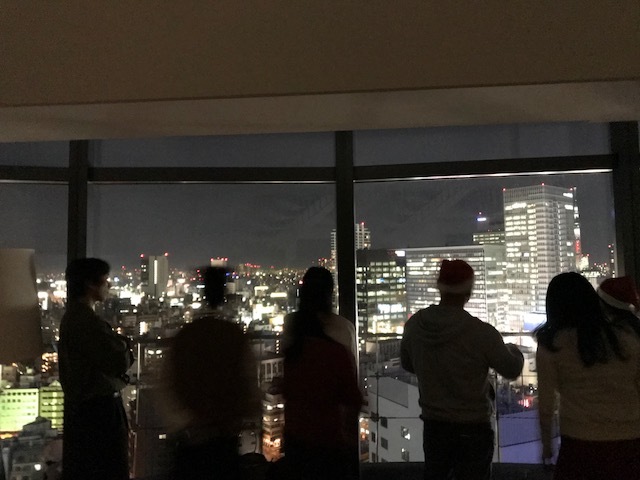 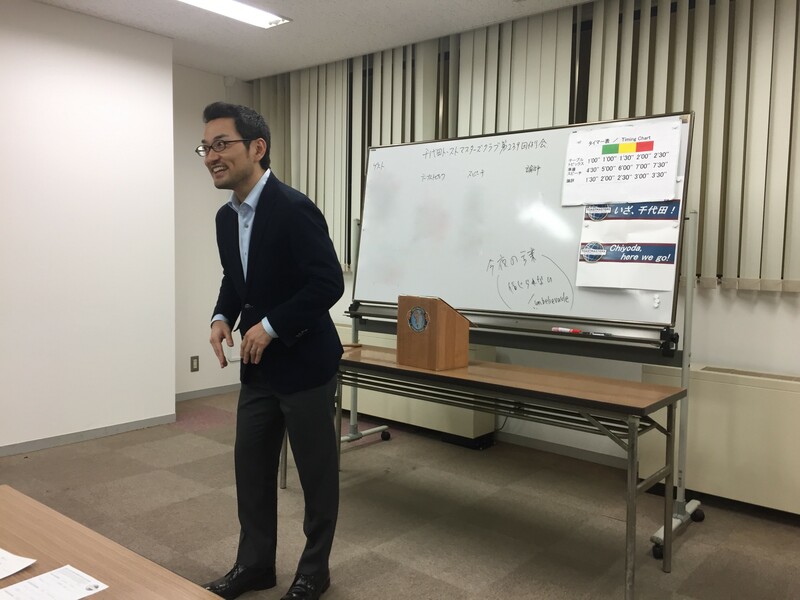 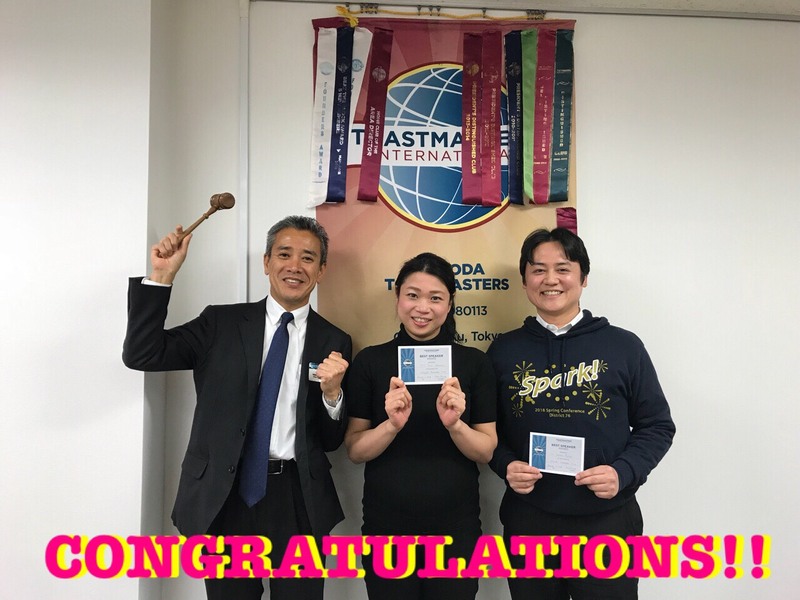 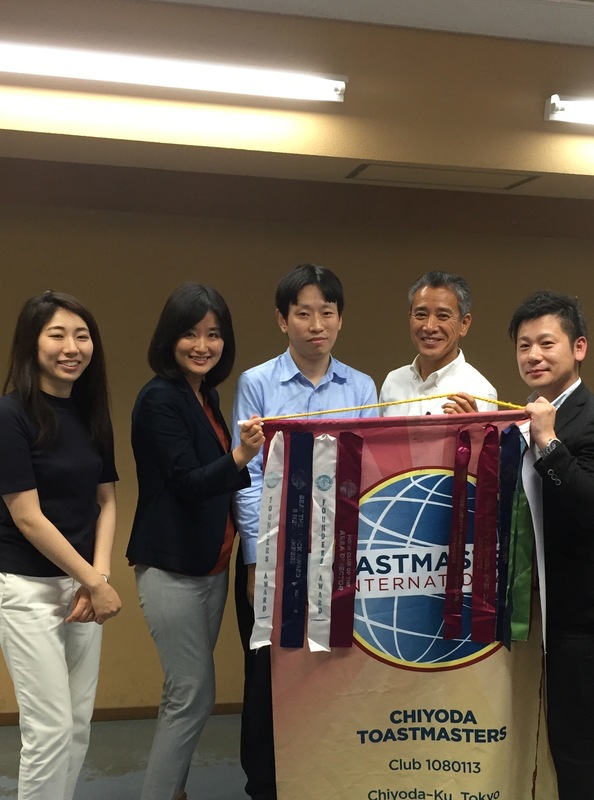 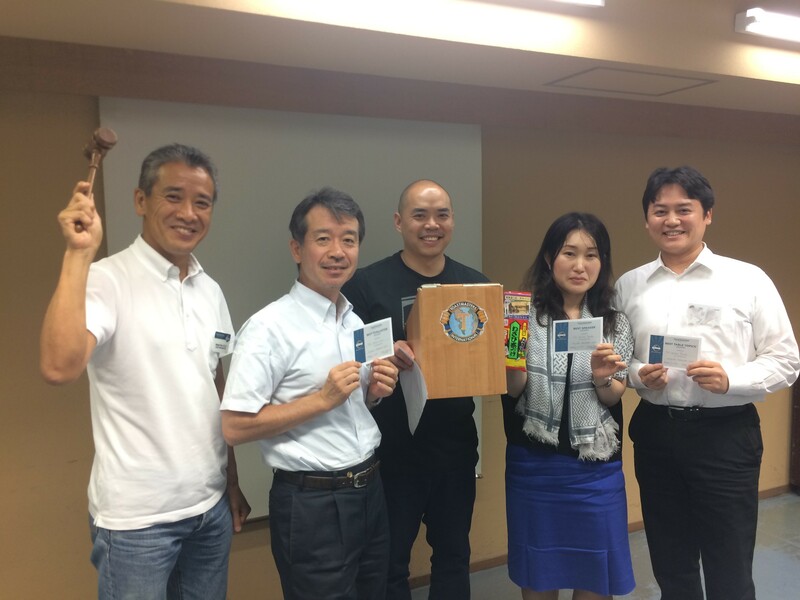 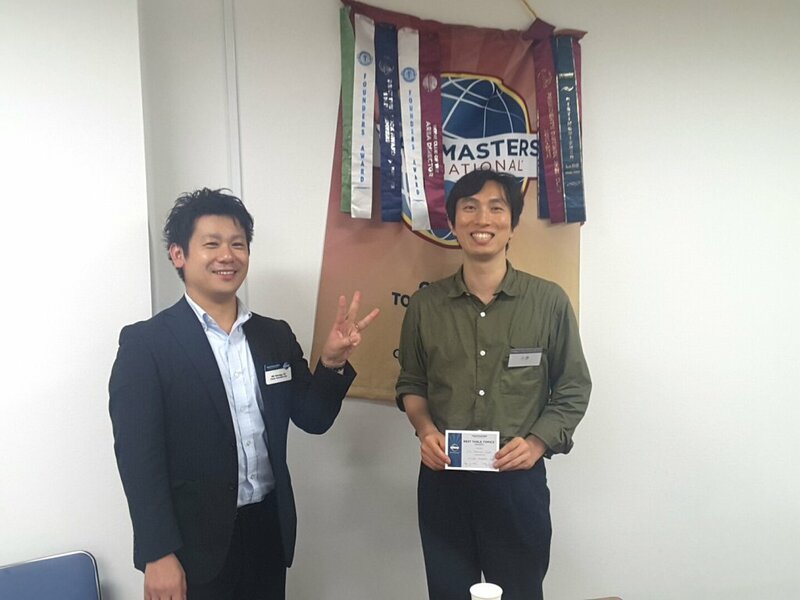 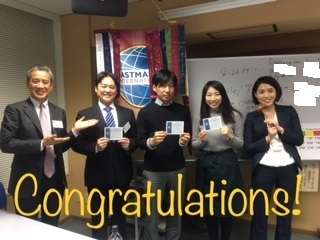 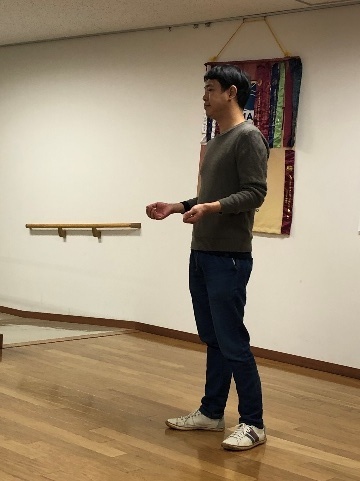 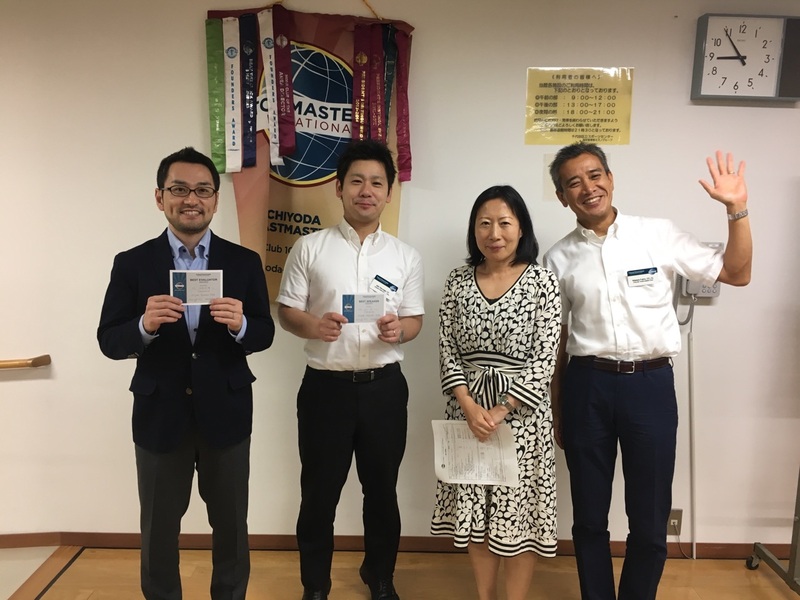 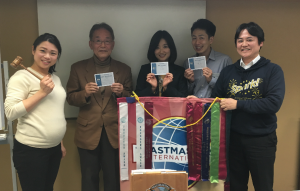 In the midst of members being stuck in traffic, we started off the evening with the regular positive and family-like atmosphere that distinguishes Chiyoda Toastmasters Club from others. 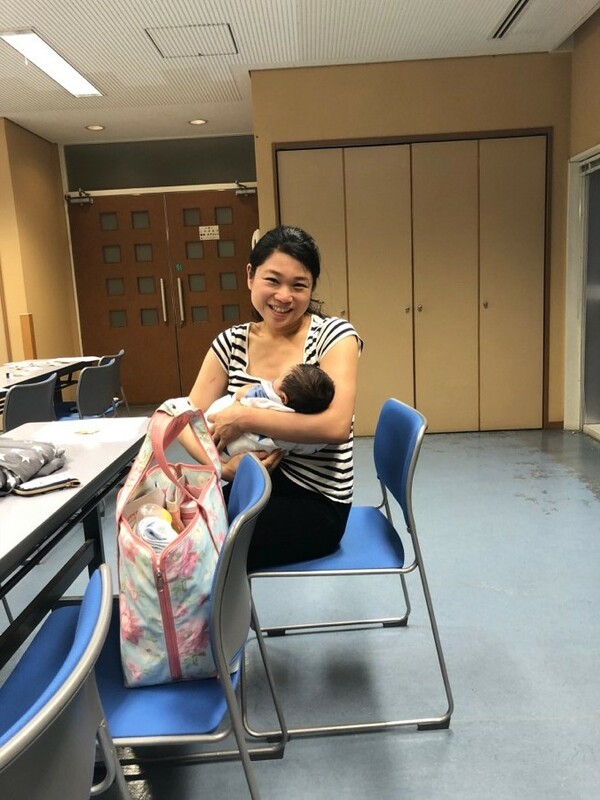 To start off, our TM YM brought her newborn son to be our youngest guest ever! 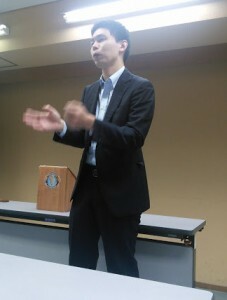 Knowing that our chairman would be running behind, TM N took over. As first timer, she did a great job in terms of making sure all requirements (flow, guest introduction, setting the mood) were completed. 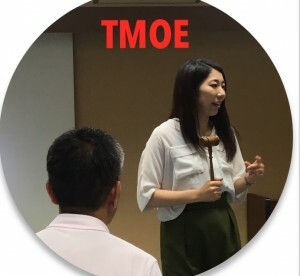 It has been a while since TM M was TMOE. 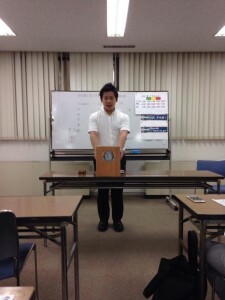 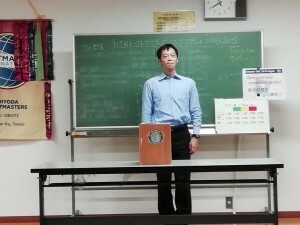 He felt a different “pressure” from prepared speech. 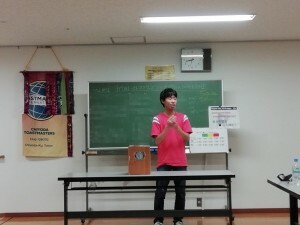 Chose the word “1st” and started to talk about his favorite comedians. One is “sandwich man” because they don’t hit the head and the Second is a brother team who won their M-1 competition during their first entry. 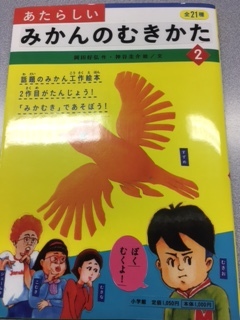 After quick introduction of supporting parts of Timer, Ballot Counter, Grammarian and Meeting Reporter, we then moved to one of our club favorite “A book to be recommended”. 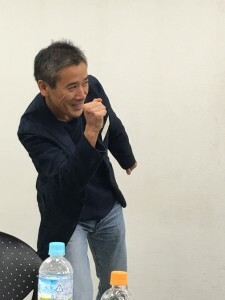 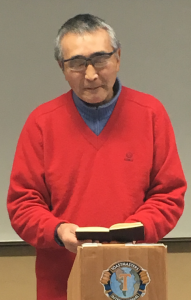 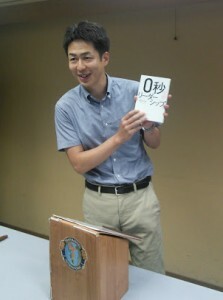 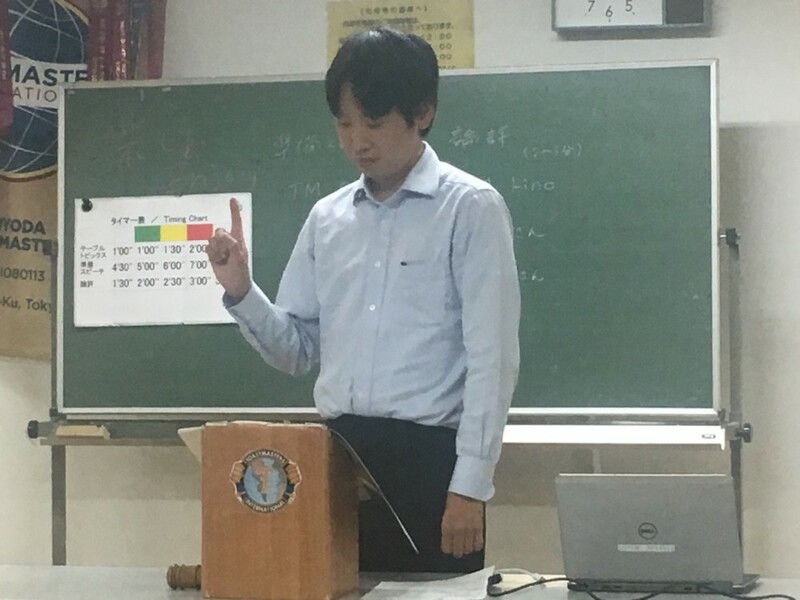 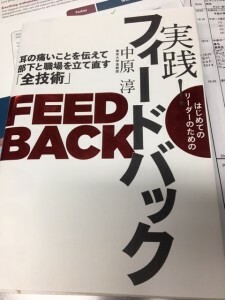 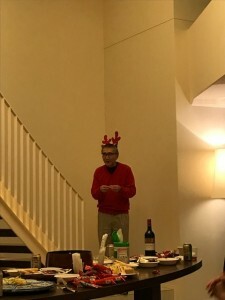 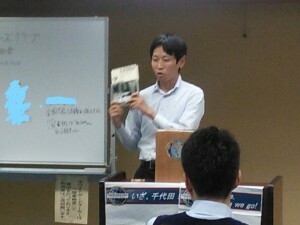 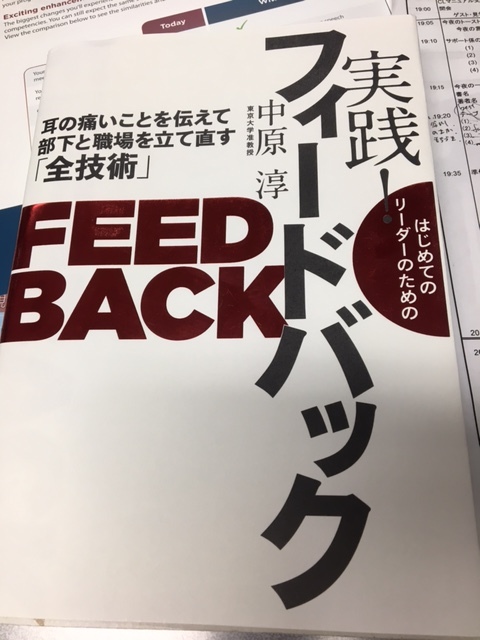 His recommended book was 不登校ーひきこもりを生きる. Passionately sharing the connection between the content of the book and how it impacts the people in society. 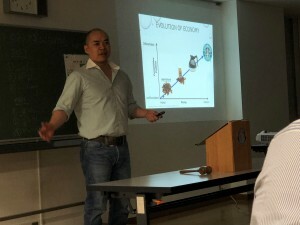 Content included the increase of the social challenges caused by the belief that “the group is better than the individual”. He left the audience wanting to learn how reading this book would help understand solving the challenges together. 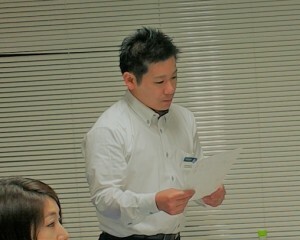 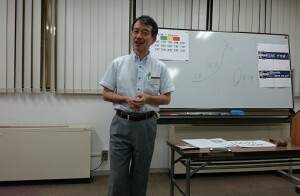 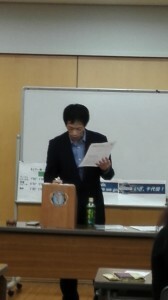 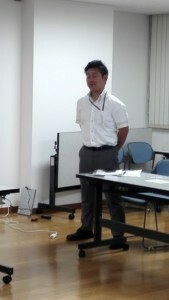 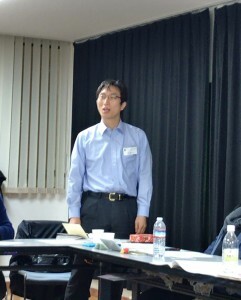 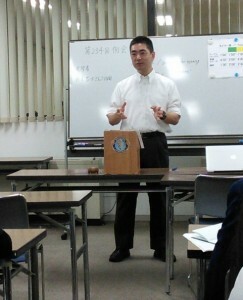 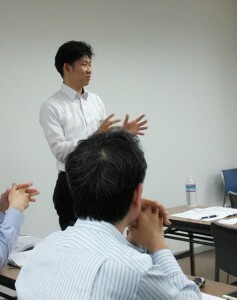 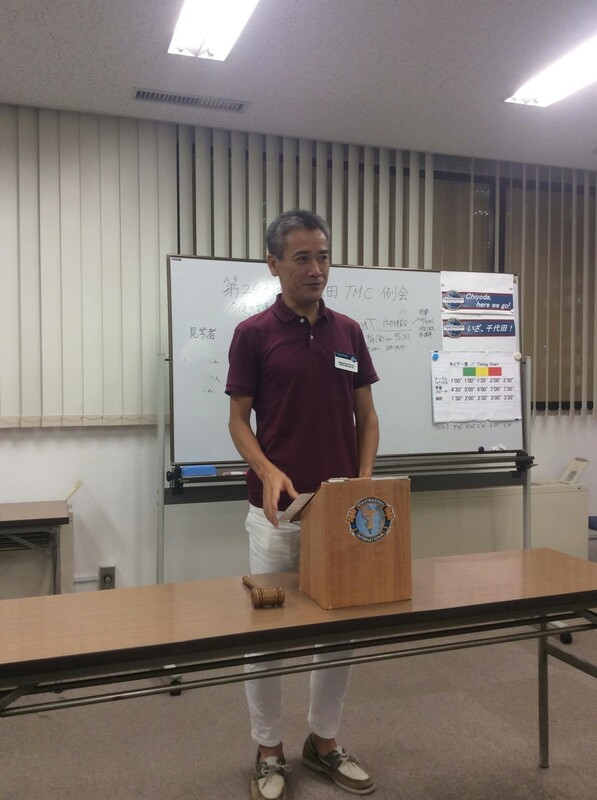 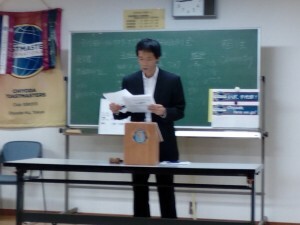 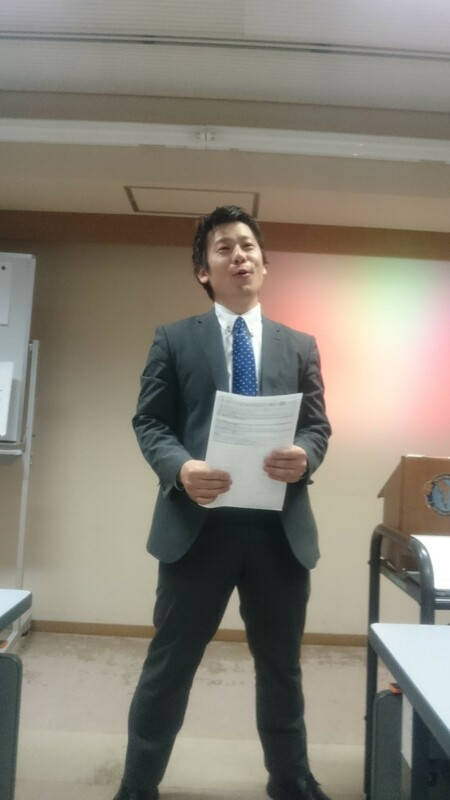 Our upcoming new Chairman TM F of Chiyoda Club lead the Table Topics of the evening. Selections of the topic related to the summer season. 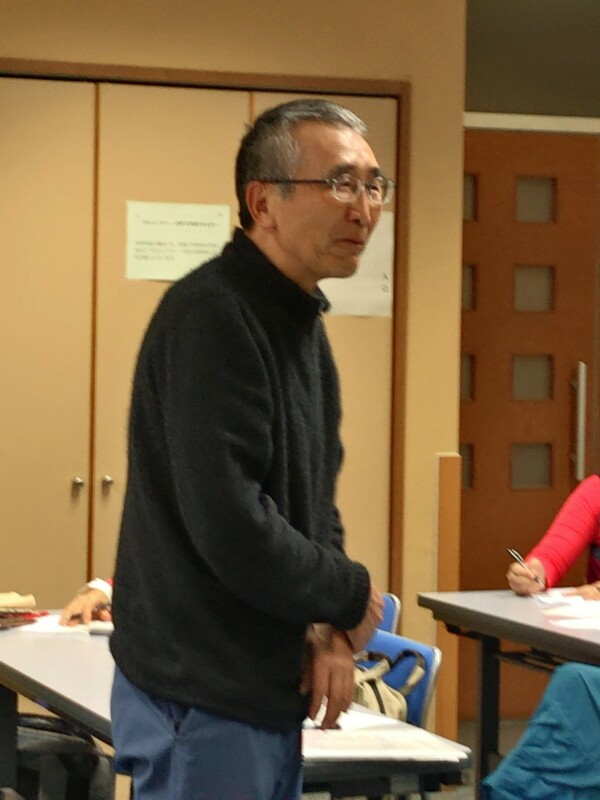 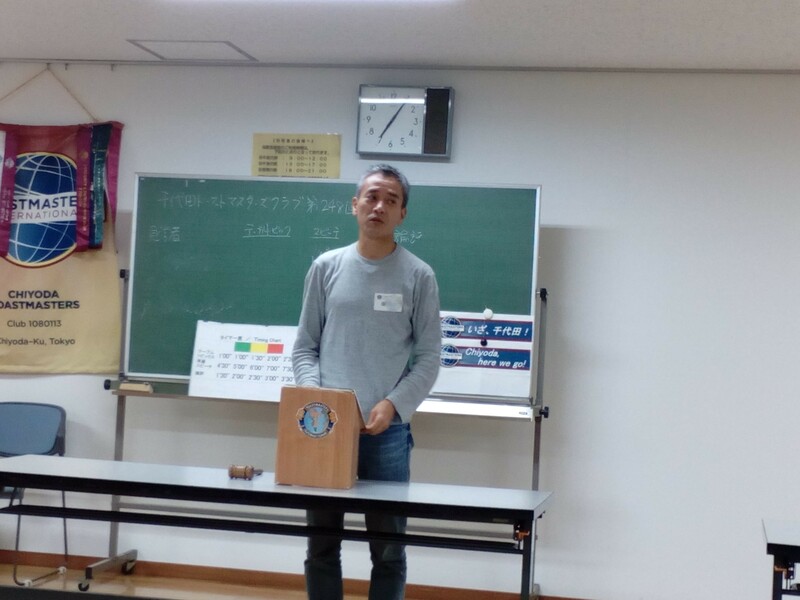 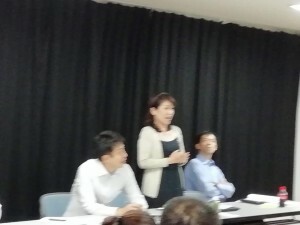 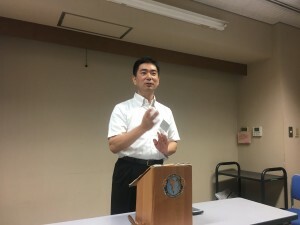 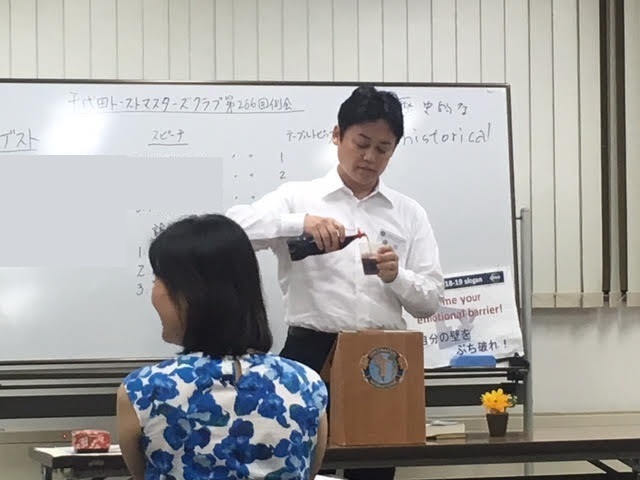 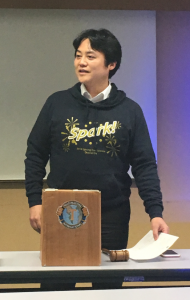 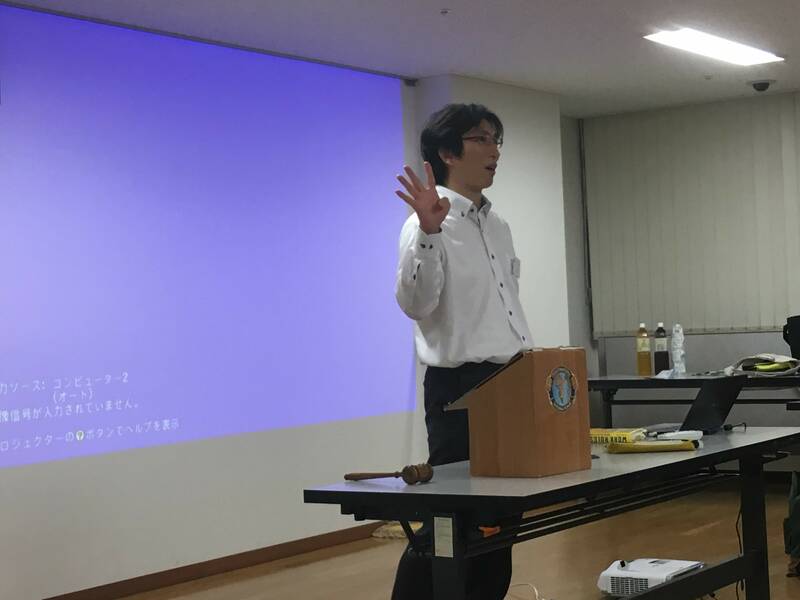 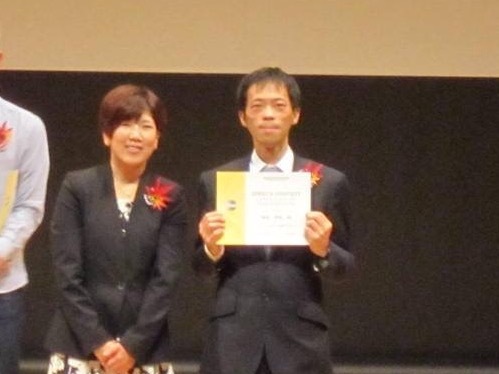 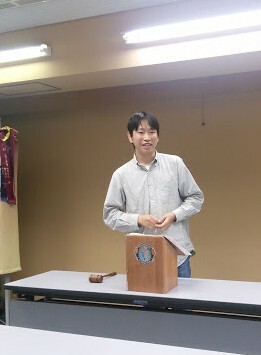 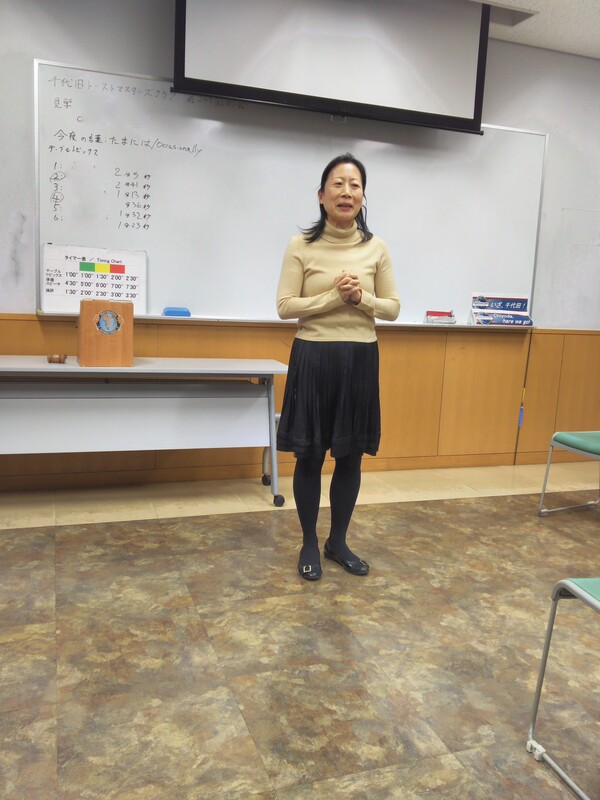 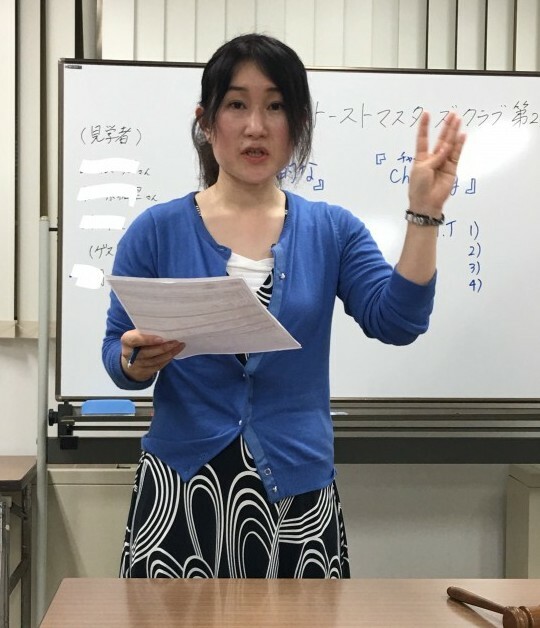 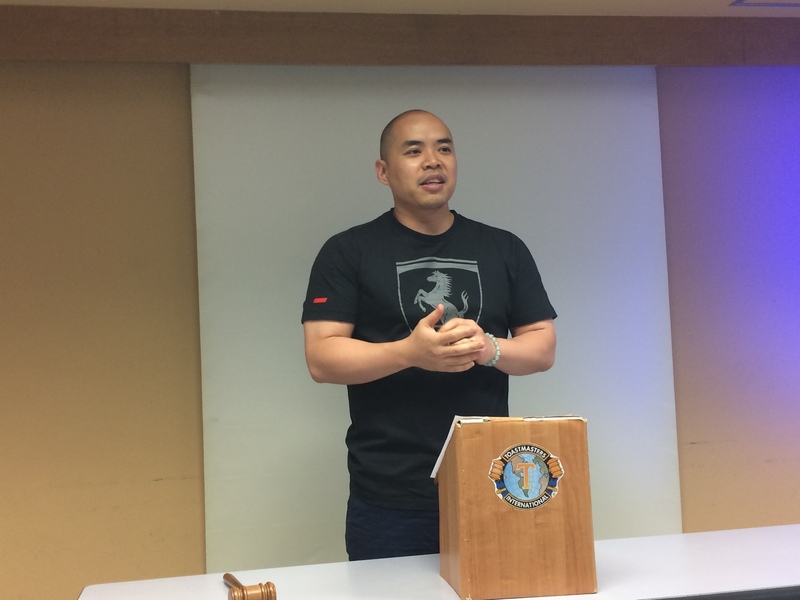 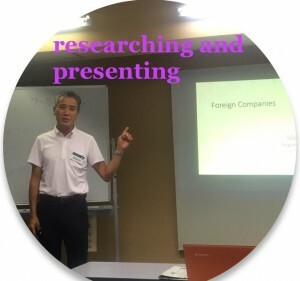 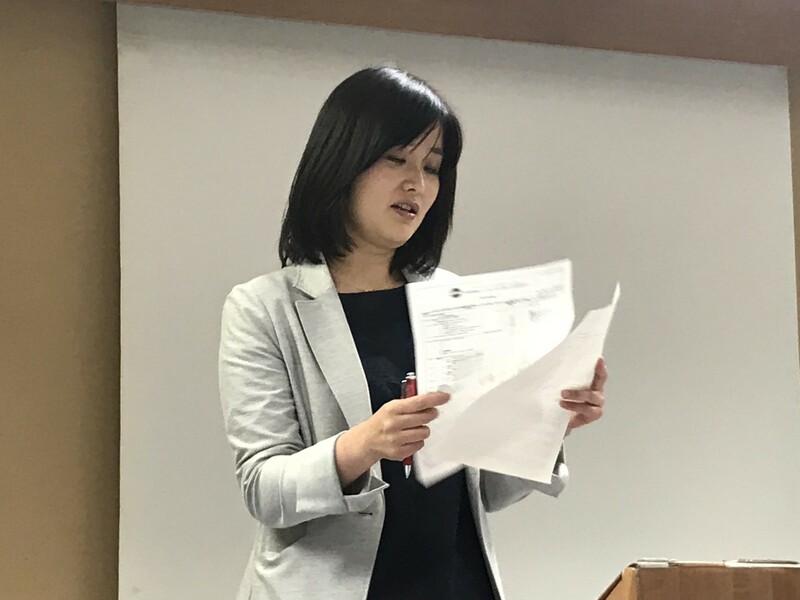 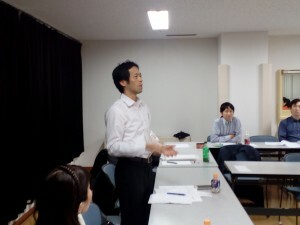 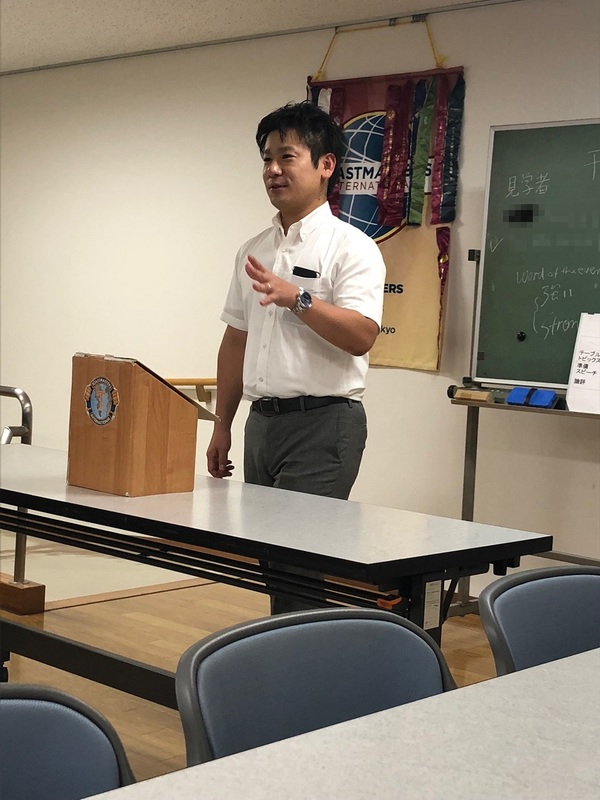 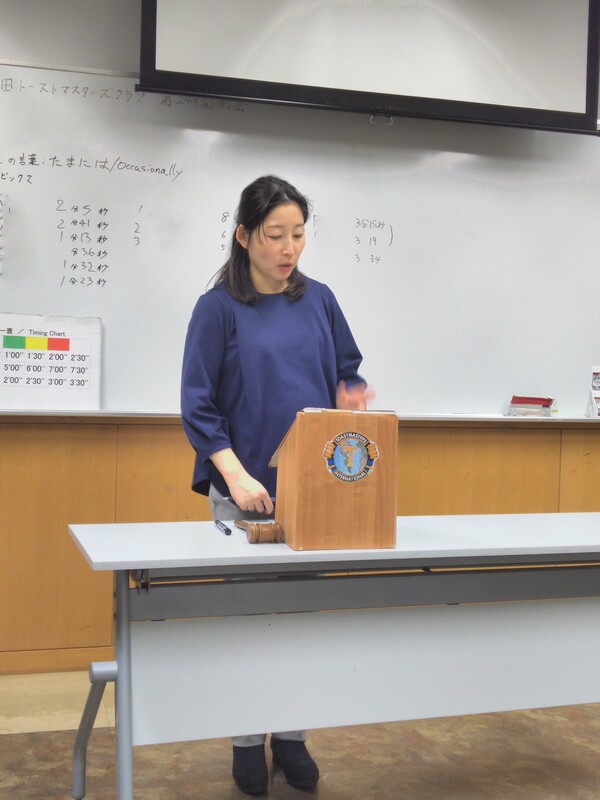 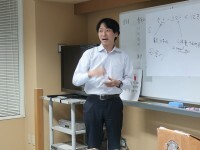 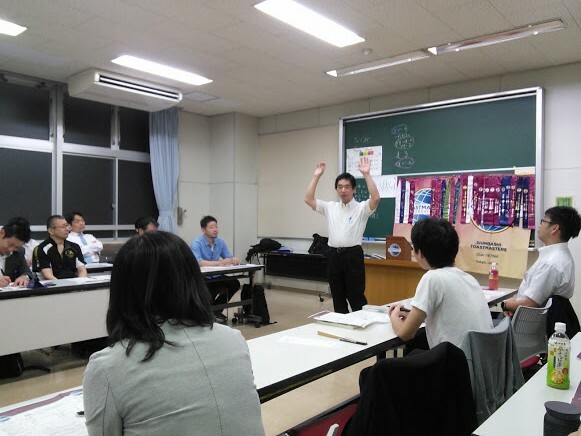 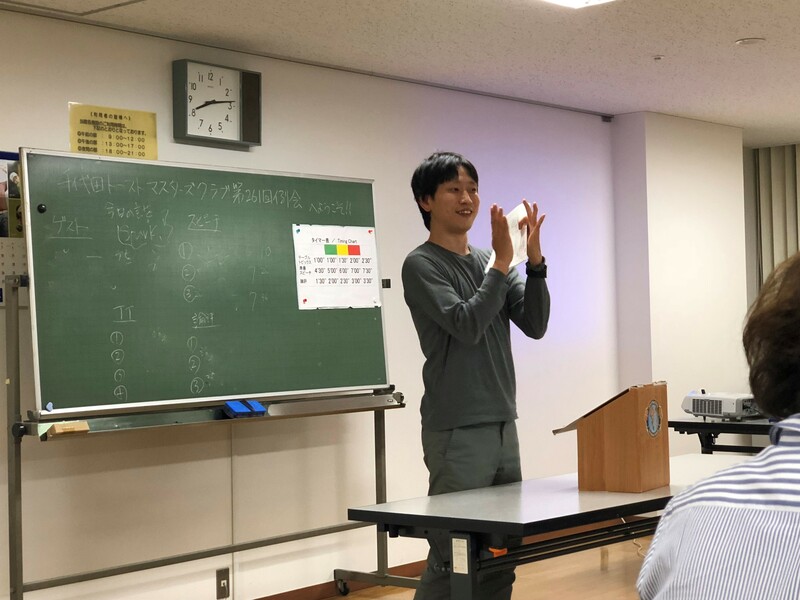 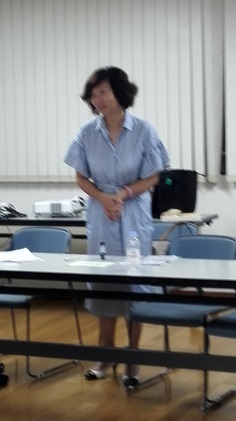 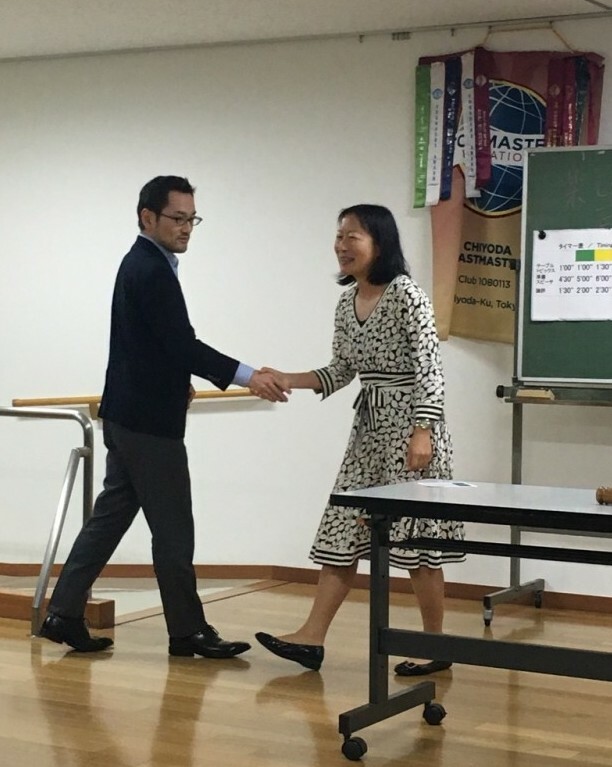 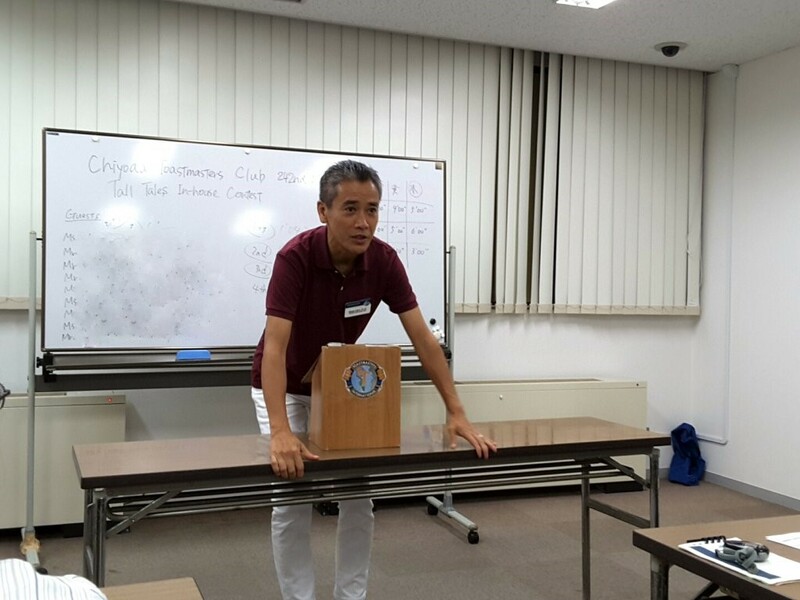 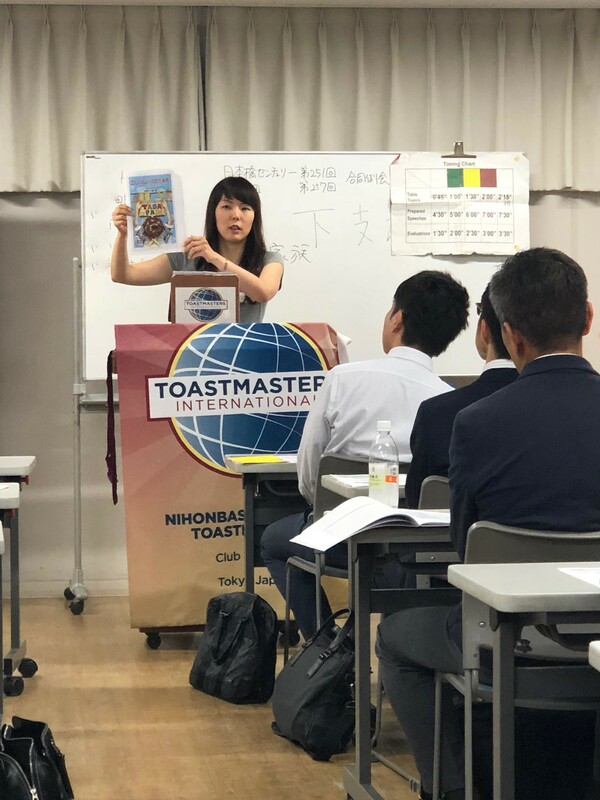 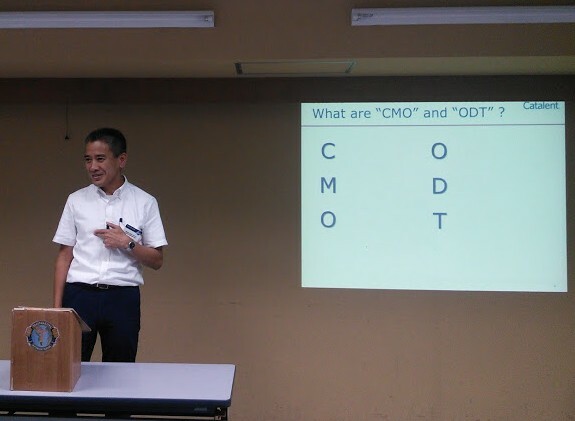 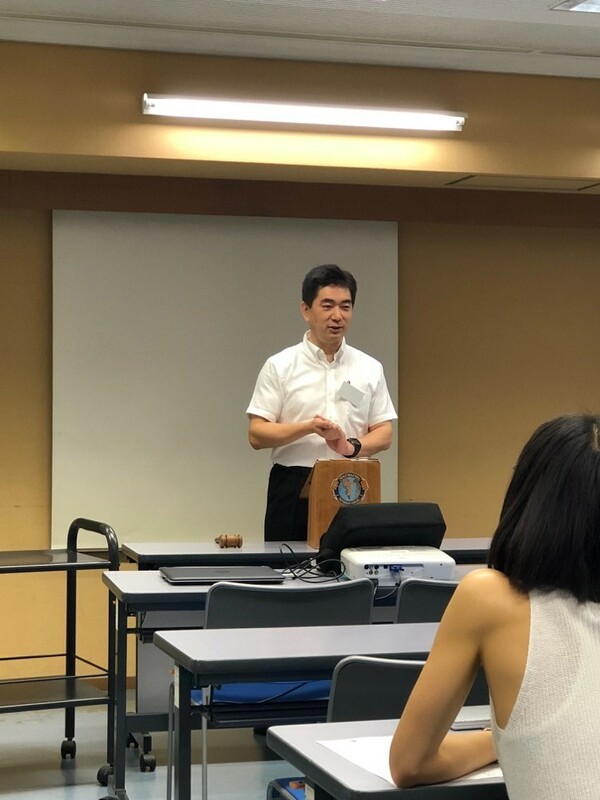 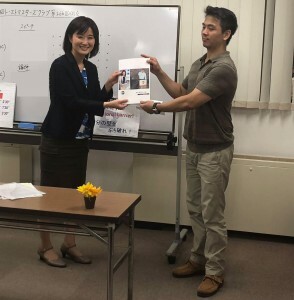 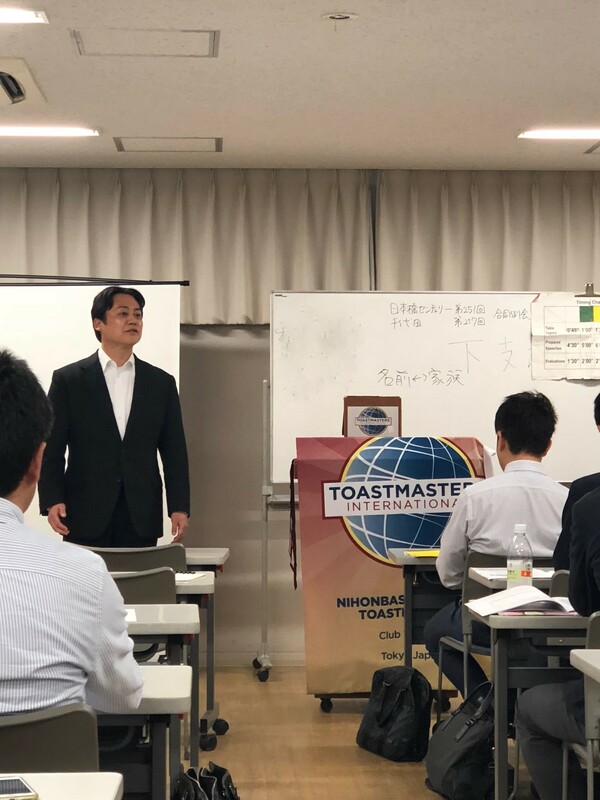 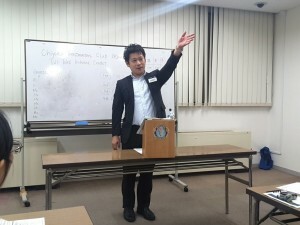 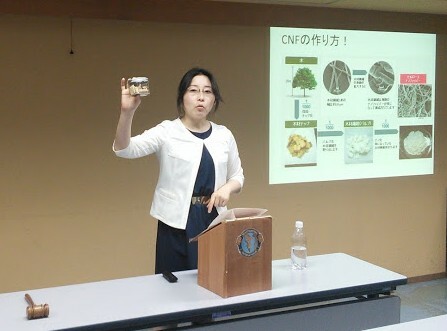 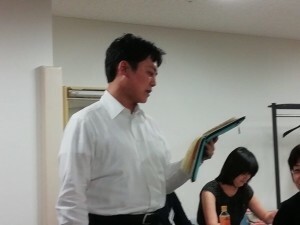 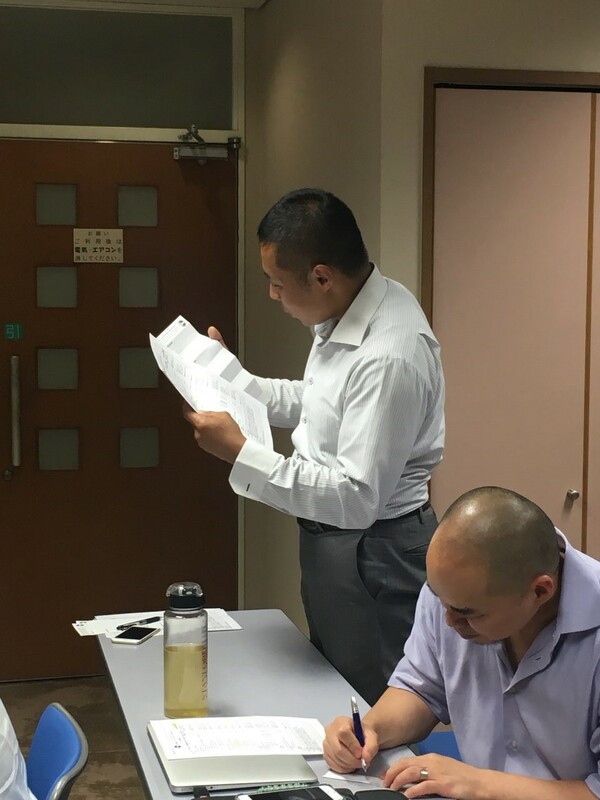 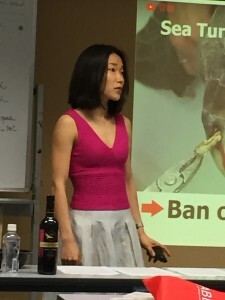 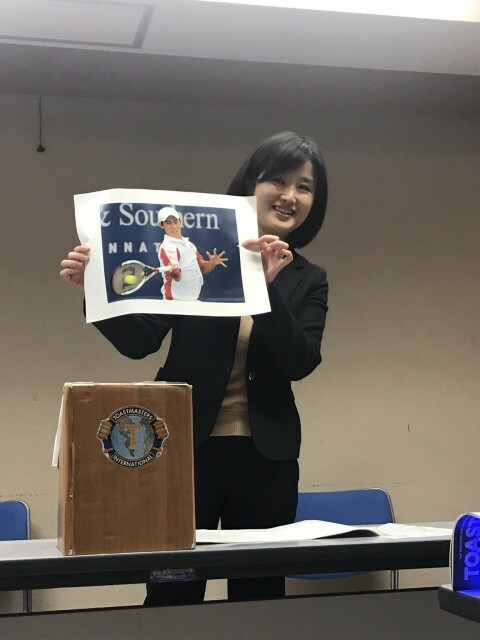 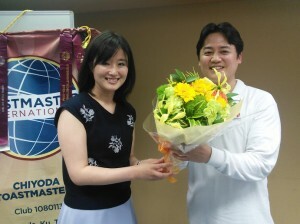 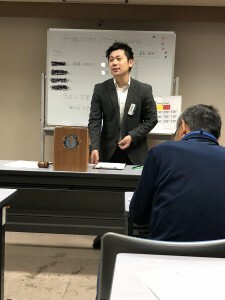 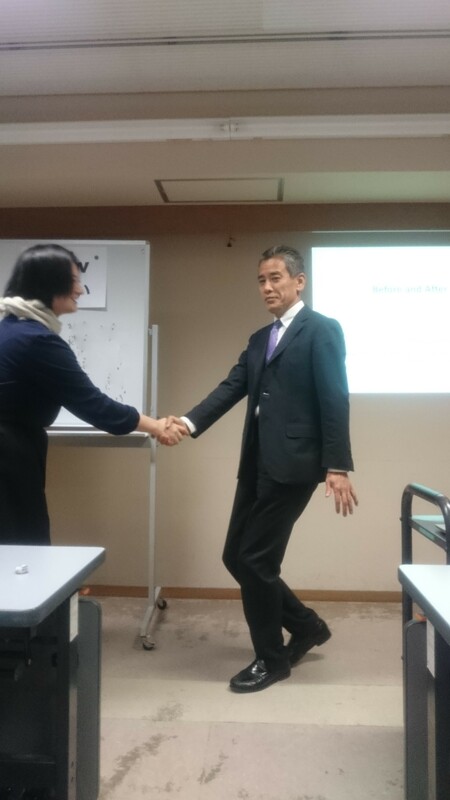 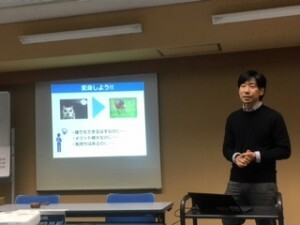 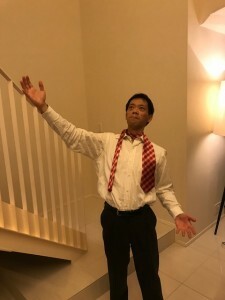 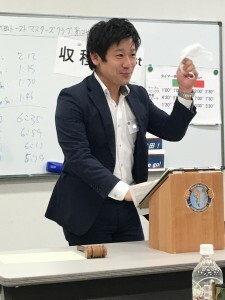 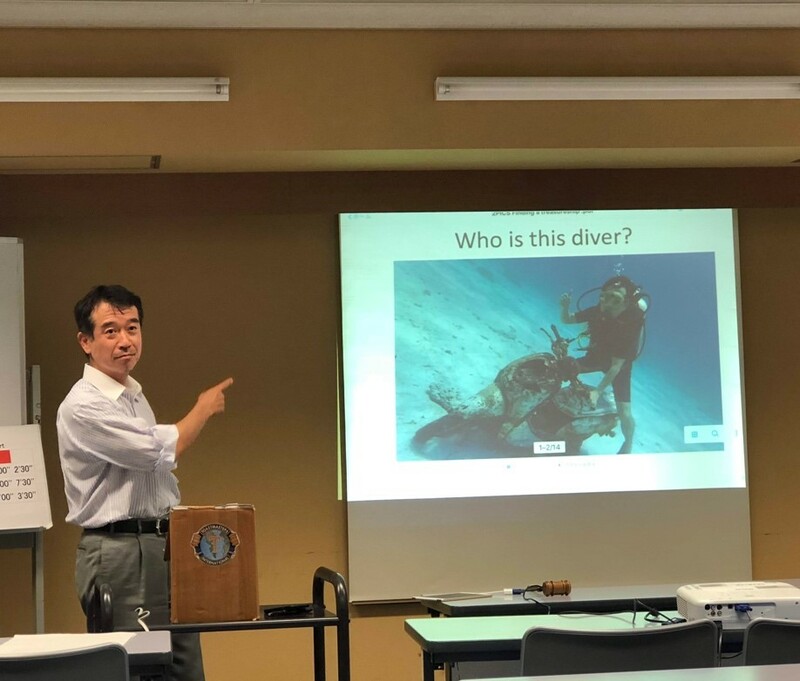 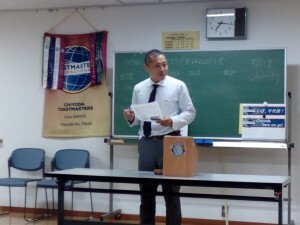 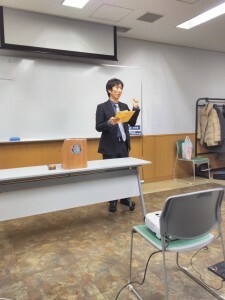 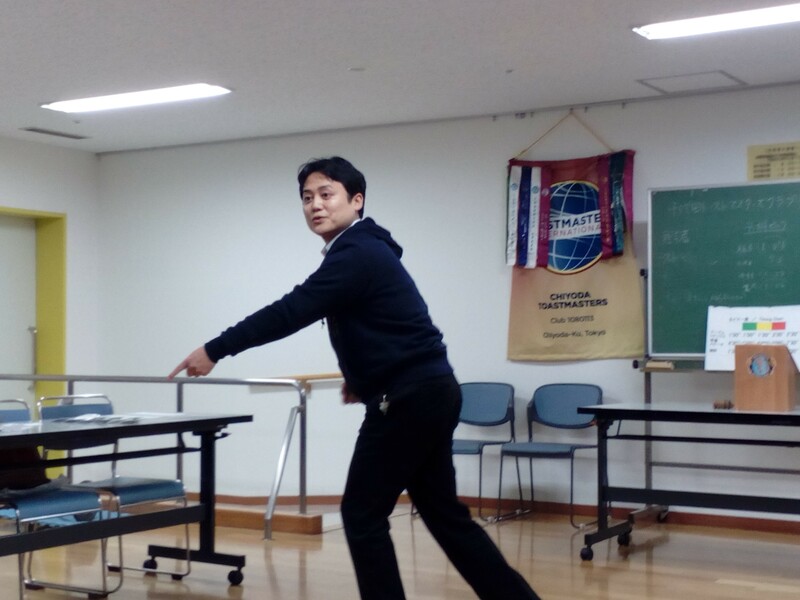 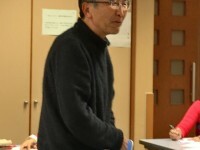 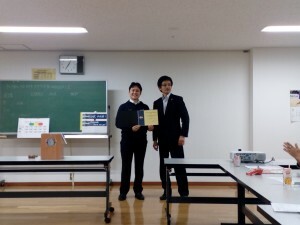 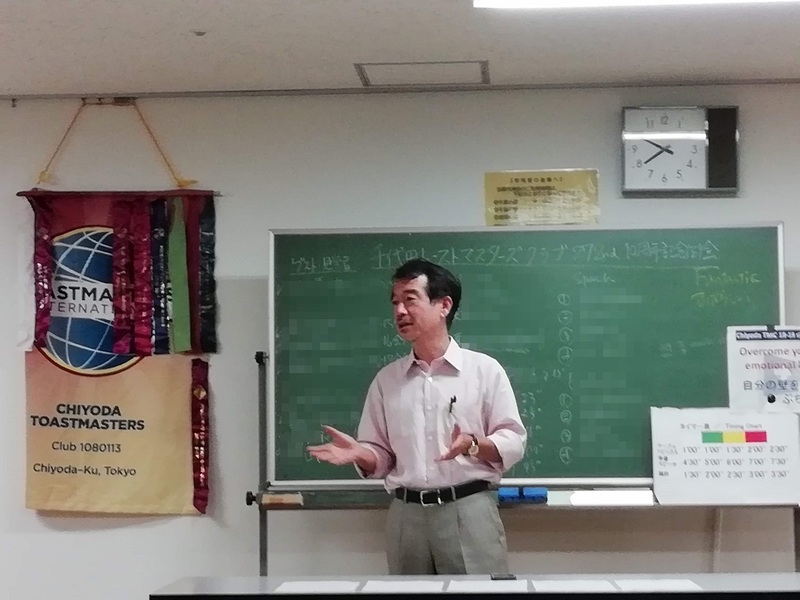 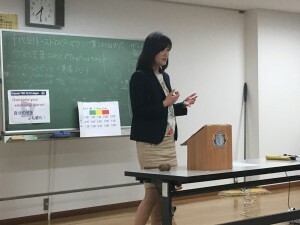 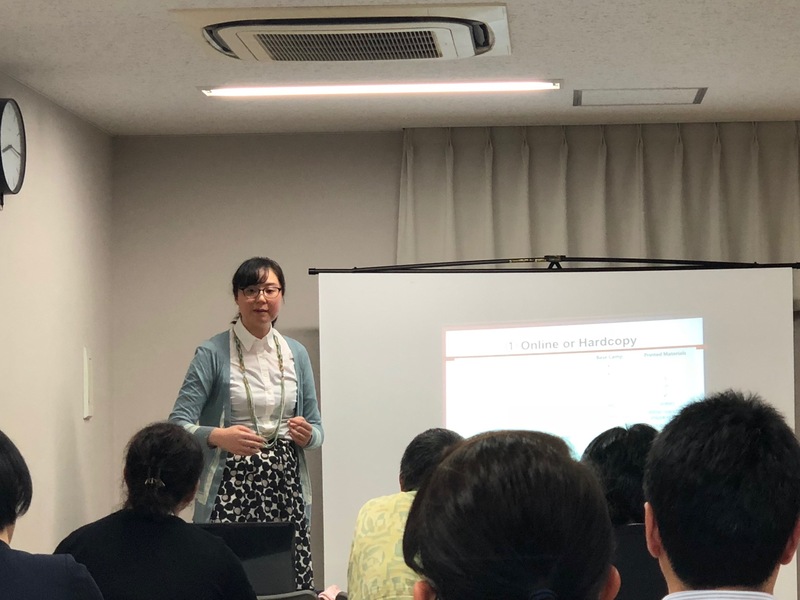 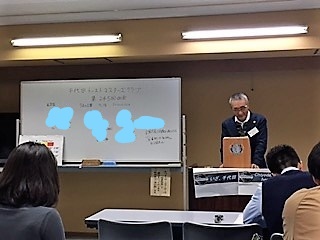 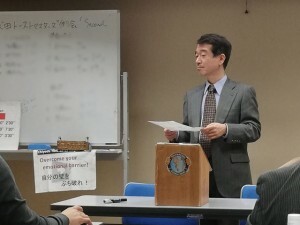 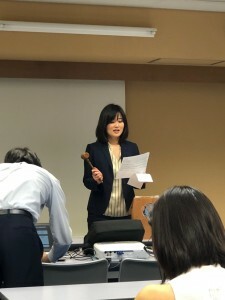 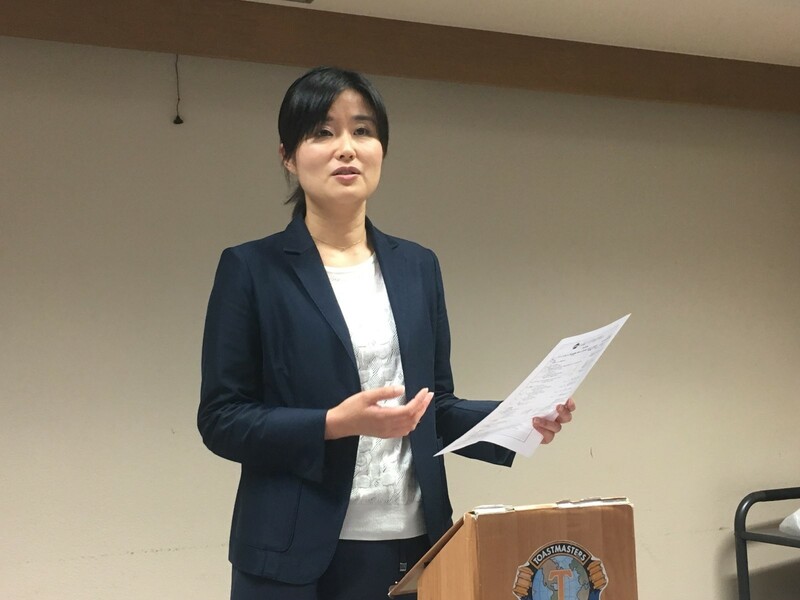 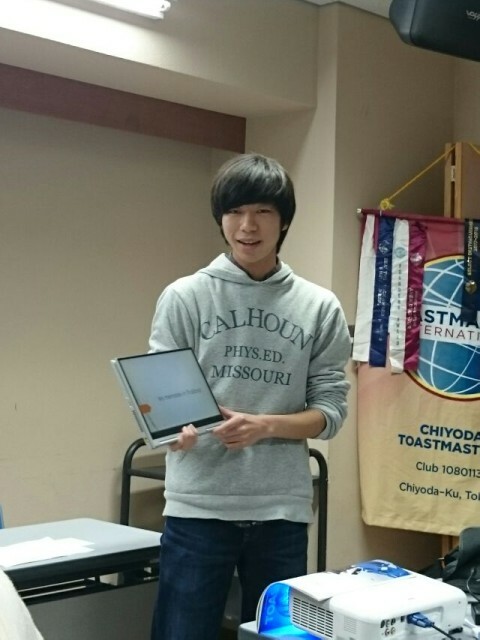 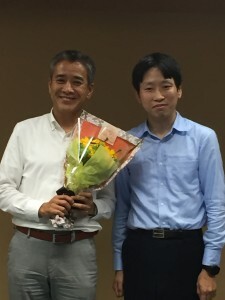 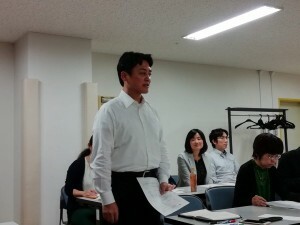 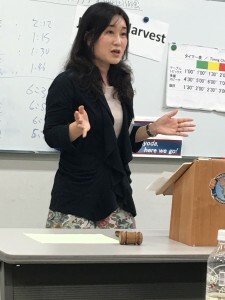 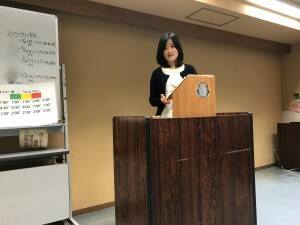 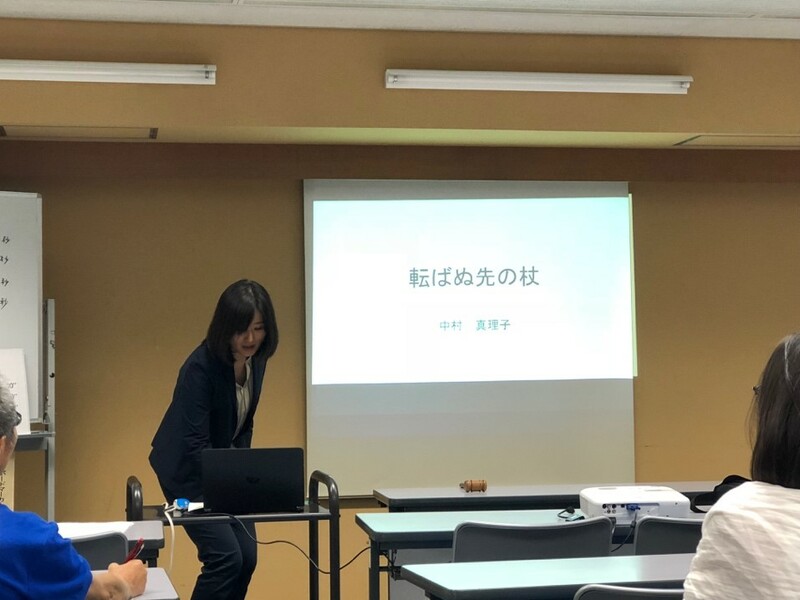 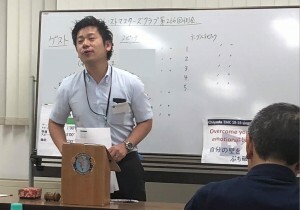 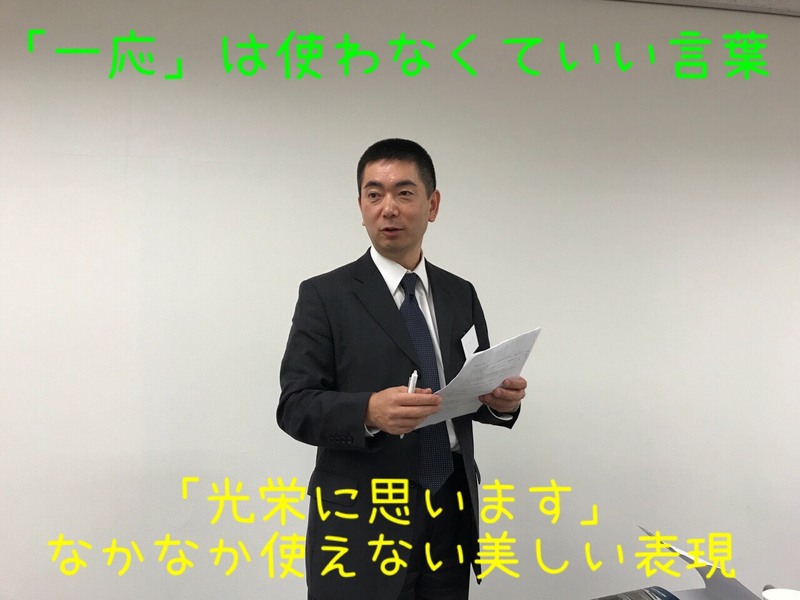 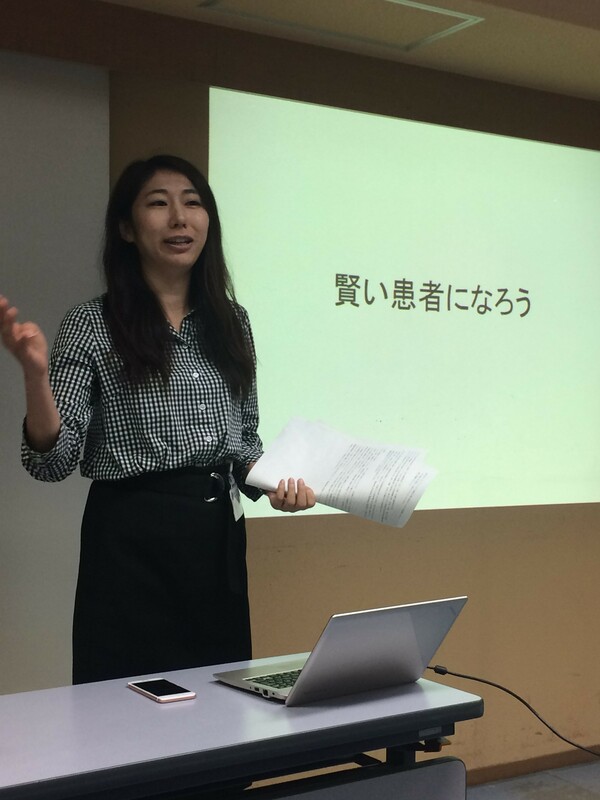 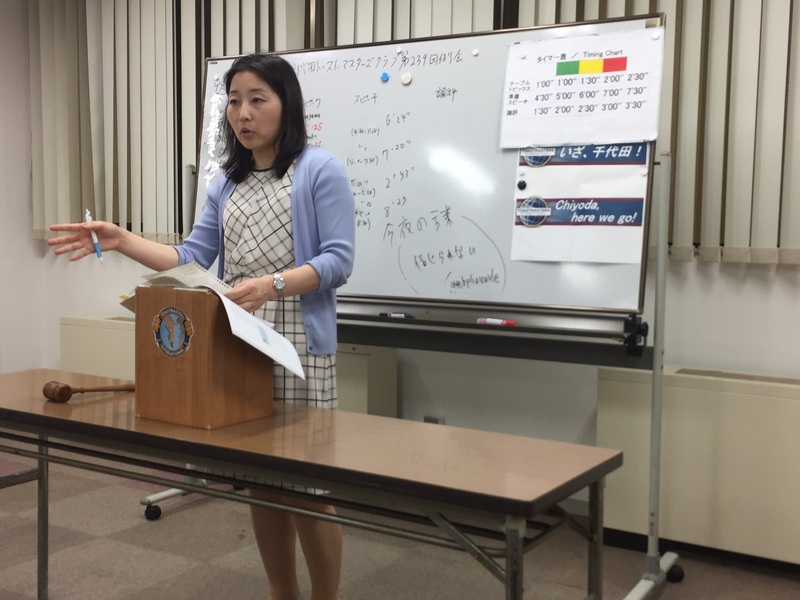 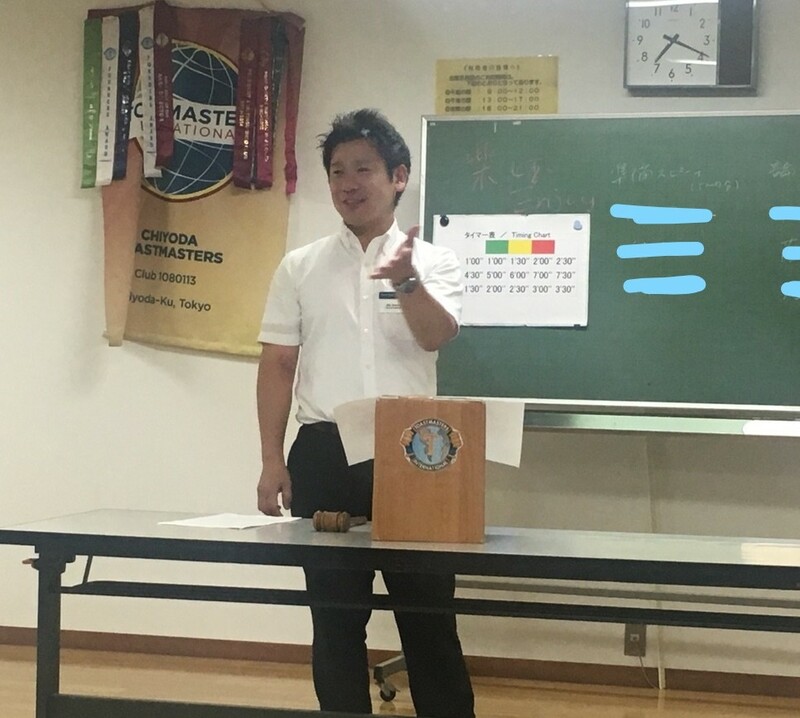 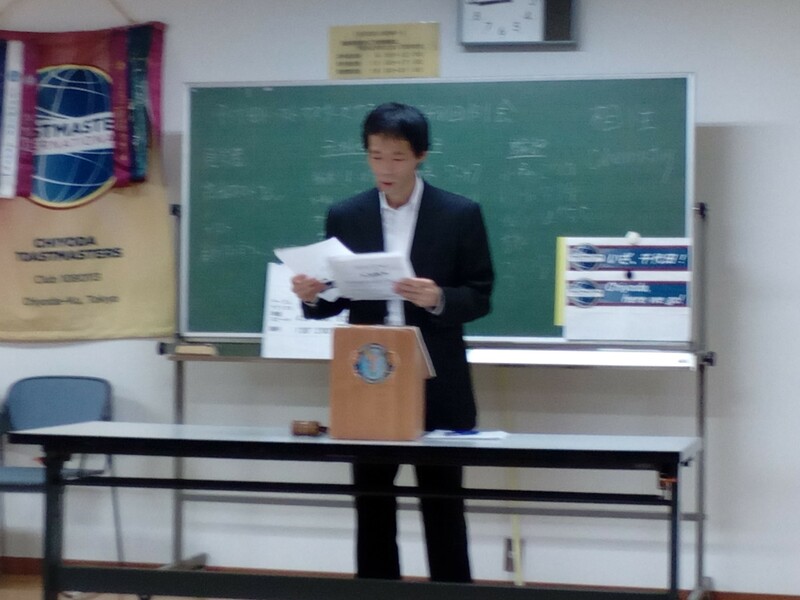 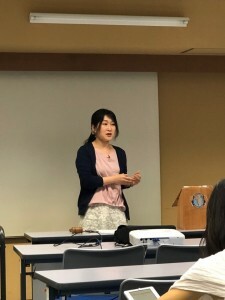 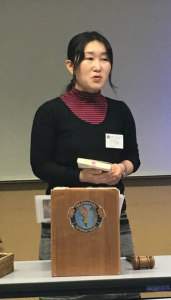 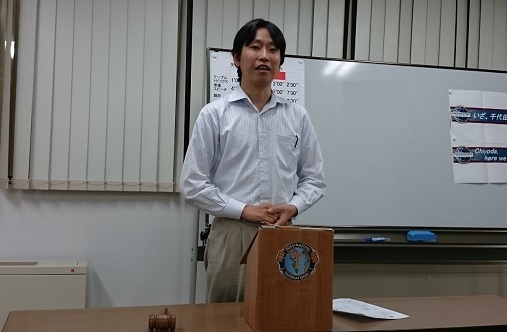 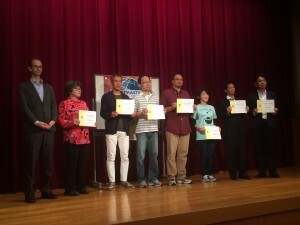 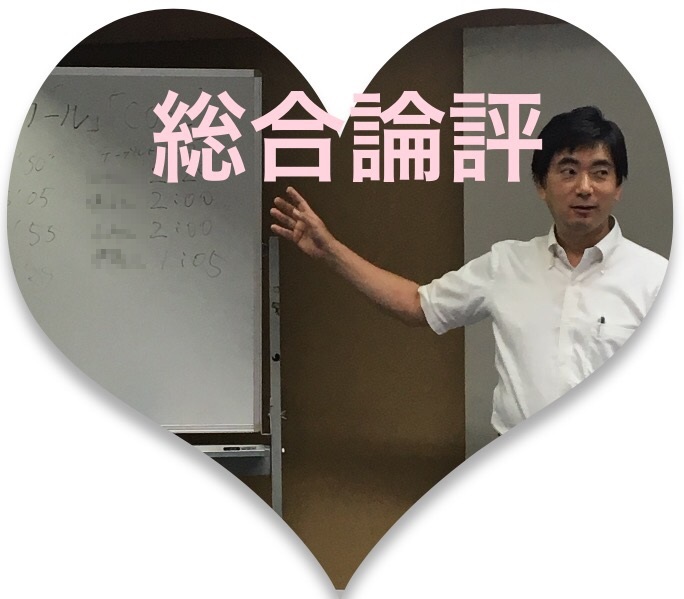 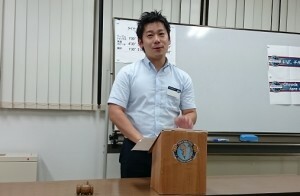 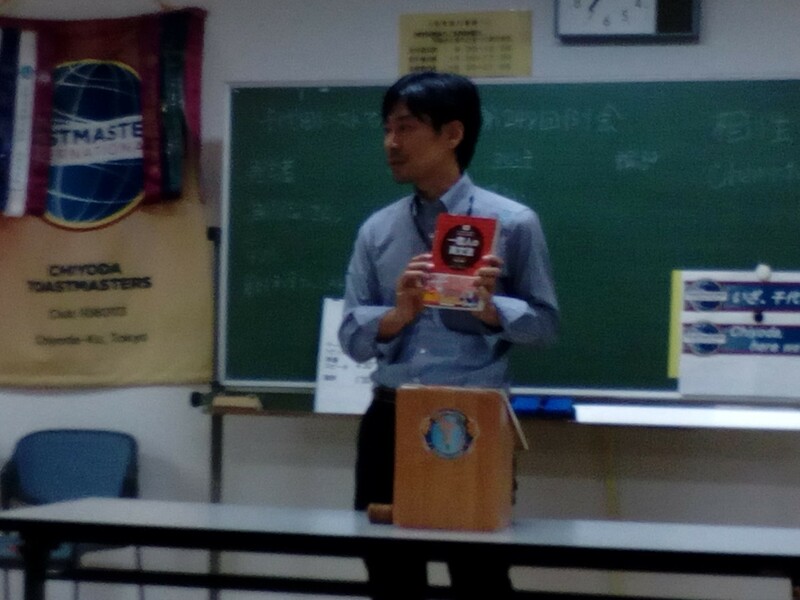 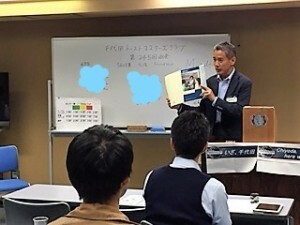 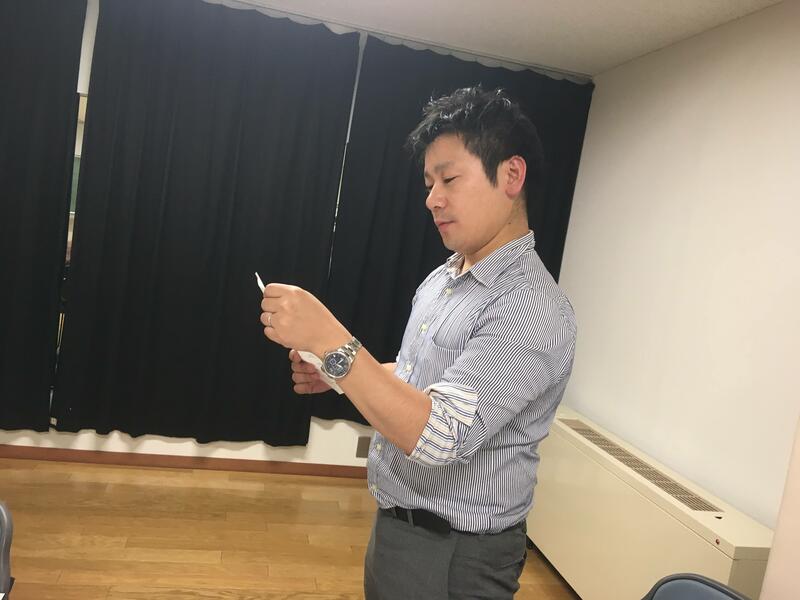 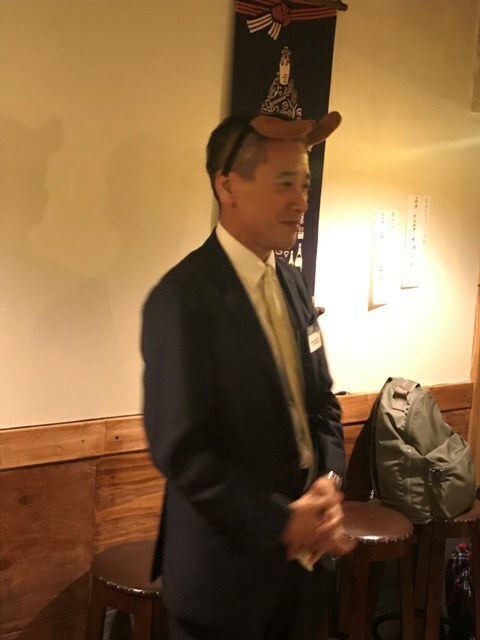 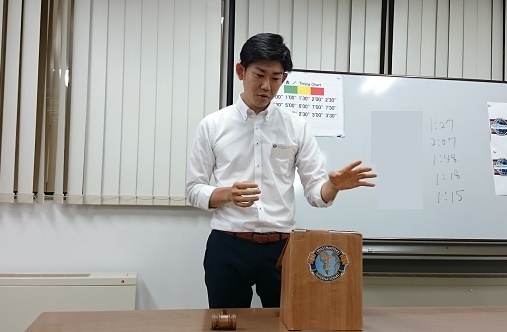 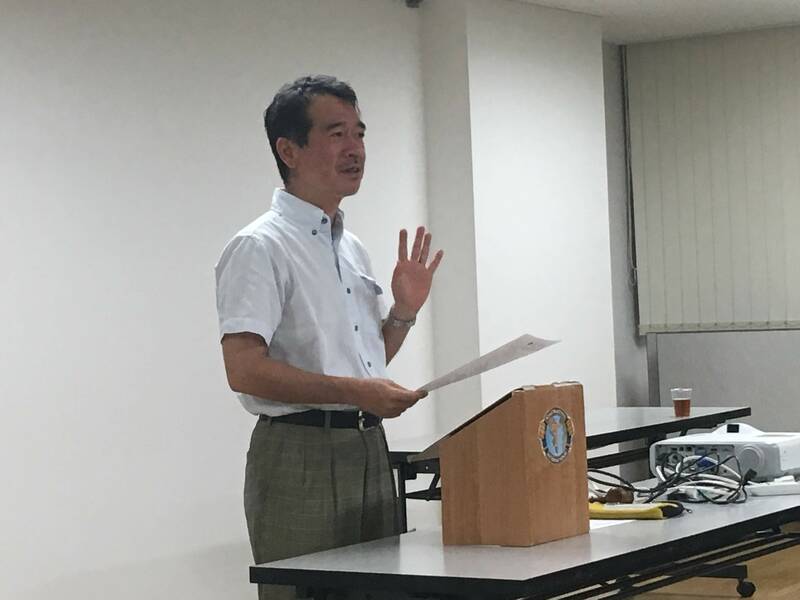 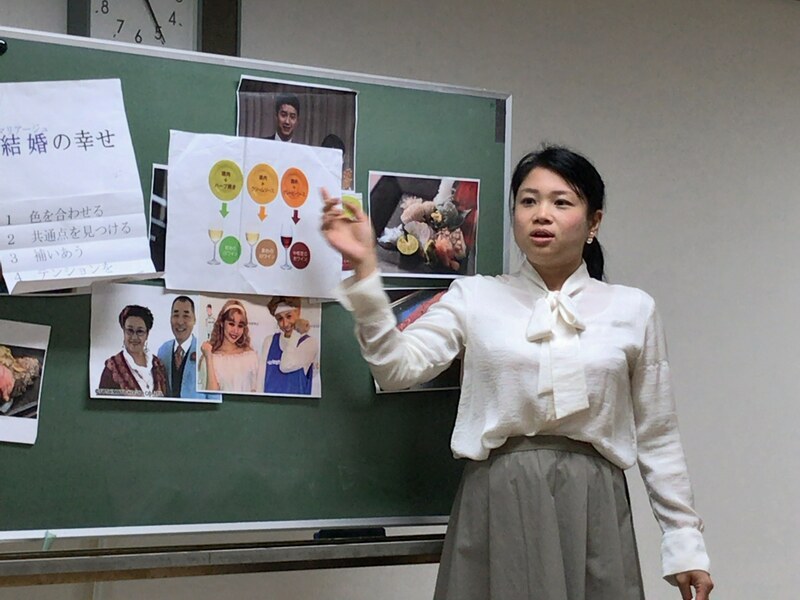 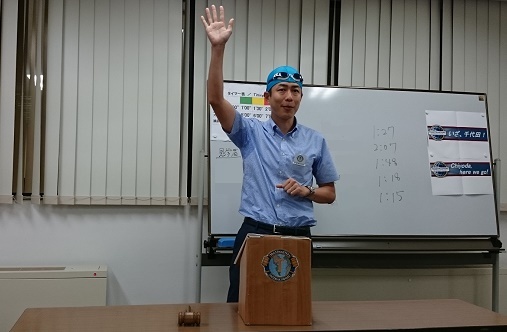 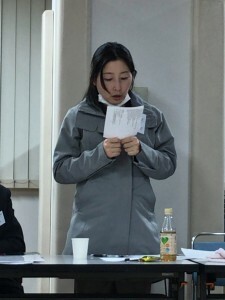 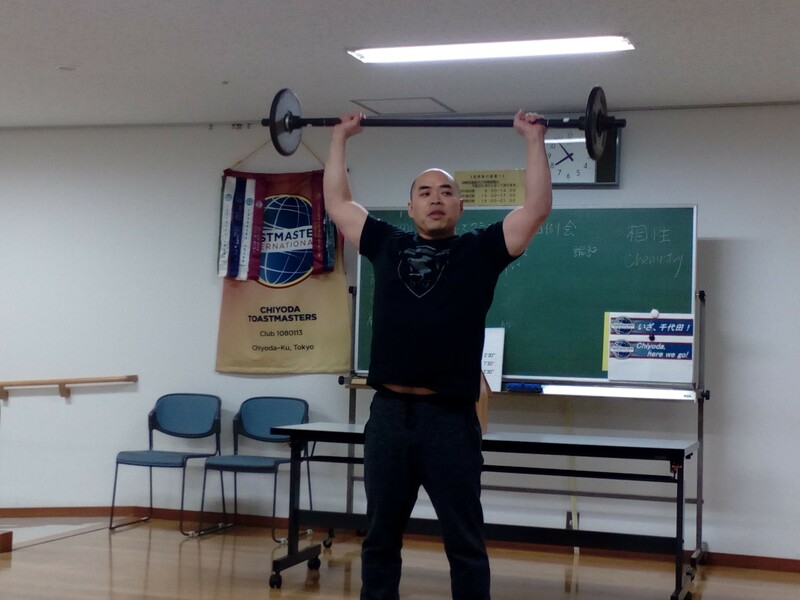 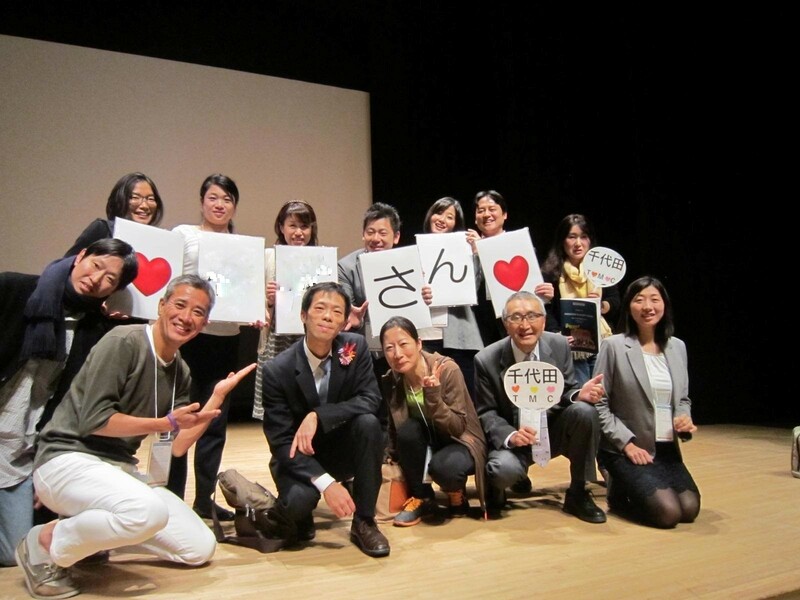 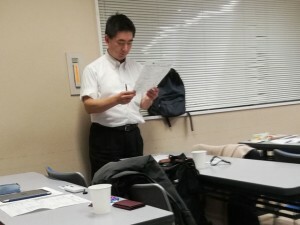 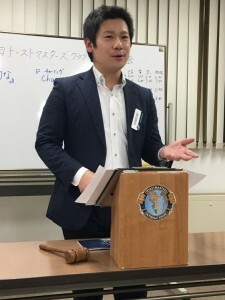 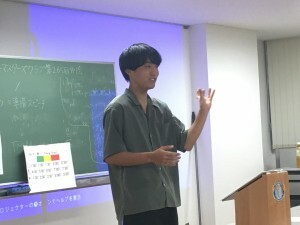 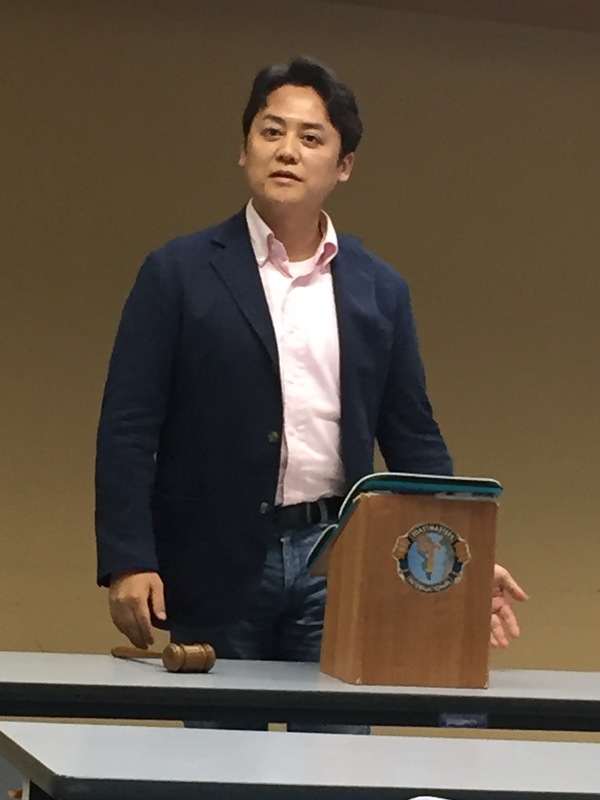 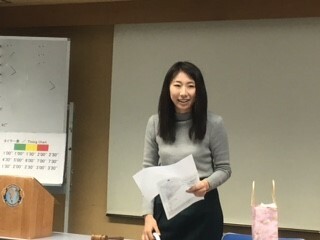 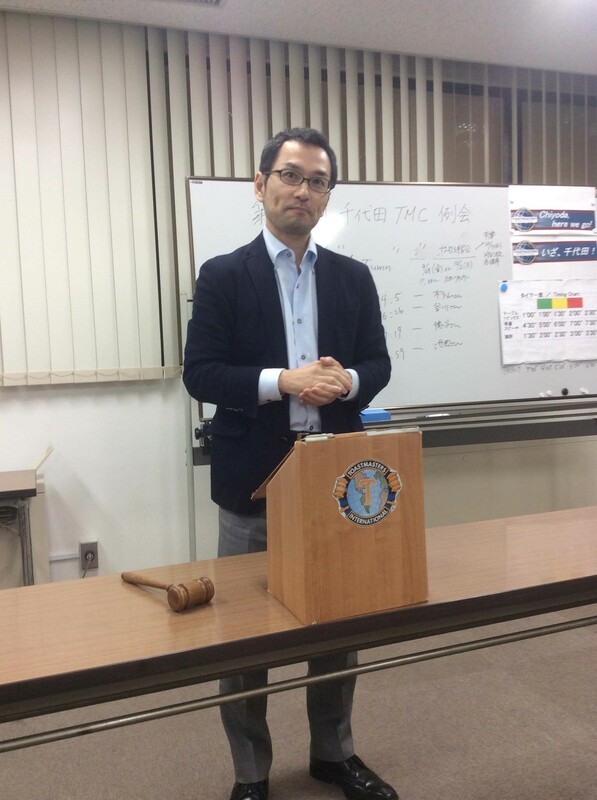 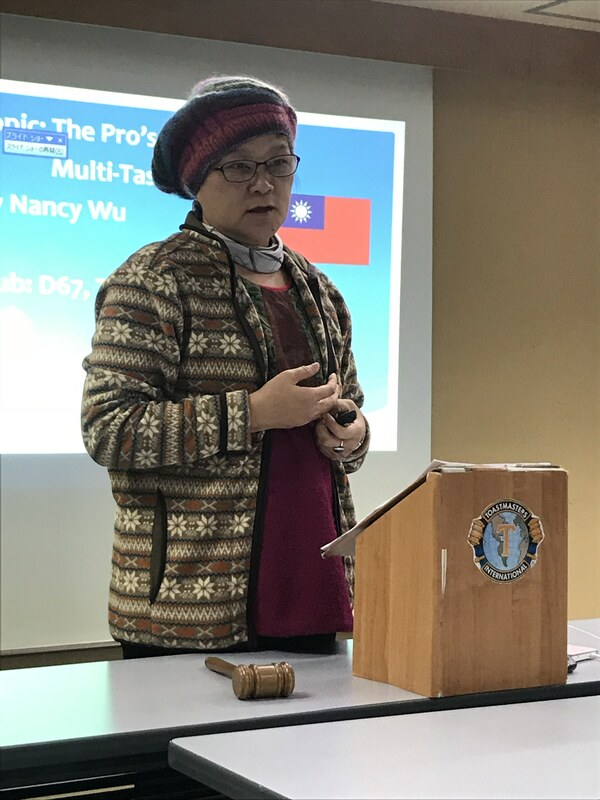 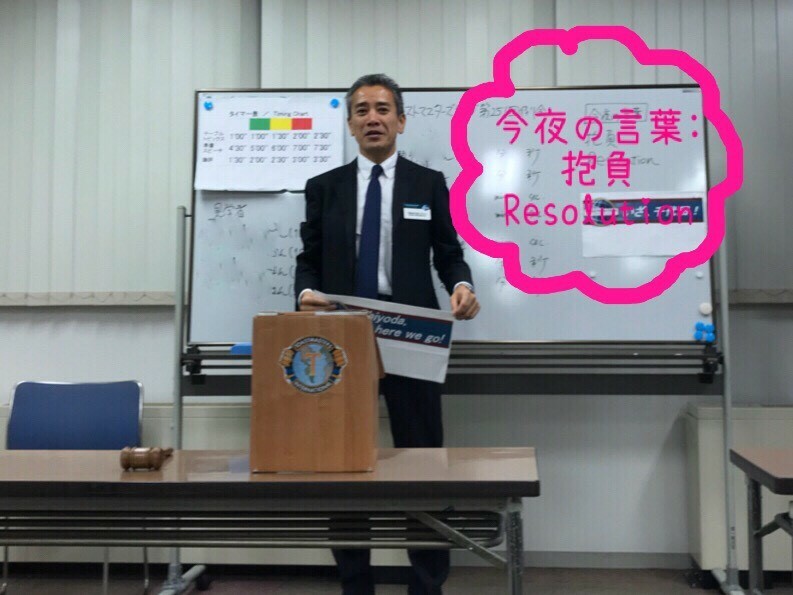 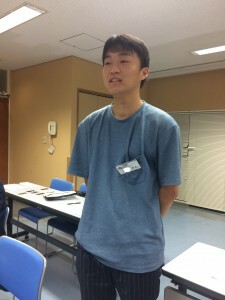 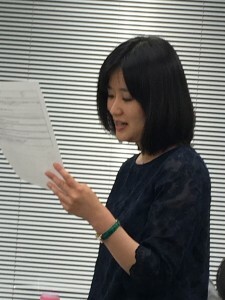 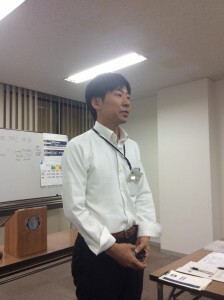 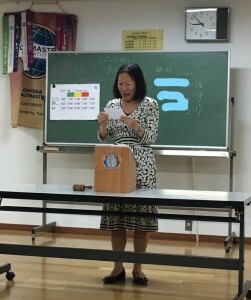 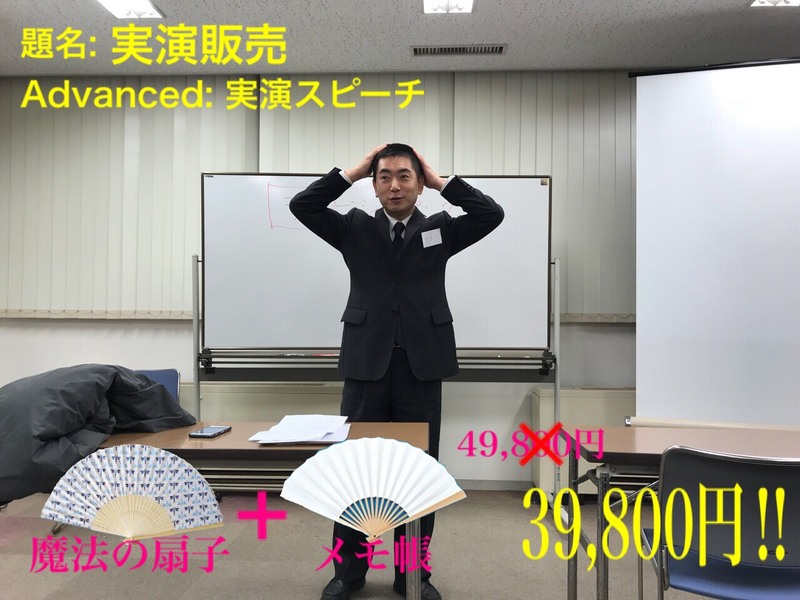 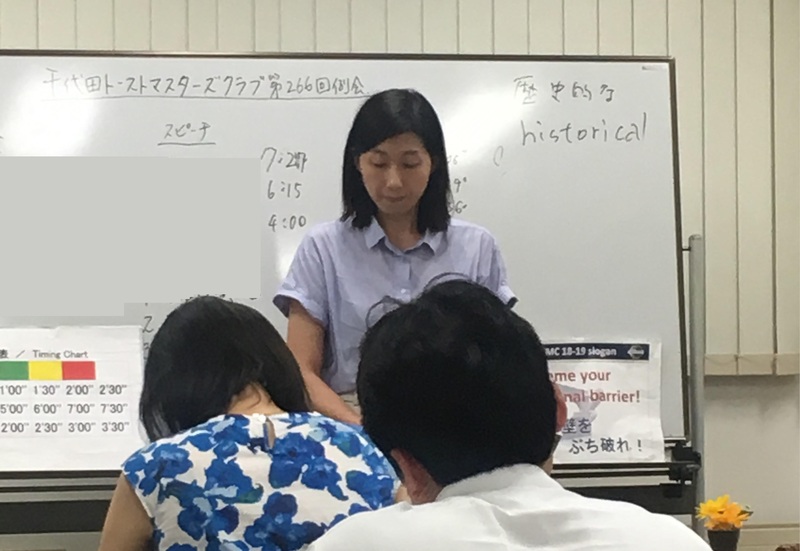 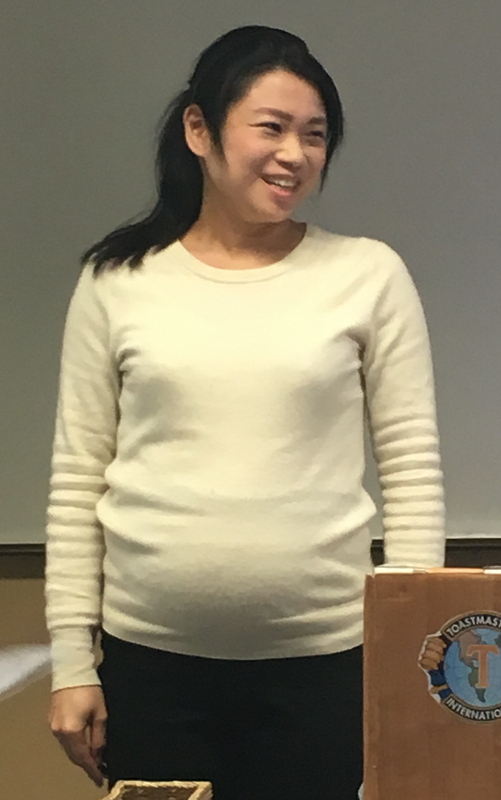 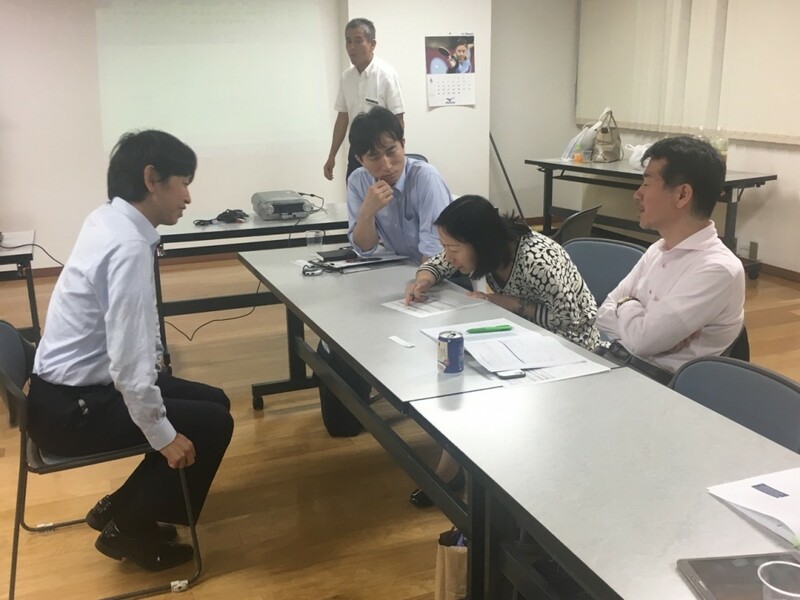 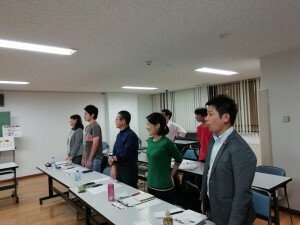 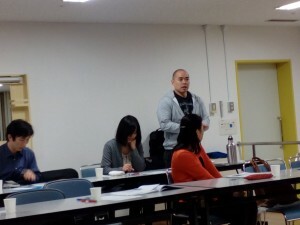 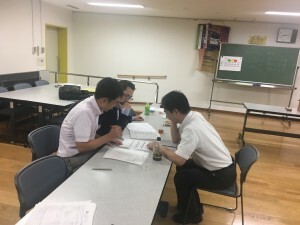 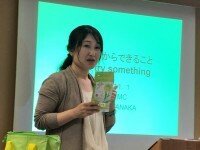 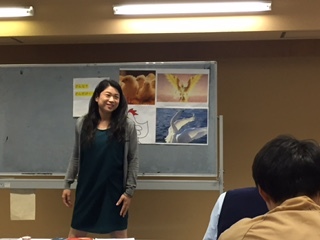 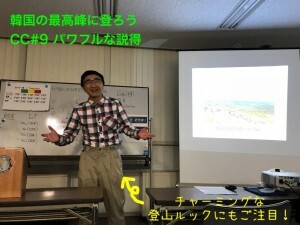 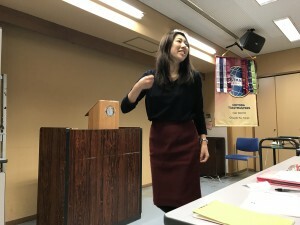 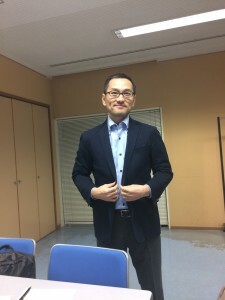 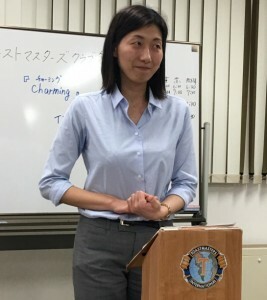 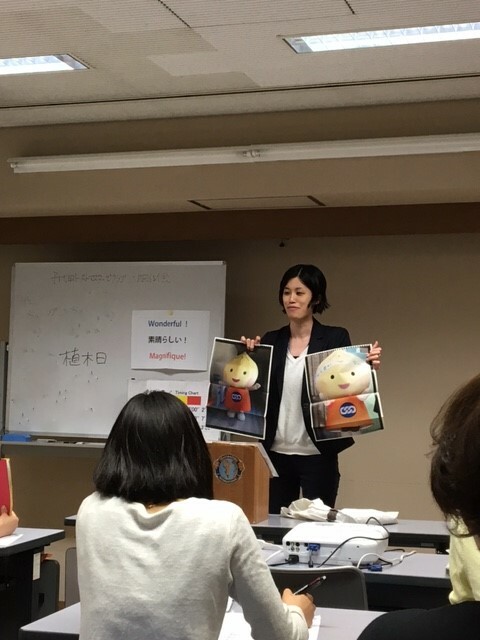 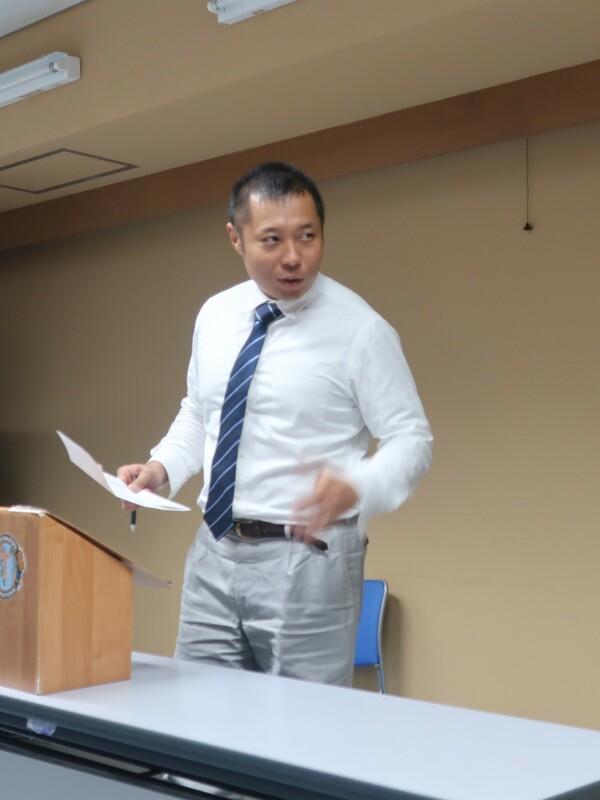 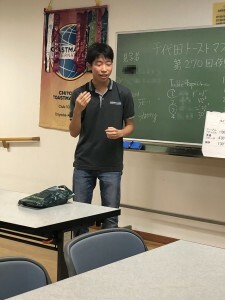 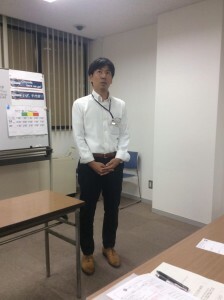 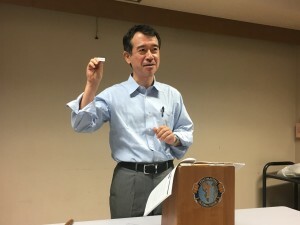 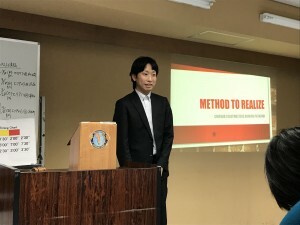 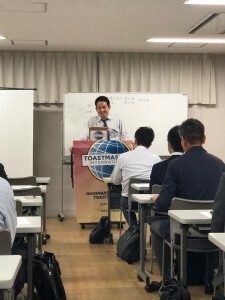 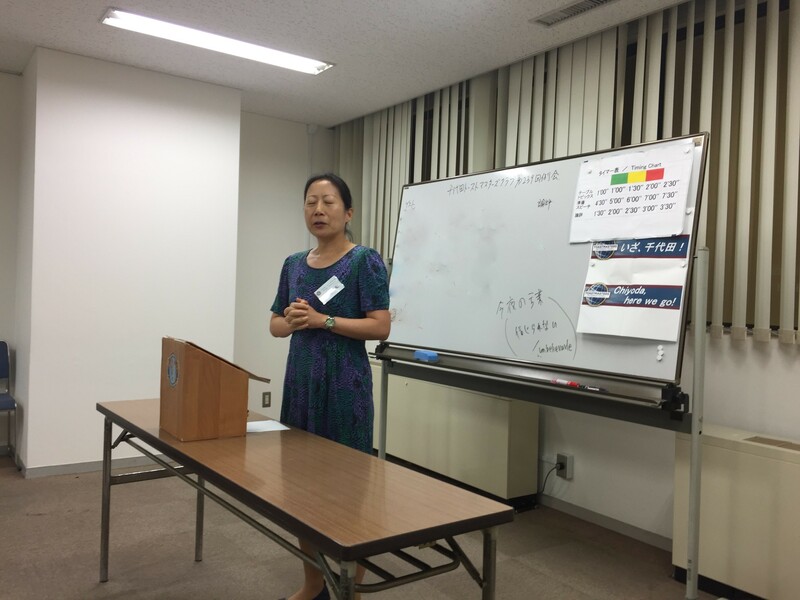 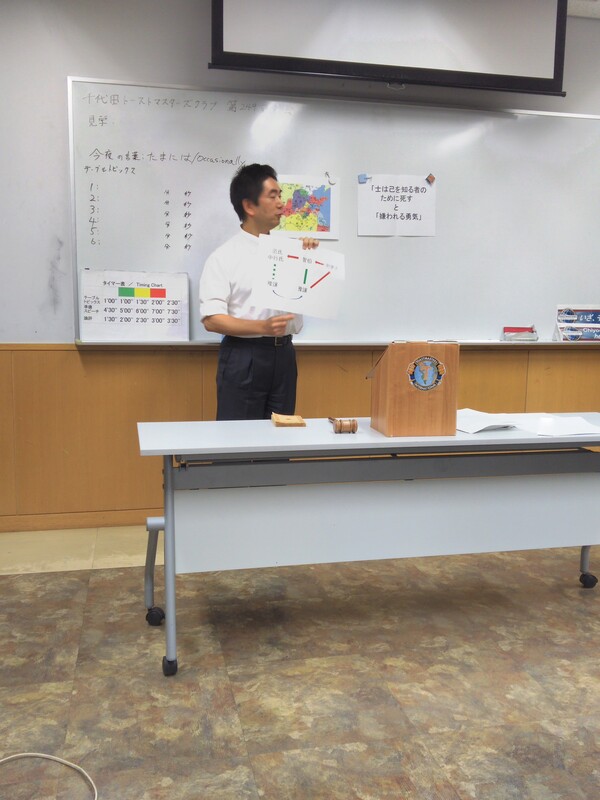 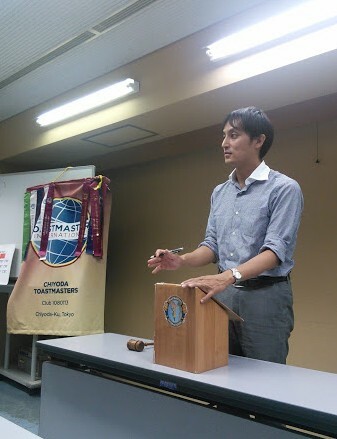 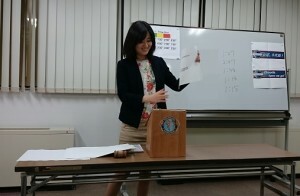 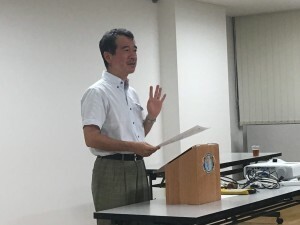 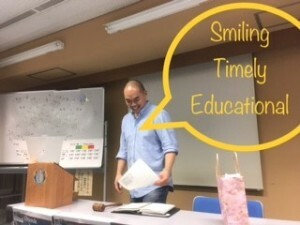 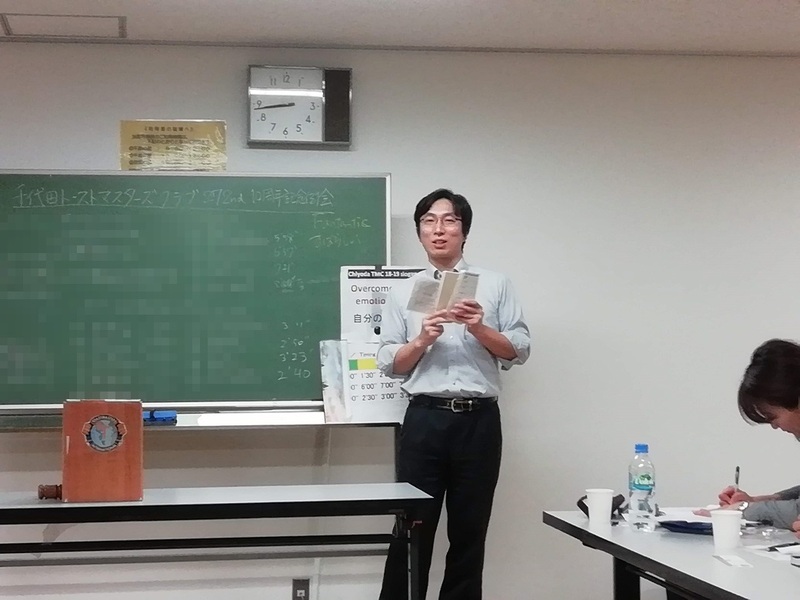 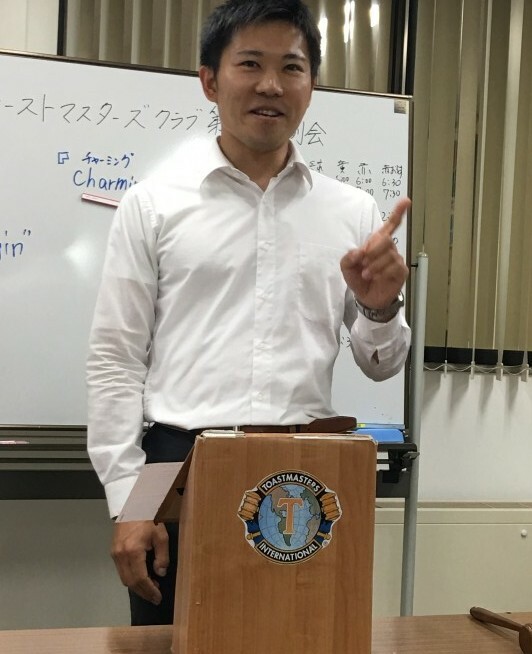 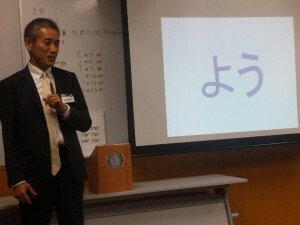 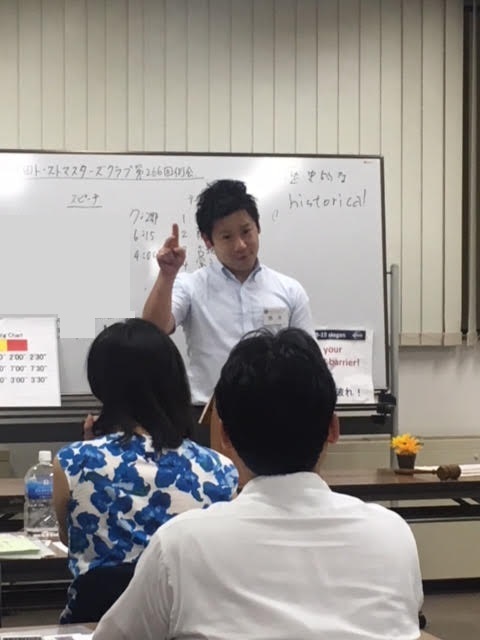 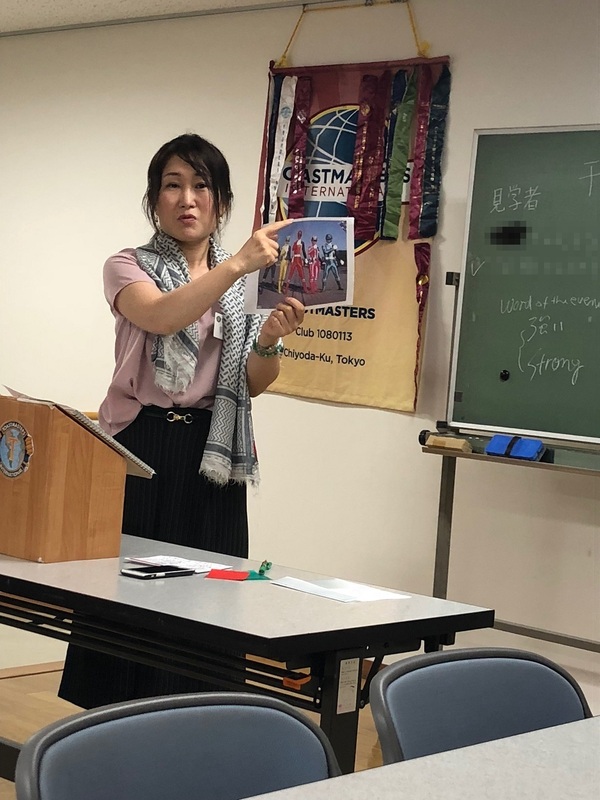 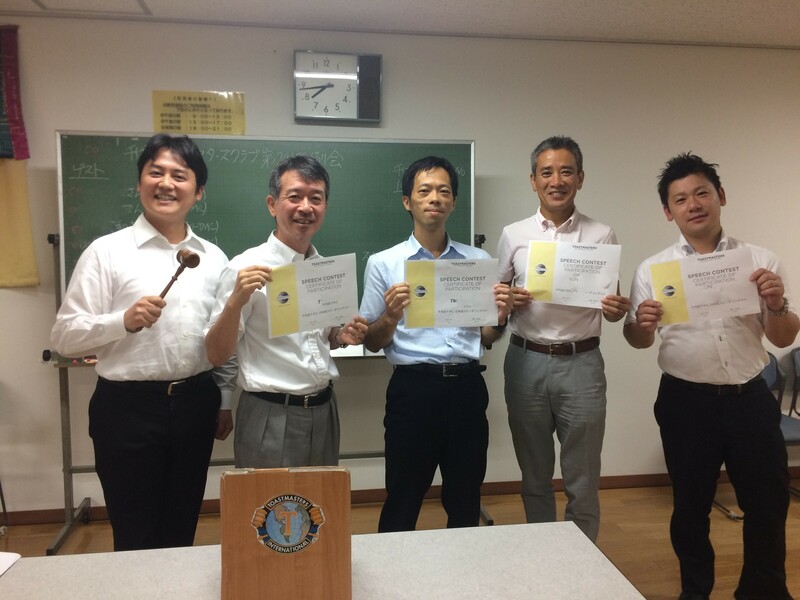 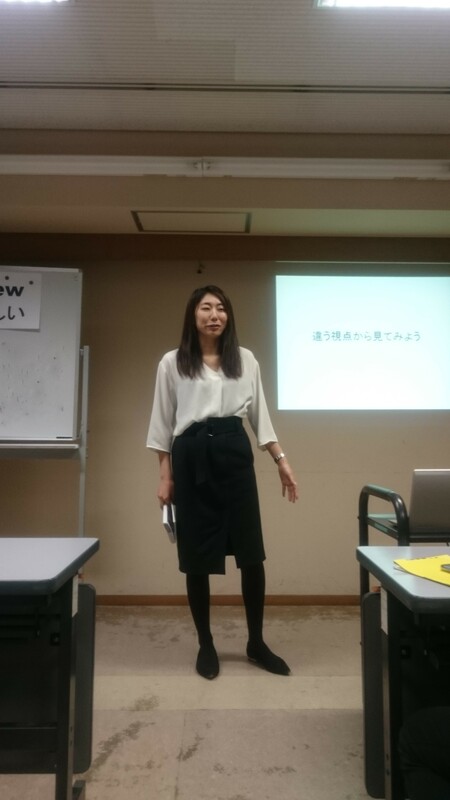 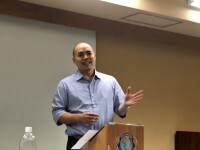 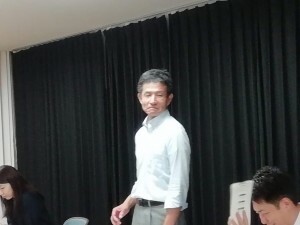 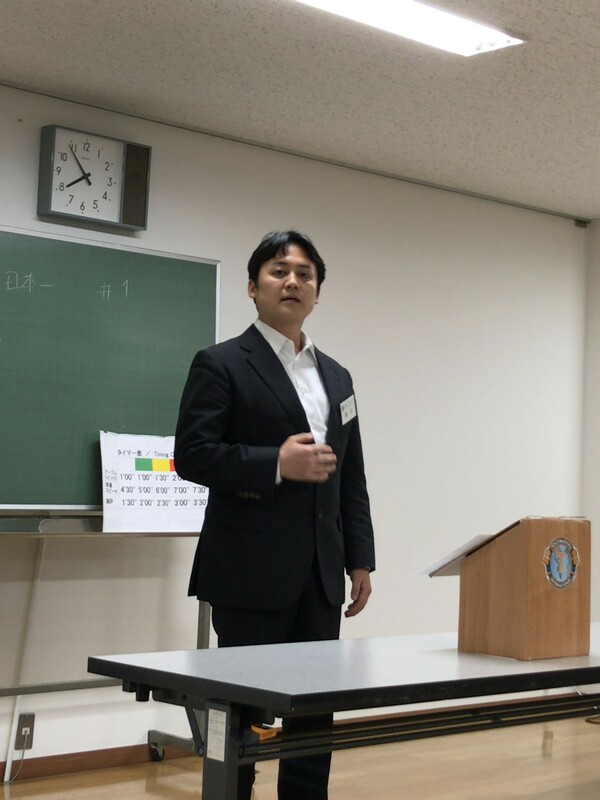 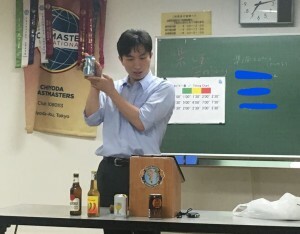 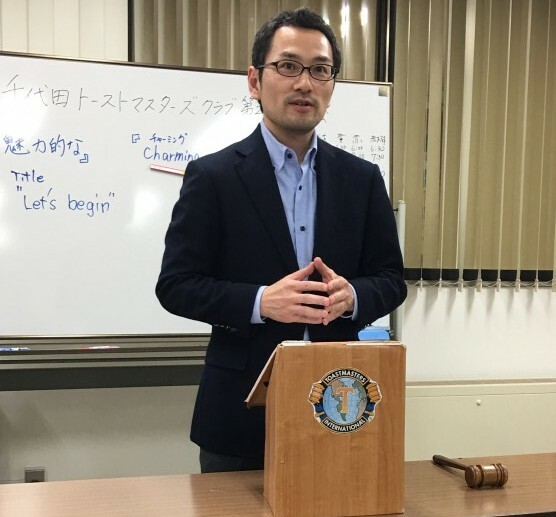 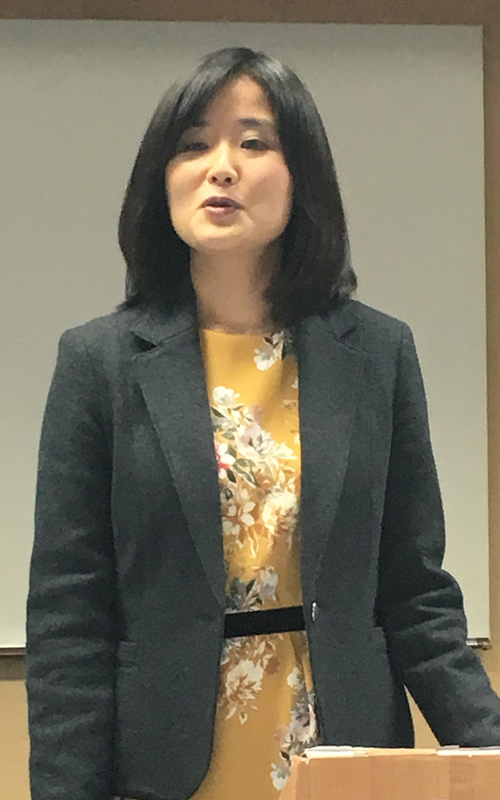 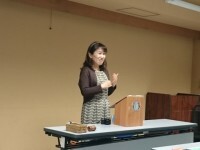 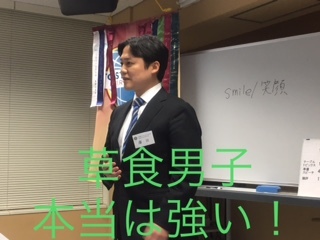 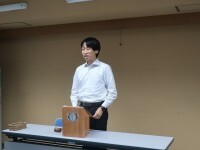 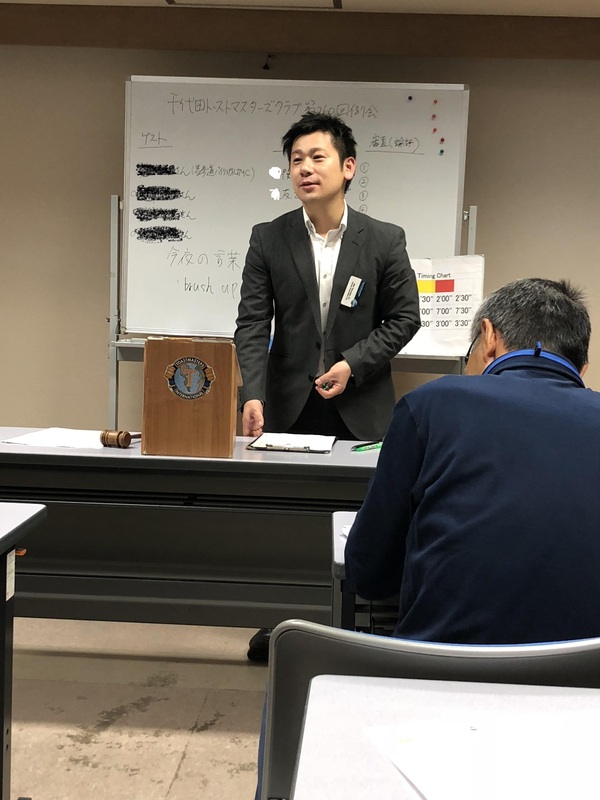 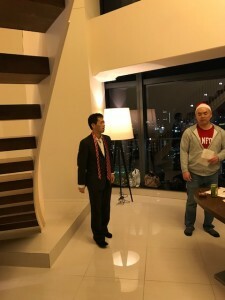 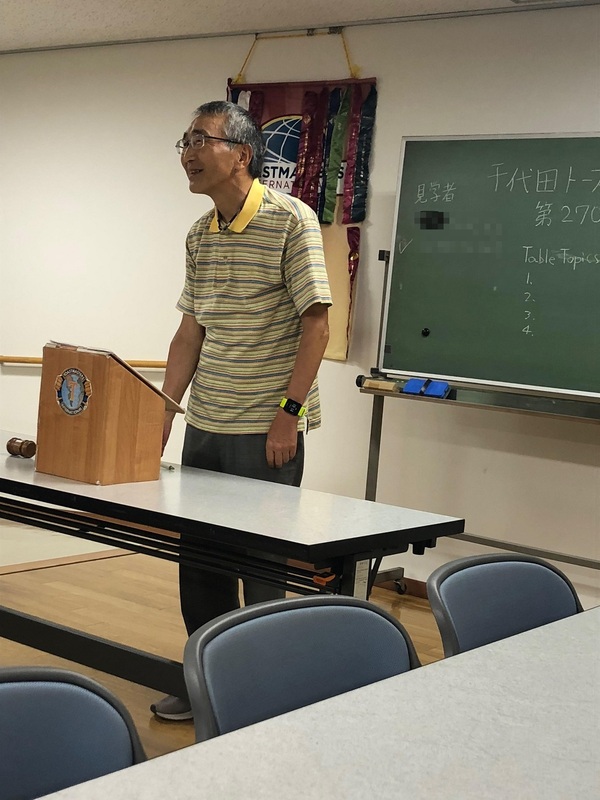 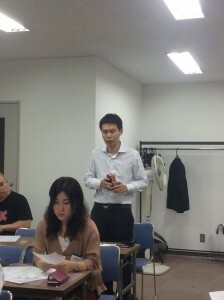 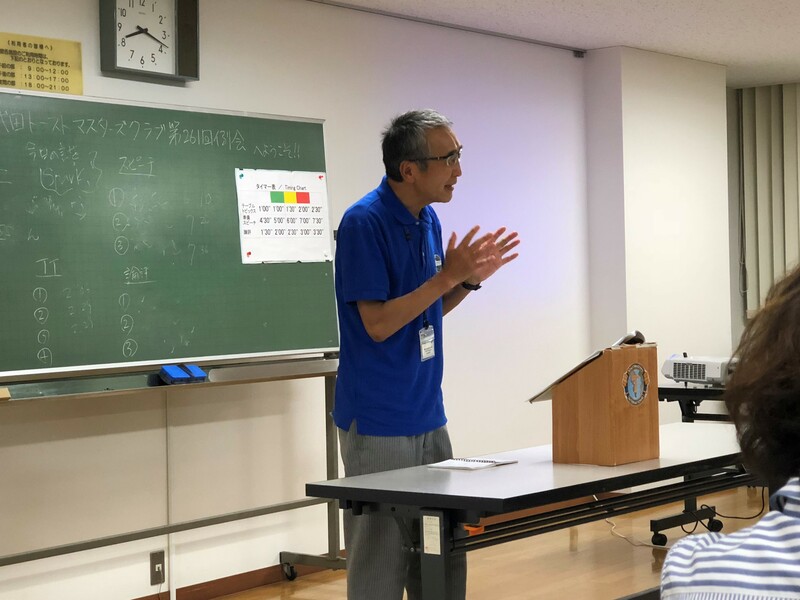 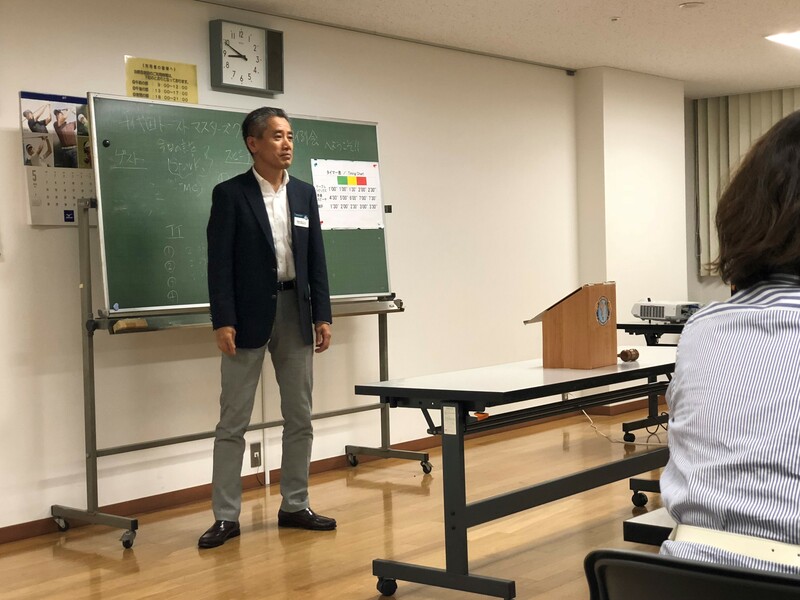 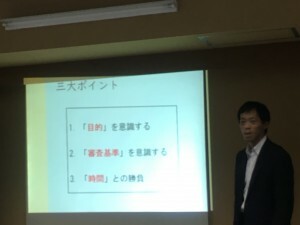 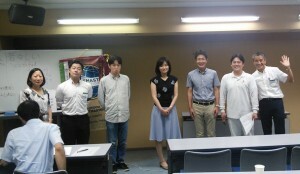 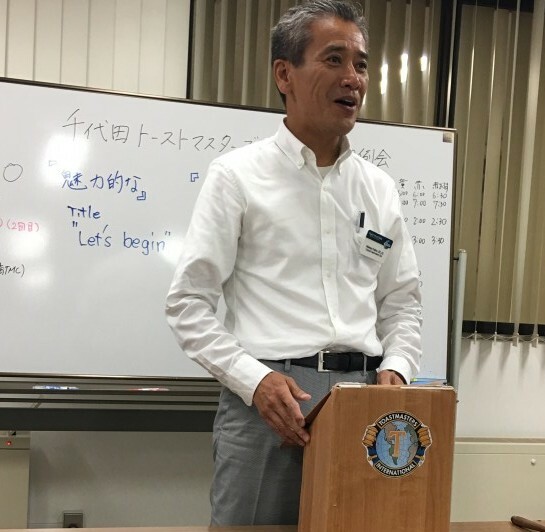 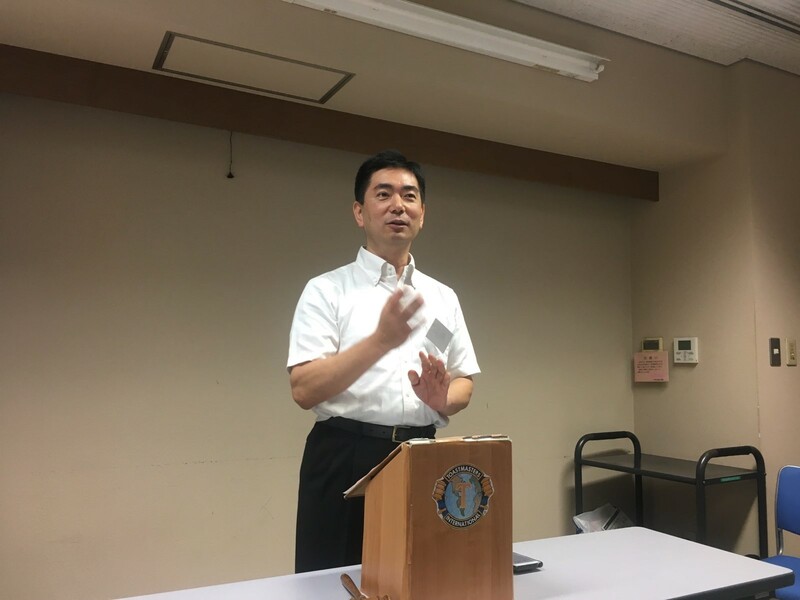 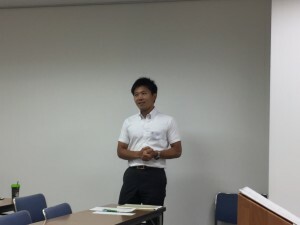 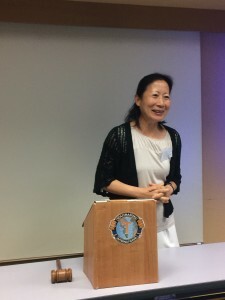 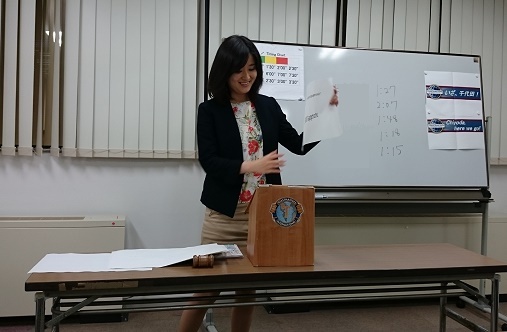 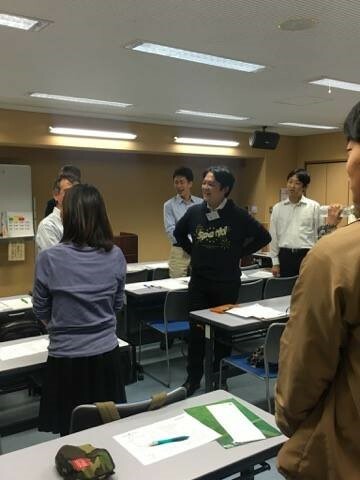 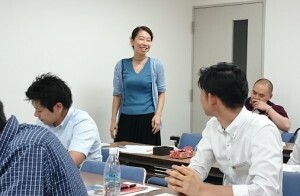 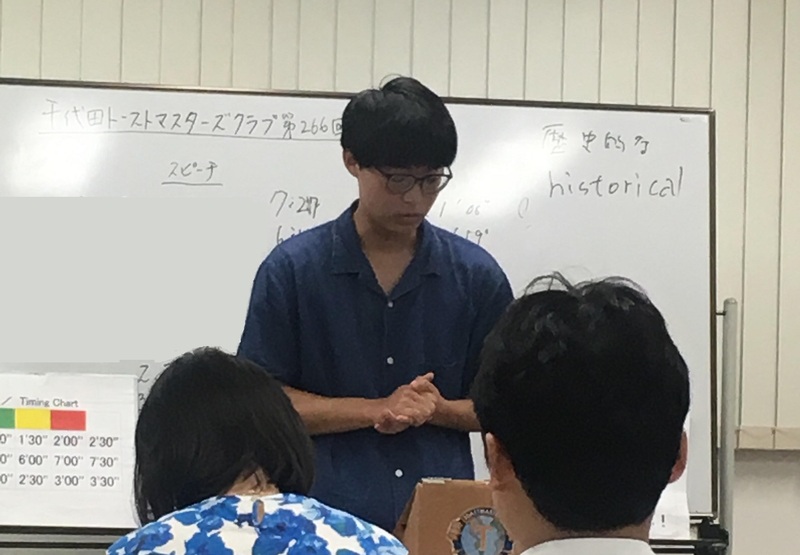 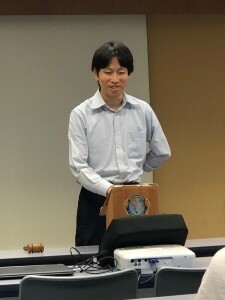 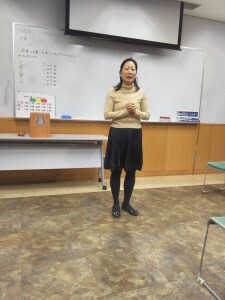 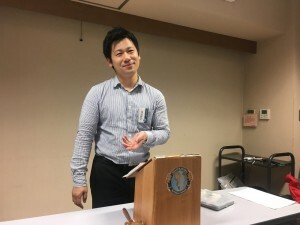 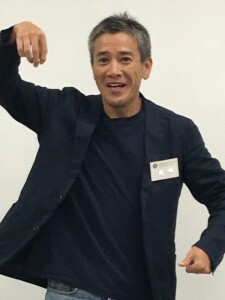 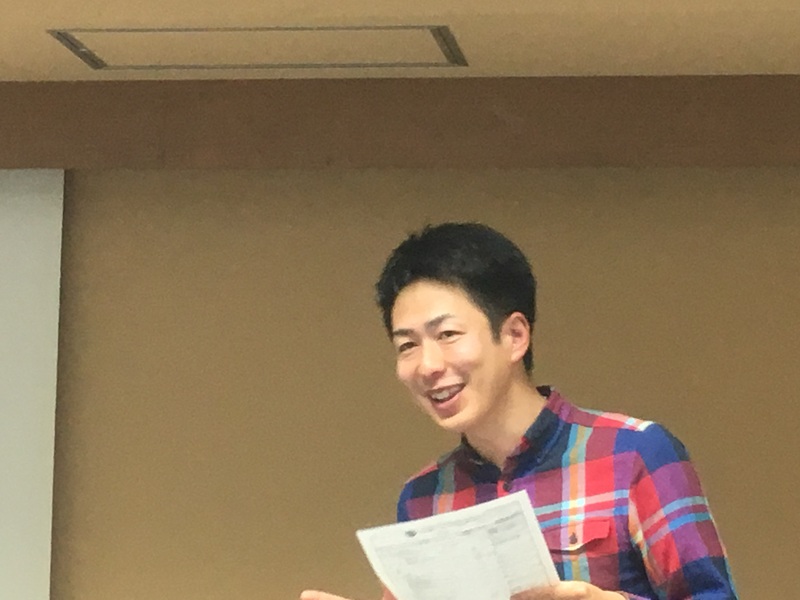 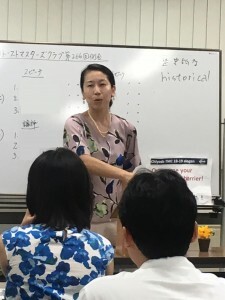 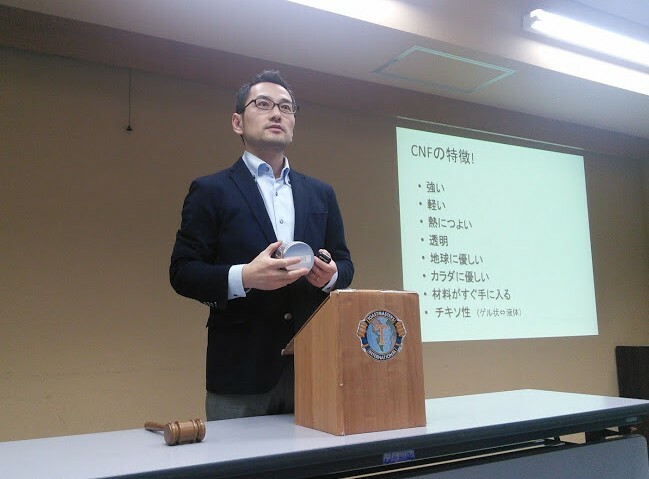 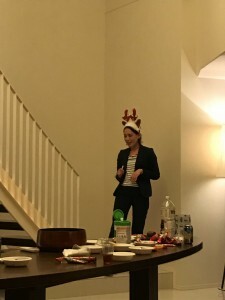 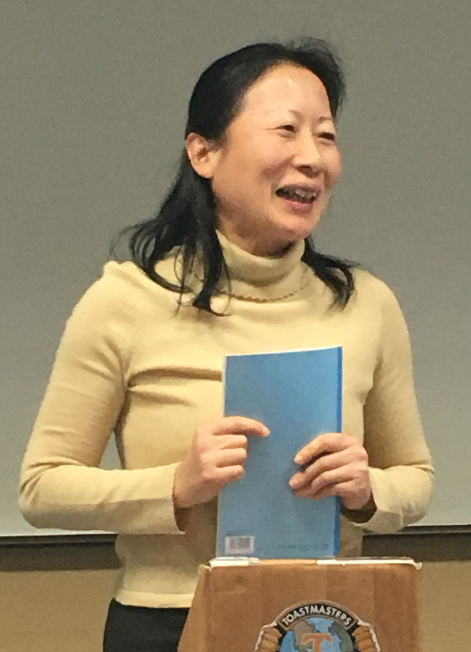 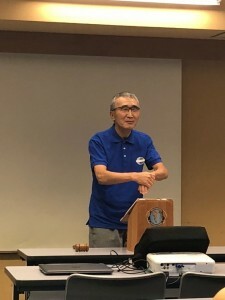 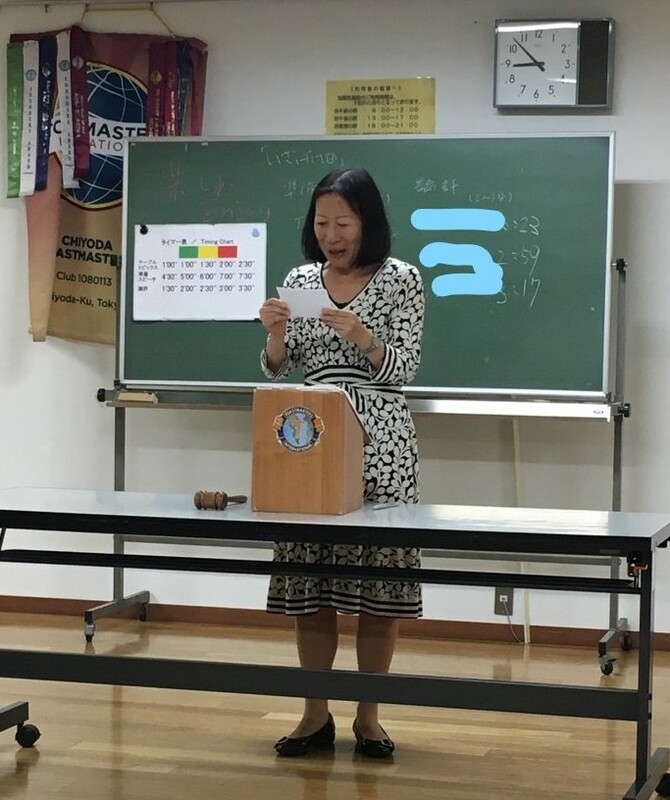 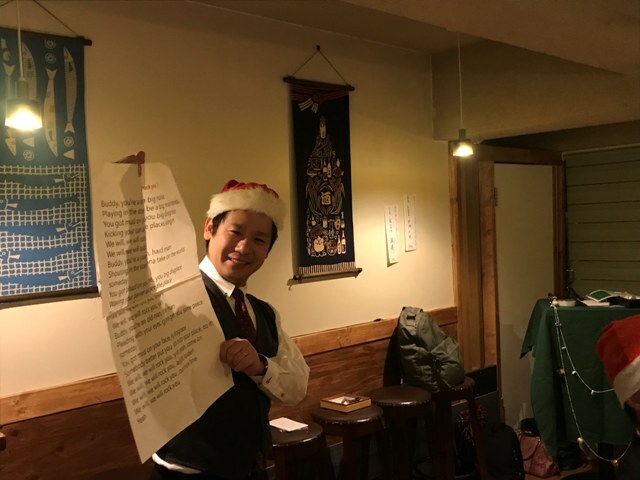 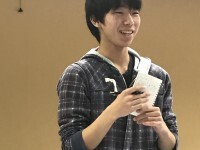 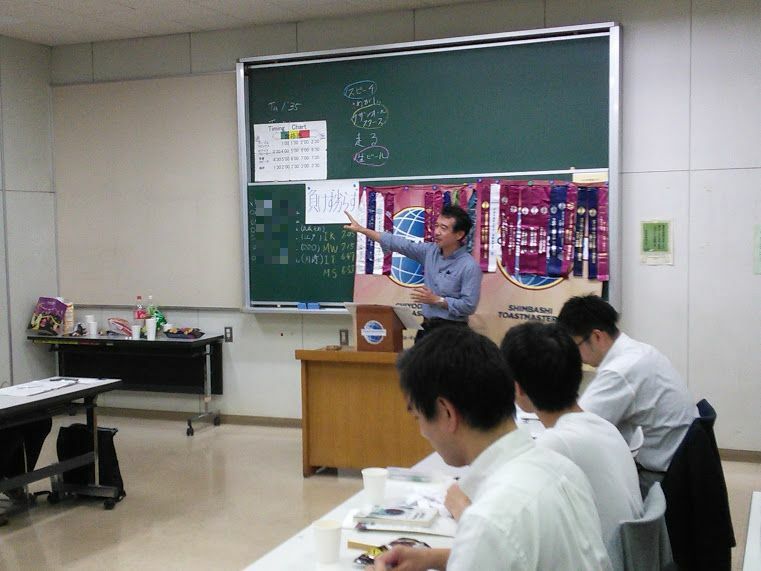 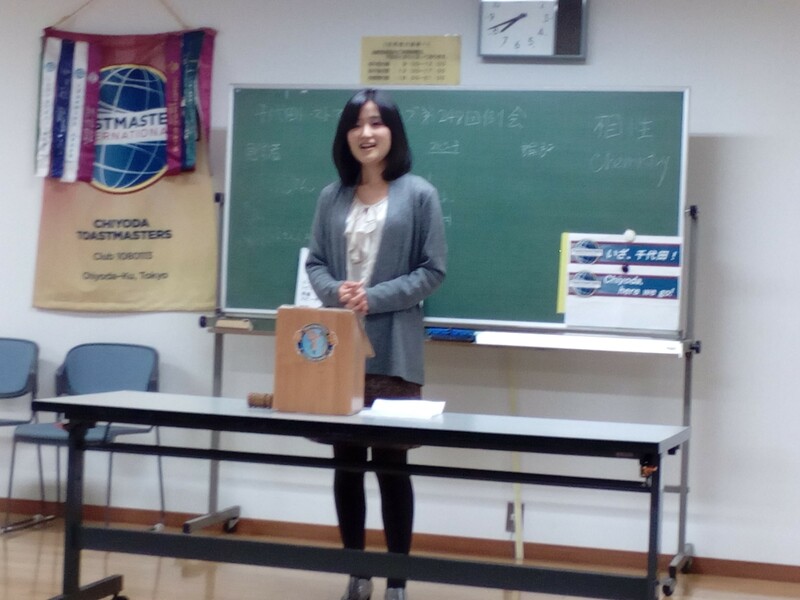 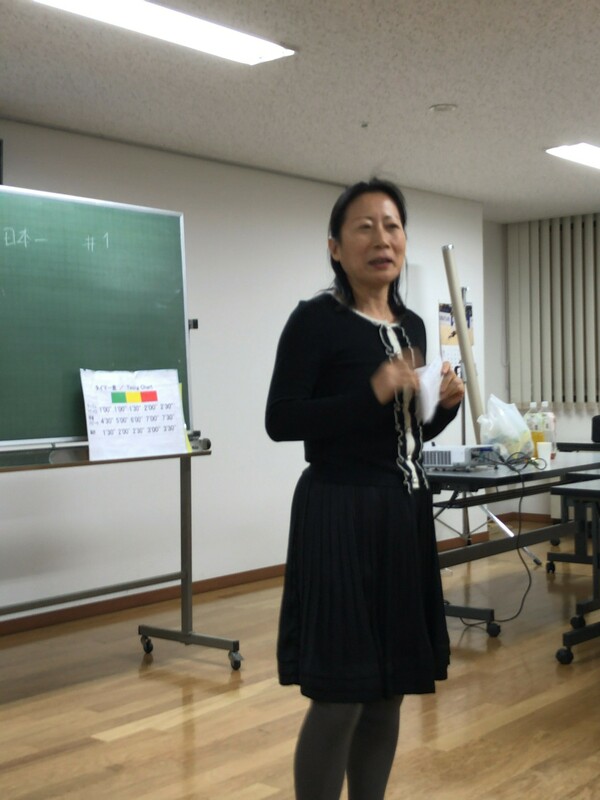 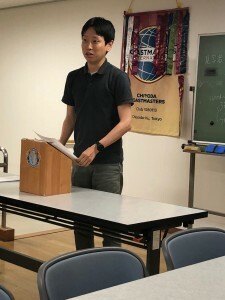 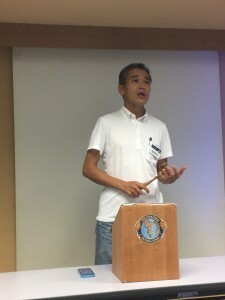 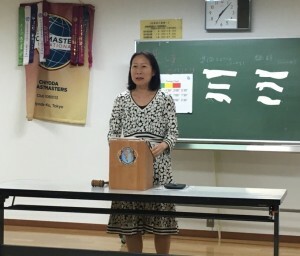 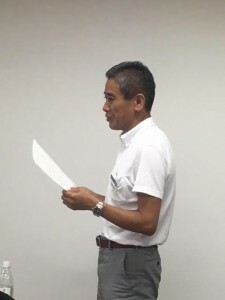 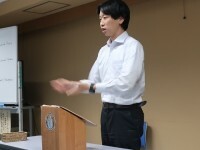 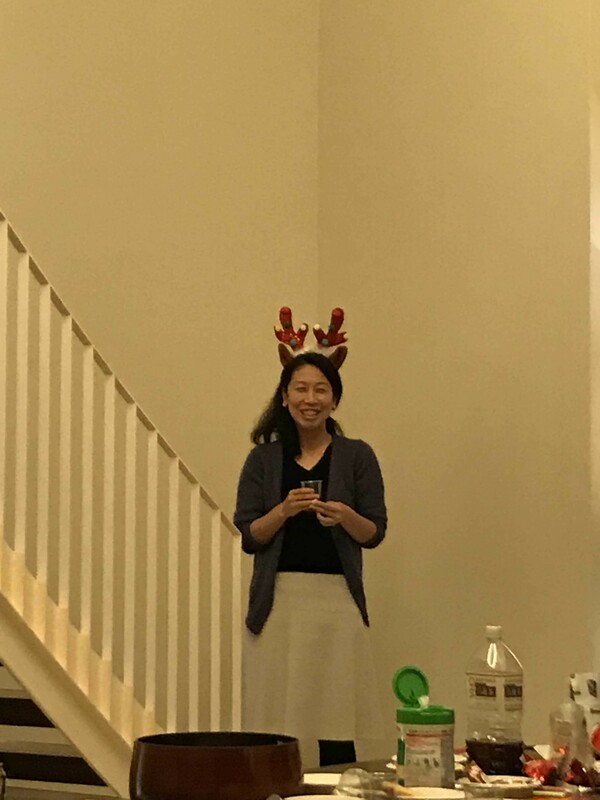 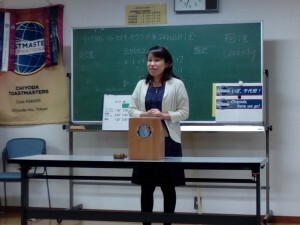 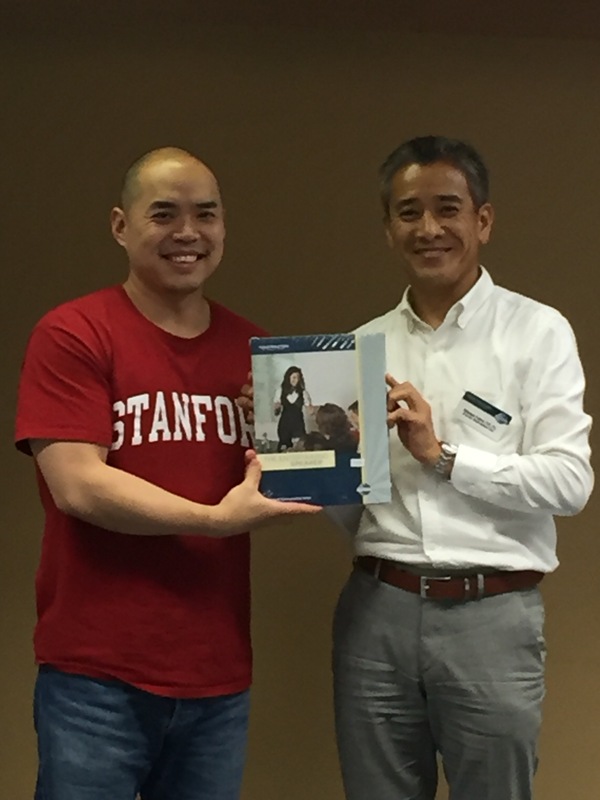 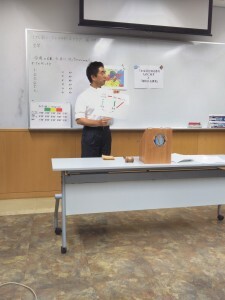 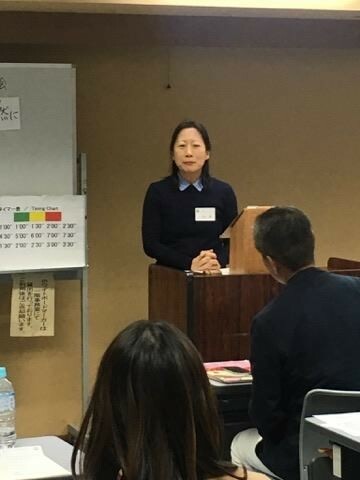 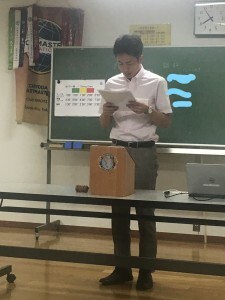 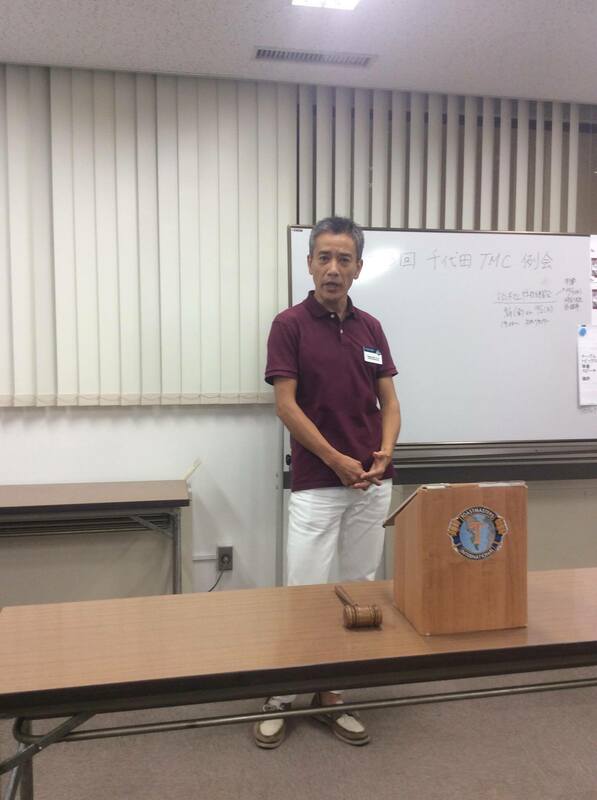 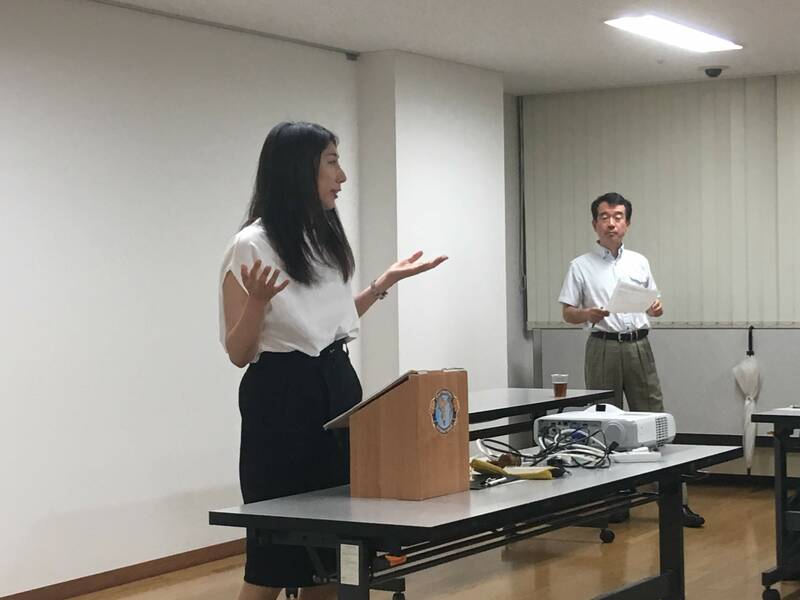 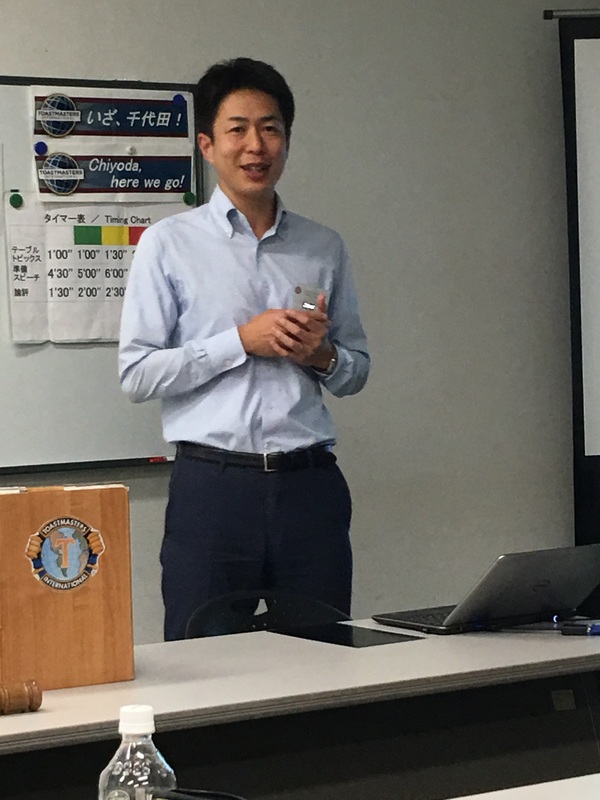 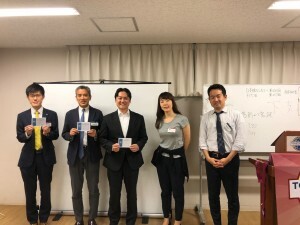 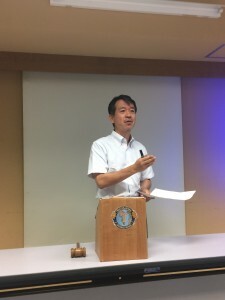 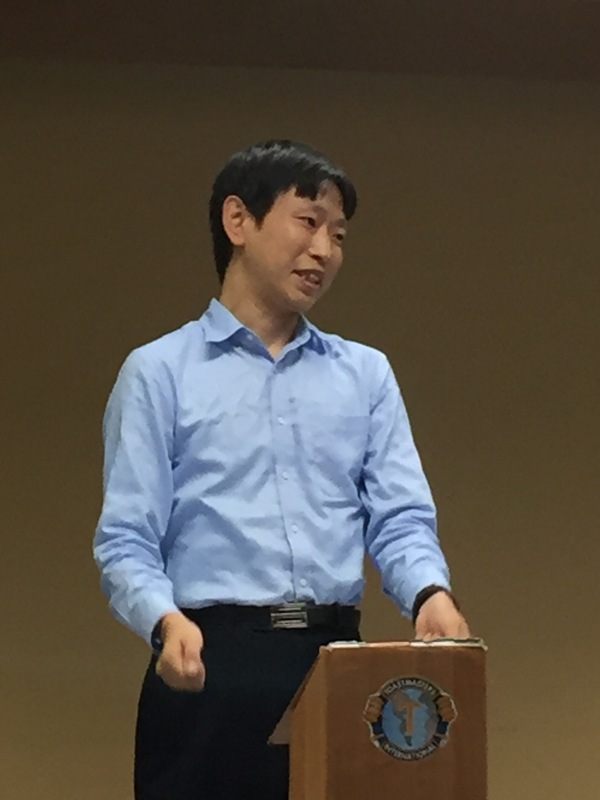 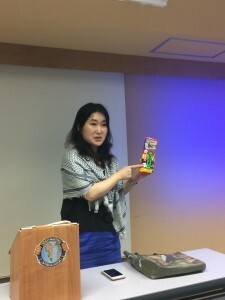 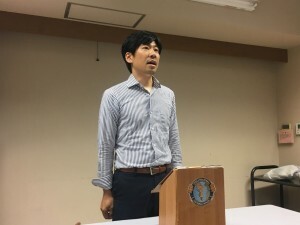 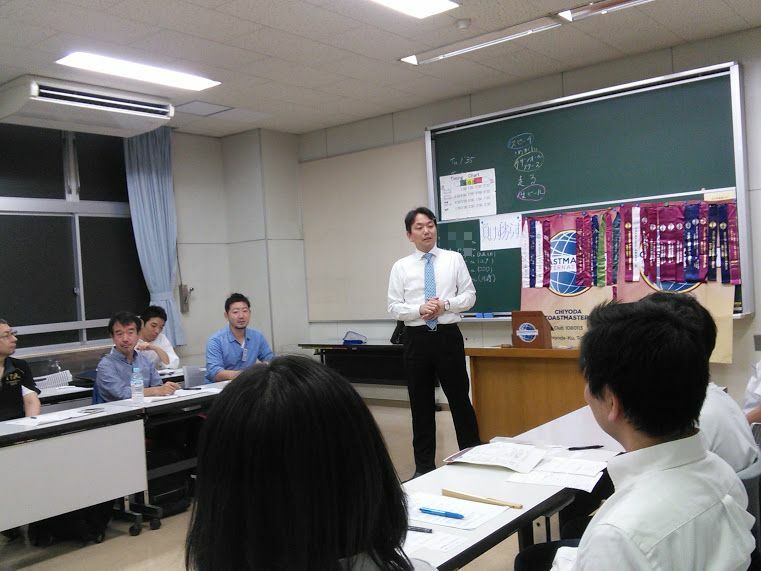 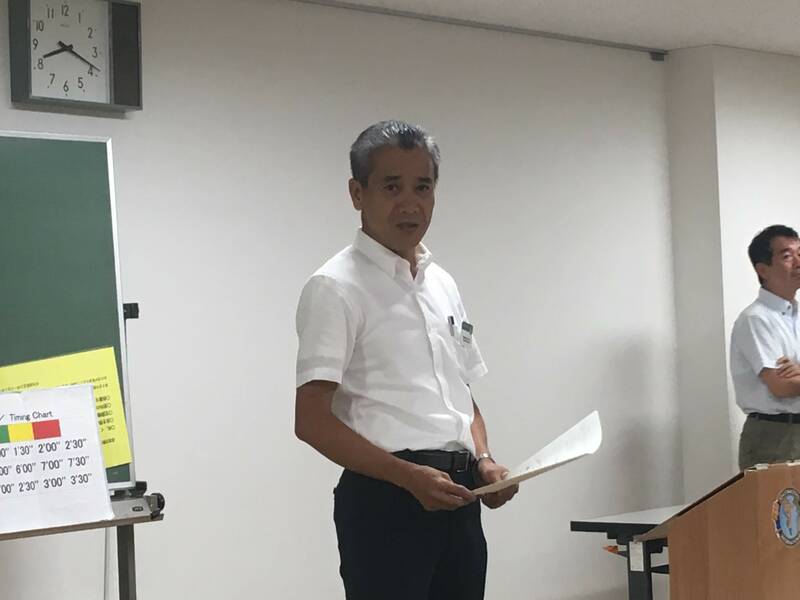 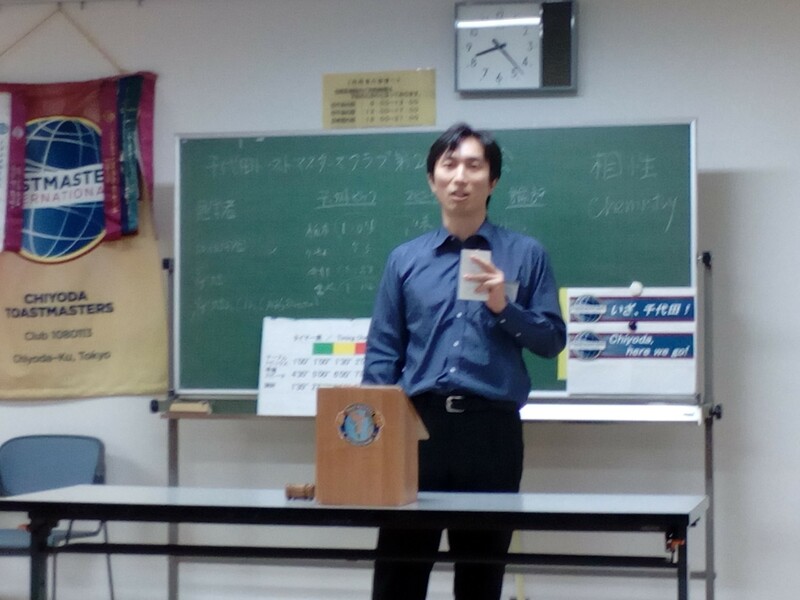 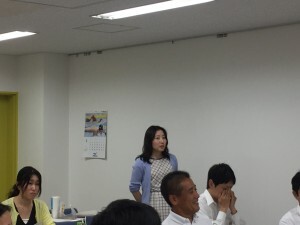 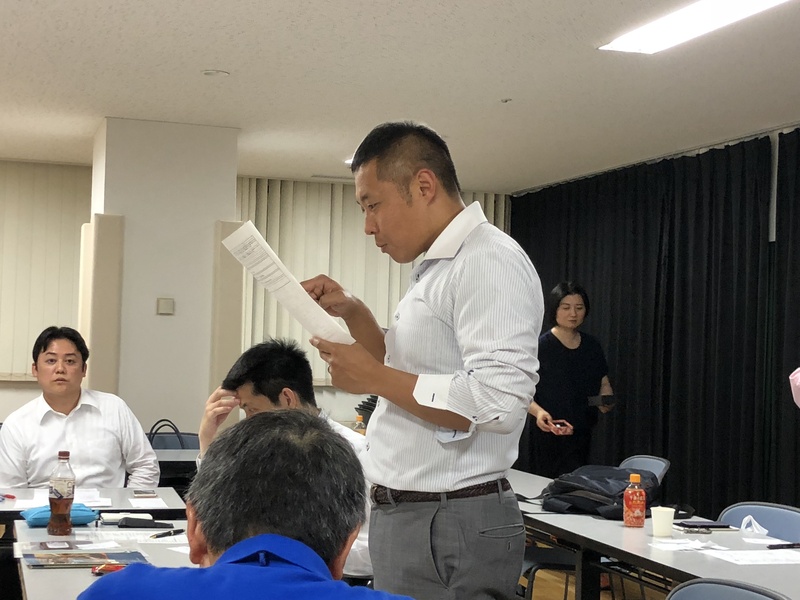 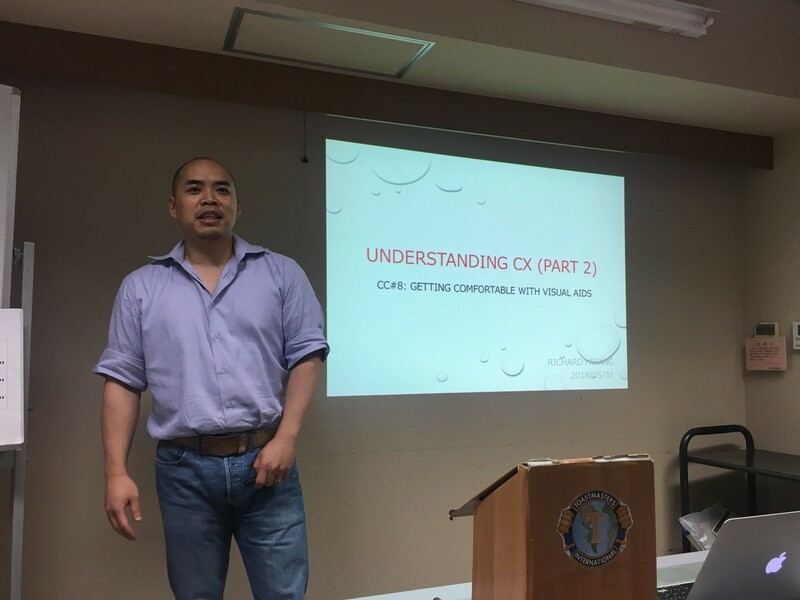 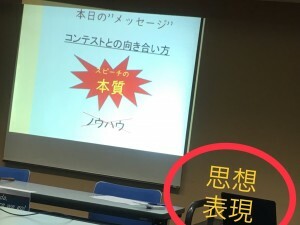 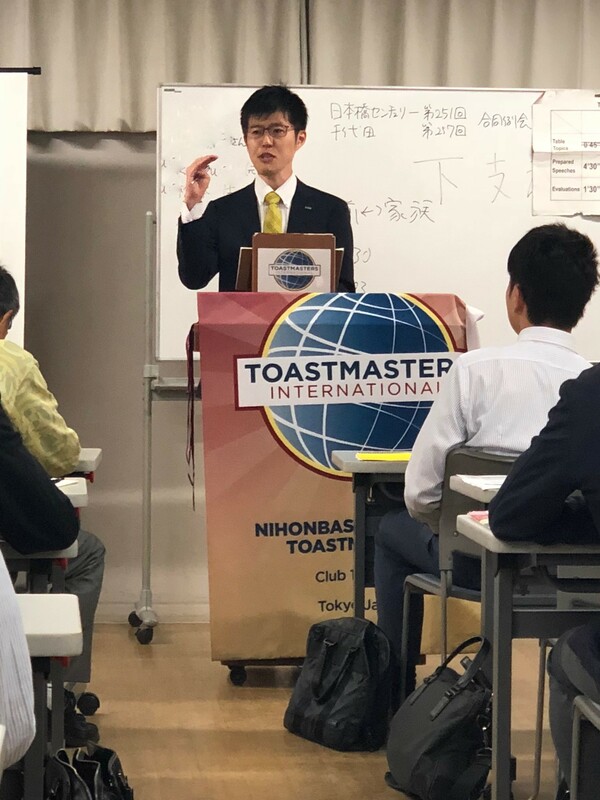 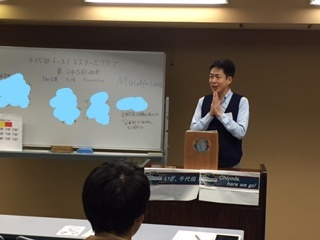 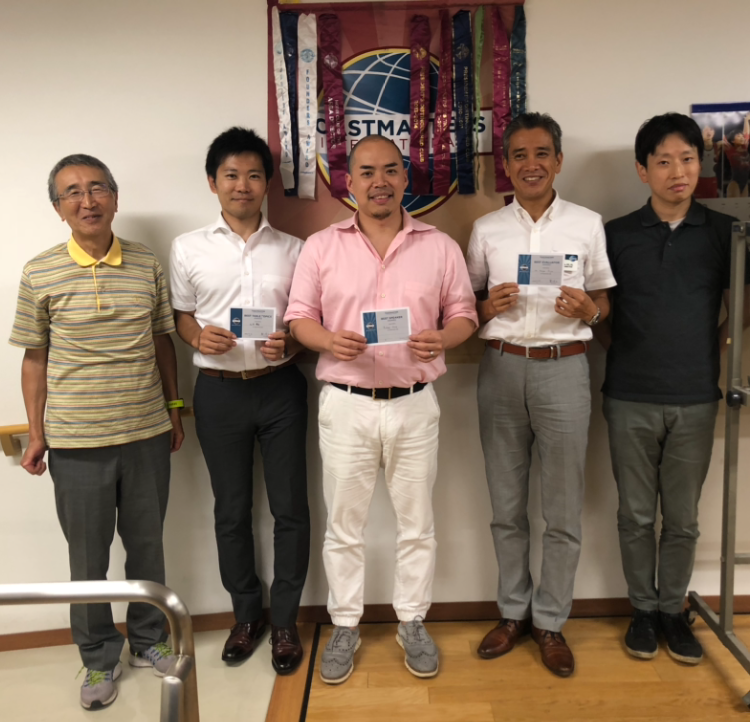 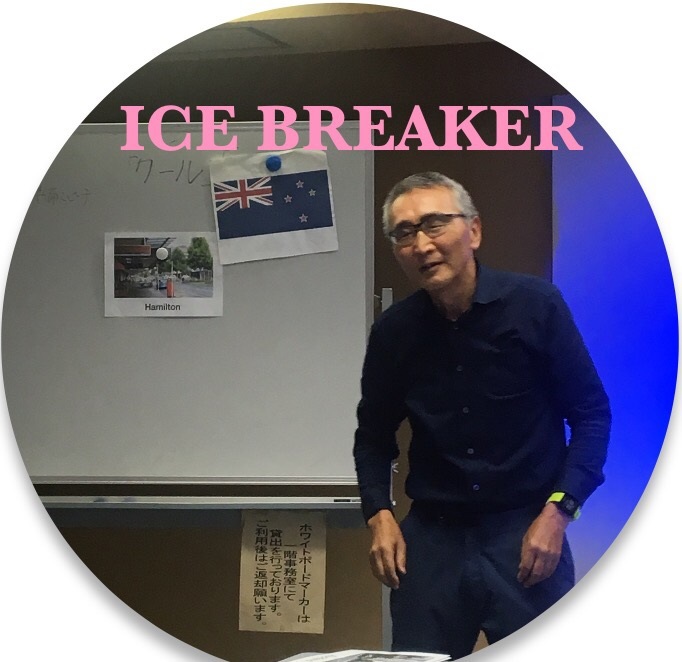 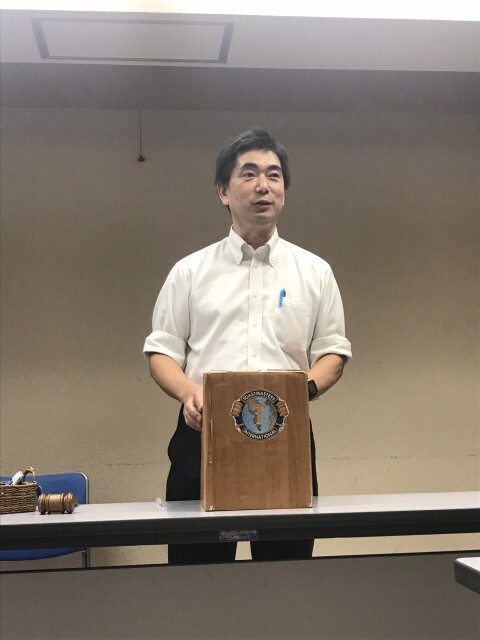 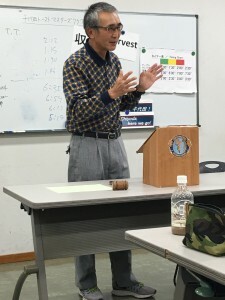 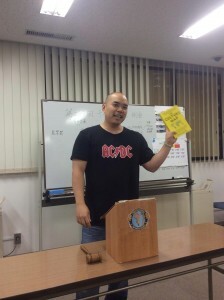 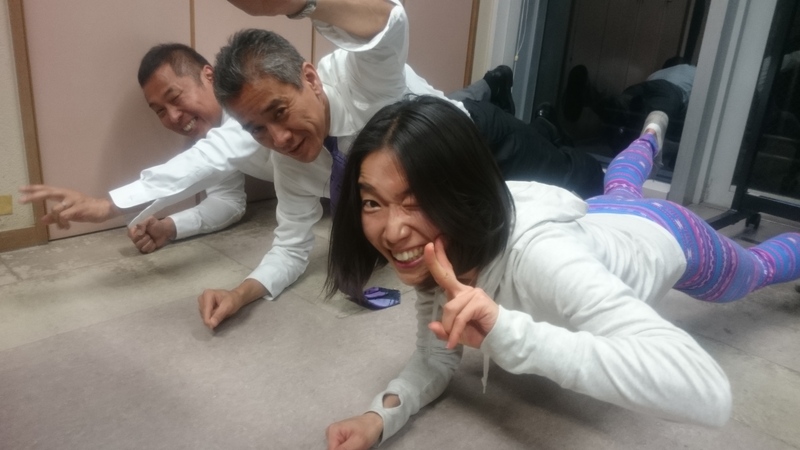 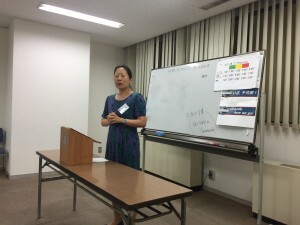 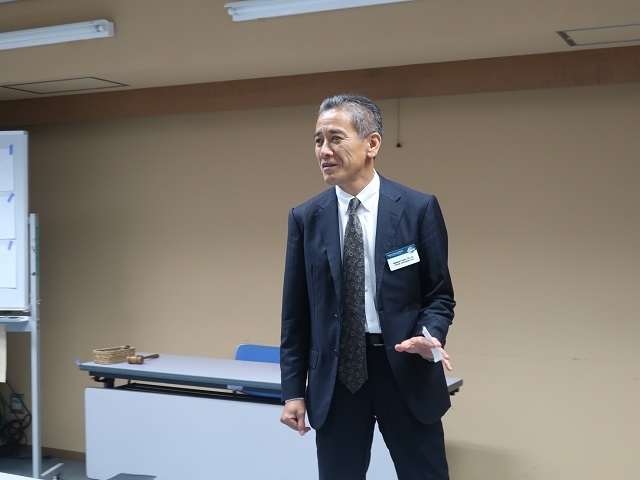 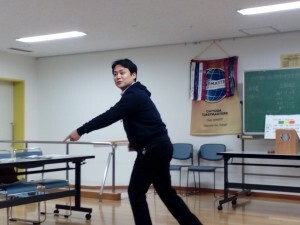 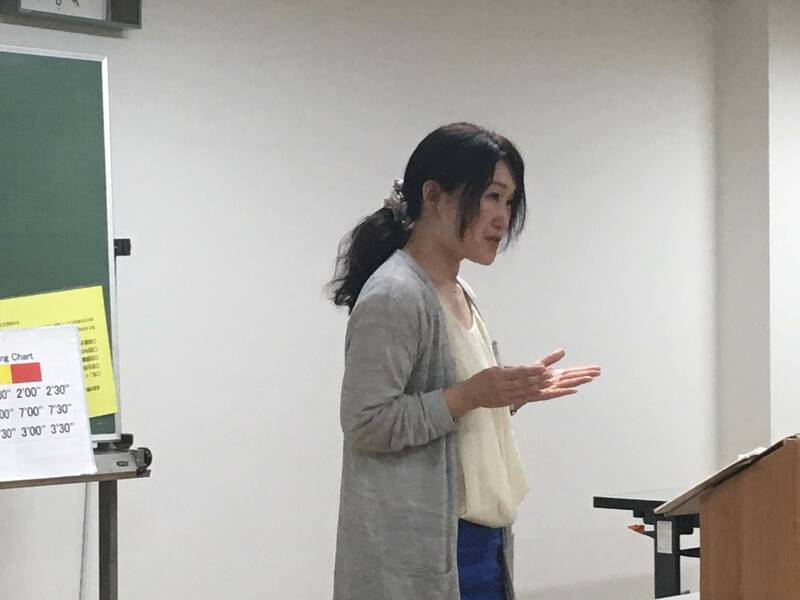 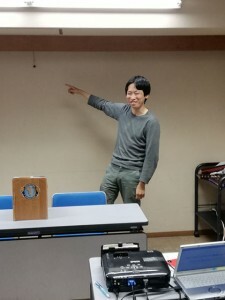 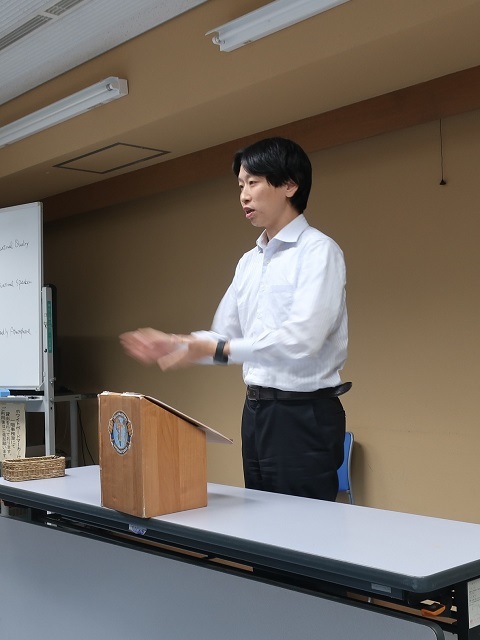 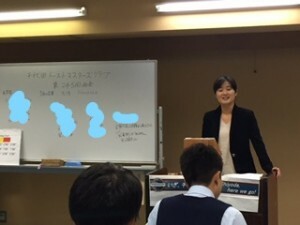 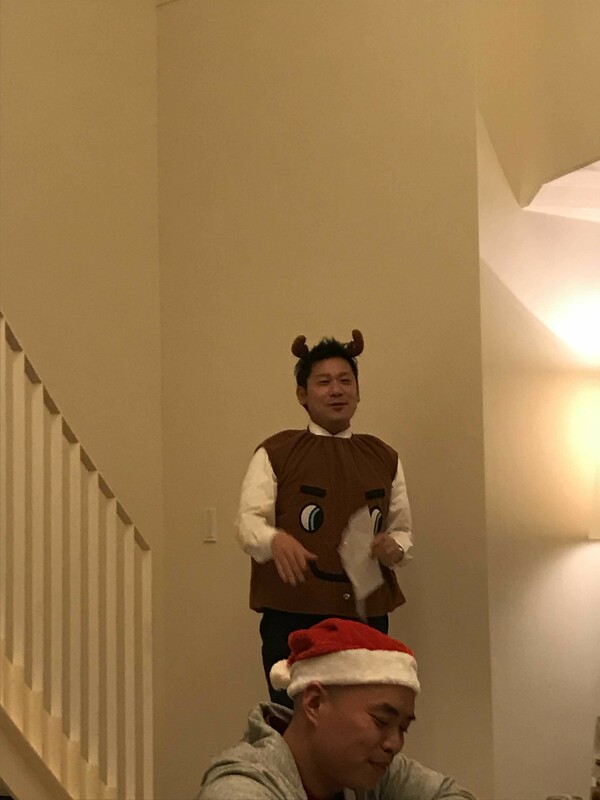 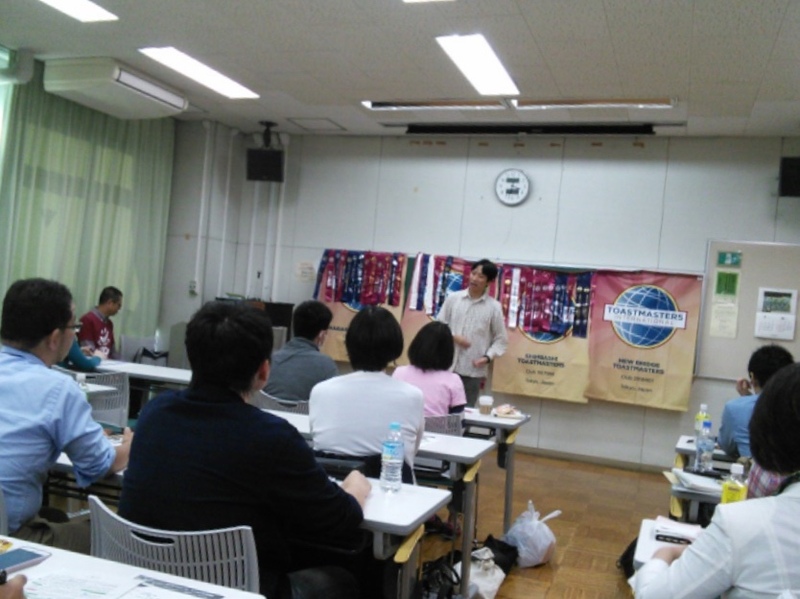 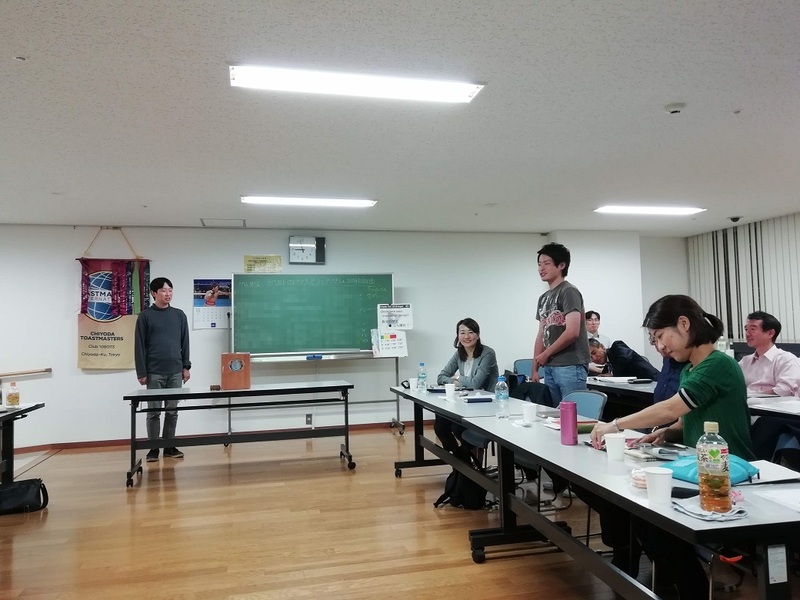 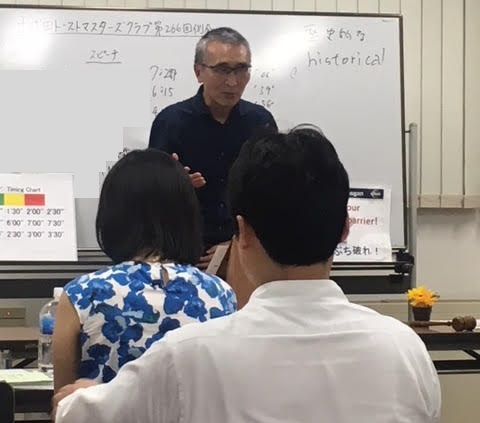 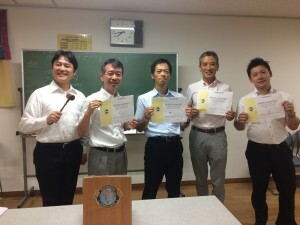 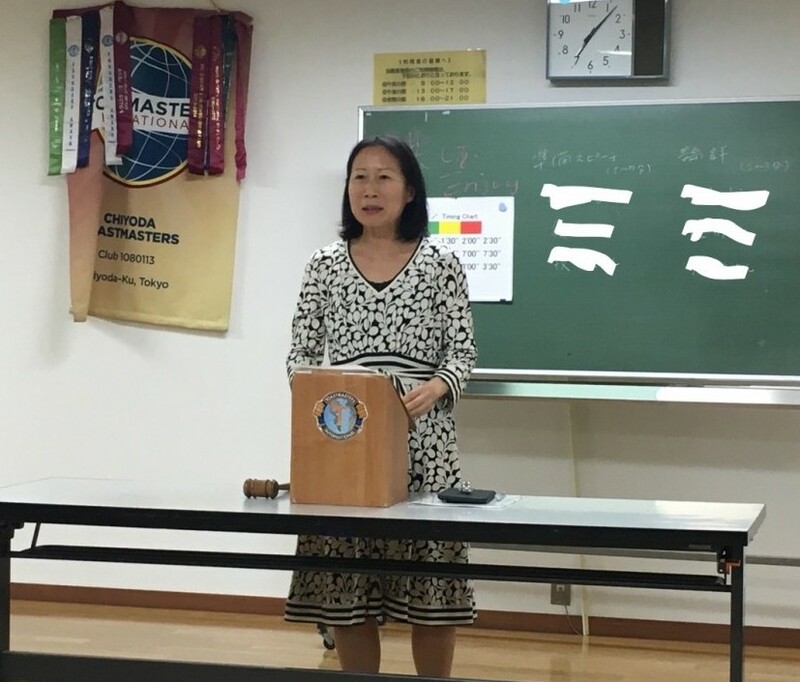 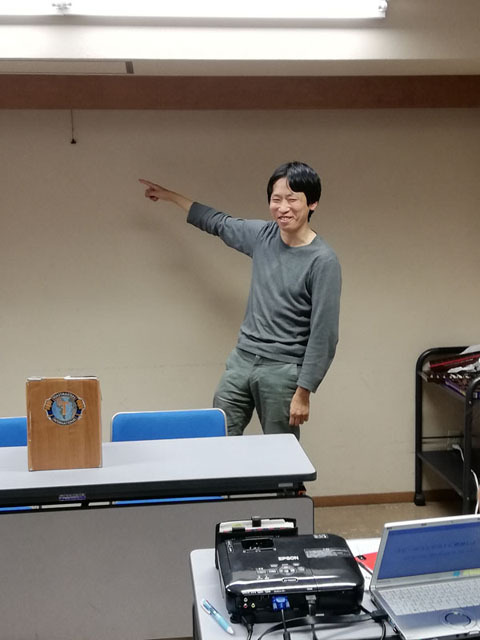 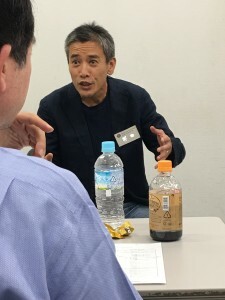 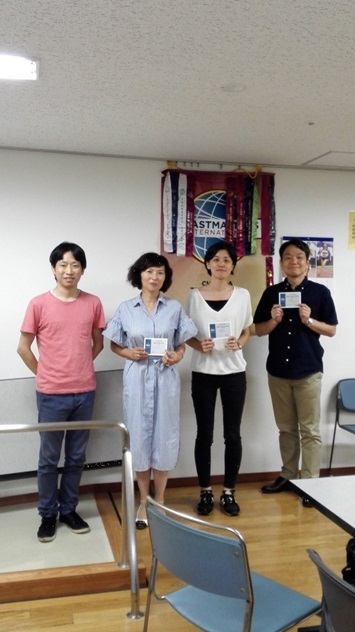 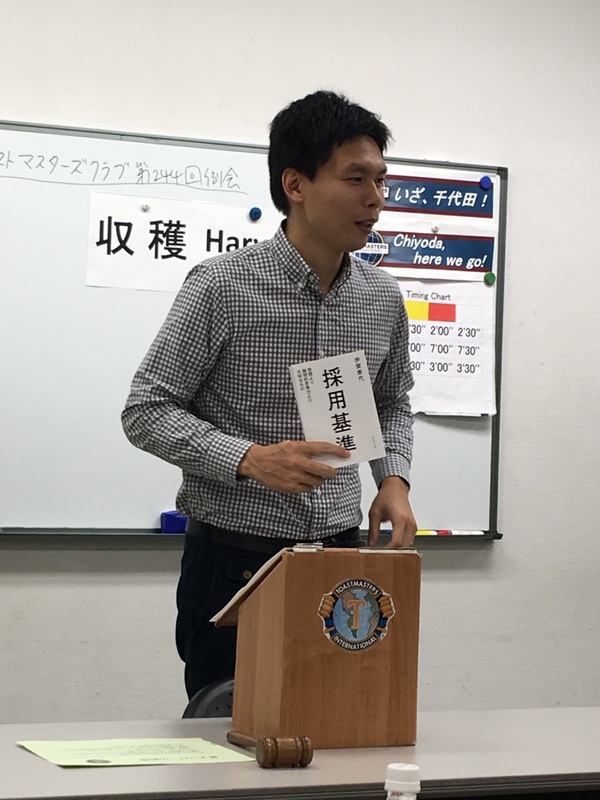 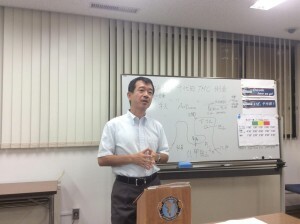 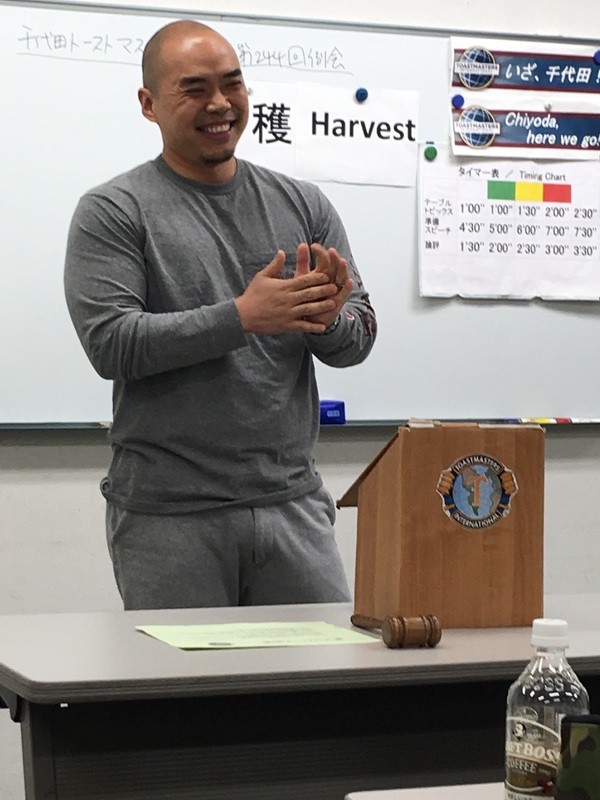 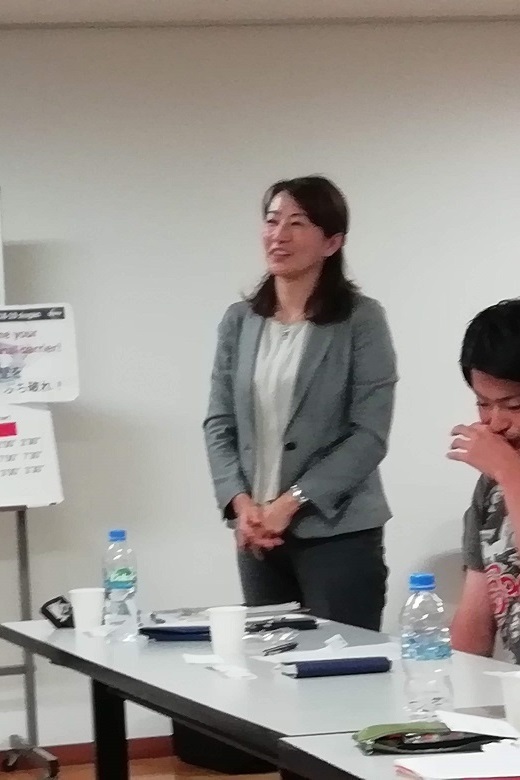 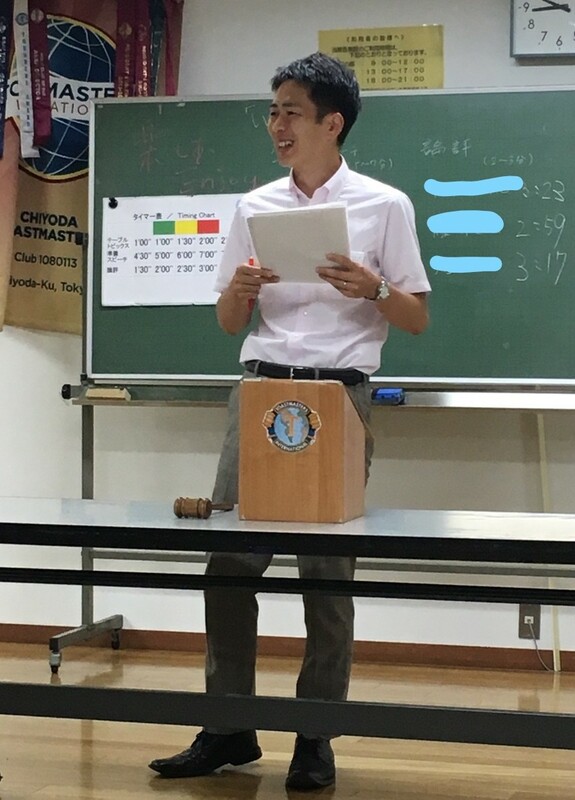 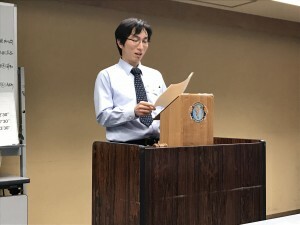 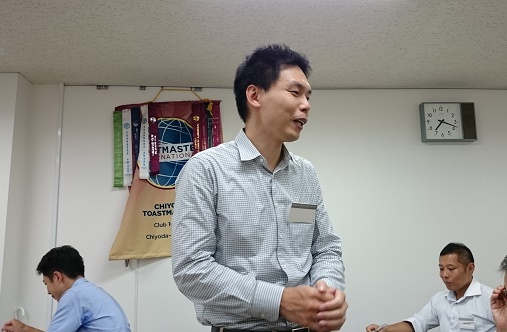 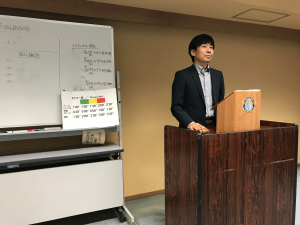 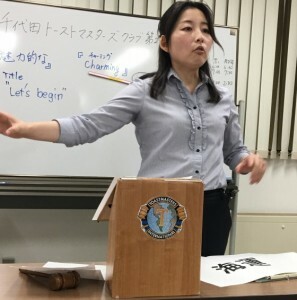 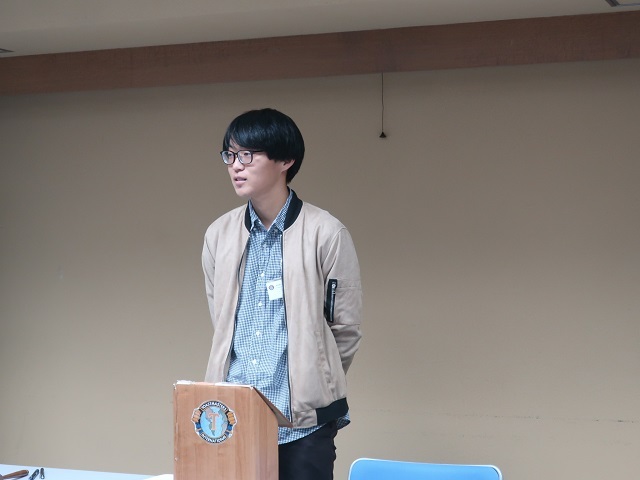 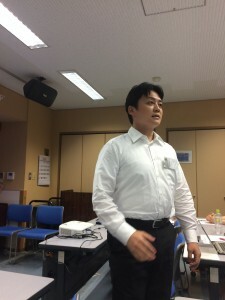 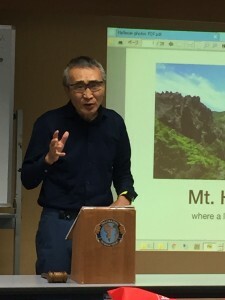 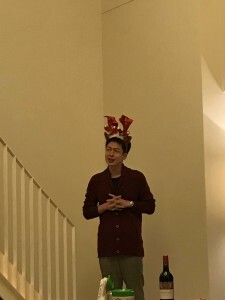 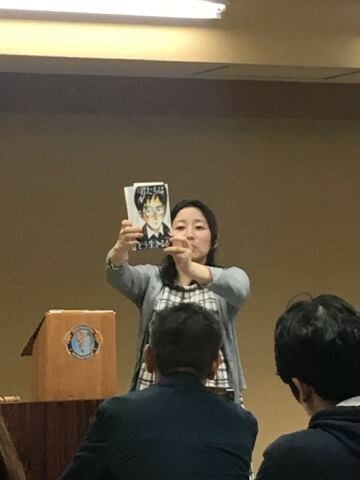 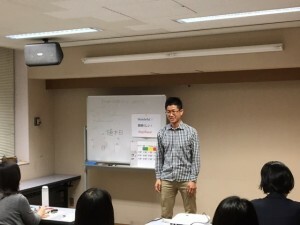 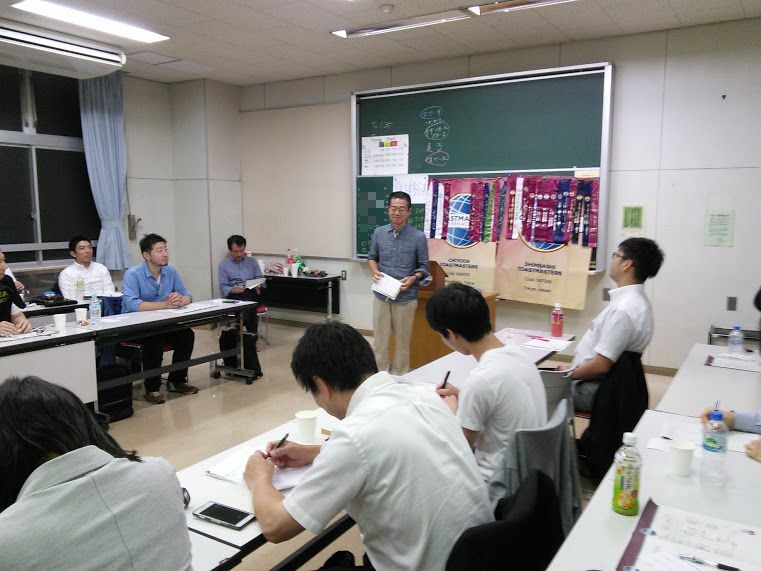 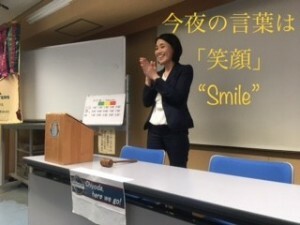 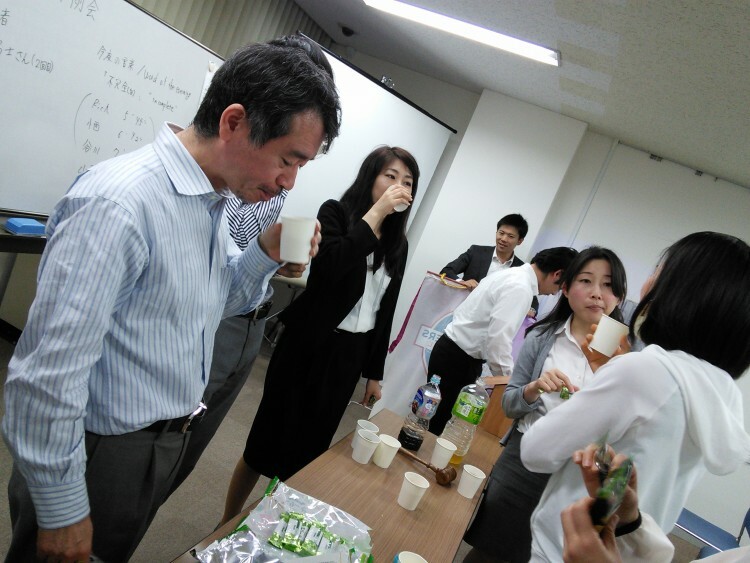 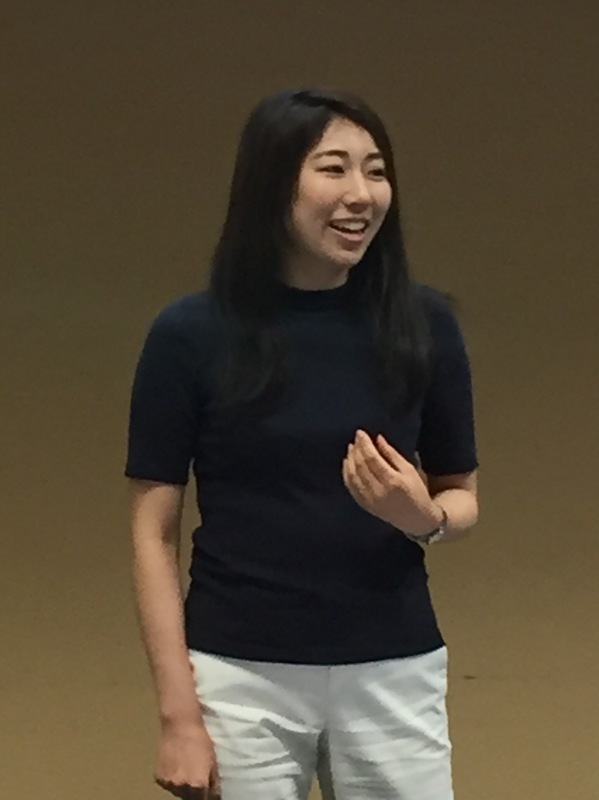 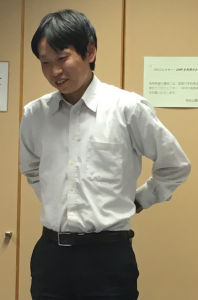 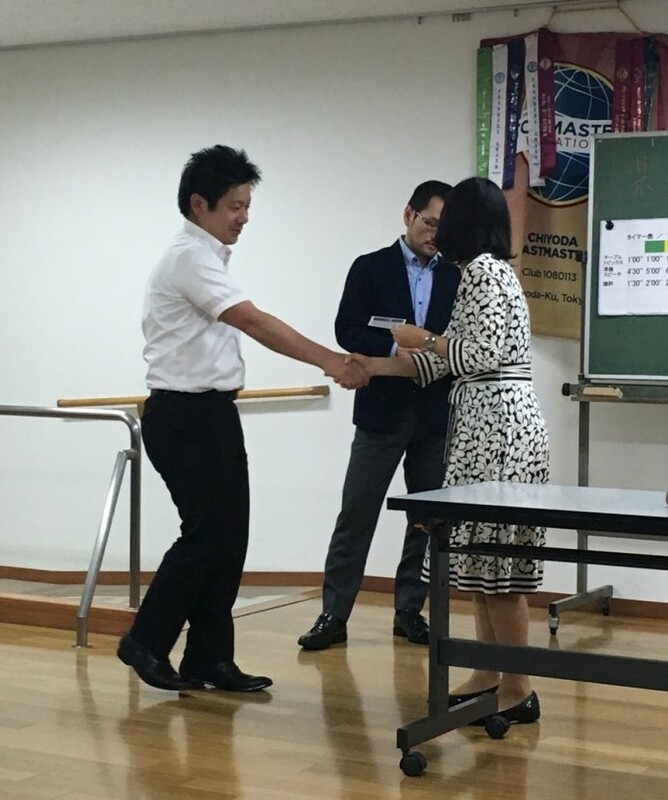 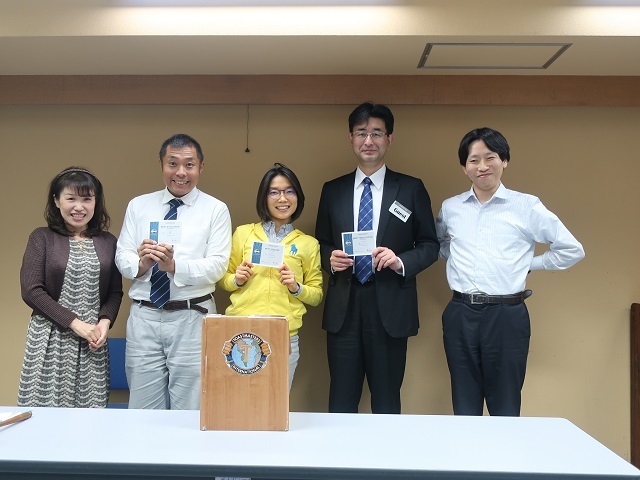 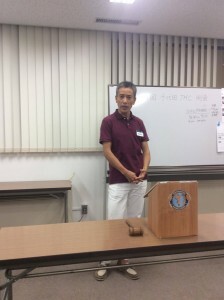 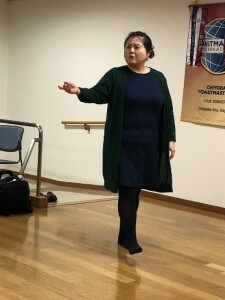 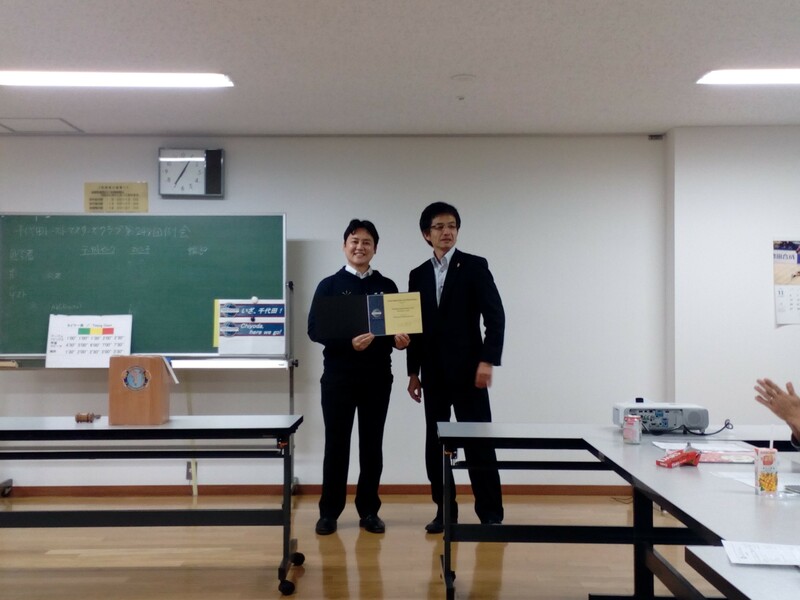 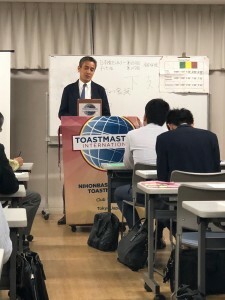 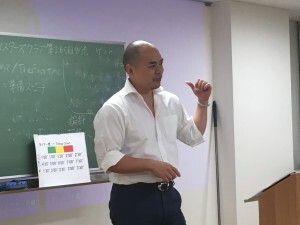 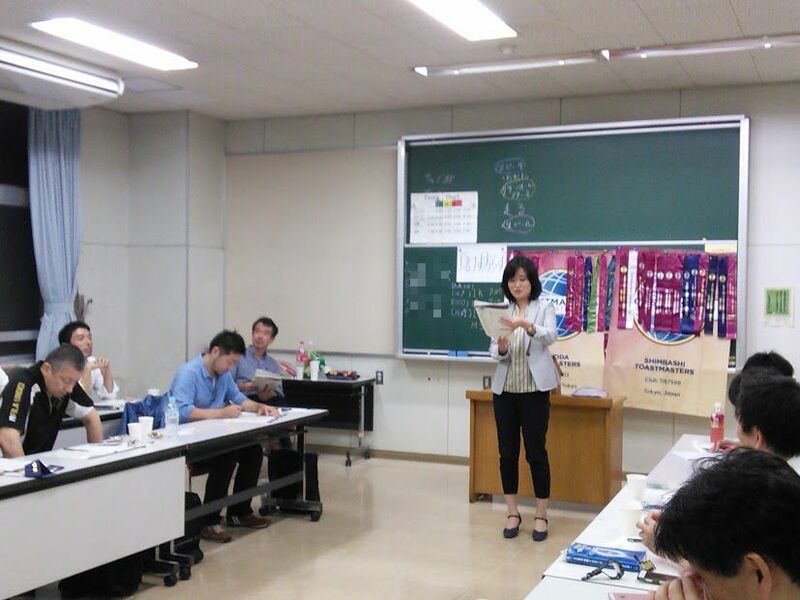 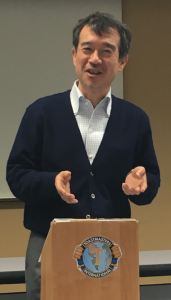 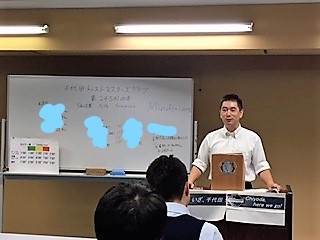 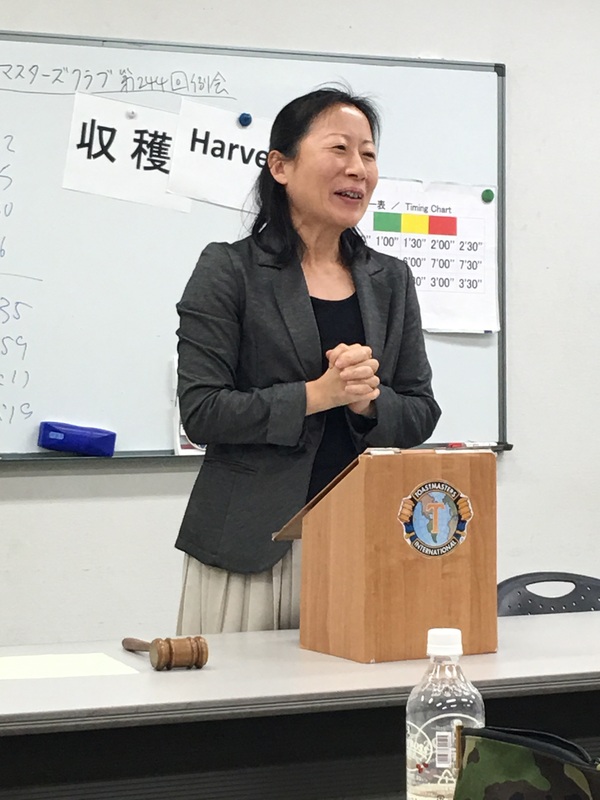 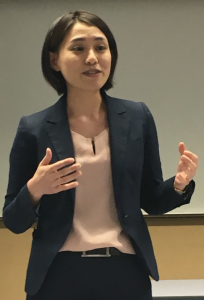 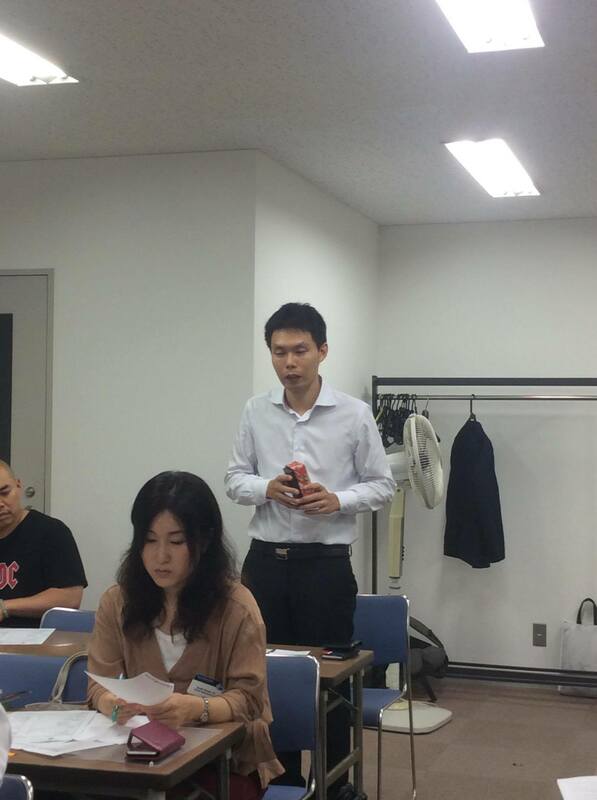 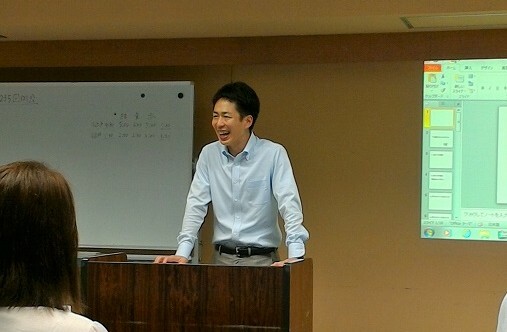 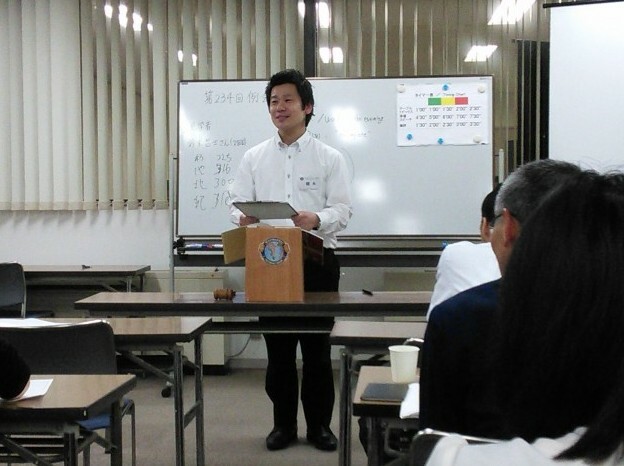 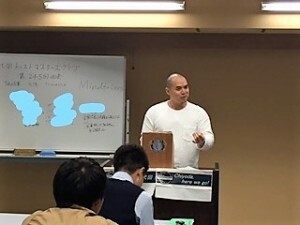 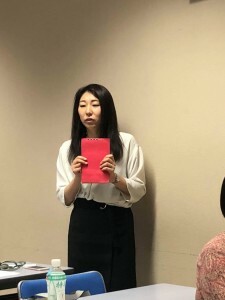 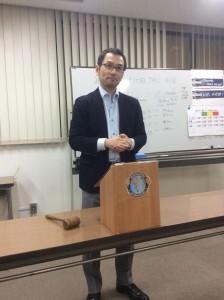 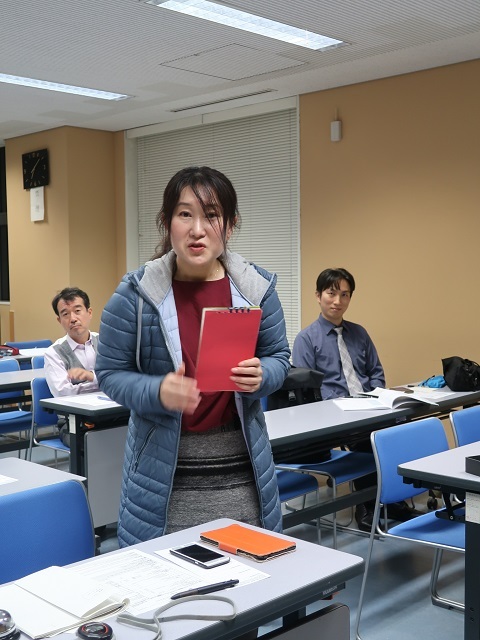 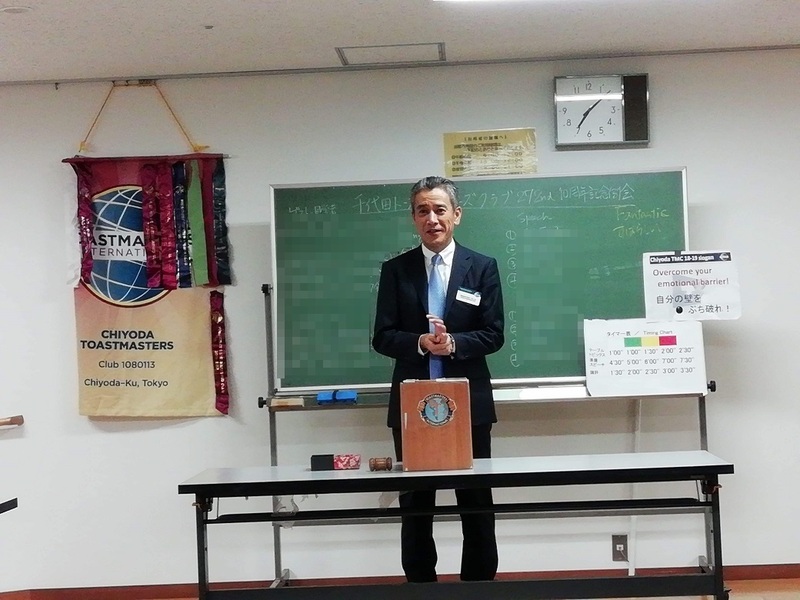 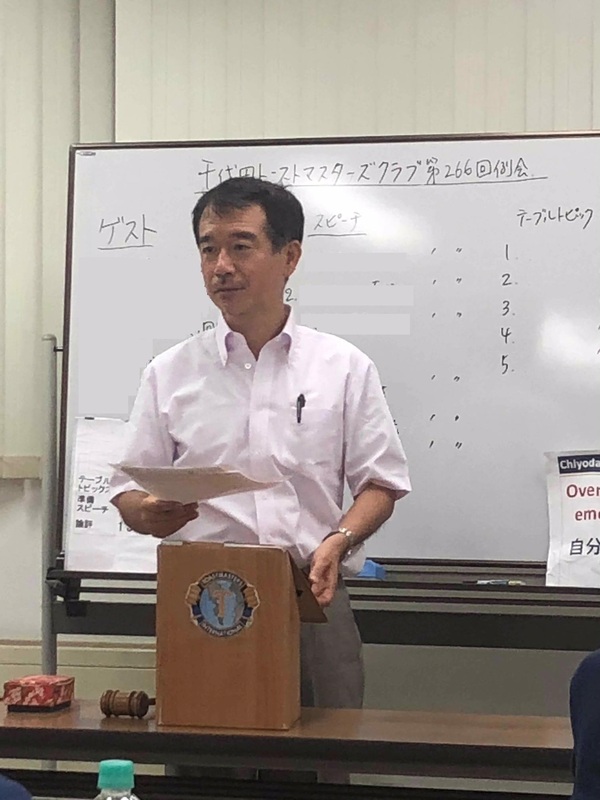 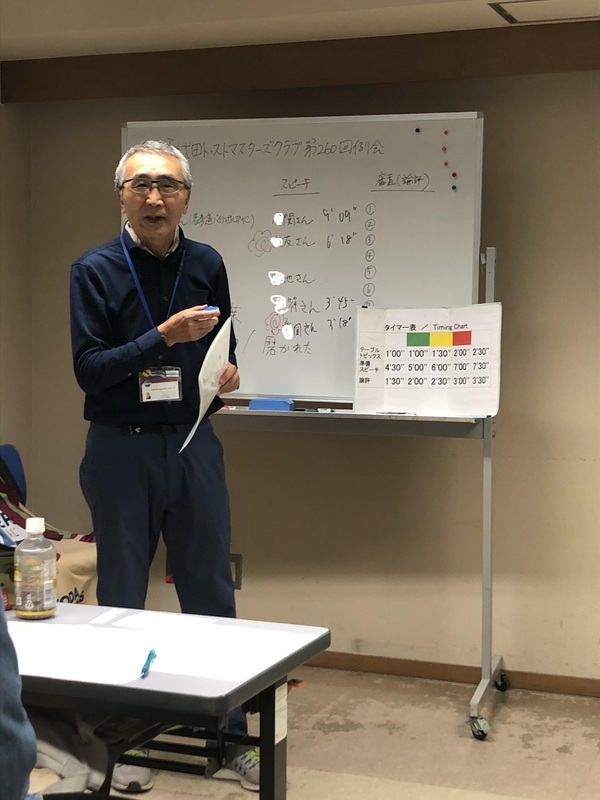 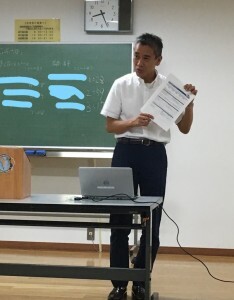 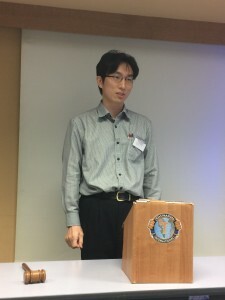 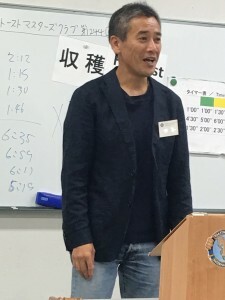 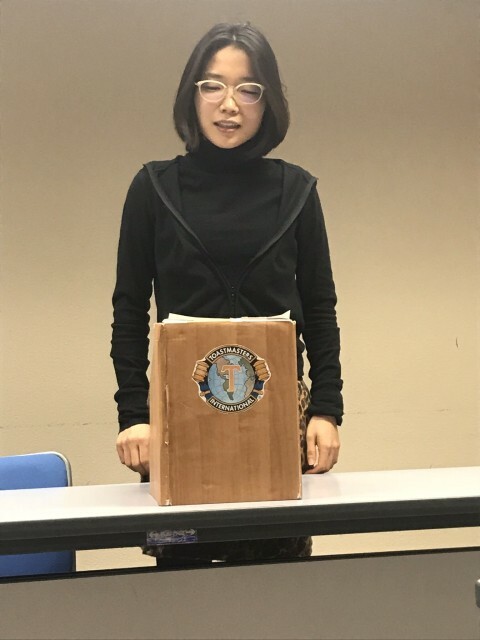 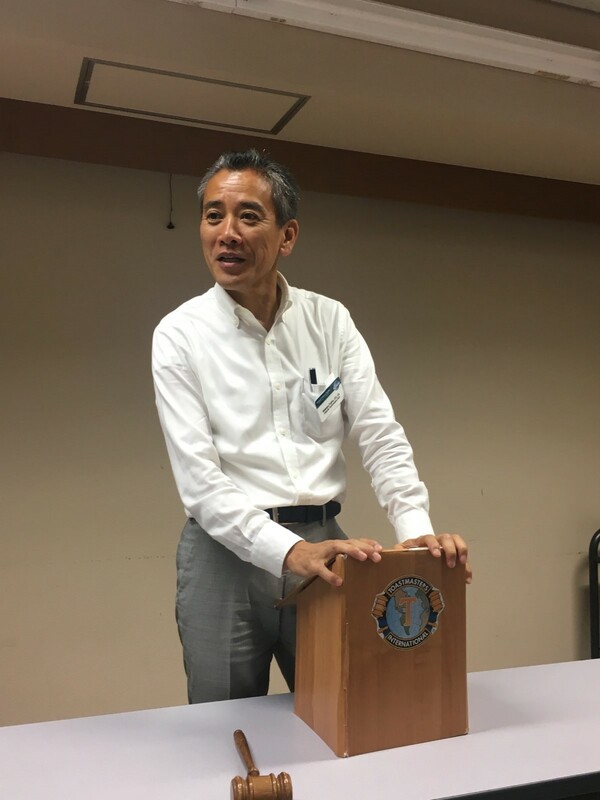 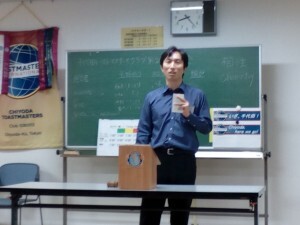 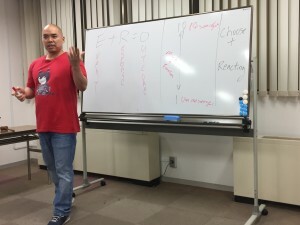 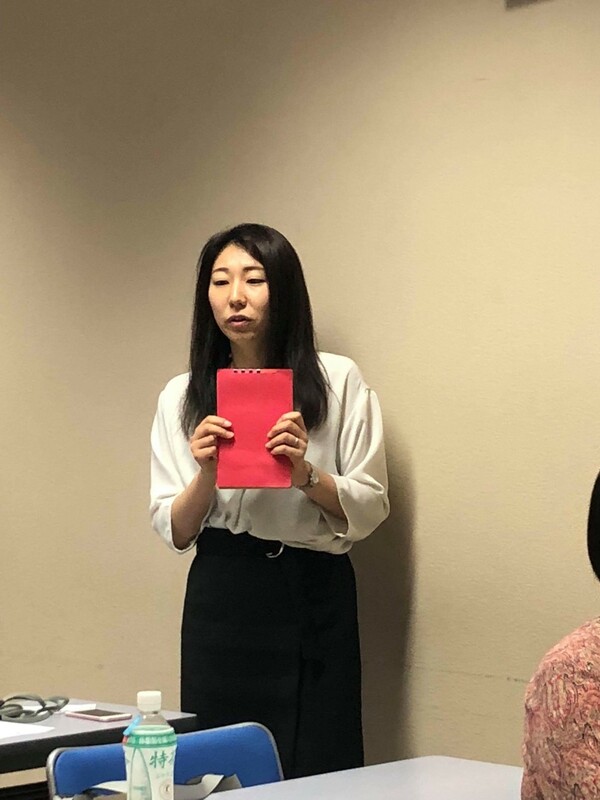 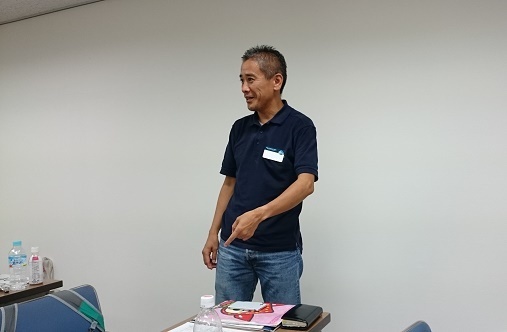 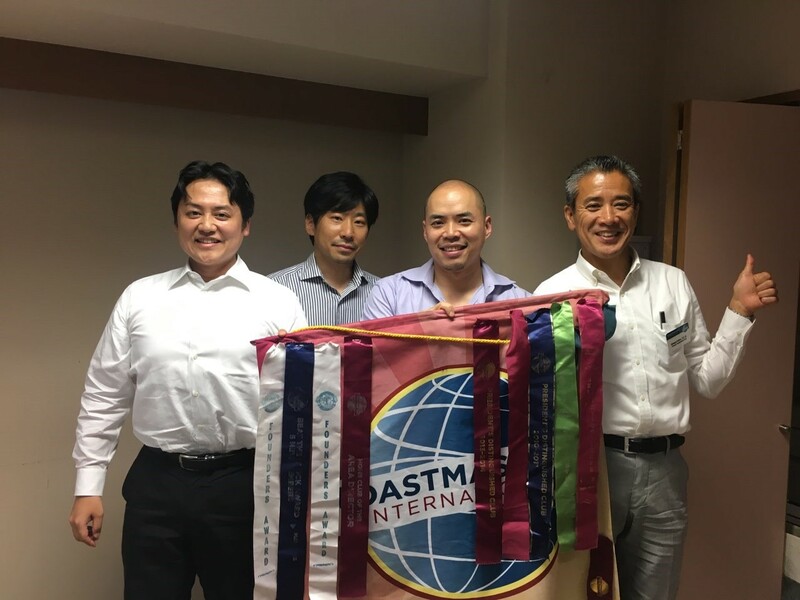 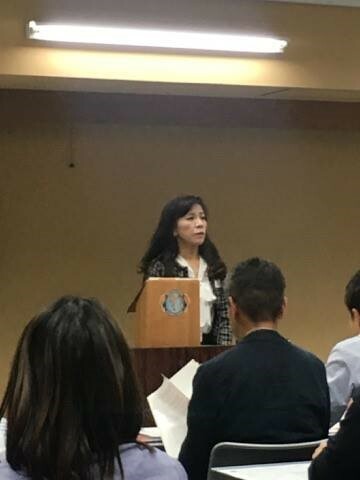 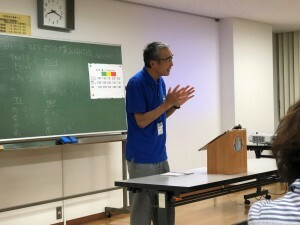 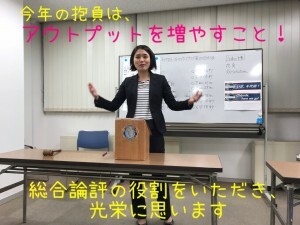 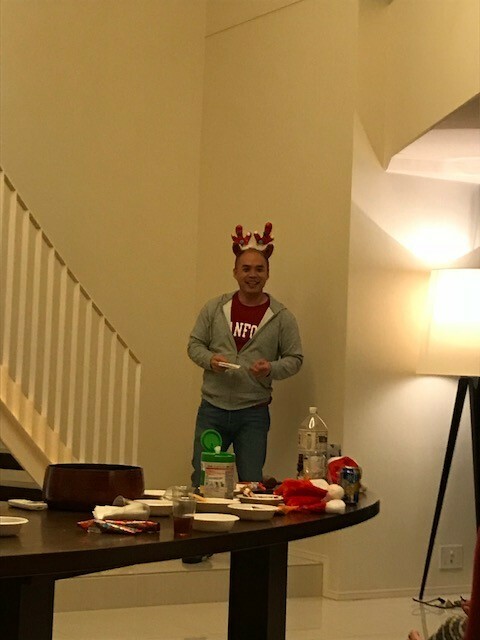 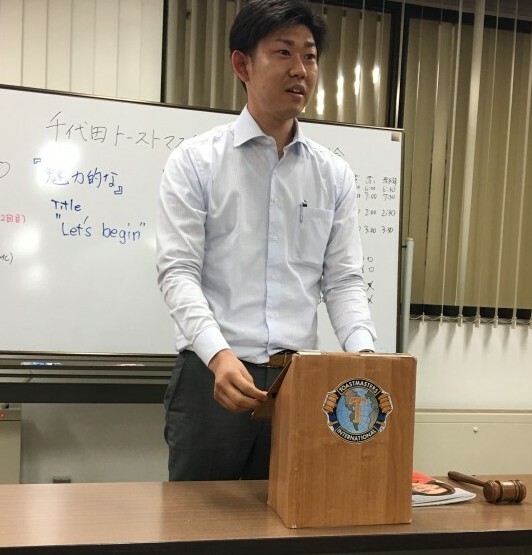 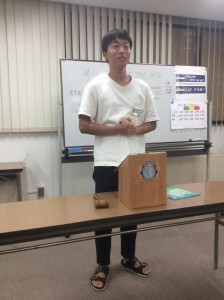 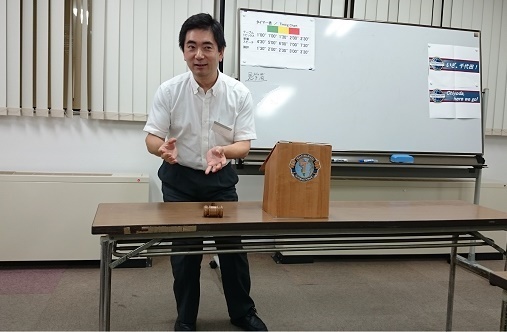 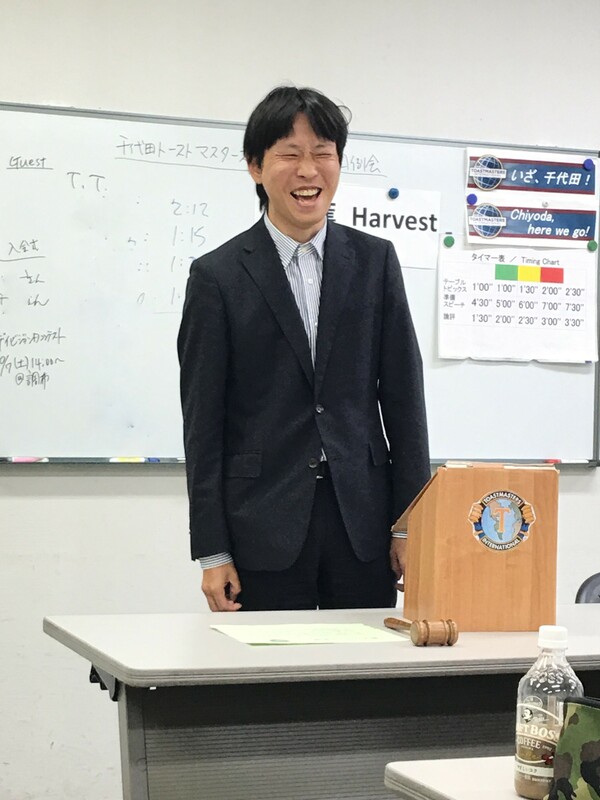 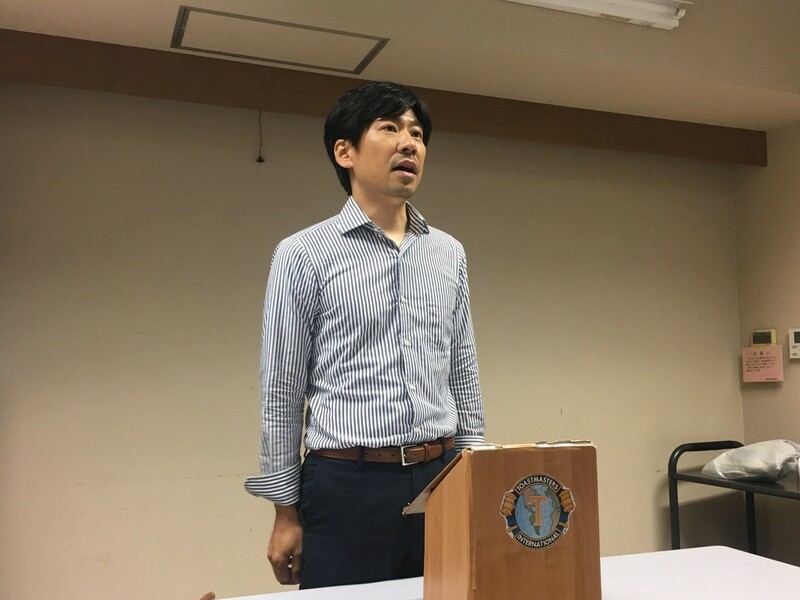 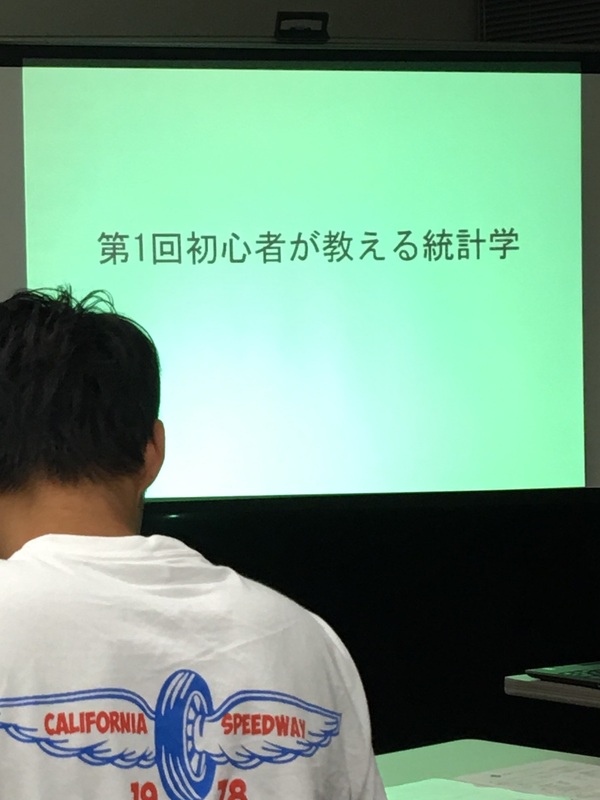 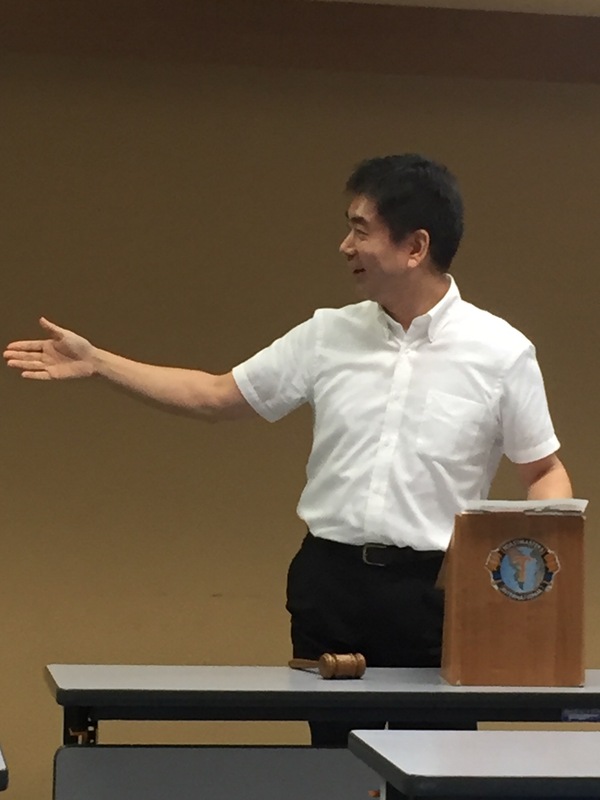 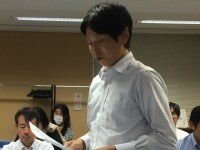 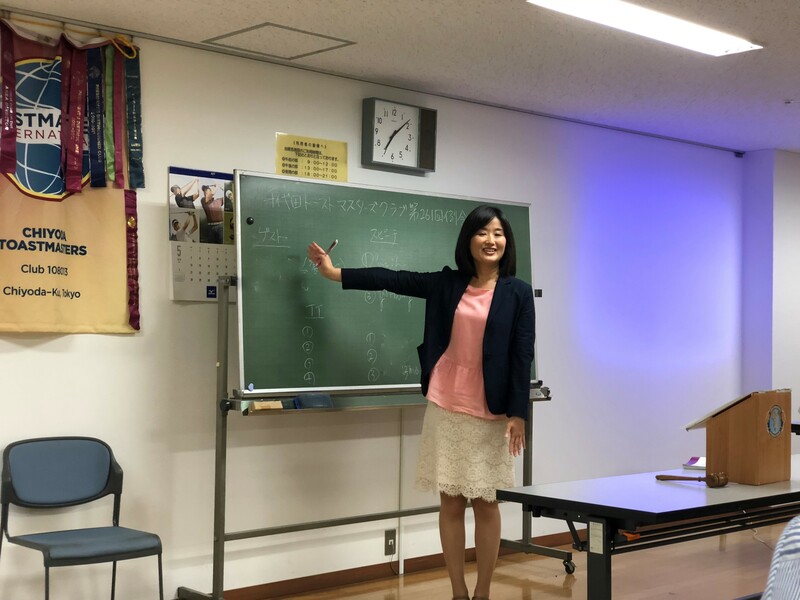 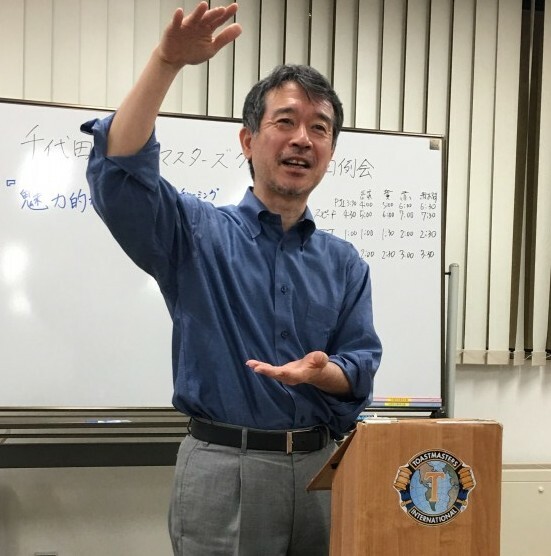 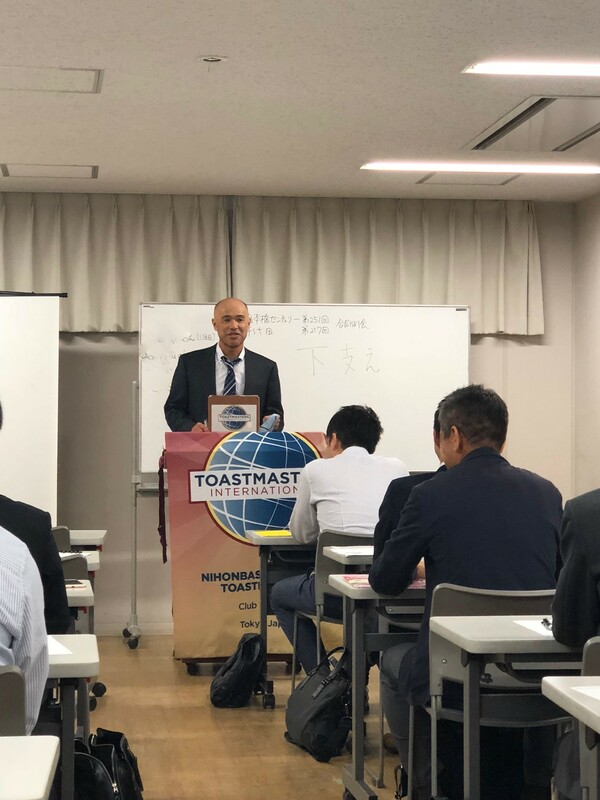 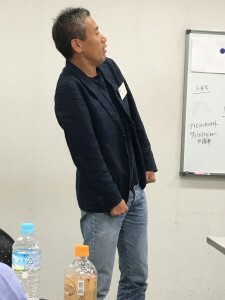 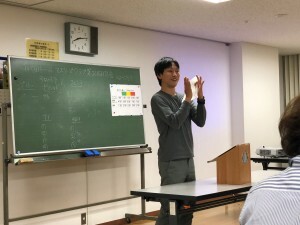 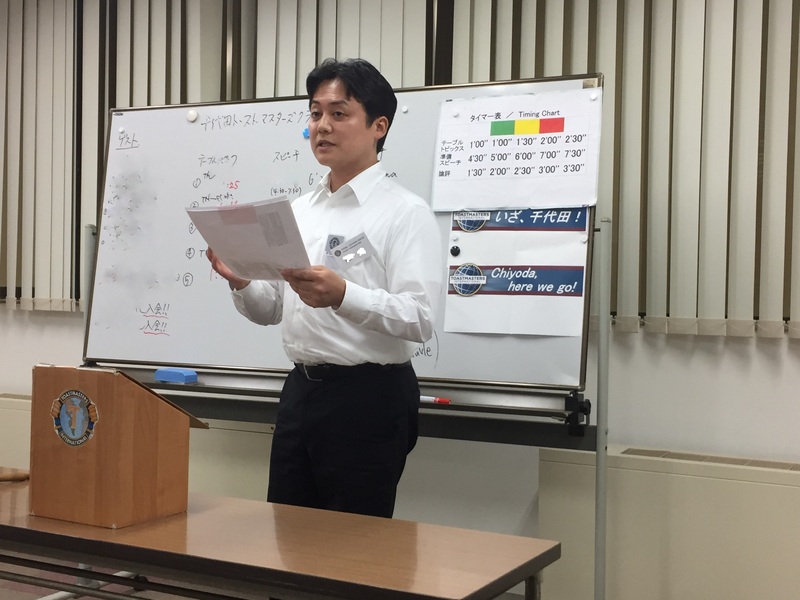 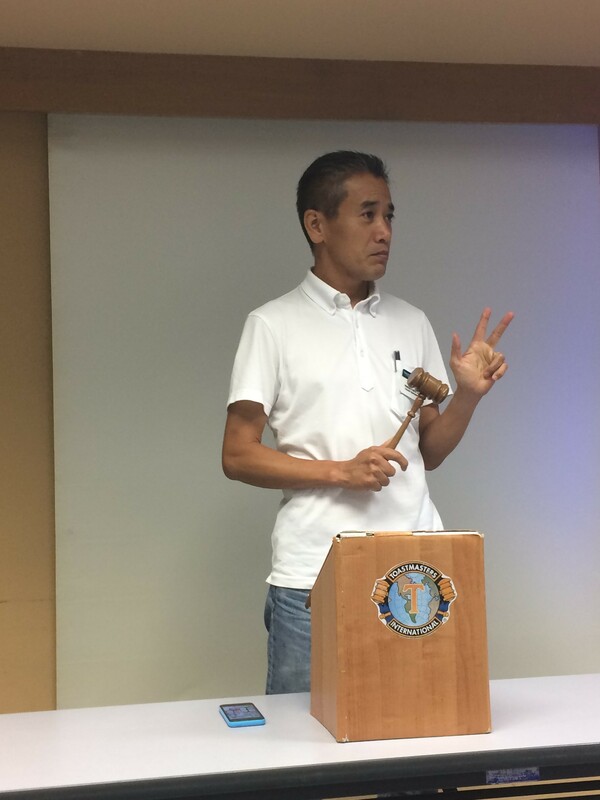 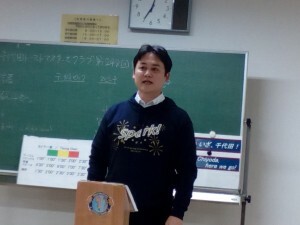 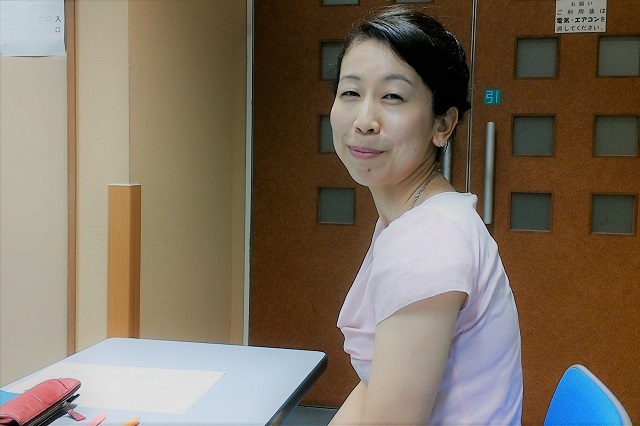 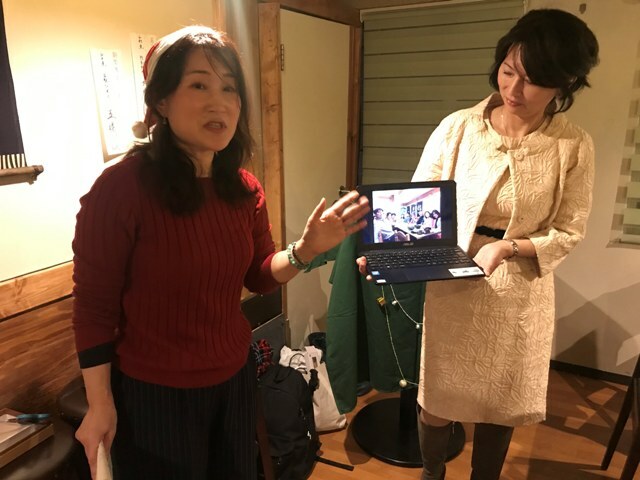 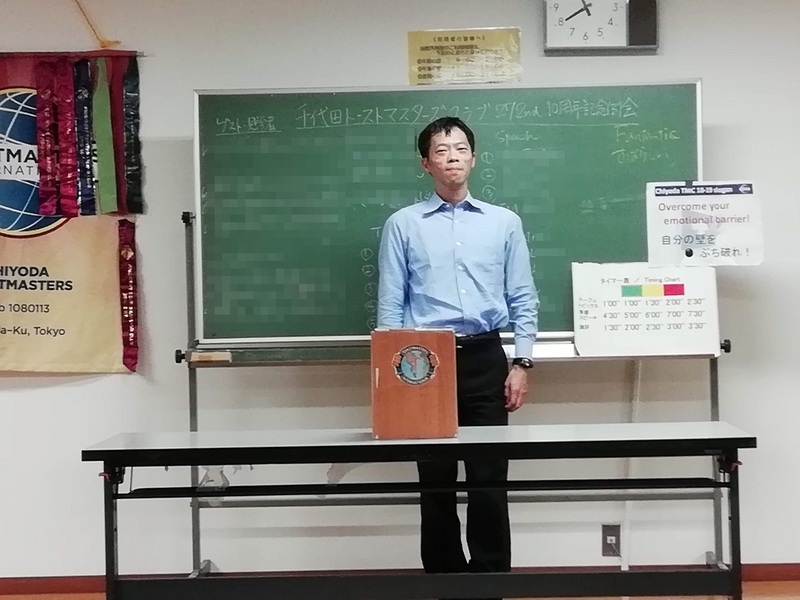 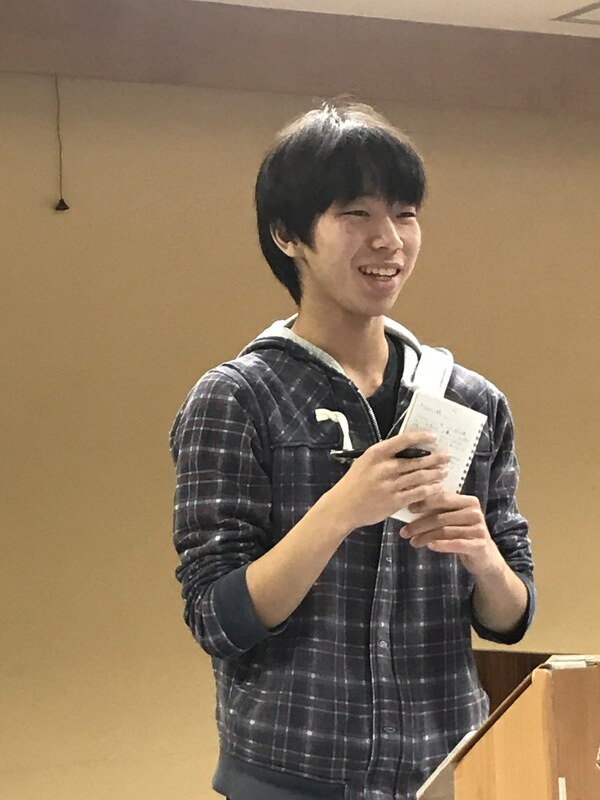 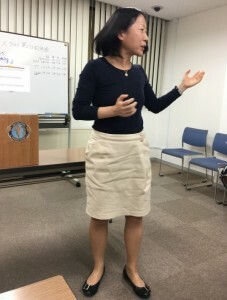 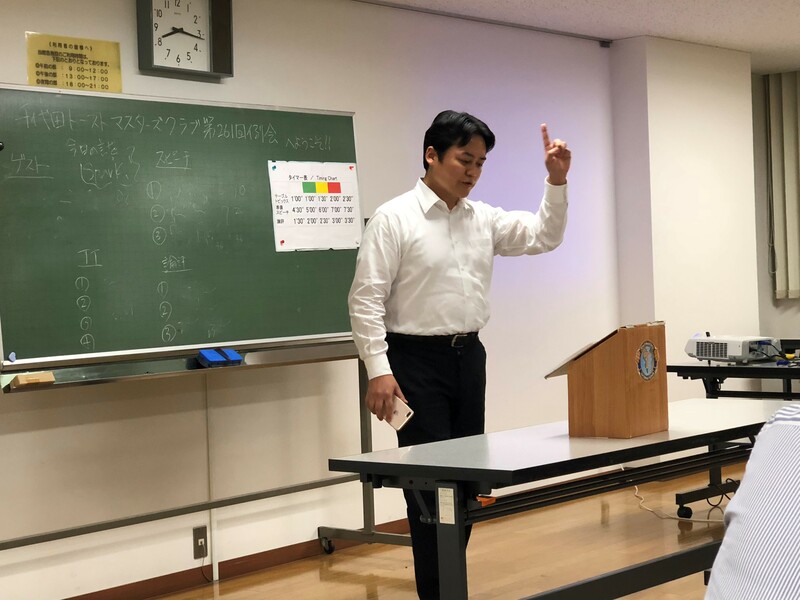 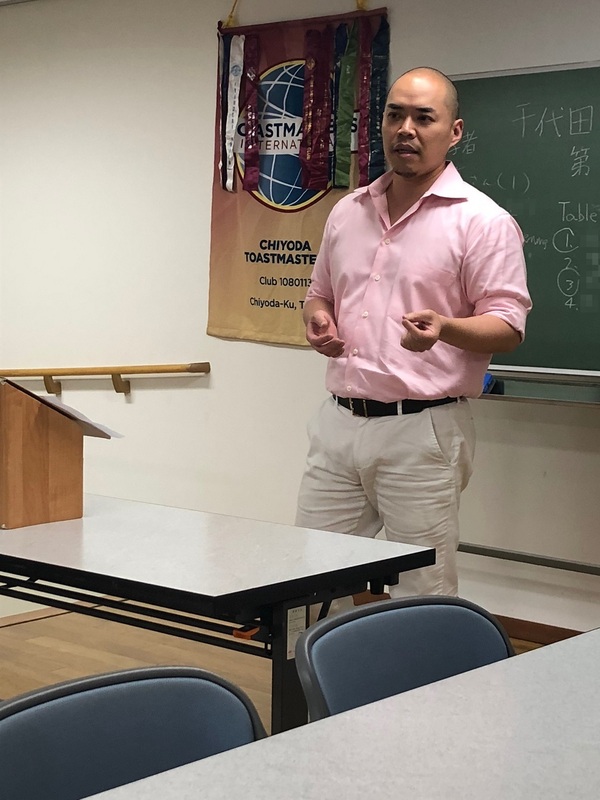 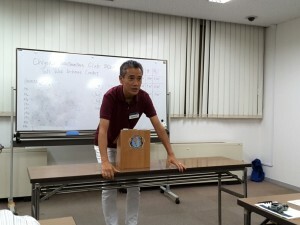 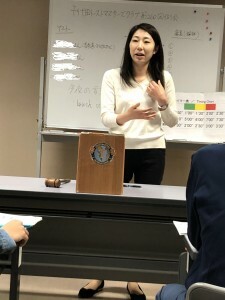 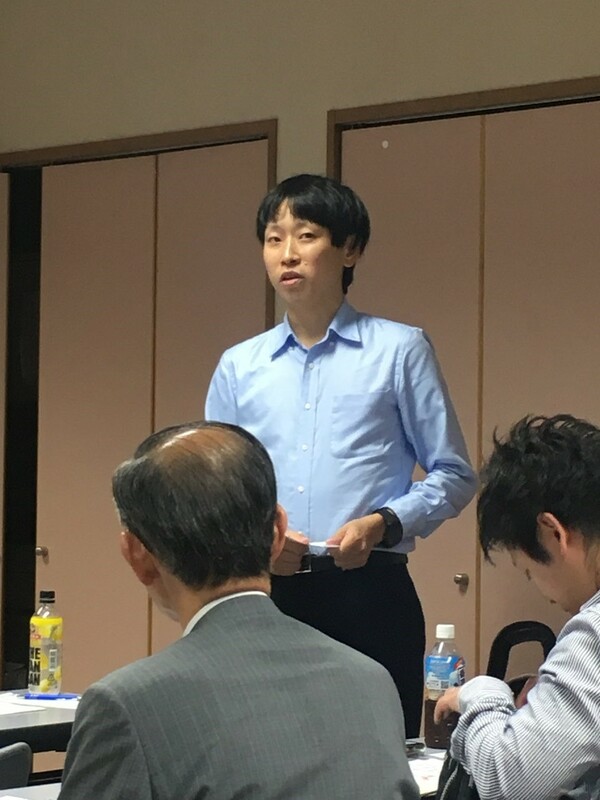 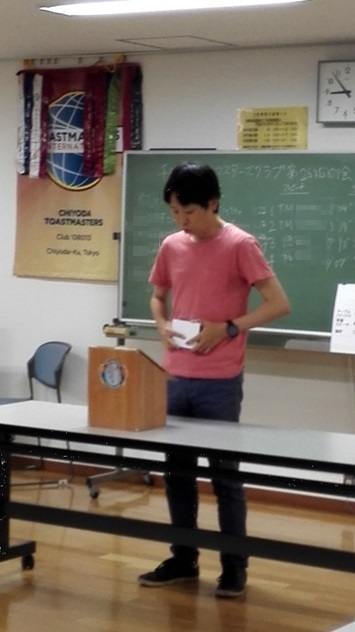 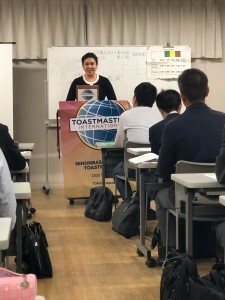 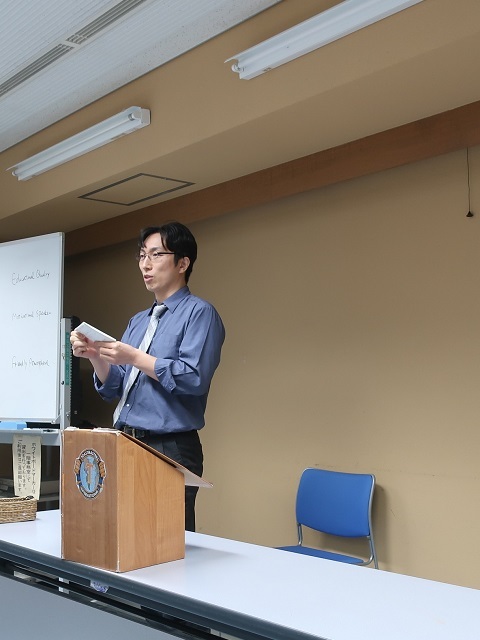 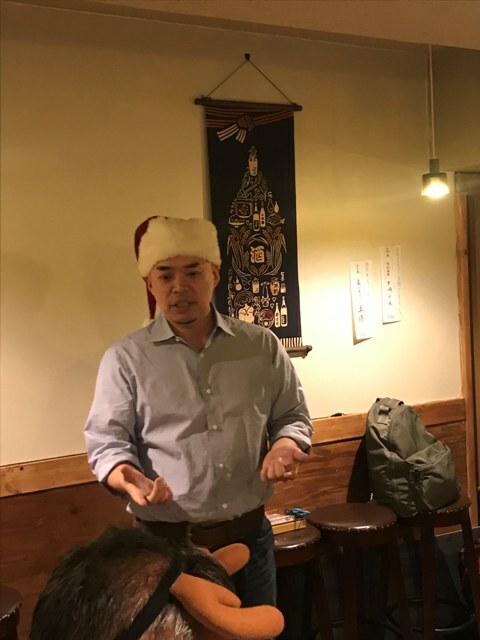 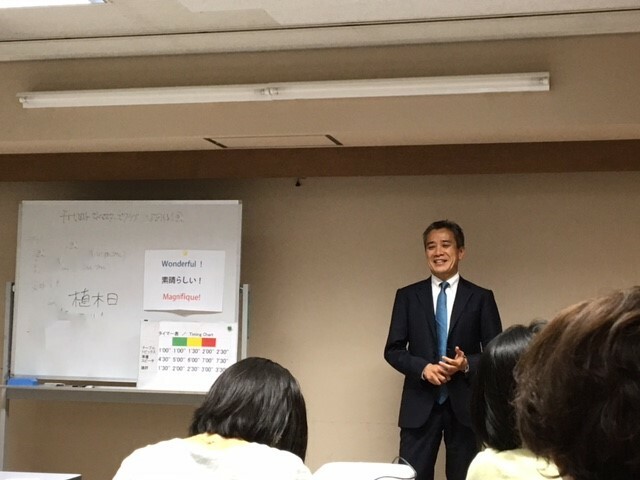 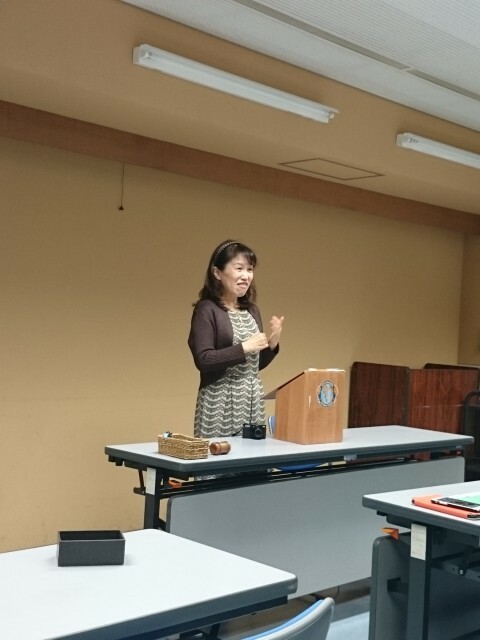 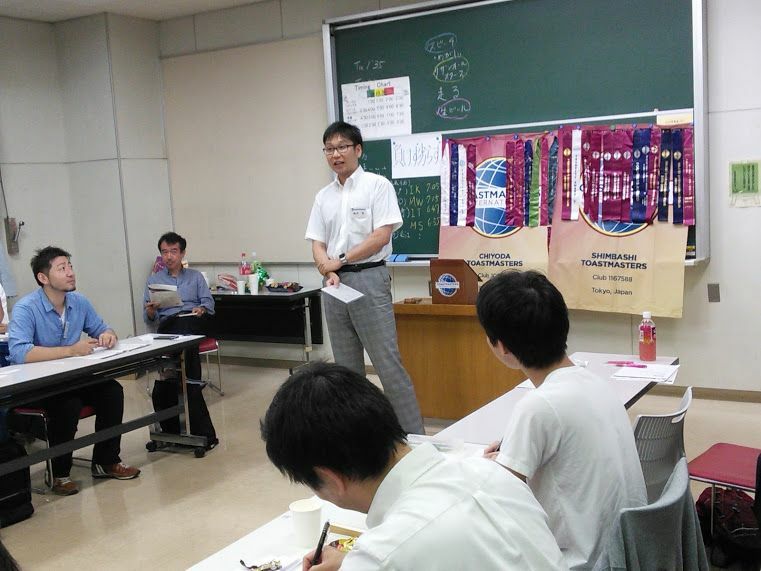 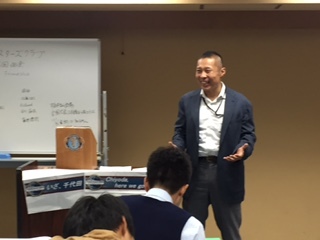 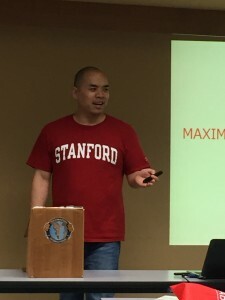 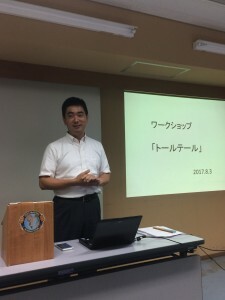 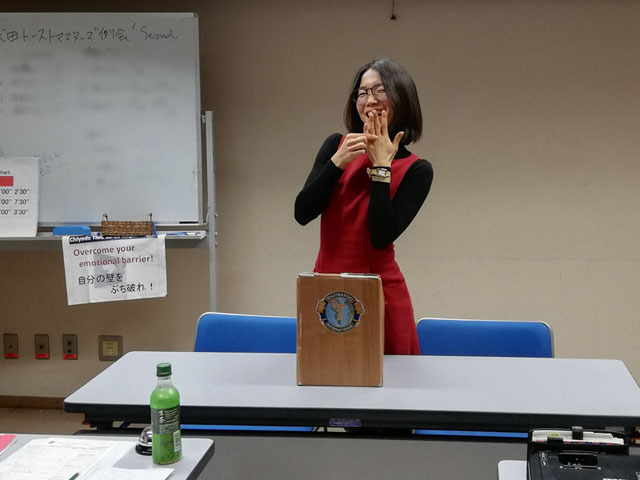 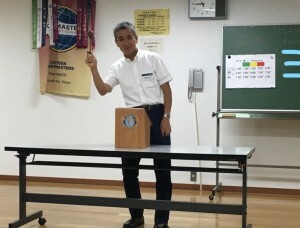 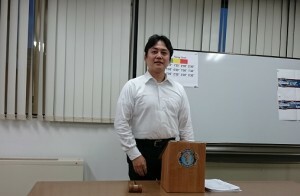 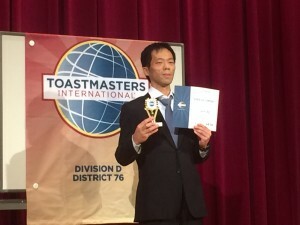 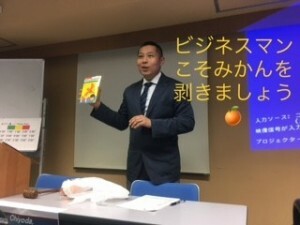 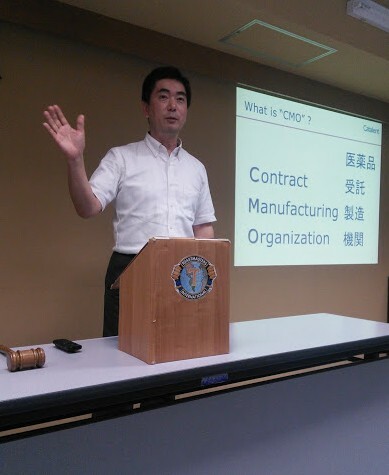 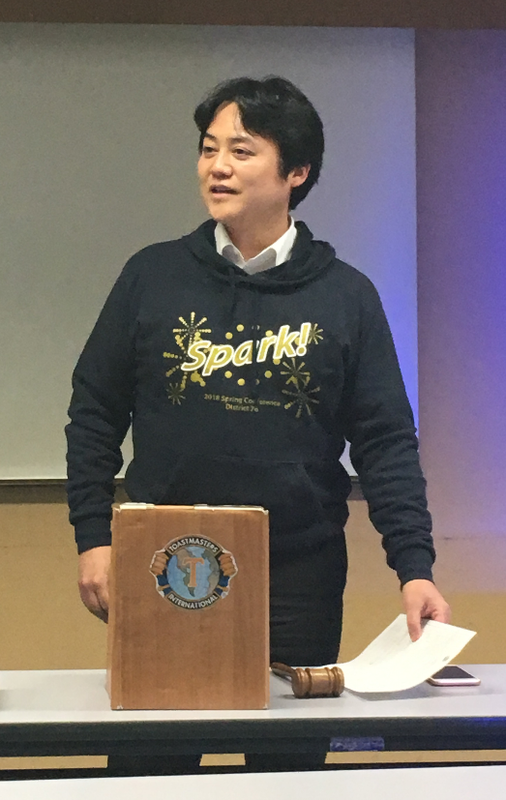 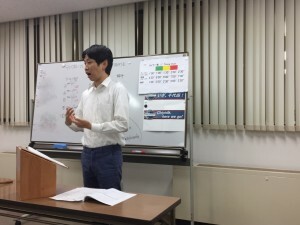 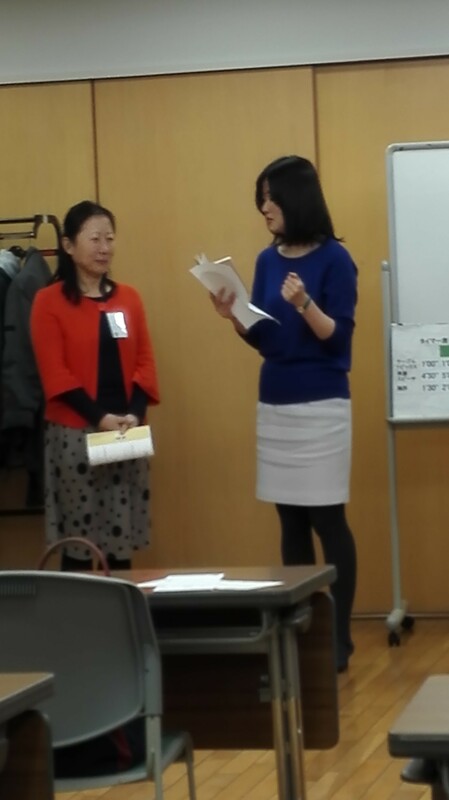 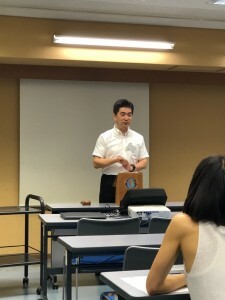 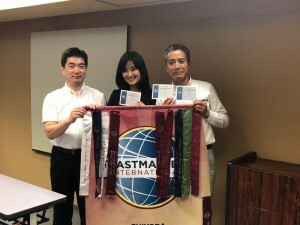 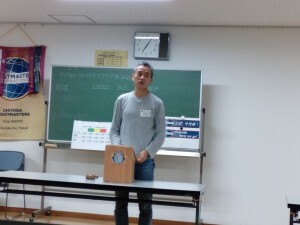 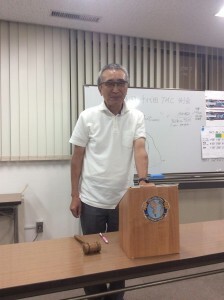 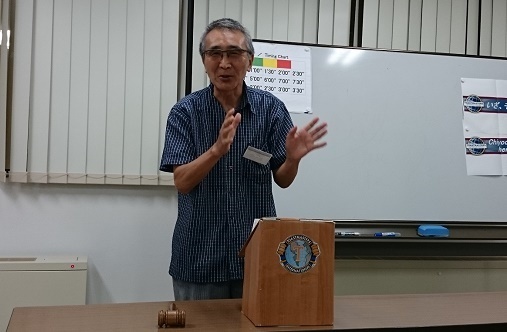 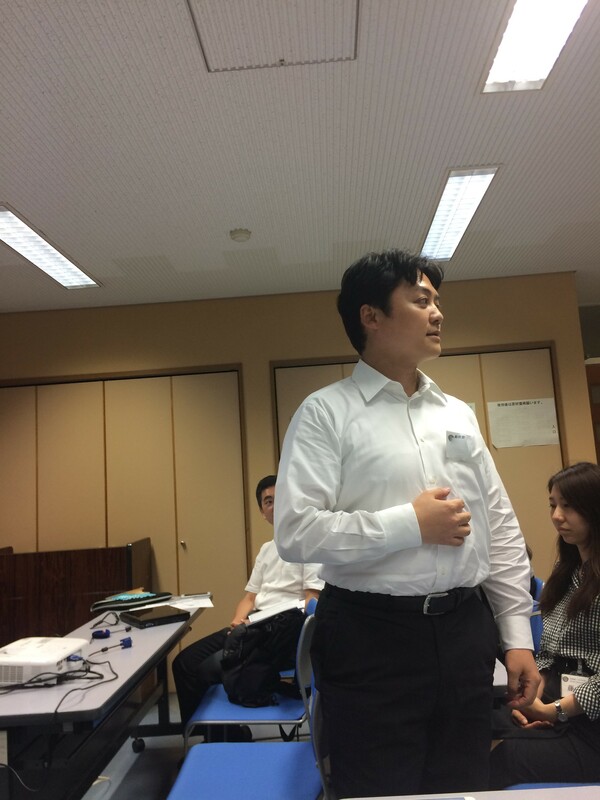 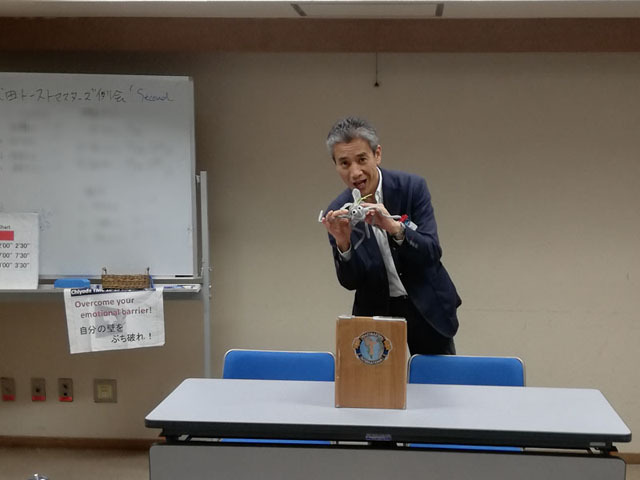 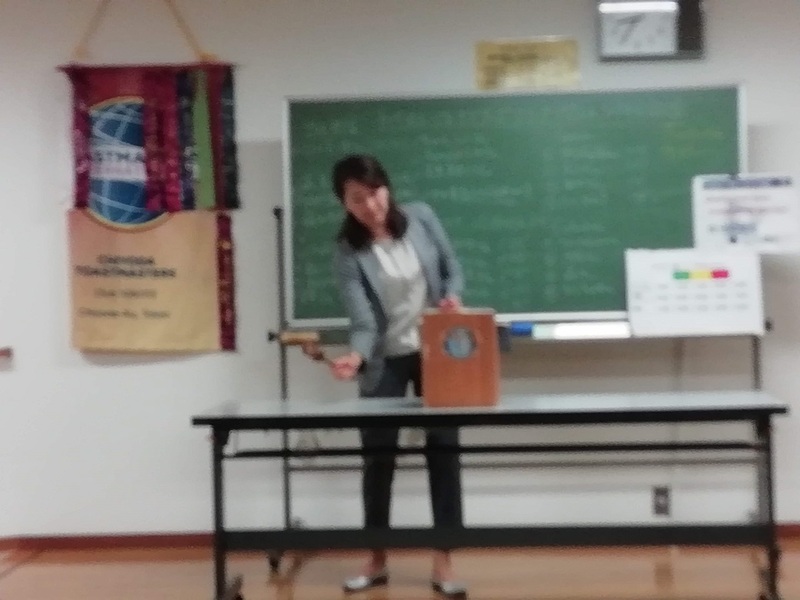 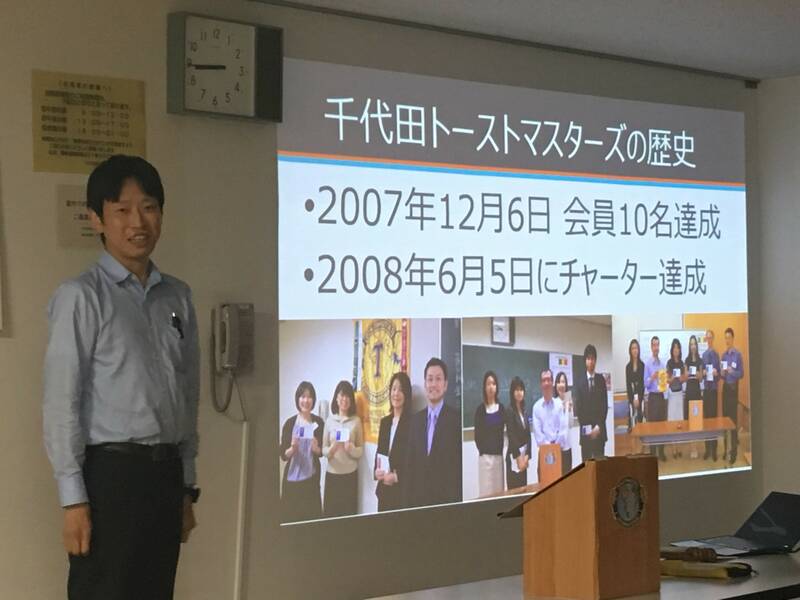 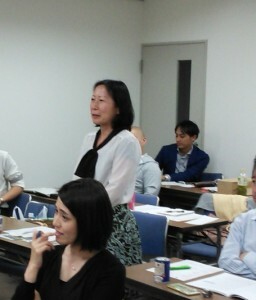 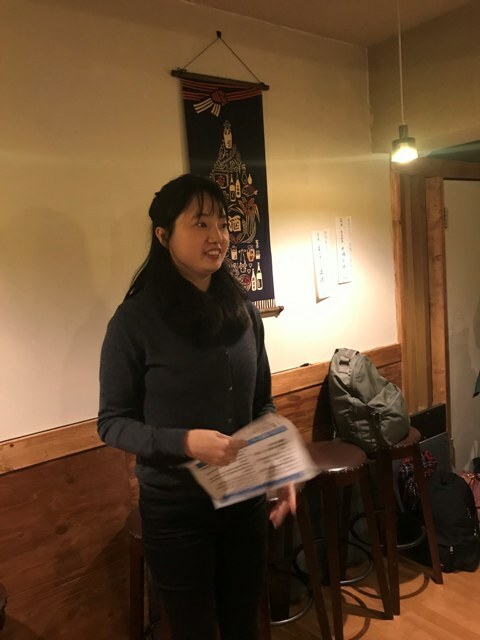 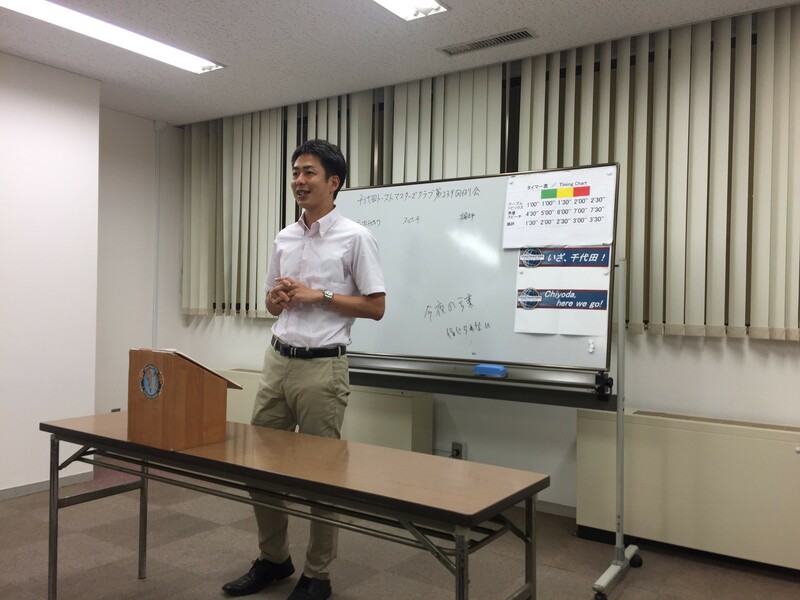 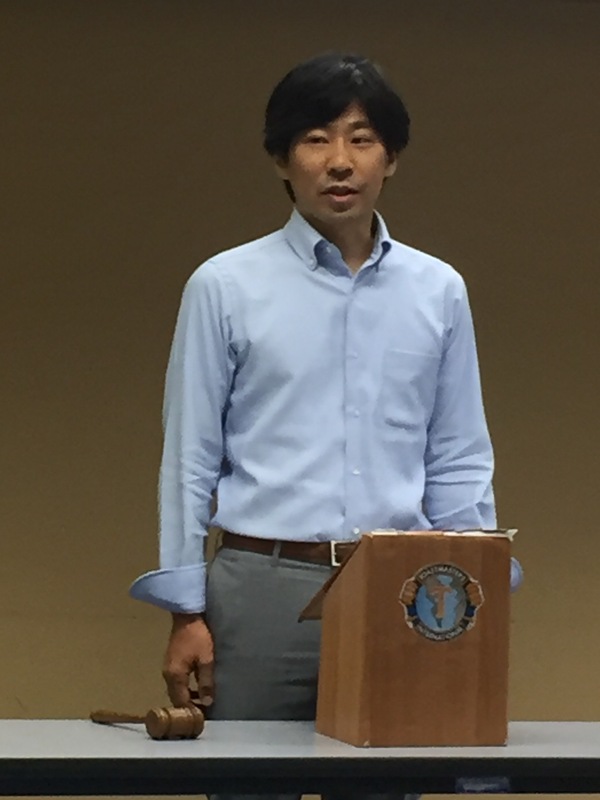 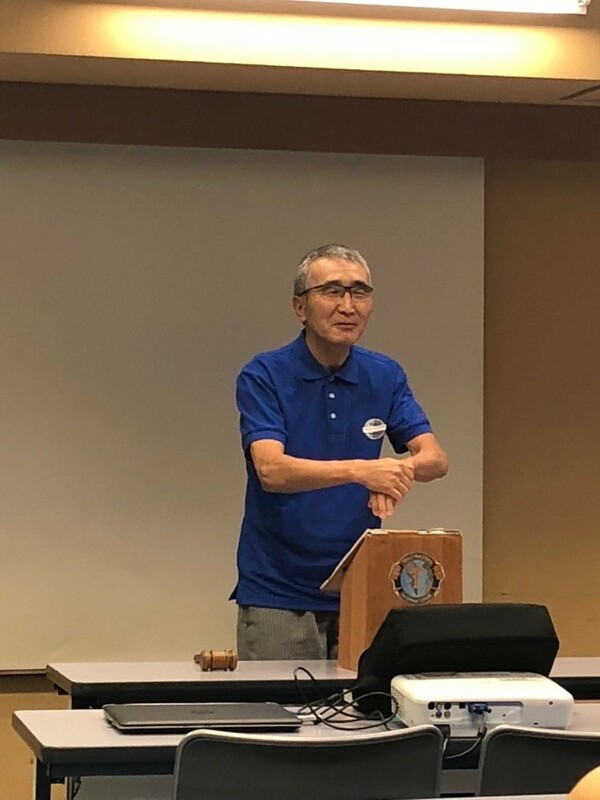 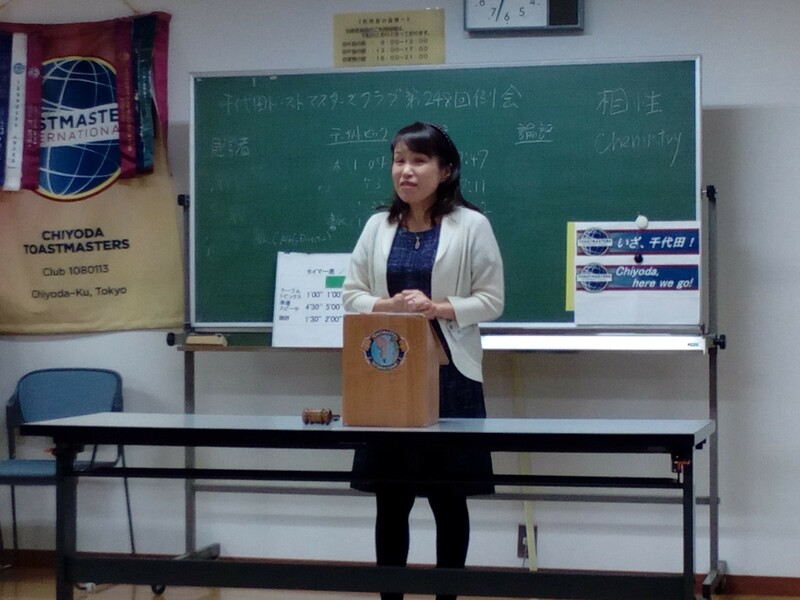 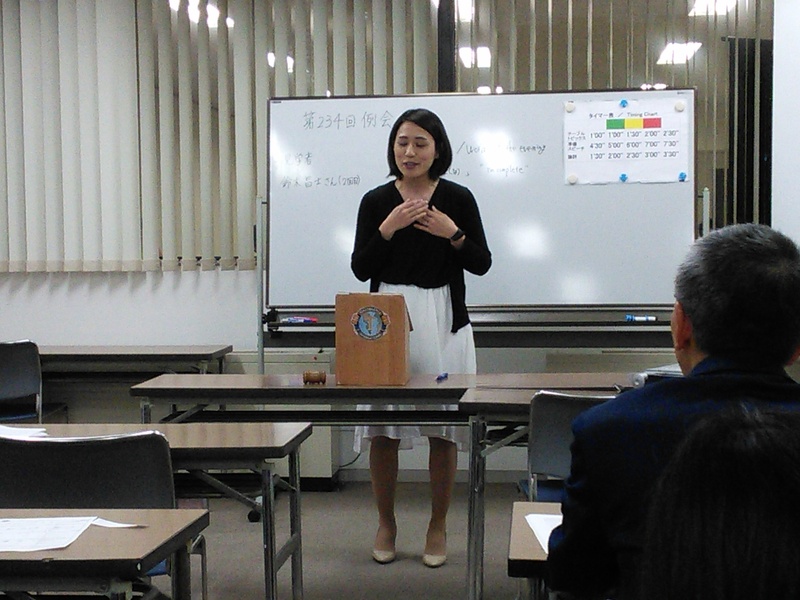 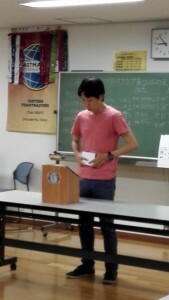 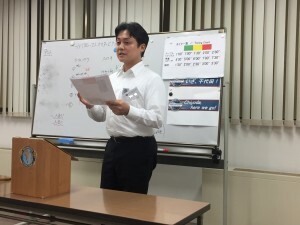 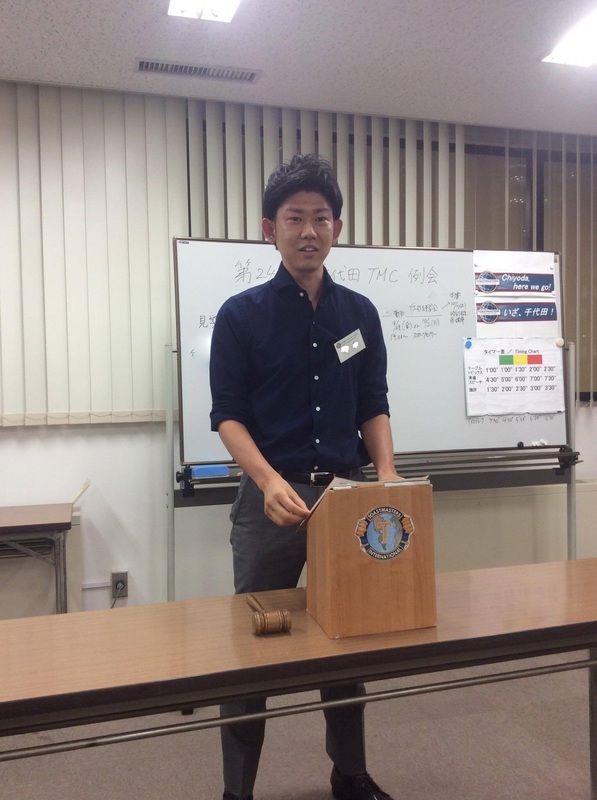 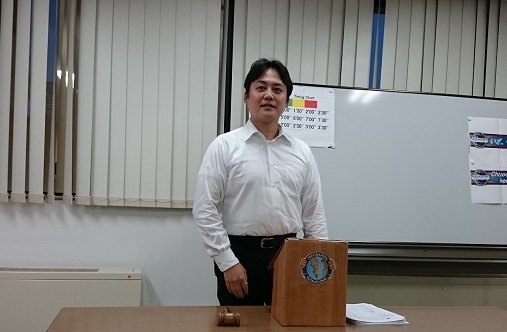 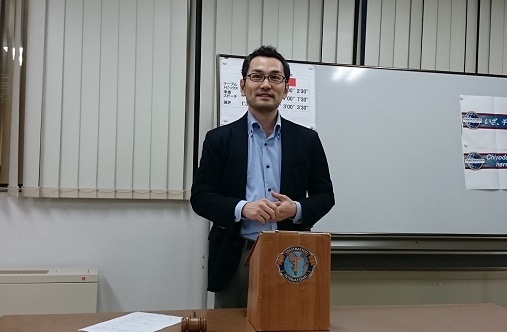 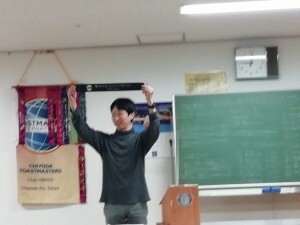 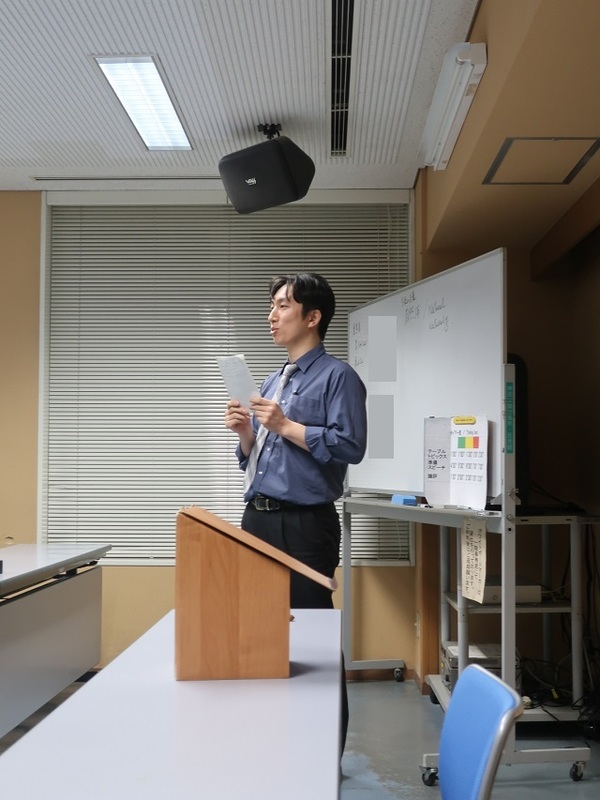 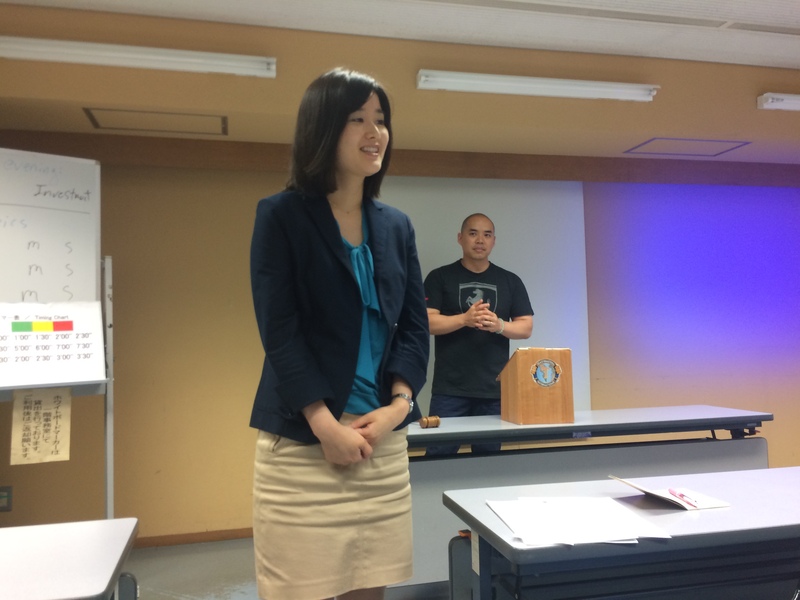 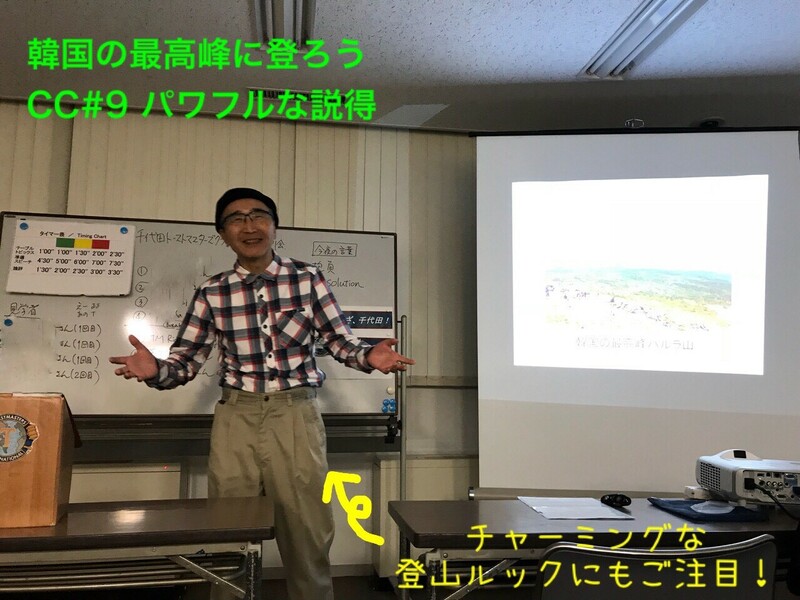 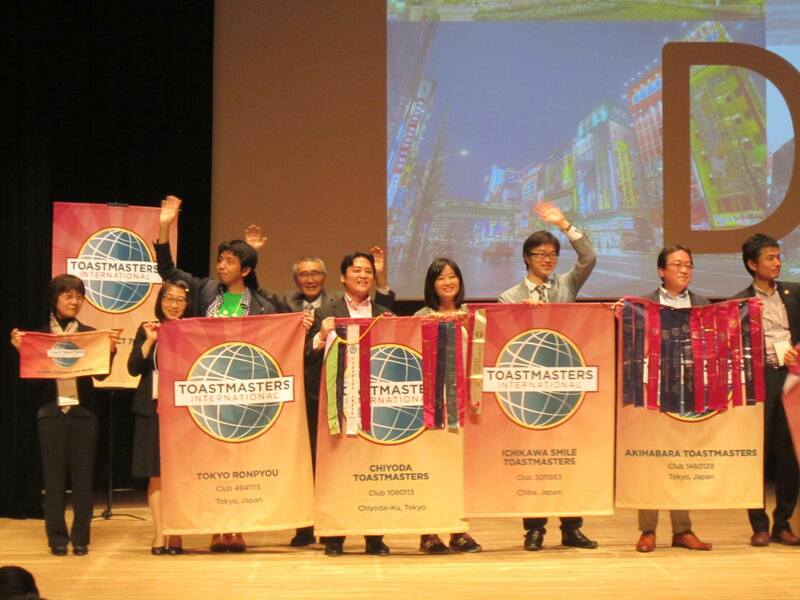 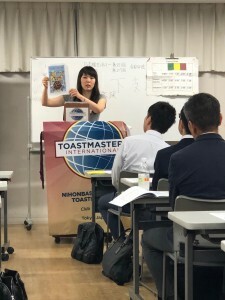 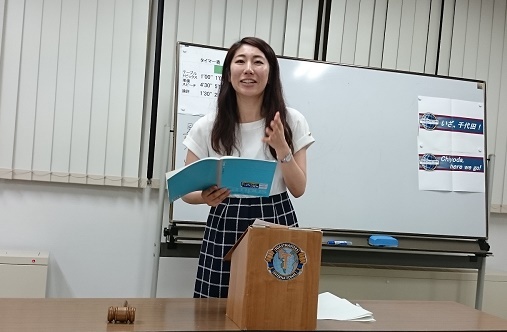 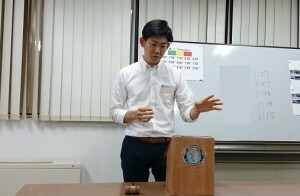 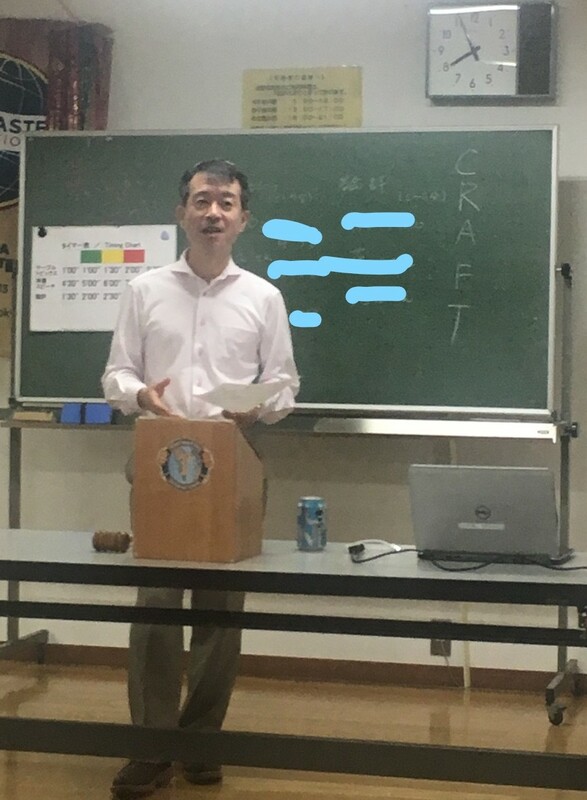 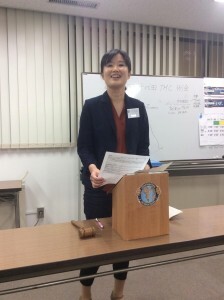 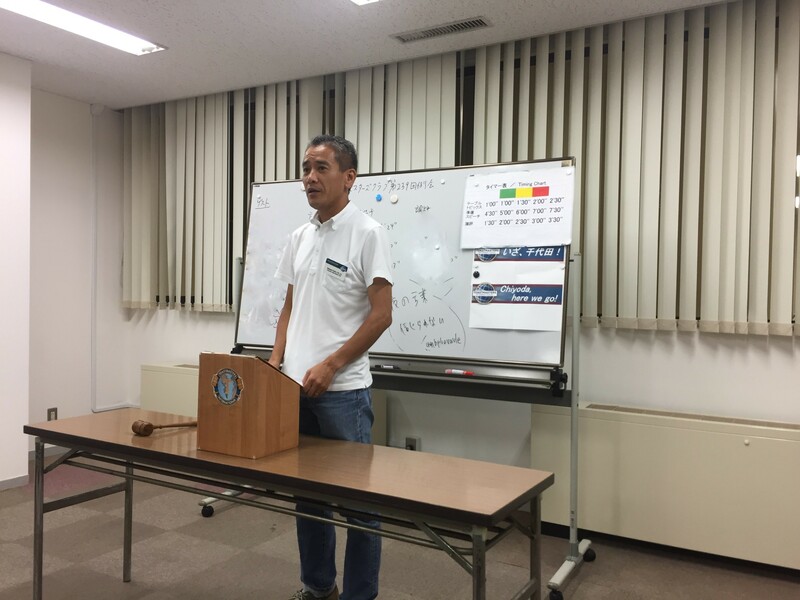 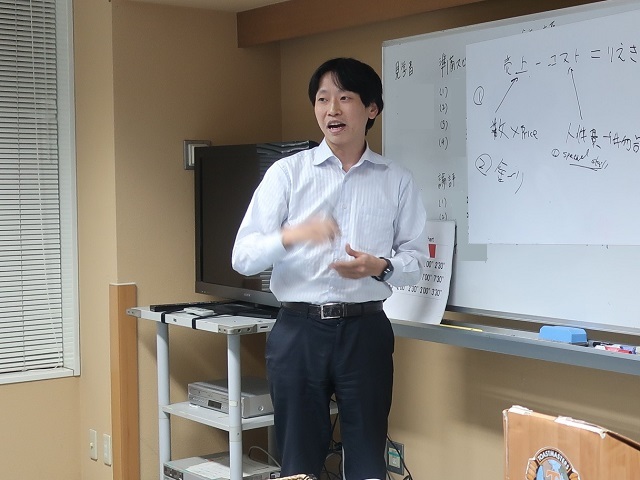 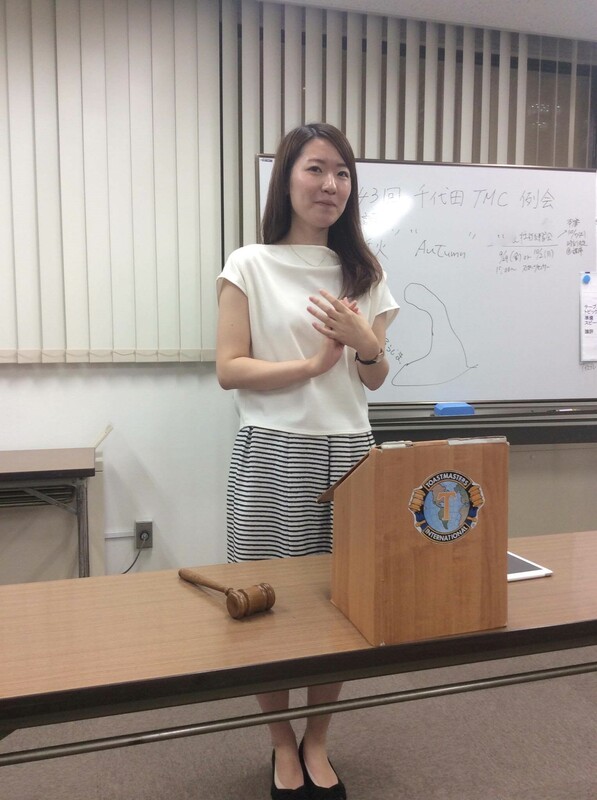 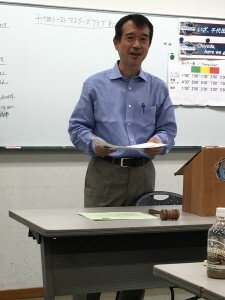 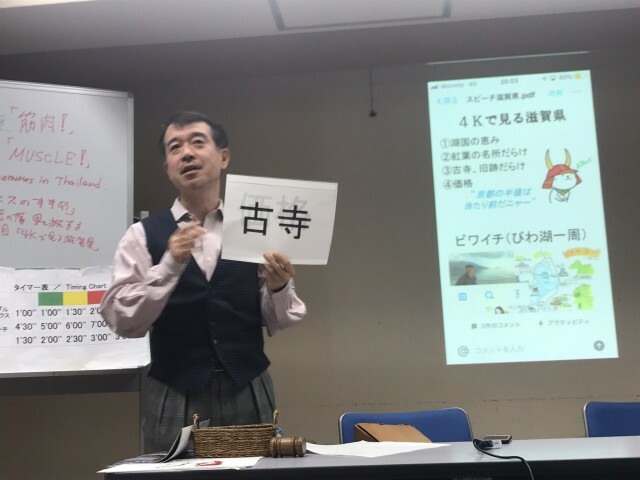 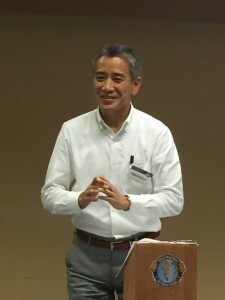 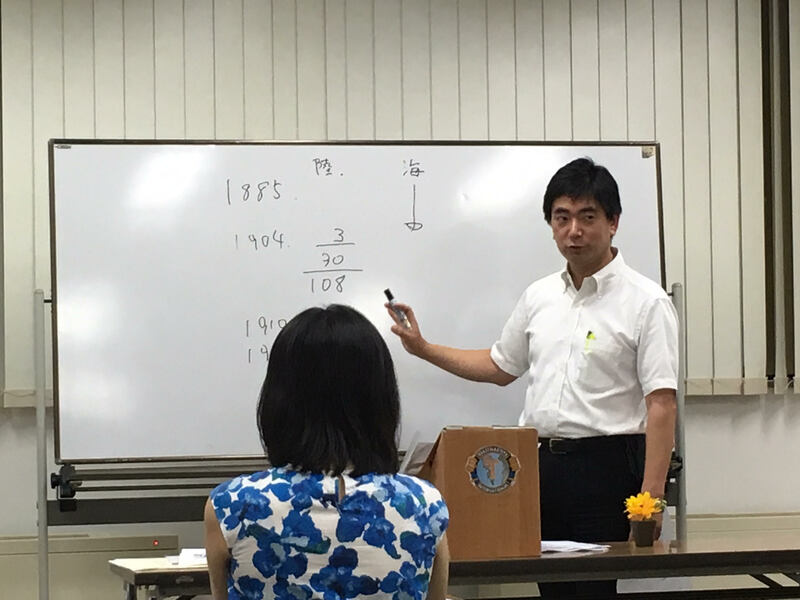 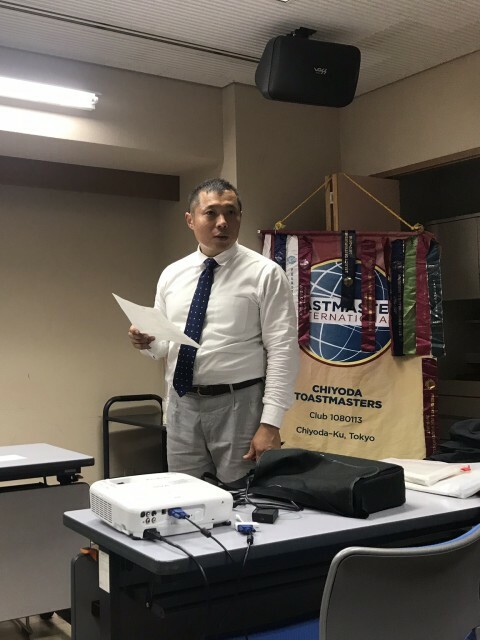 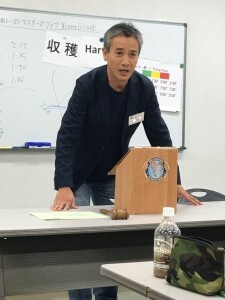 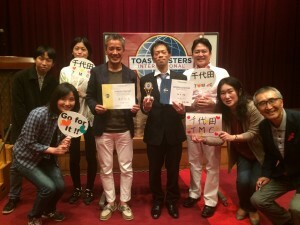 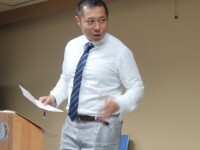 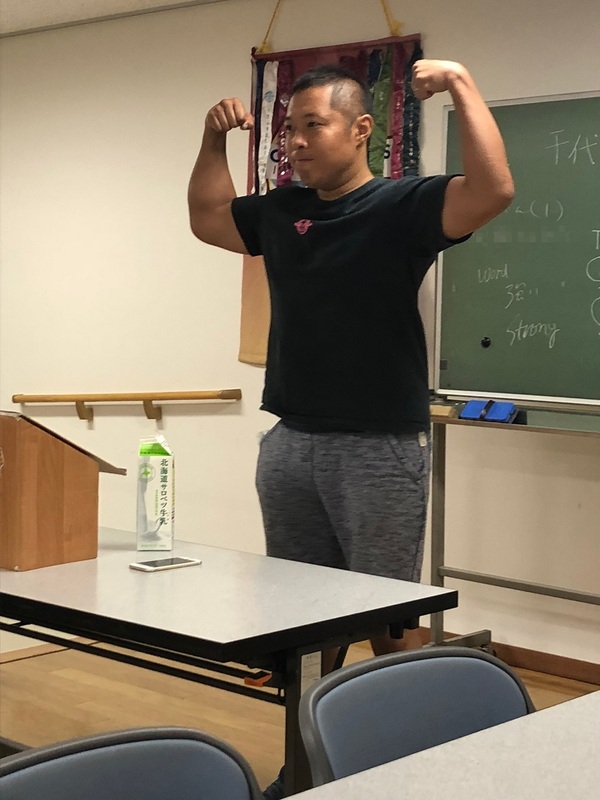 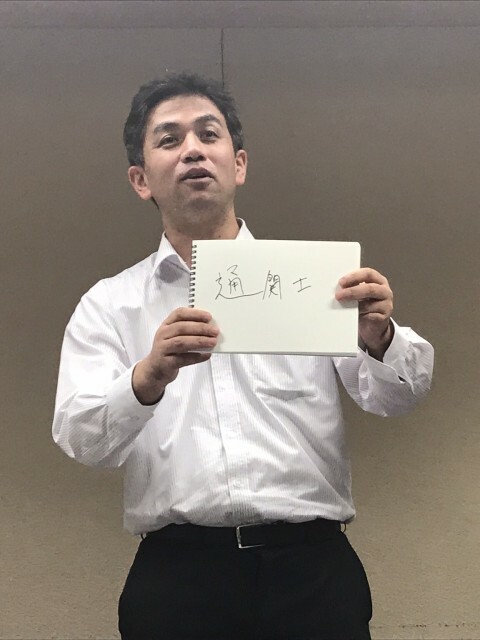 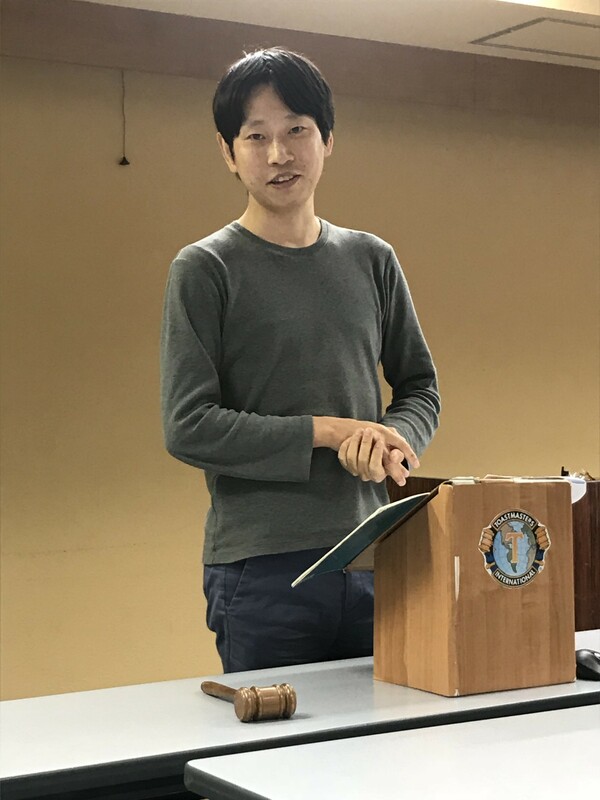 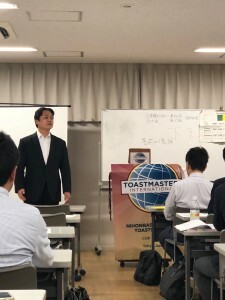 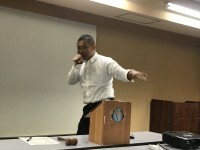 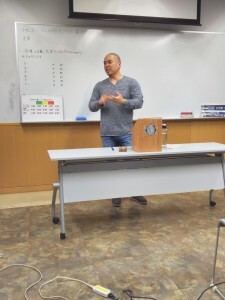 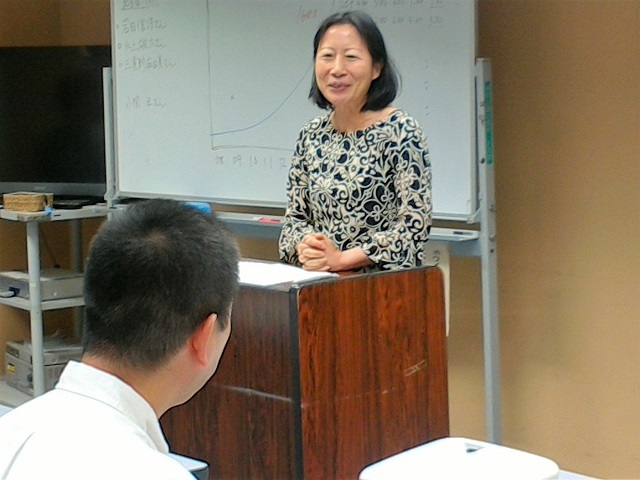 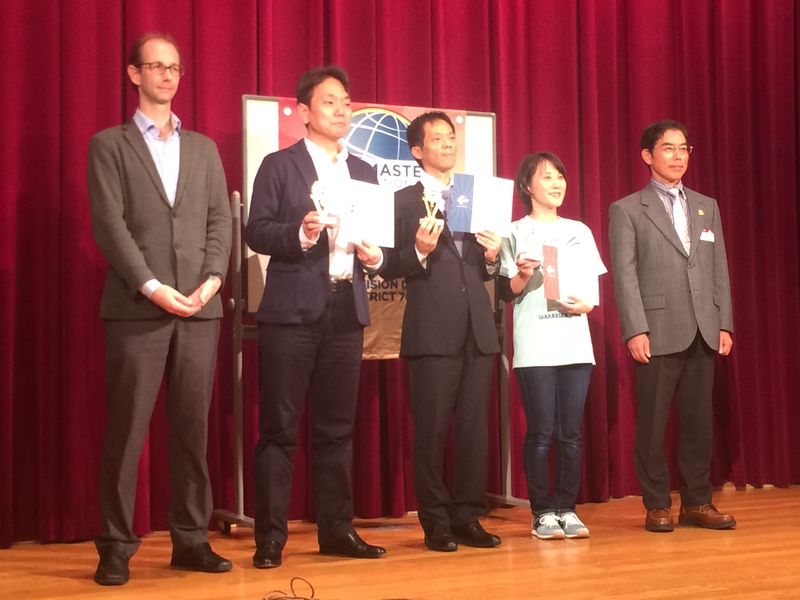 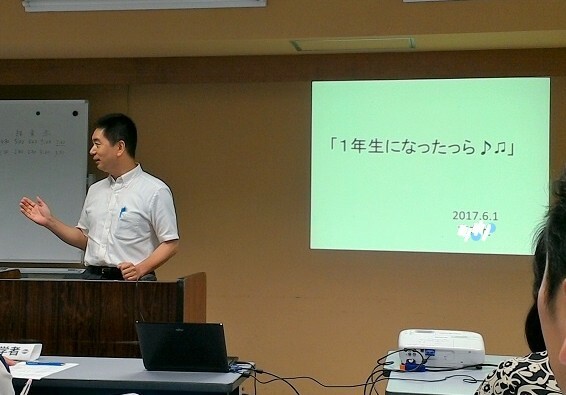 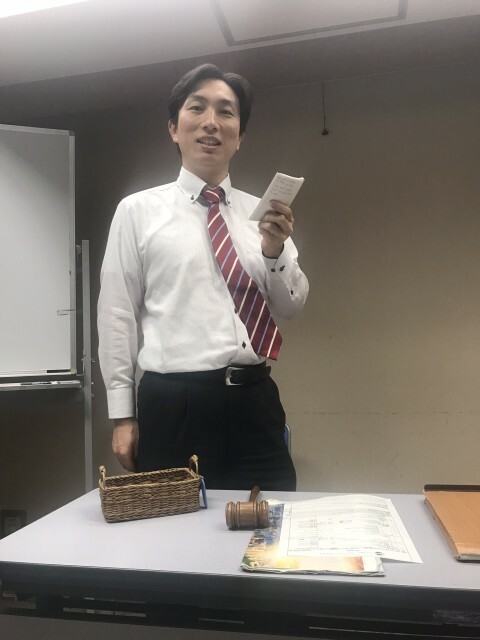 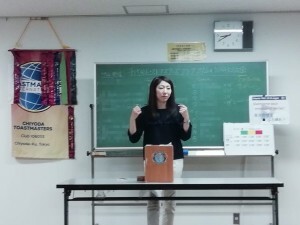 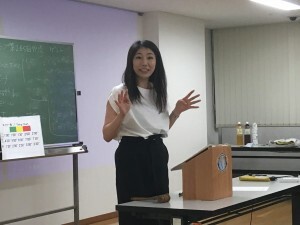 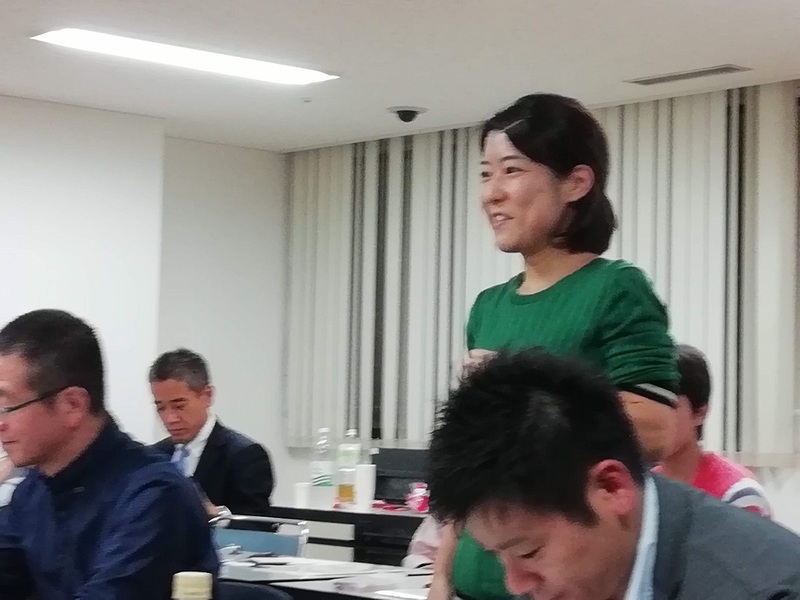 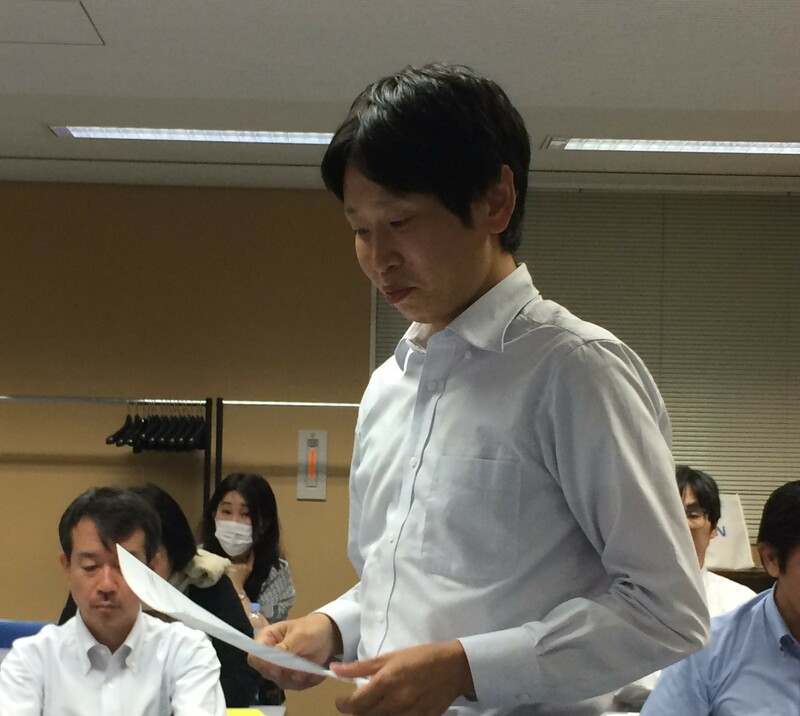 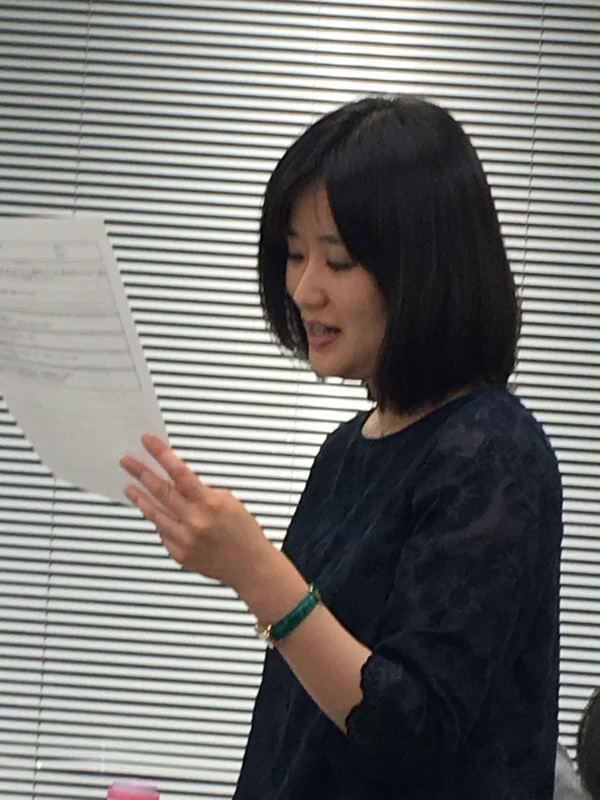 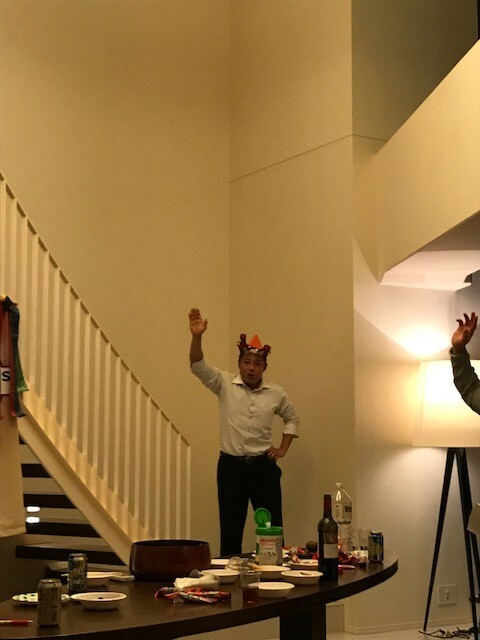 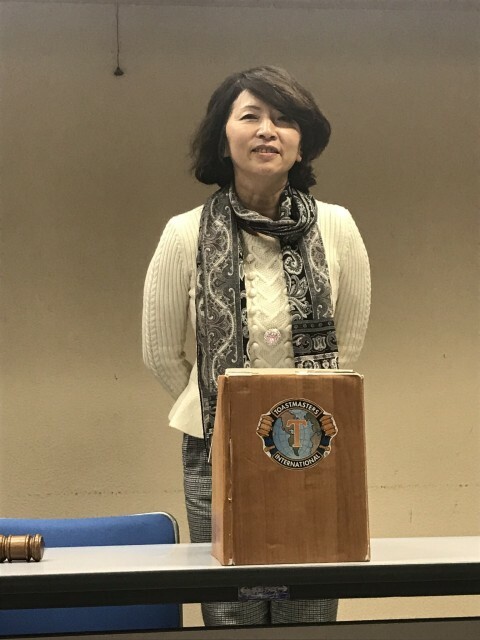 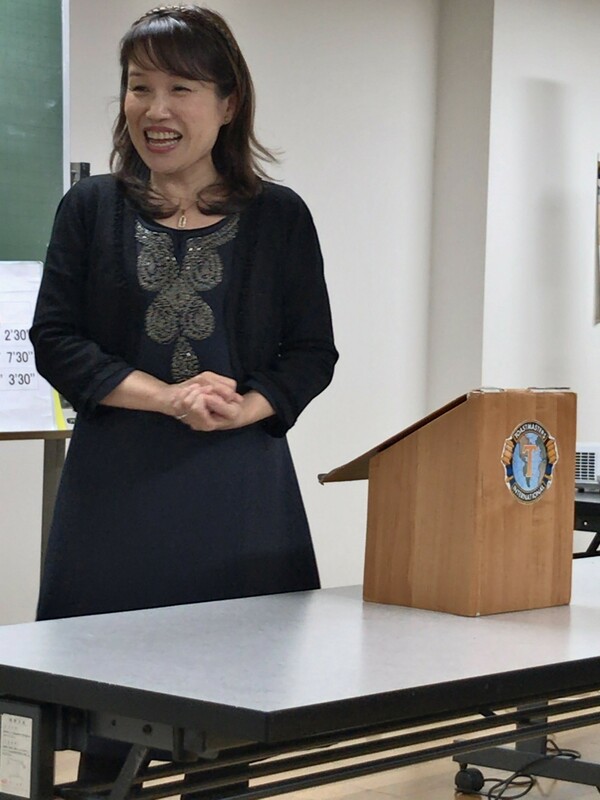 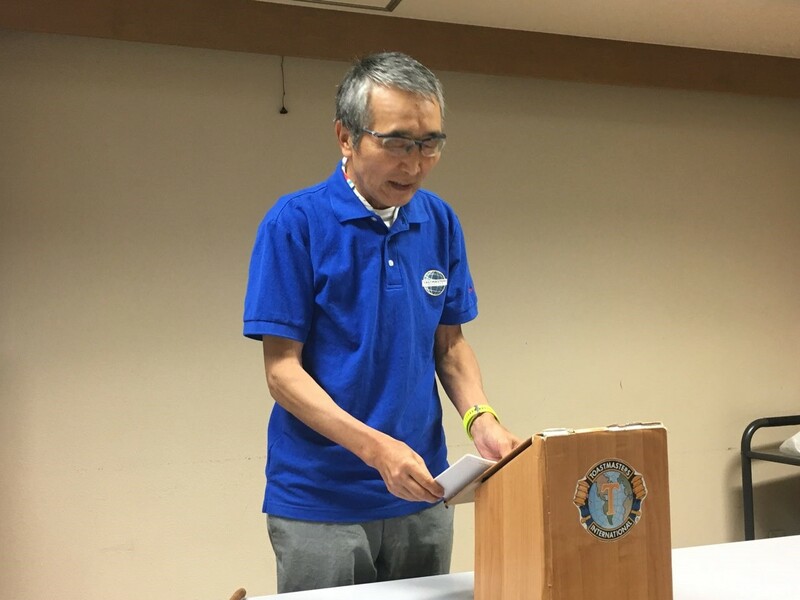 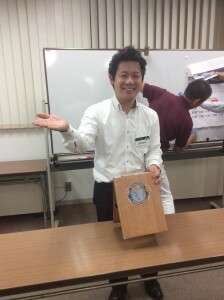 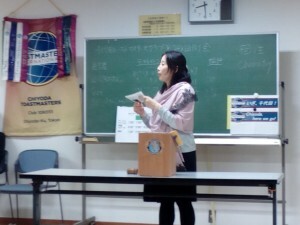 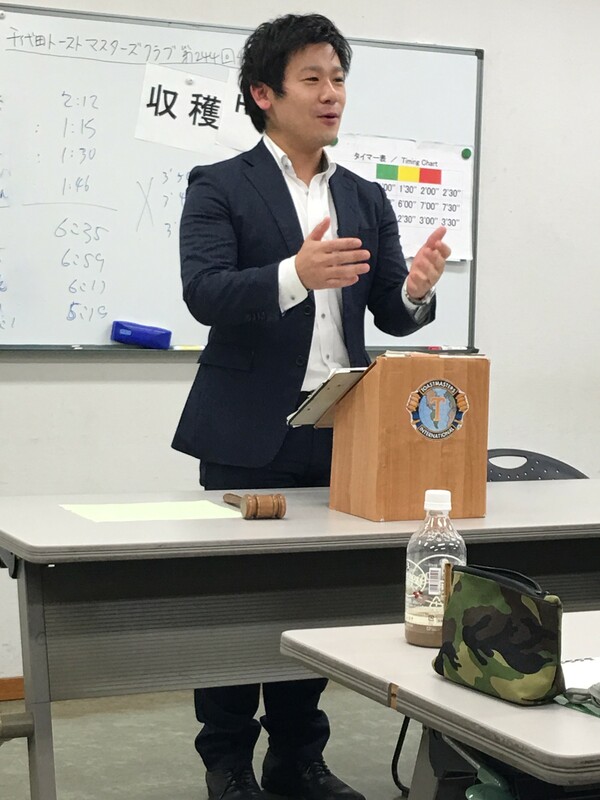 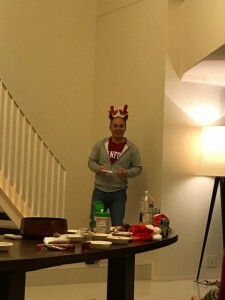 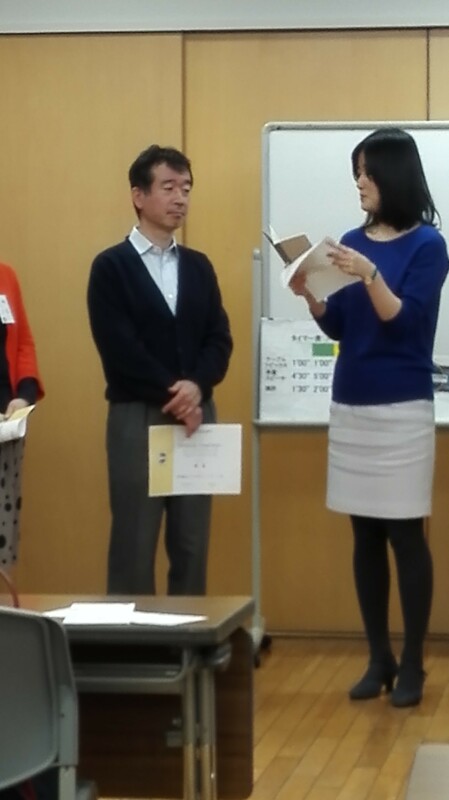 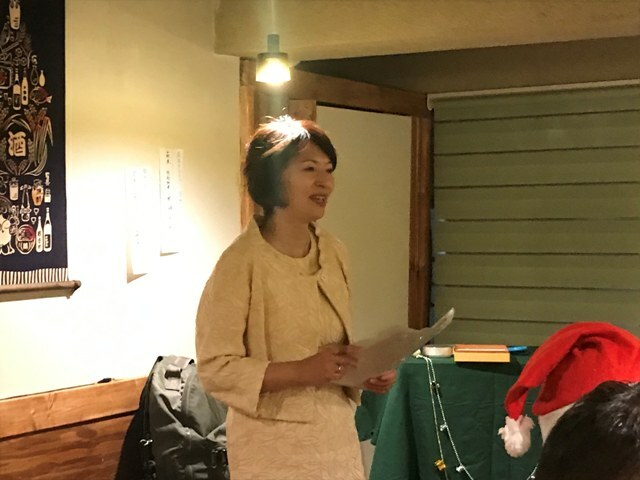 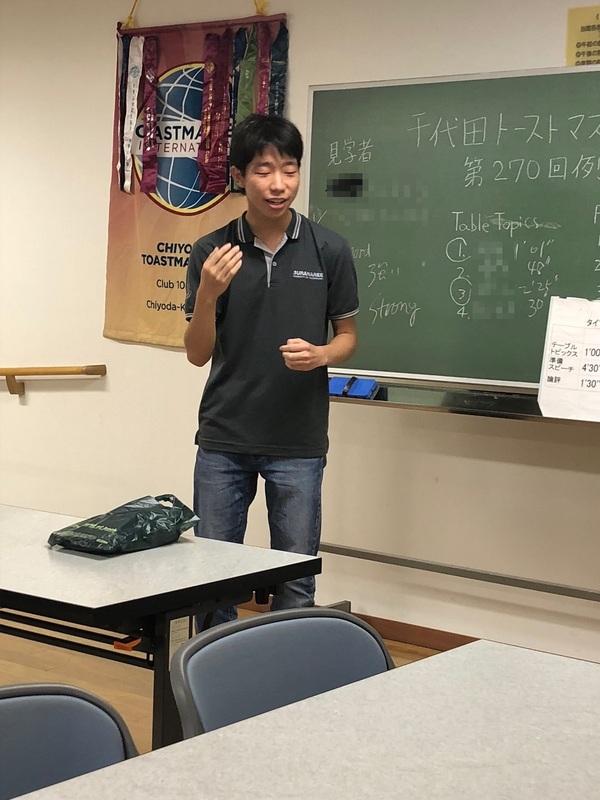 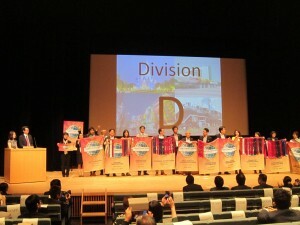 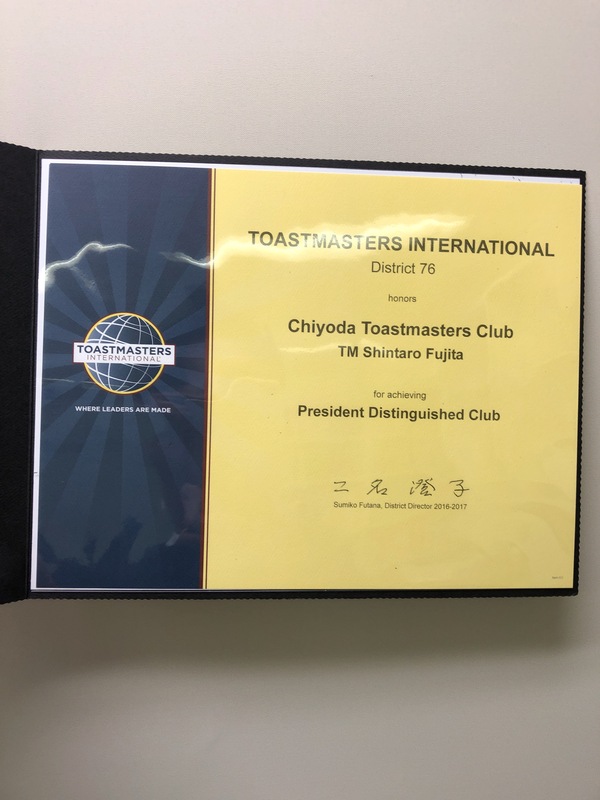 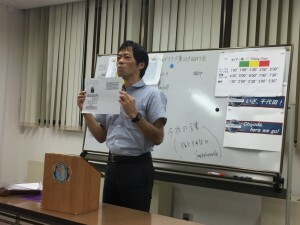 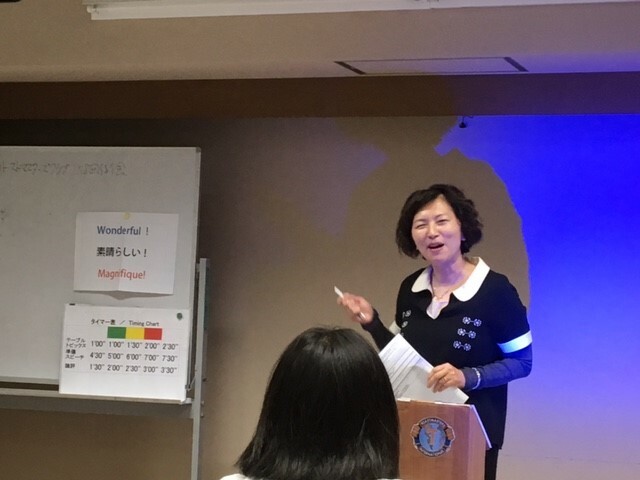 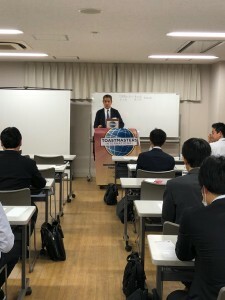 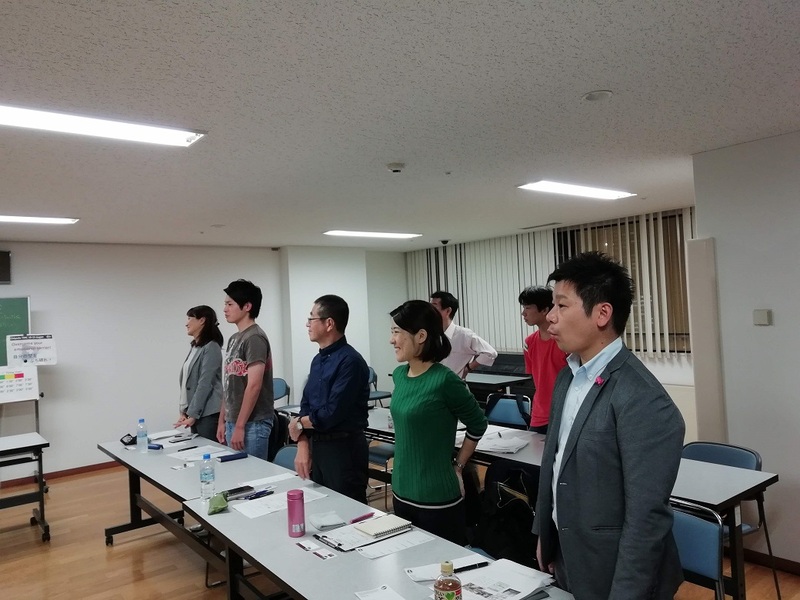 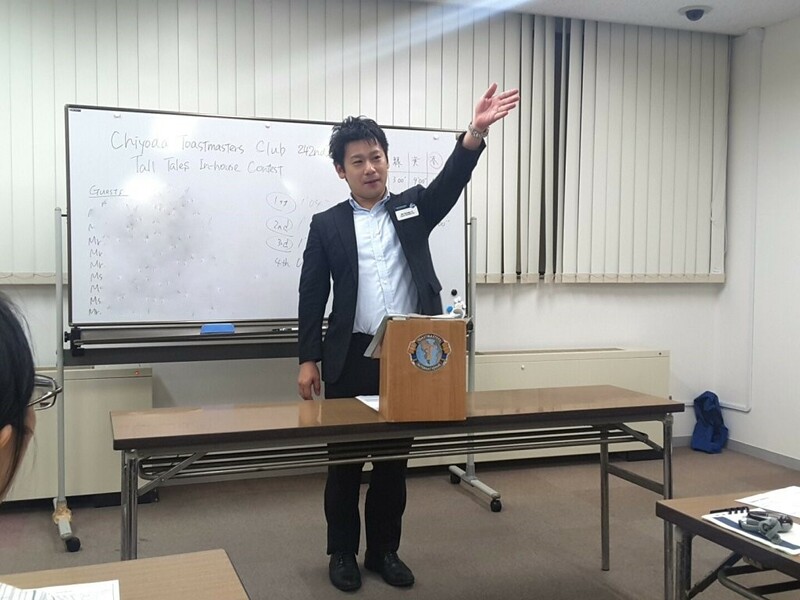 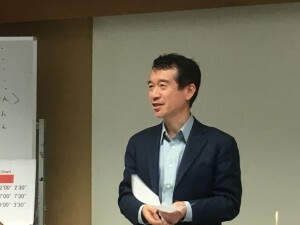 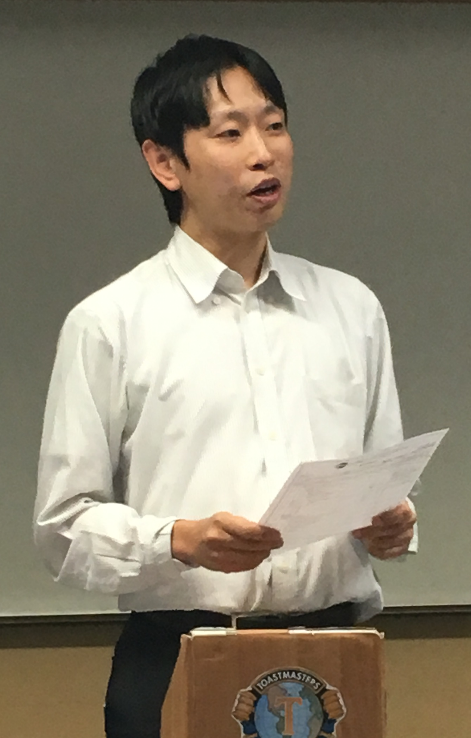 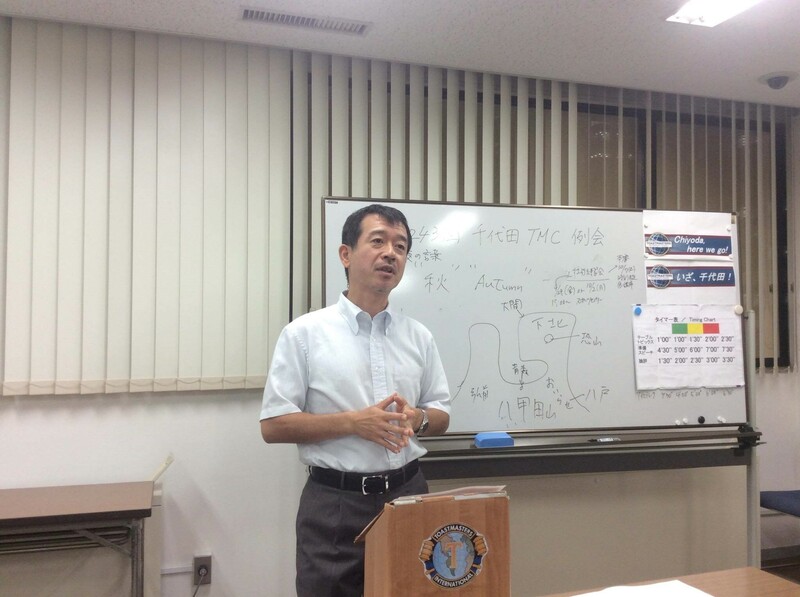 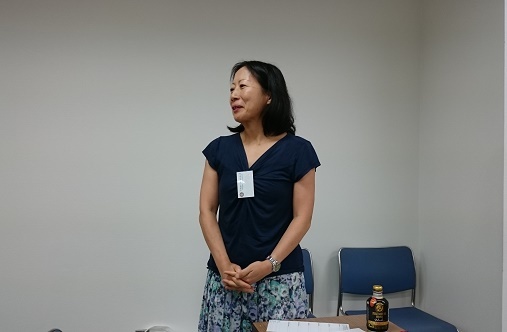 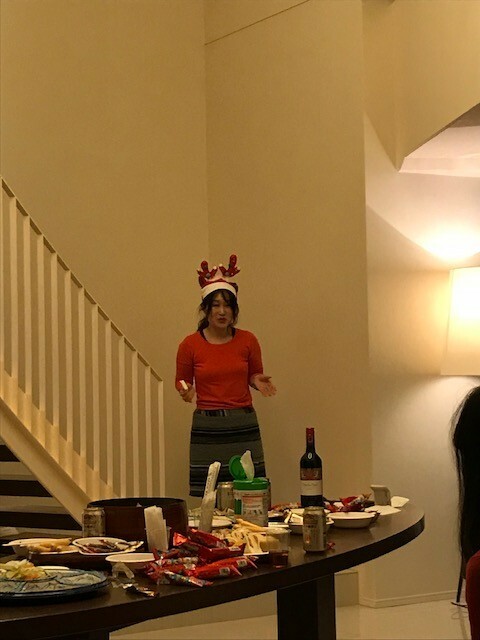 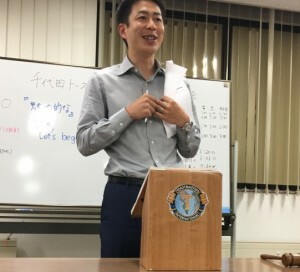 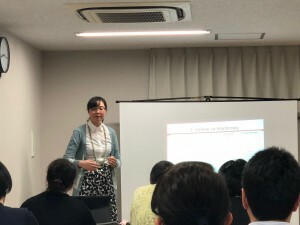 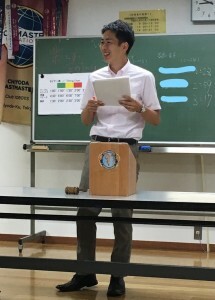 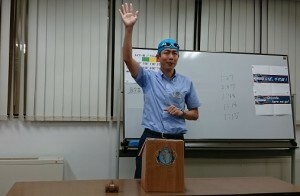 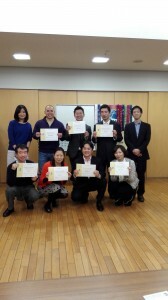 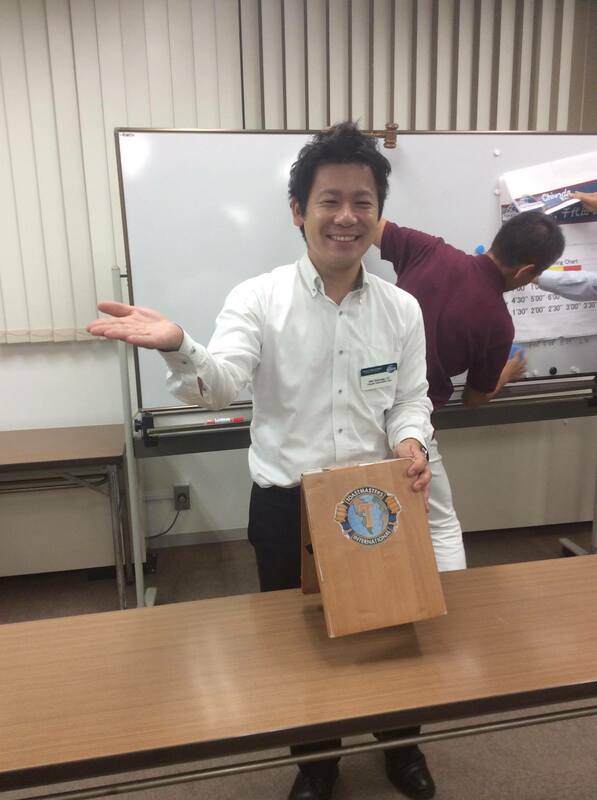 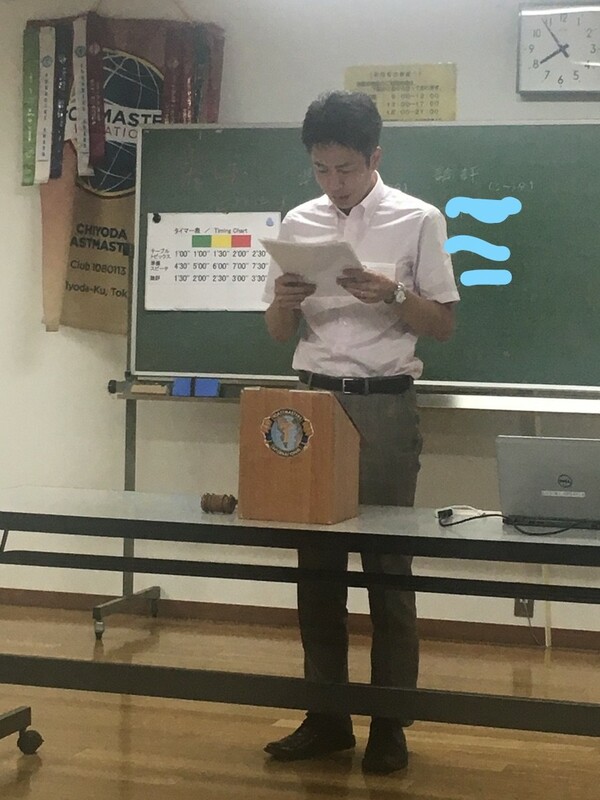 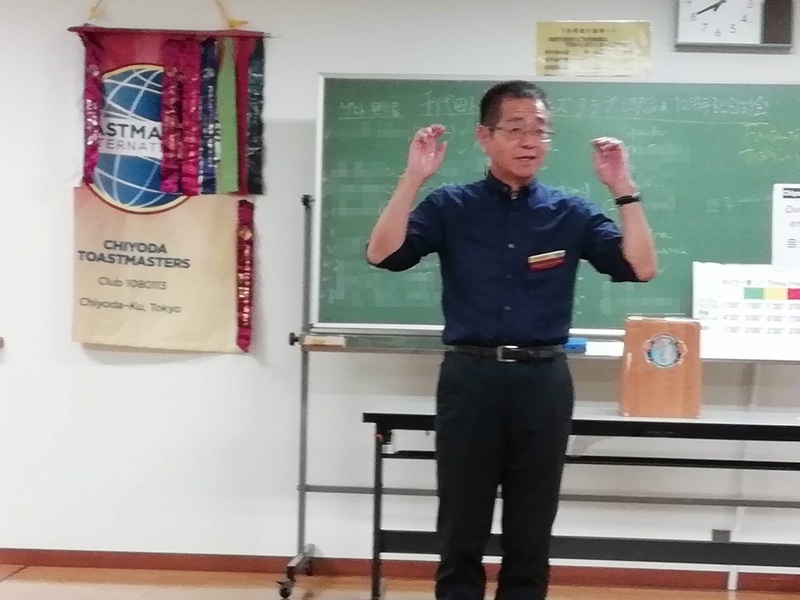 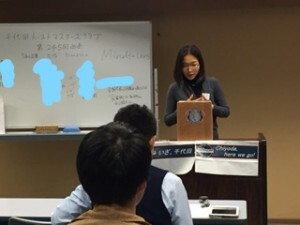 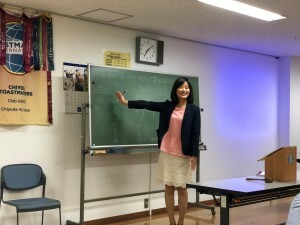 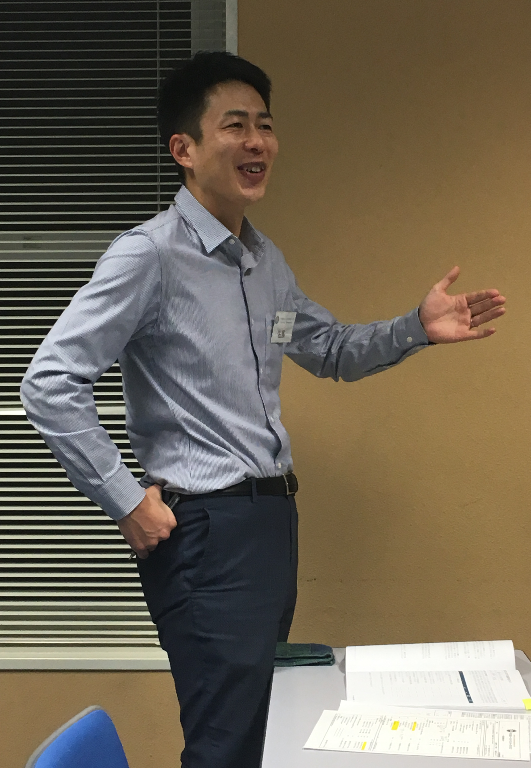 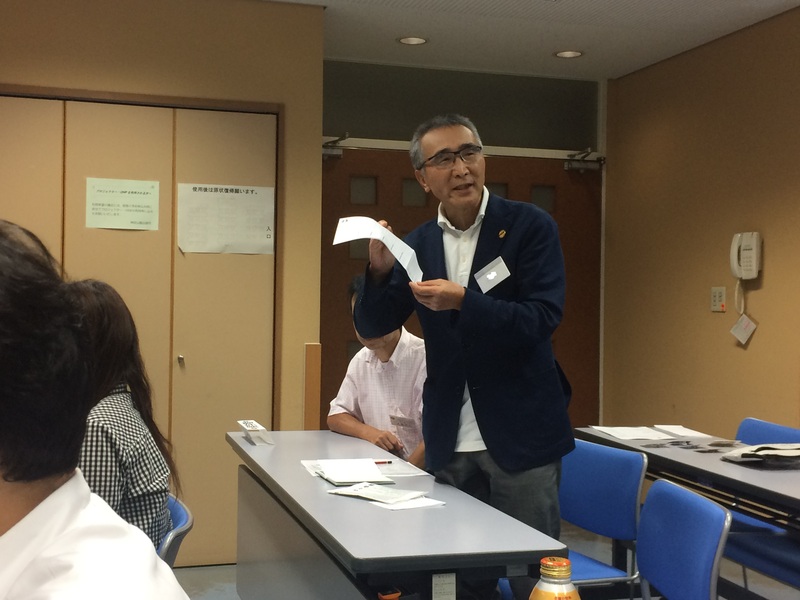 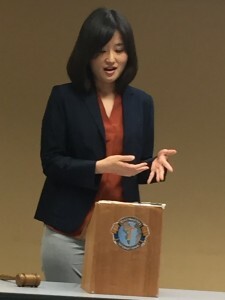 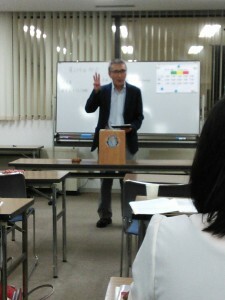 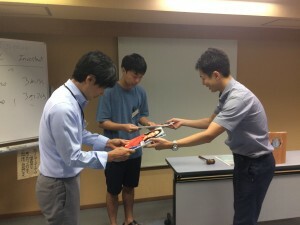 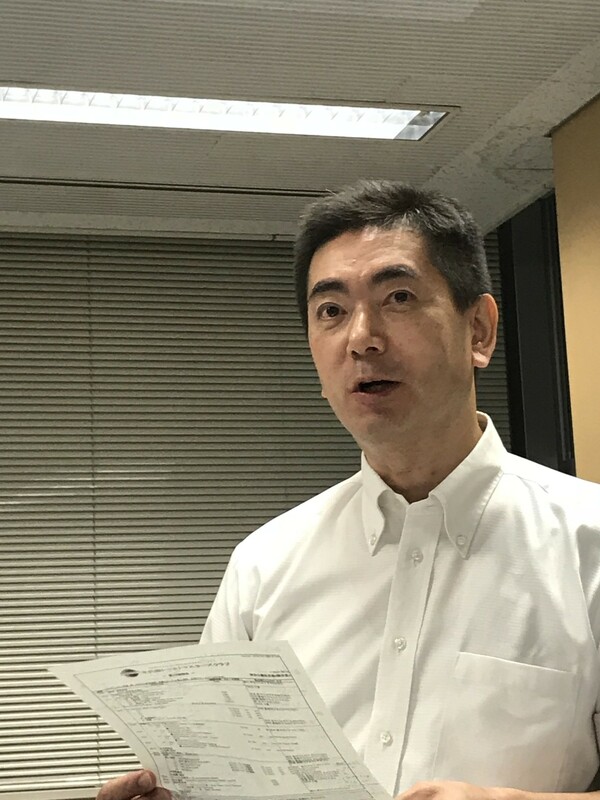 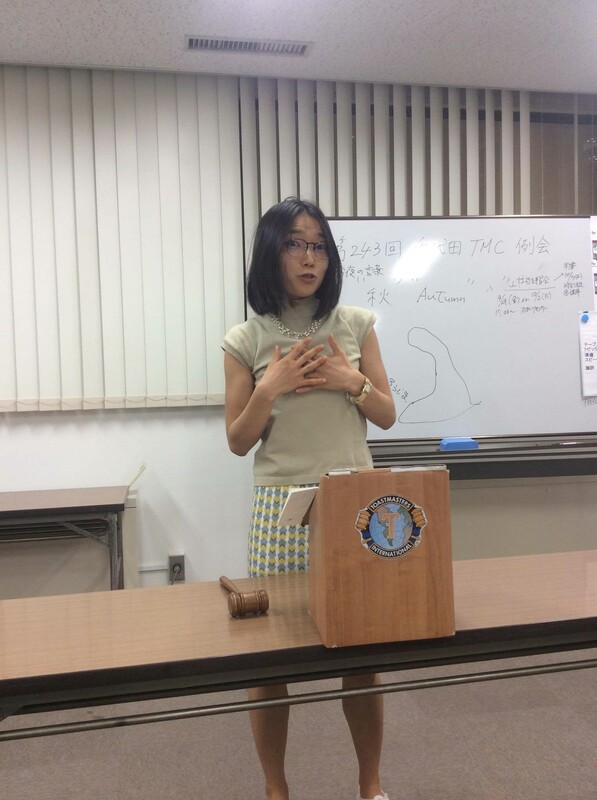 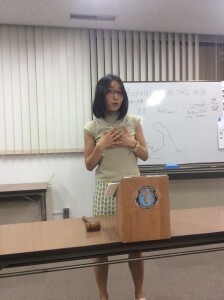 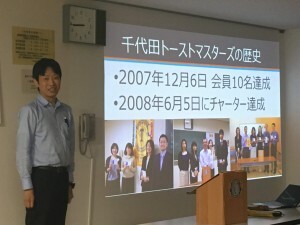 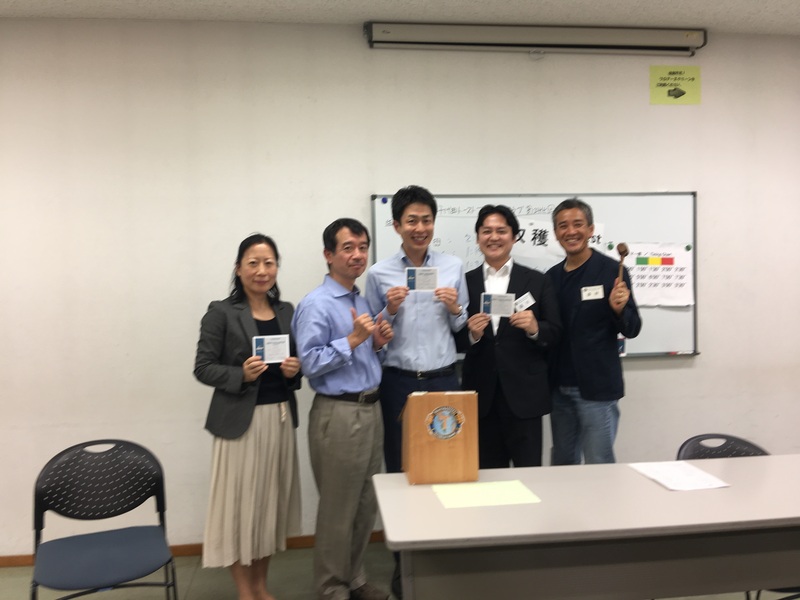 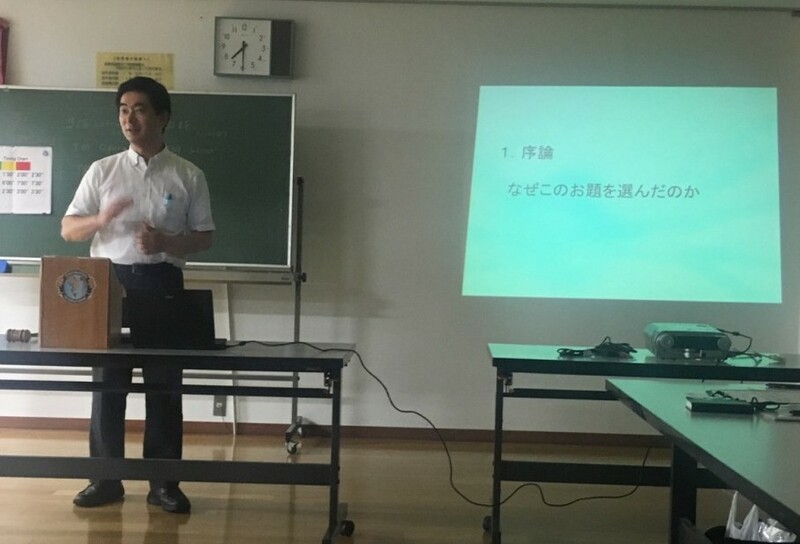 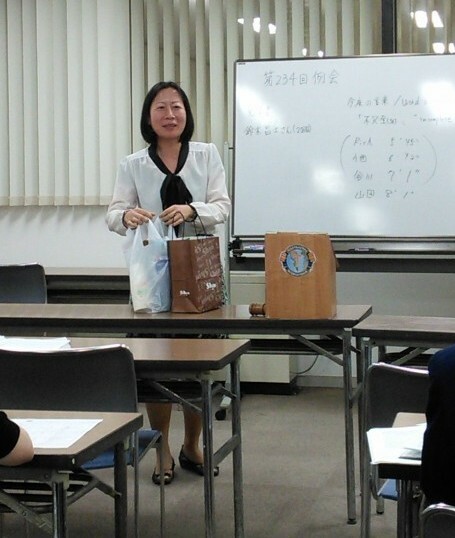 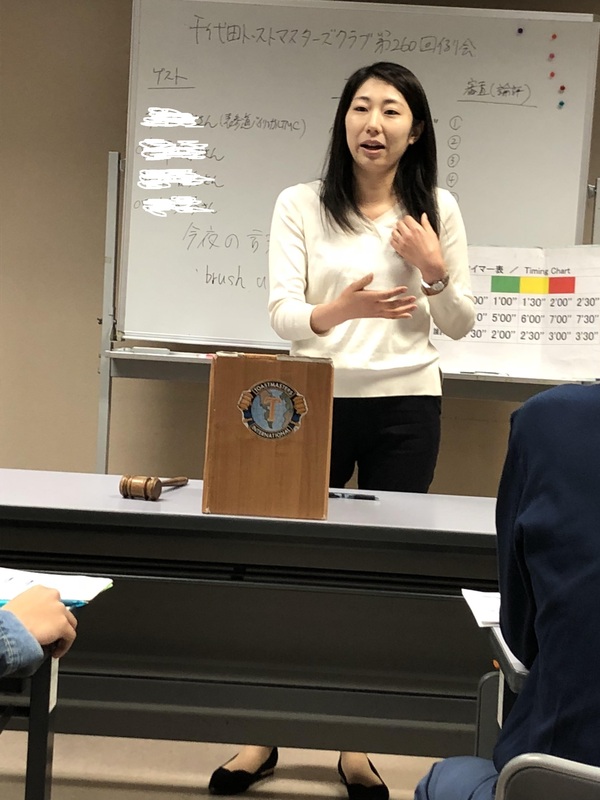 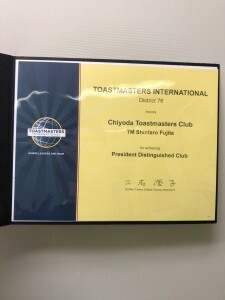 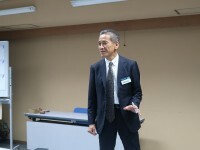 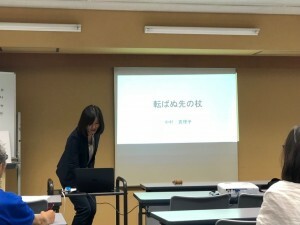 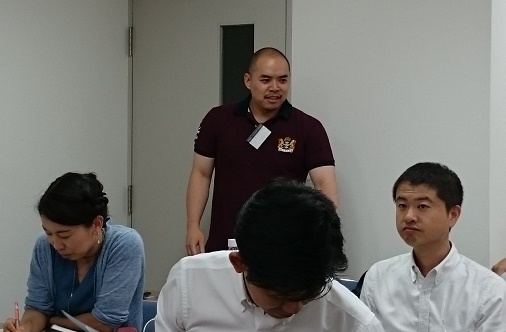 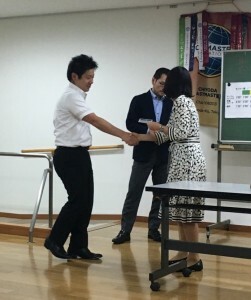 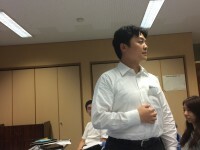 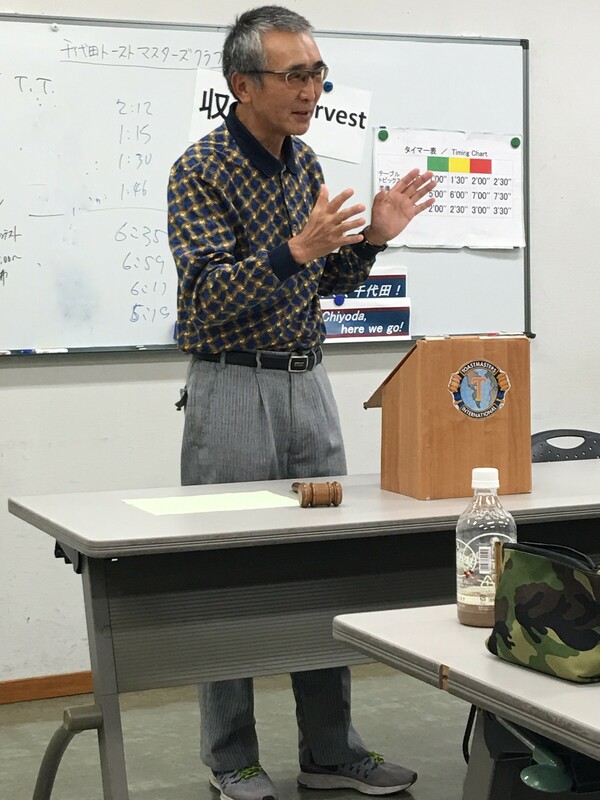 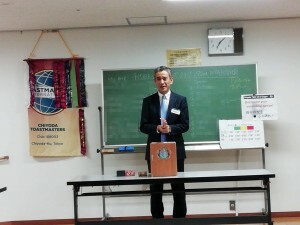 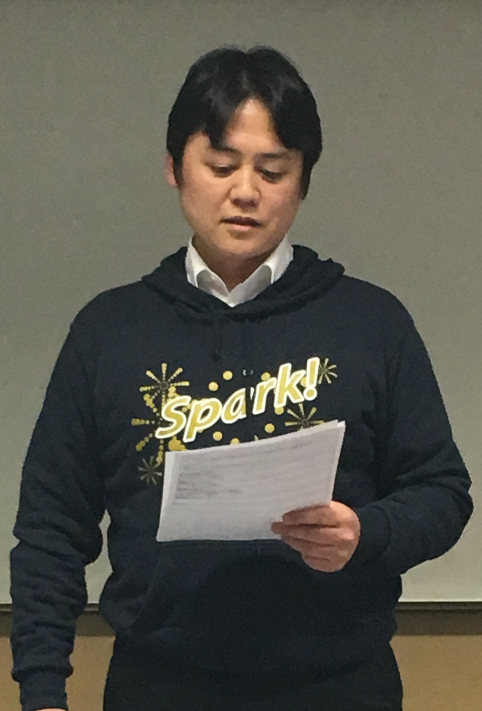 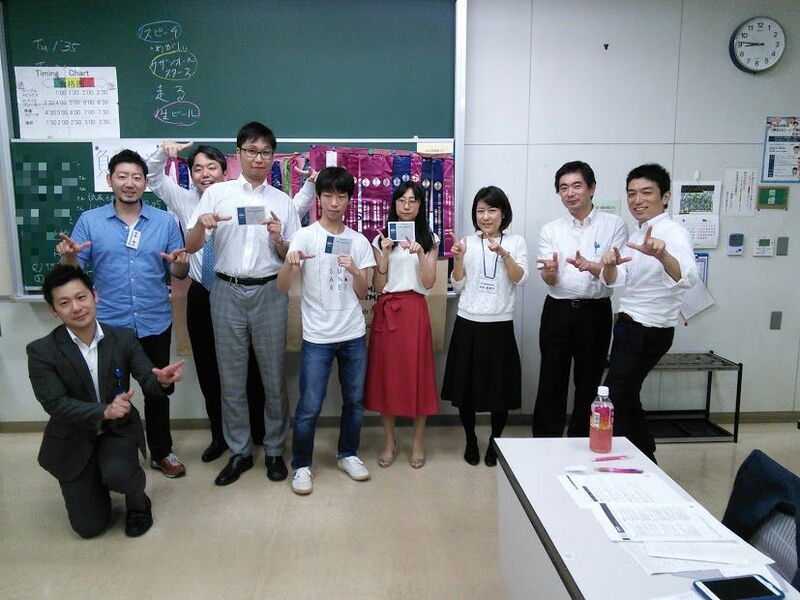 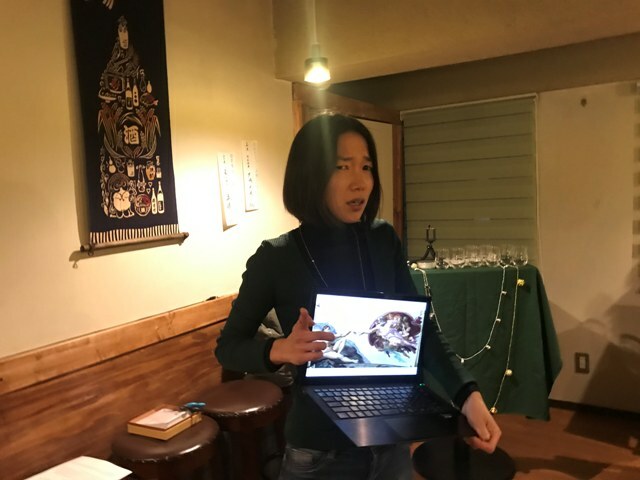 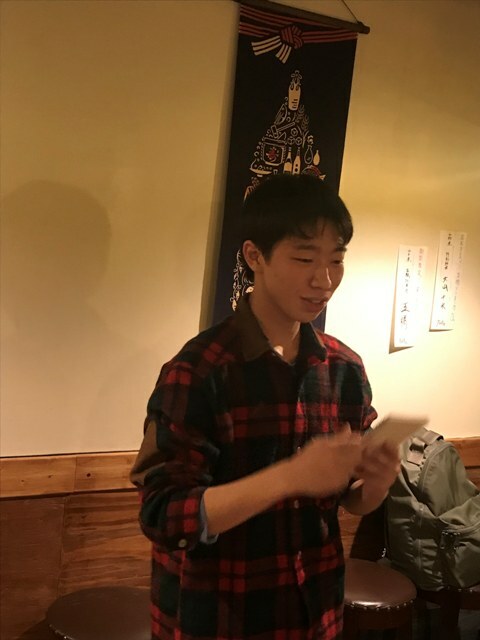 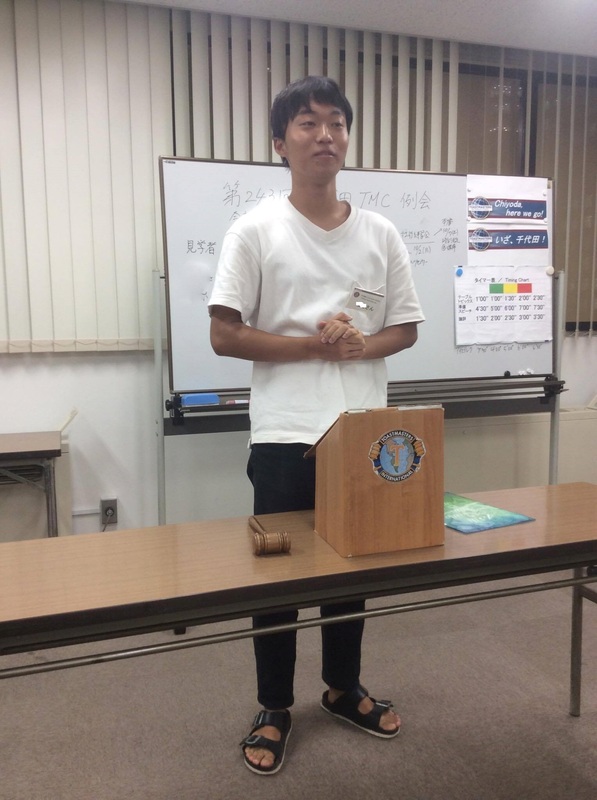 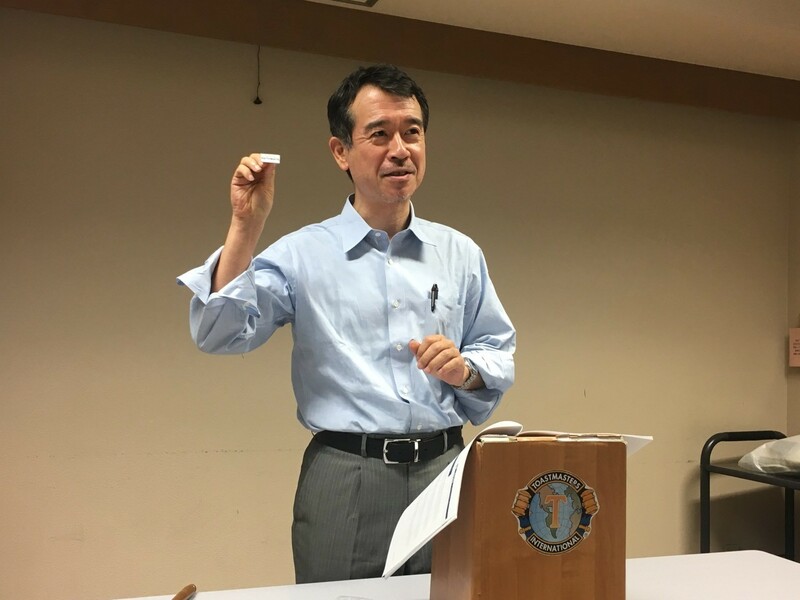 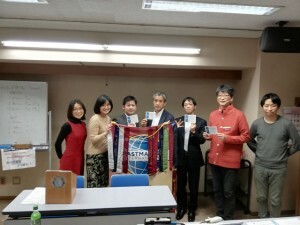 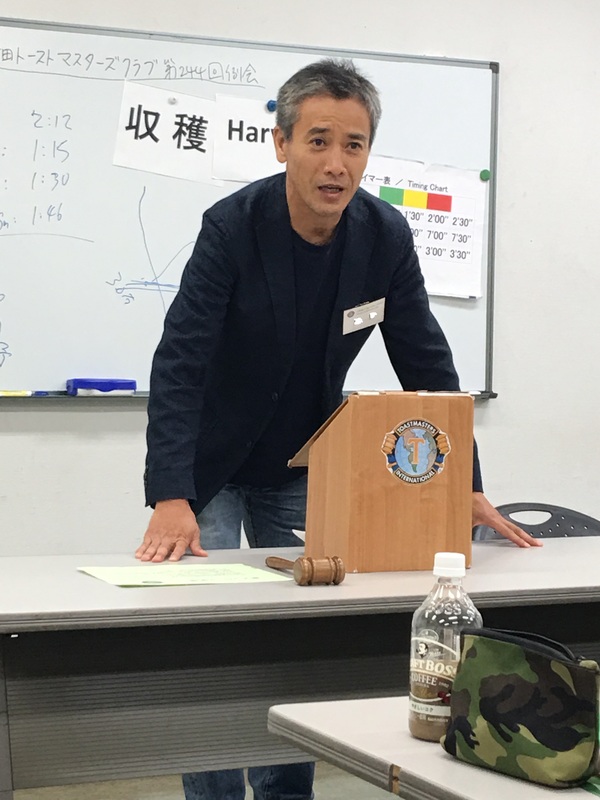 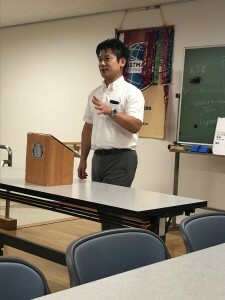 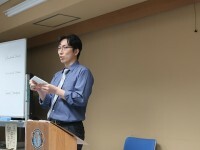 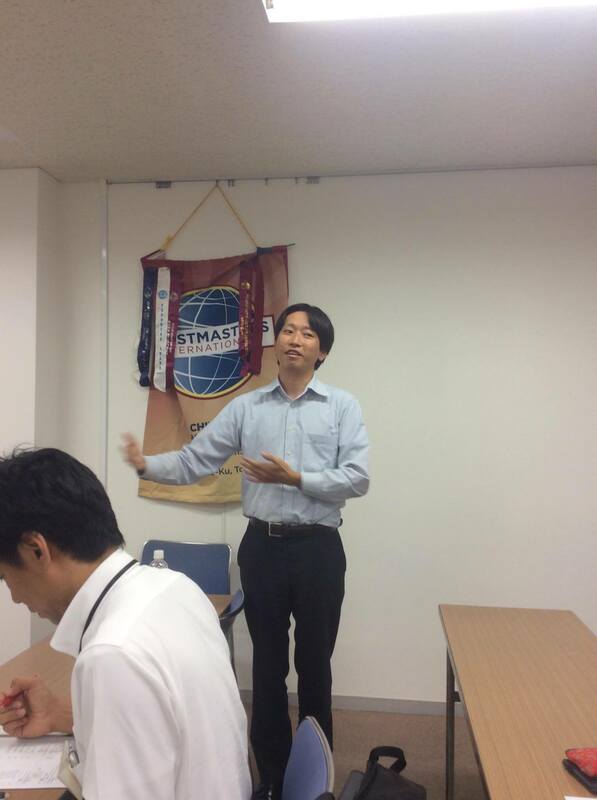 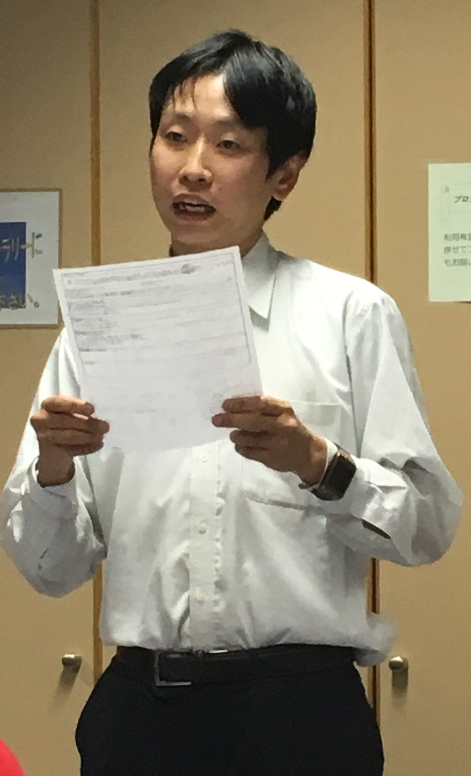 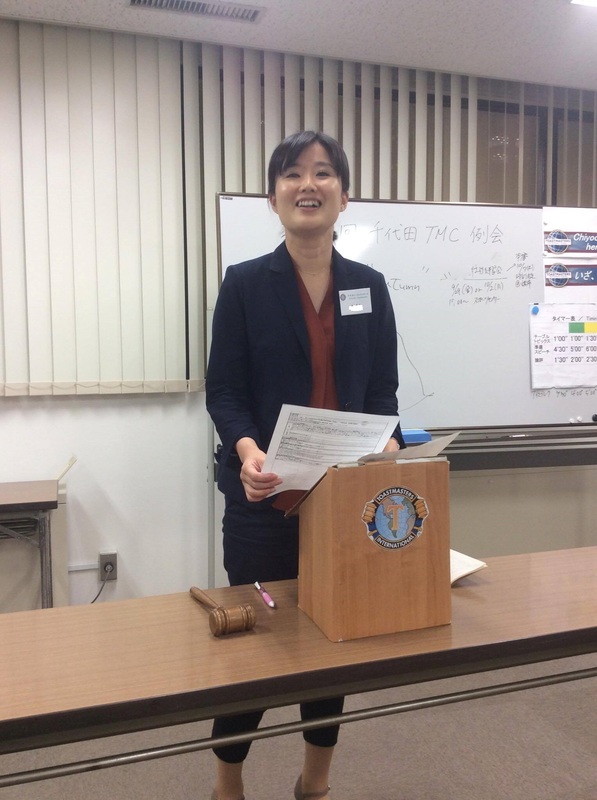 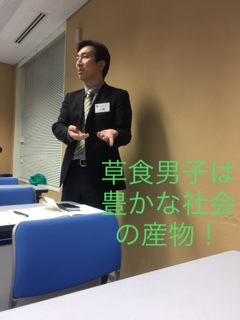 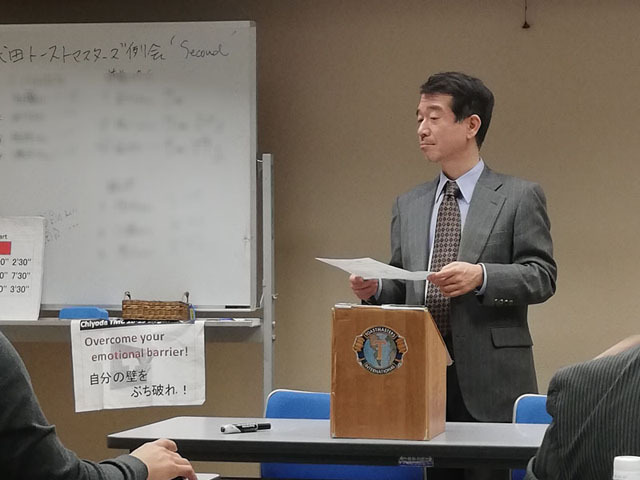 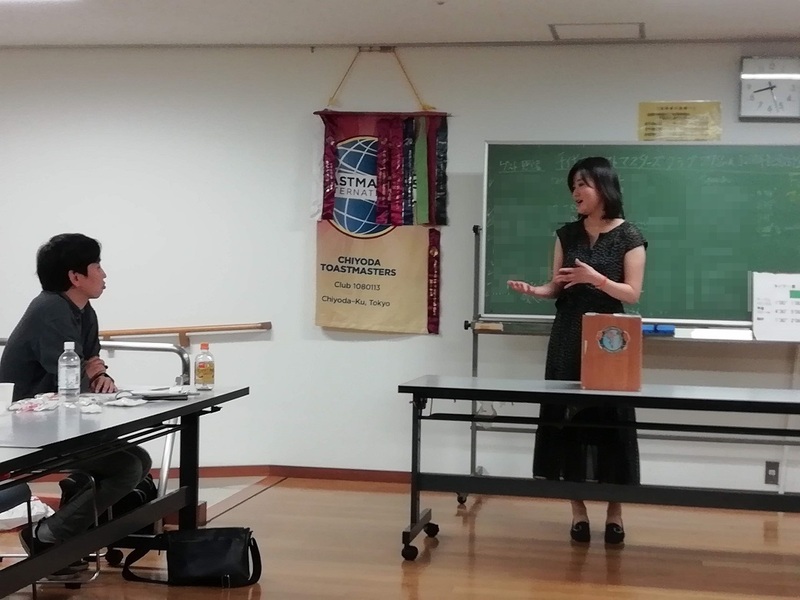 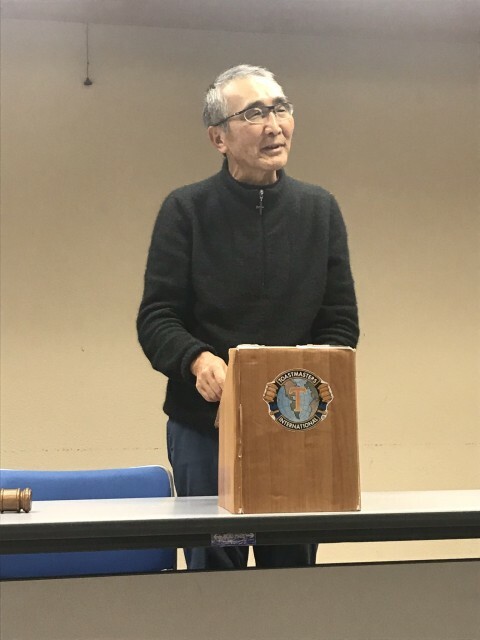 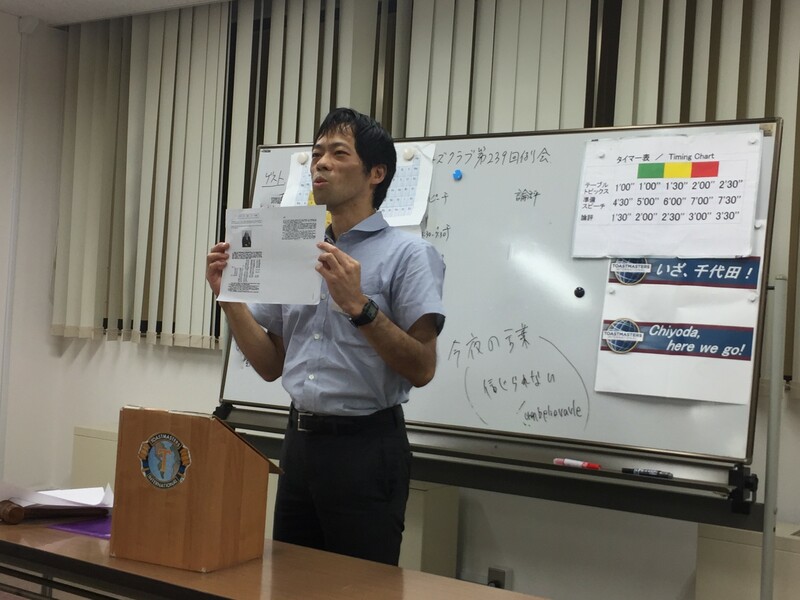 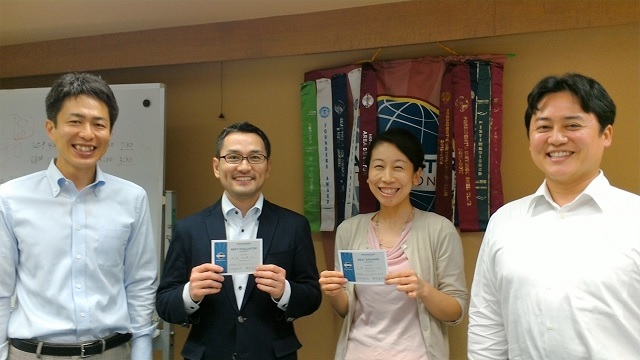 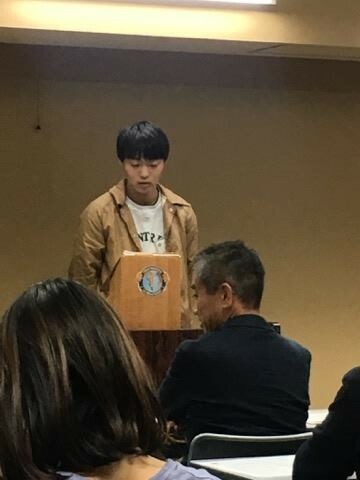 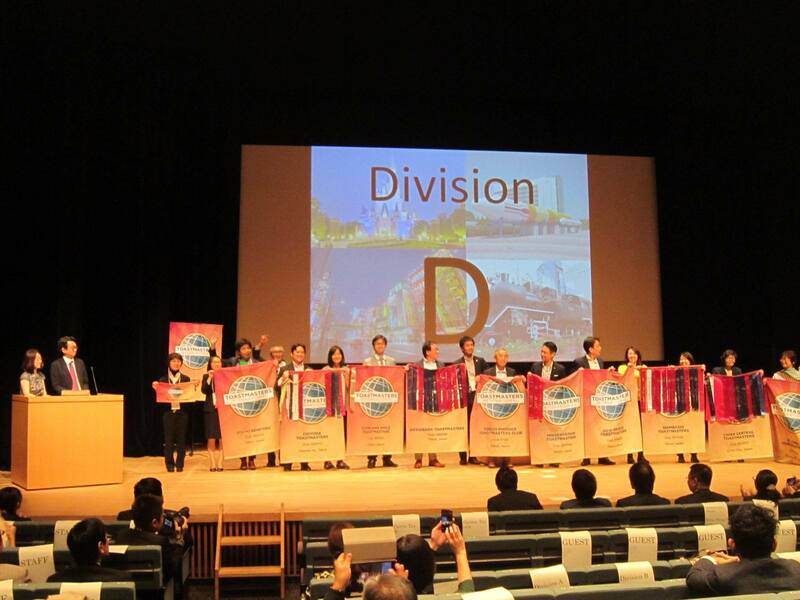 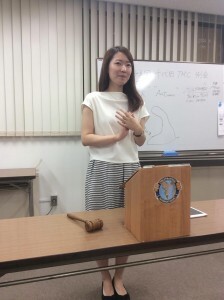 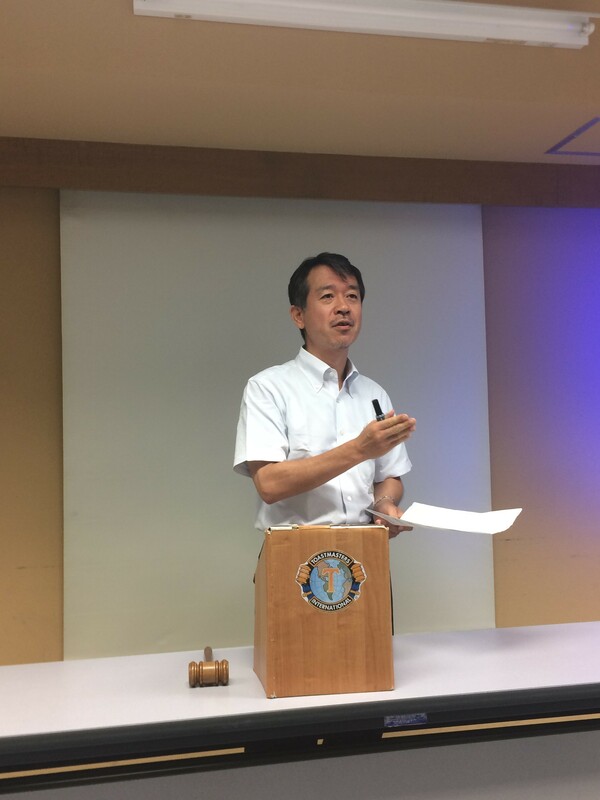 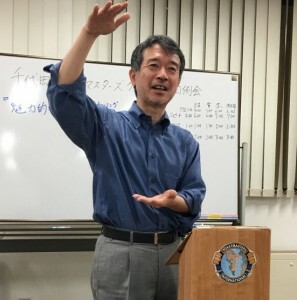 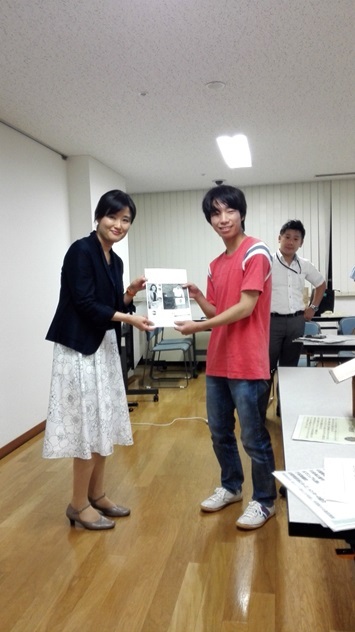 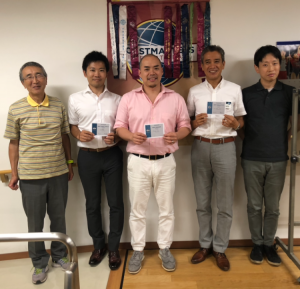 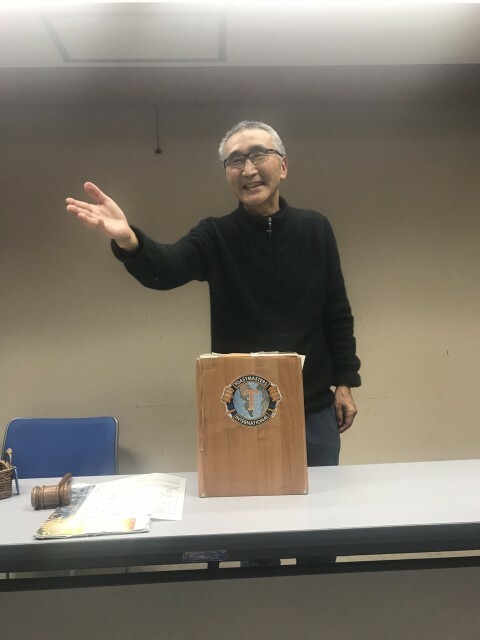 Topics included summer break, what to expect from Toastmasters, what to do in summer if left current work and what to do differently if becoming a Chairman of Chiyoda Club. 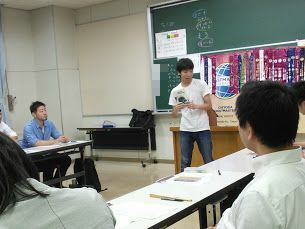 We then moved to our main section of prepared speeches. 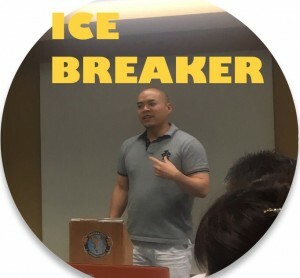 First one is by TM N: Pathways Level 1: Ice Breaker. 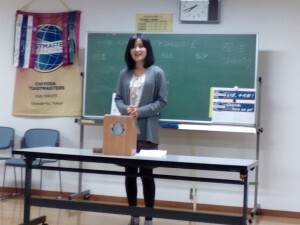 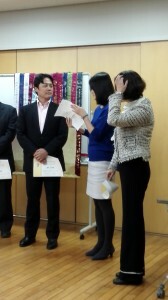 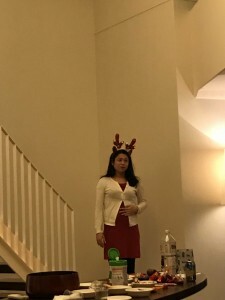 Title: Self Introduction with a focus on why she joined Toastmasters. 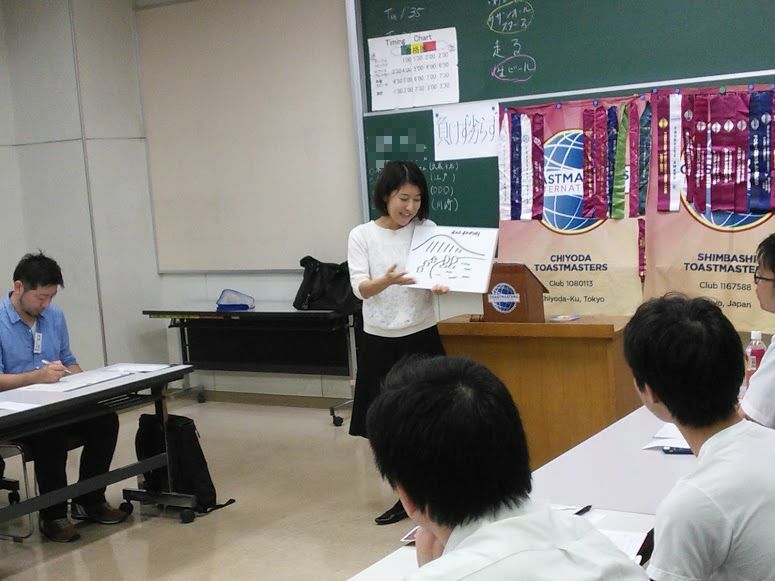 Second one is by TM N: CC #8: Get comfortable with visual aids. 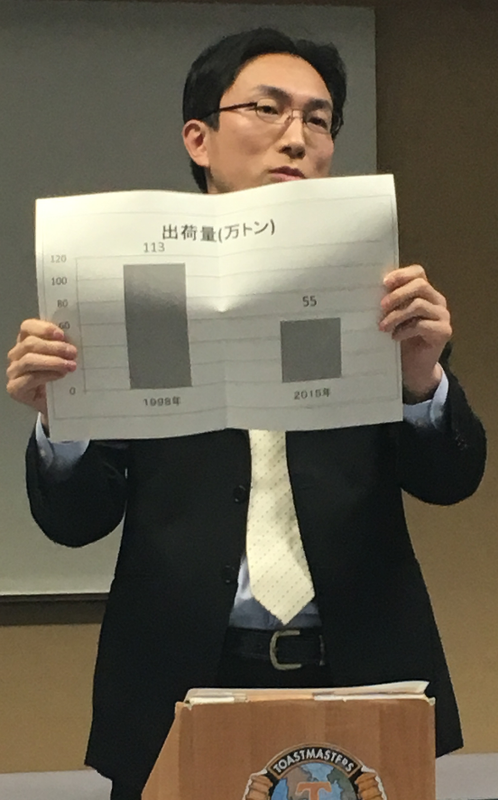 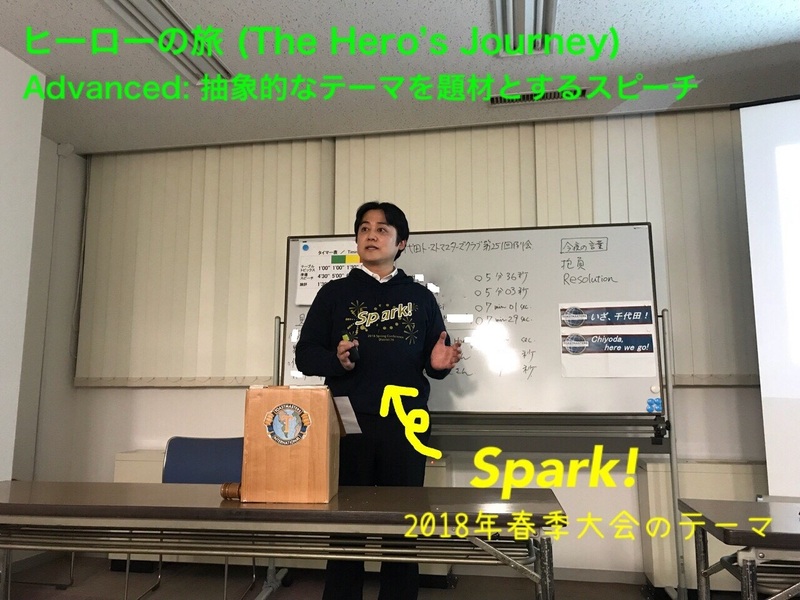 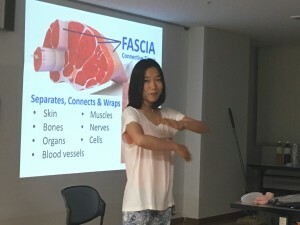 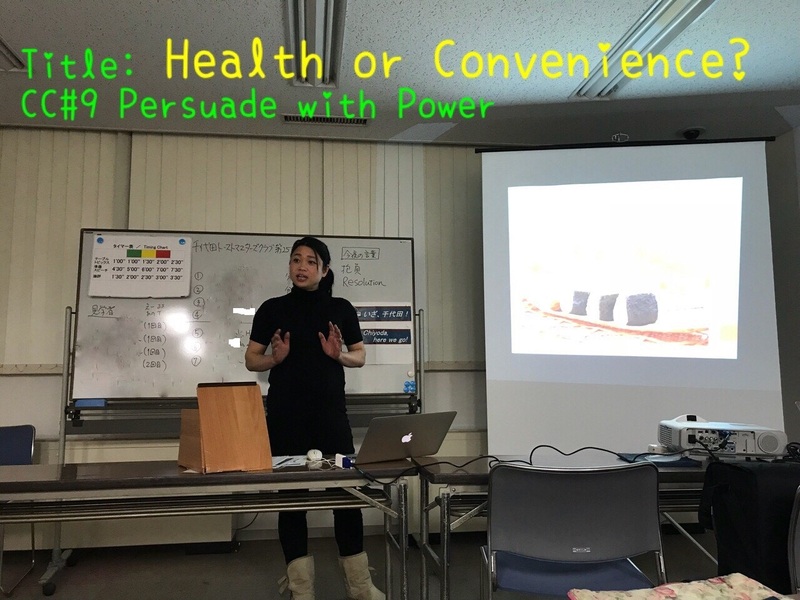 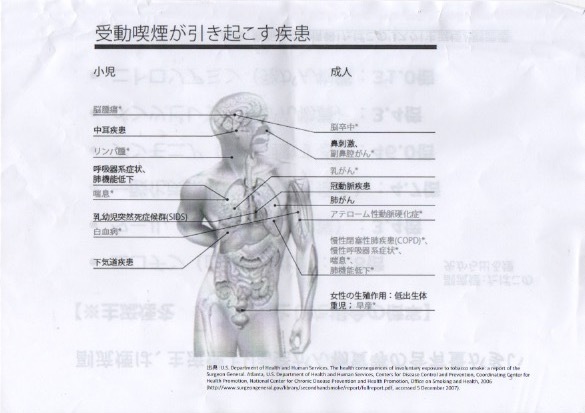 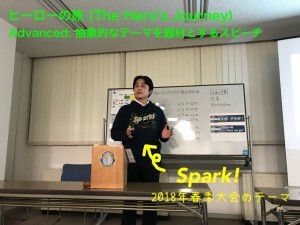 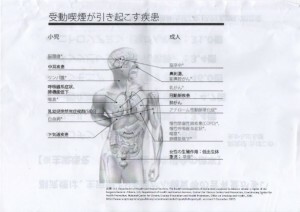 Title: 転ばぬ先の杖focusing on different health related challenges and solutions by demonstrating a wide range of images including heat maps, statistics and NATTO. 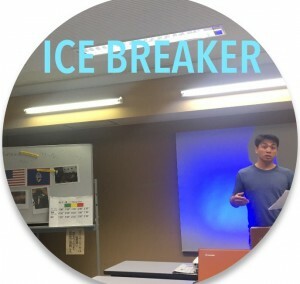 Third one is by TM T: Pathways Level 1: Ice Breaker. Title 20歳の課題, reflecting on the lessons she has learned over the experience of 20 years and how these have changed her perspective of the world. Fourth and final one is by DTM K: CC Manual PJ#9 Persuade with Power. Title Finding a sunken treasure and his talk focused on his experience in finding treasure in the sea. 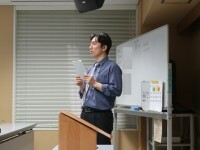 In his usual style, incorporated a bit of himself so that the audience can learn more about him. 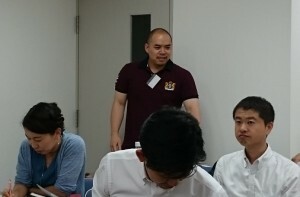 After a 10-minute break, we moved to Evaluation section. First time as General Evaluator. TM T highlighted her overall evaluation including members helping each other in preparation, expertise of TMOE’s ability to make the audience at ease during transitions of different sections, impressionable book sharing of TM S, providing feedback to Table Topic Master and feedback to evaluators (including analogies to help audience better understand the content). 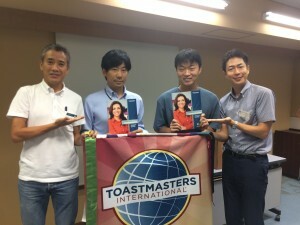 In the final section, we have our photo-op of our best speakers in the evening posing with the TMOE of the evening. 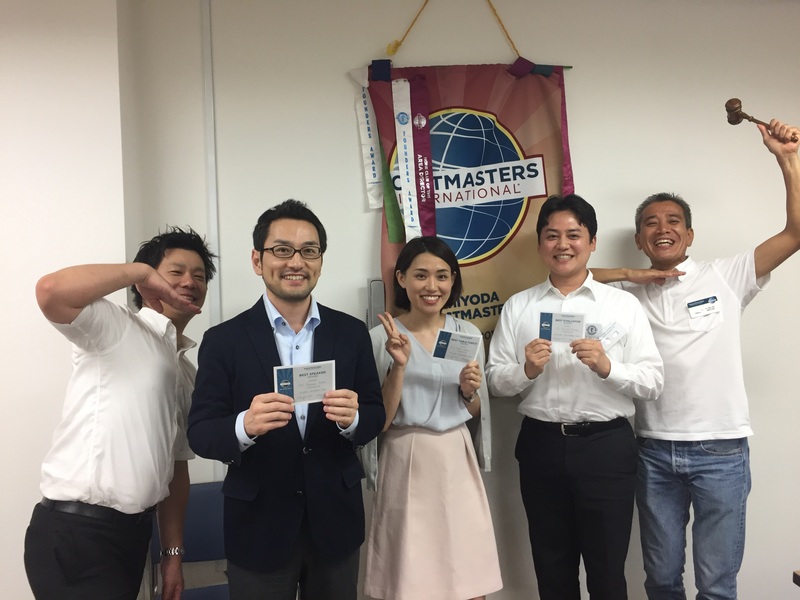 We closed the meeting with our two guests leaving behind some great impressions. 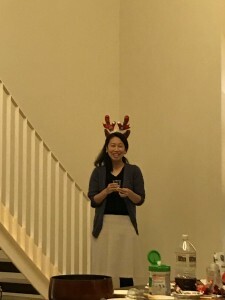 Sadly, TM M bid us a bit of farewell as she would be moving to London. 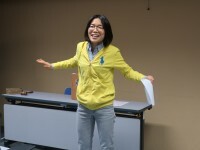 We will greatly miss you and look forward to you visiting TMC soon! 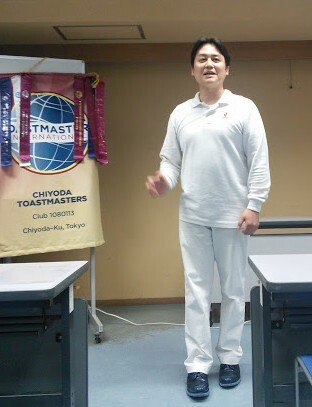 The next session is Table Topics. 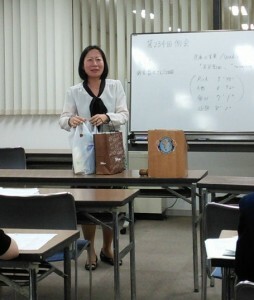 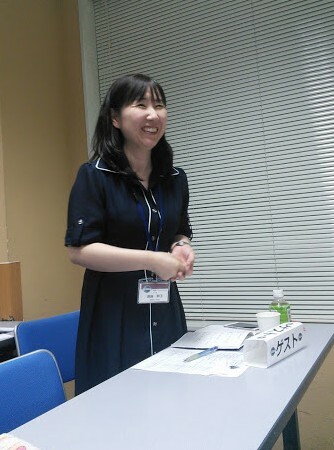 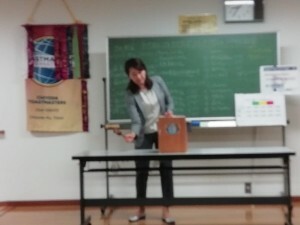 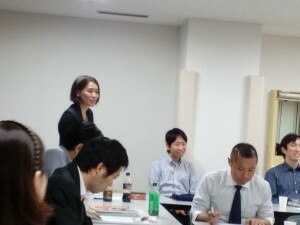 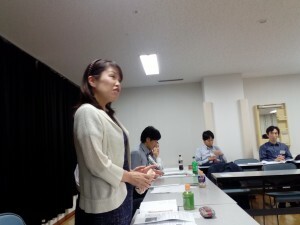 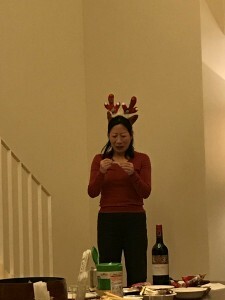 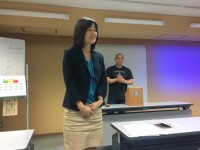 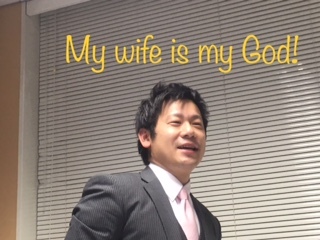 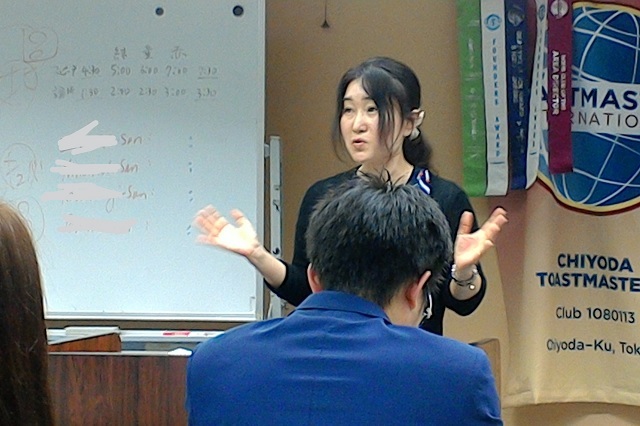 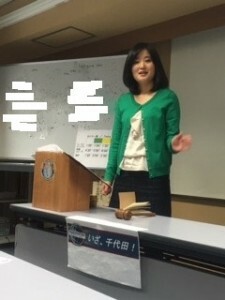 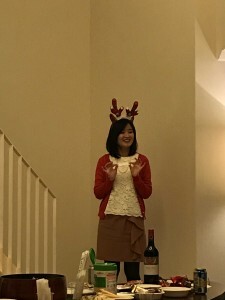 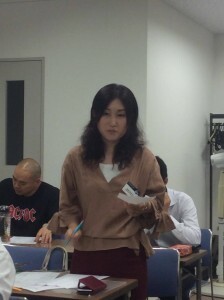 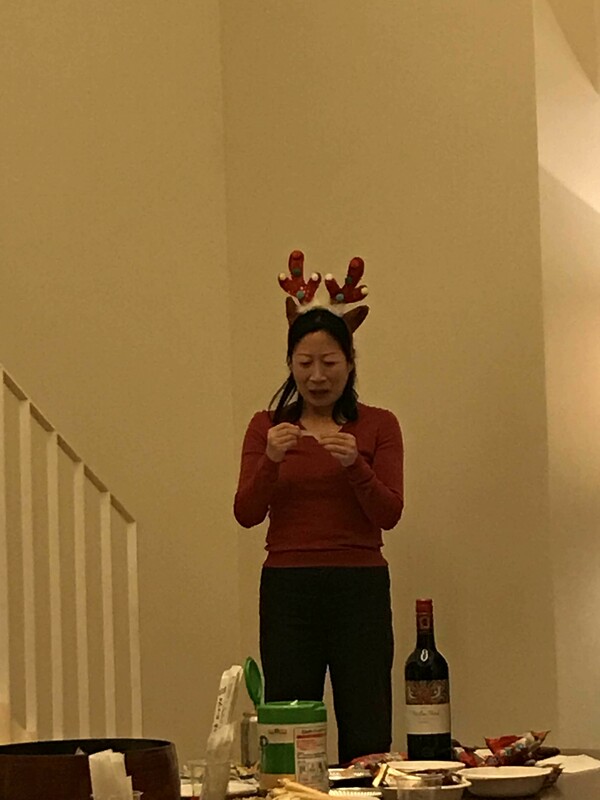 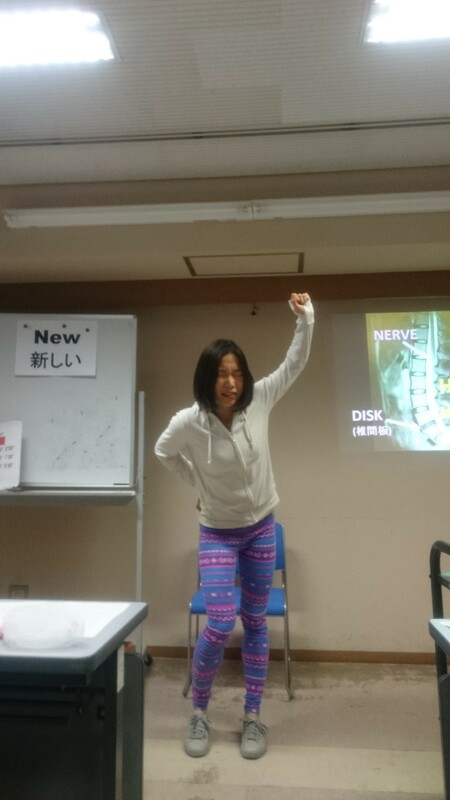 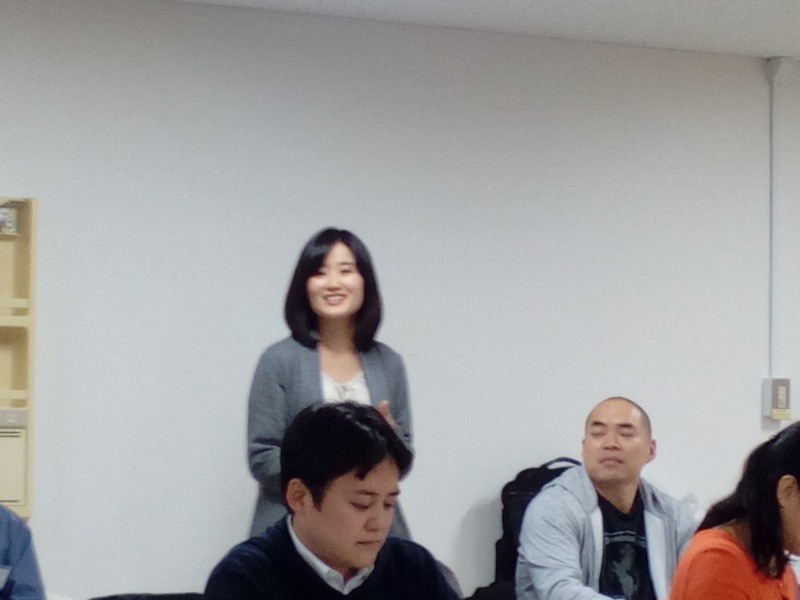 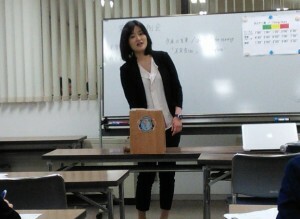 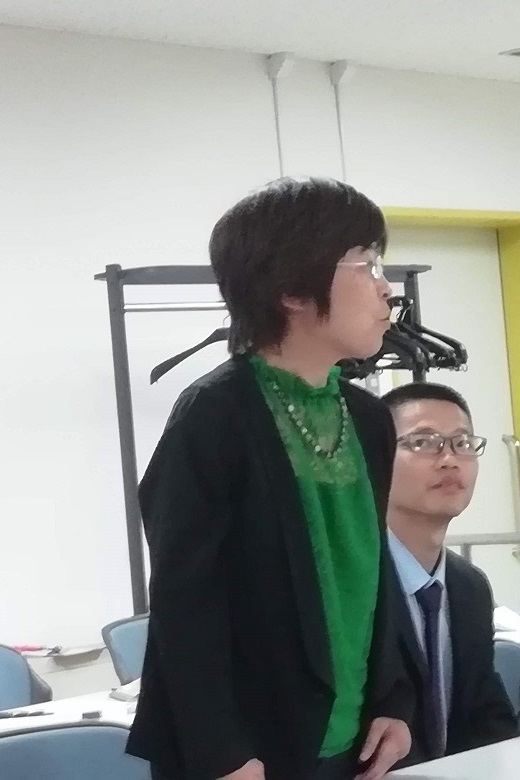 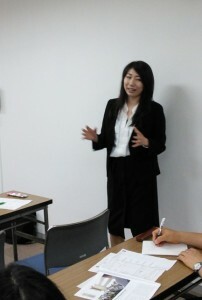 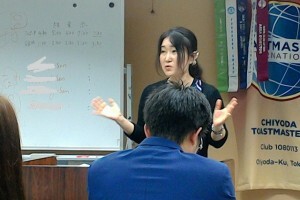 Our Table Topics　Master is T-san, a lovely girl who gave us some questions original from her foreign friends. 休憩をはさんで準備スピーチに対する「論評」の部がスタート。司会は総合論評担当のRさん。He mentioned that today’s speechs are timely and educational with a big smile. 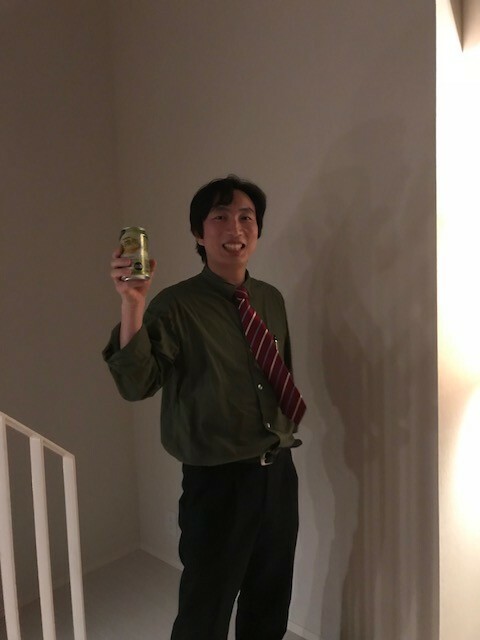 おめでとうございます！！！You all have nice smiling!!! 5番目は、いつも目からウロコのスピーチをしてくれるRさんの英語スピーチ。ネイティブスピーカーの彼が、みんなもよく映画で耳にするあの言葉のあれこれについて教えてくれました！うれしいときも、げっそりなときも、イライラしちゃうときも、色んな場面で使えて便利～みんなも早速使ってみよう！ We’re f*cking awesome Toast Masters! 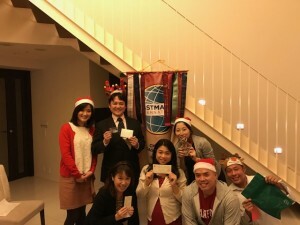 1: TM Fu*, 2: TM Oz*, 3: TM Hw*, 4: TM Na*, 5: TM Ma*, 6: TM Ot*. 1st speech delivered by TM Fu* was about his function as an ATM in 3 different meanings, such as Automatic Teller Machine. 2nd speech was delivered by TM Oz* and made very funny speech about boxing supported with a lot body languages. 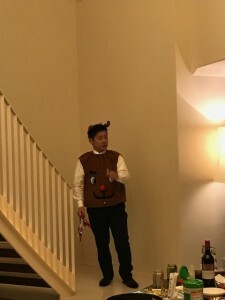 3rd speech was delivered by TM Hw* titled “The walk” – tall tale speech about top secret of the president Trump who would be a pumpkin. 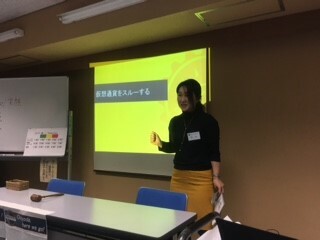 4th speech was delivered by TM Na* about stories related to a lucky color heard every morning from a TV channel and how she decided to deliver the speech today. 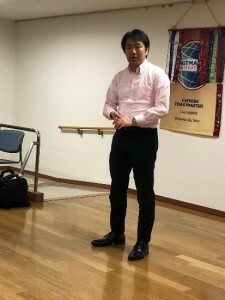 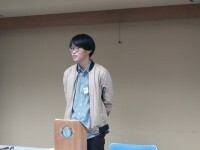 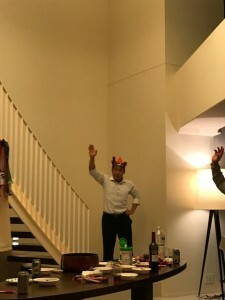 5th speech was delivered by TM Ma* with title of “Re-employment”, which was about a story of finding a new job through hello work and being offered a job as the president of the United States. 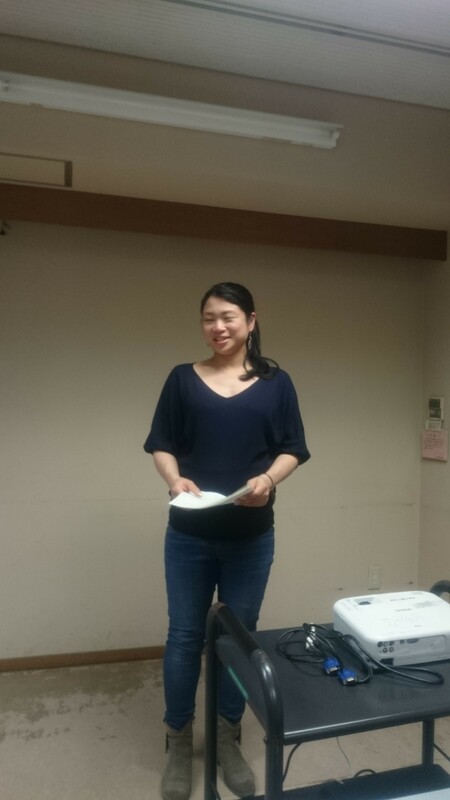 6th (last) speech was delivered by TM Ot* about mysterious stories about travel of night train telling about four destinations of islands seen while she was asleep. 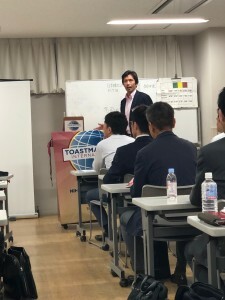 1ST　speaker was TM W.O. 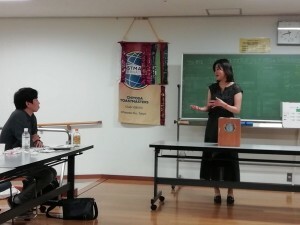 “DO YOU LISTEN TO YOUR HEAT VOICE?”　was the title of her first English speech. 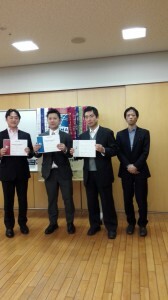 Congrats W.O and sorry I forgot to take your photo … I was into your speech! 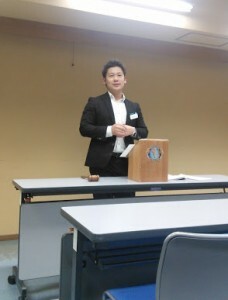 Speech of TM W.O. was evaluated by TM E.I. 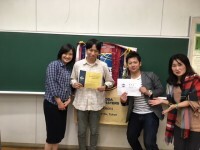 ３、”Cuba,Deeply　and Vividly” TM MT.